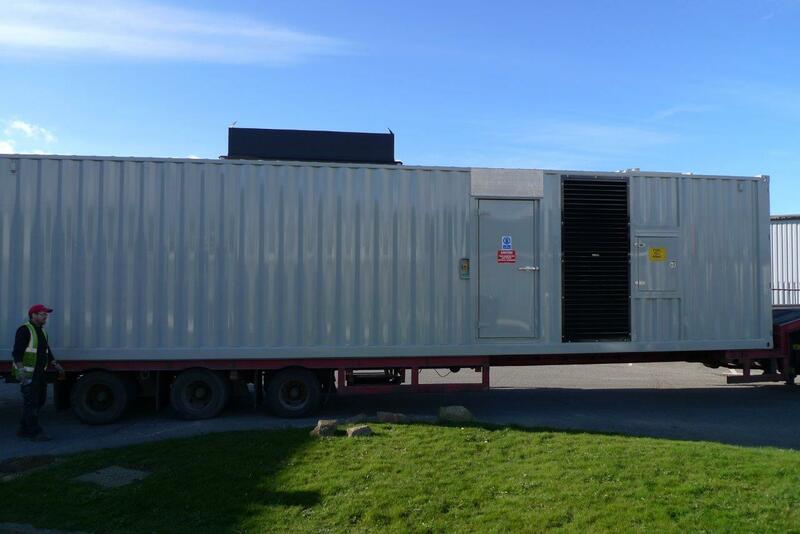 The other two were to house the F.G.Wilson 1250Kva P3 units. 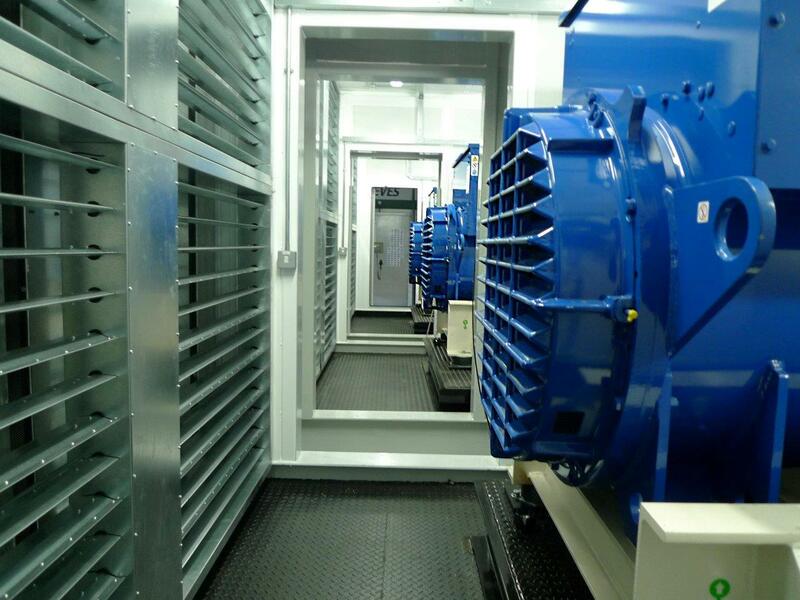 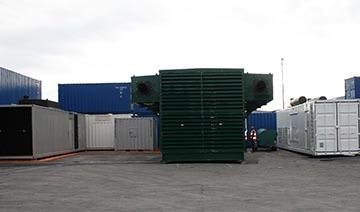 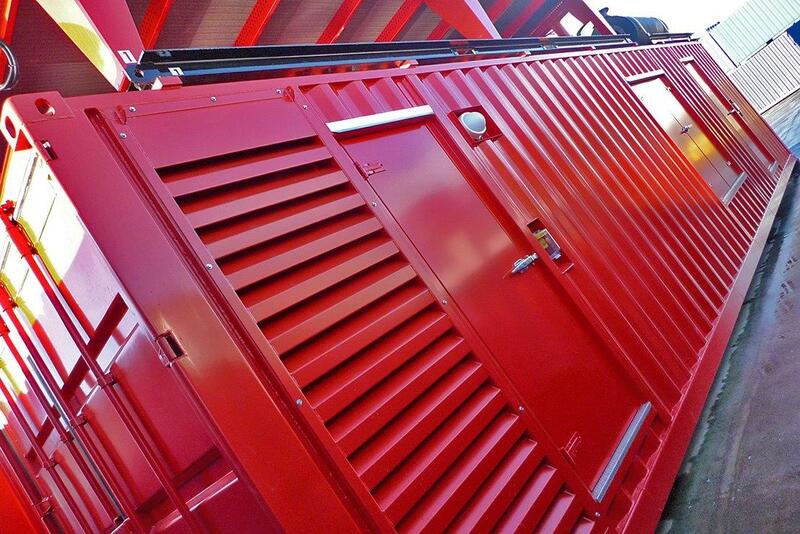 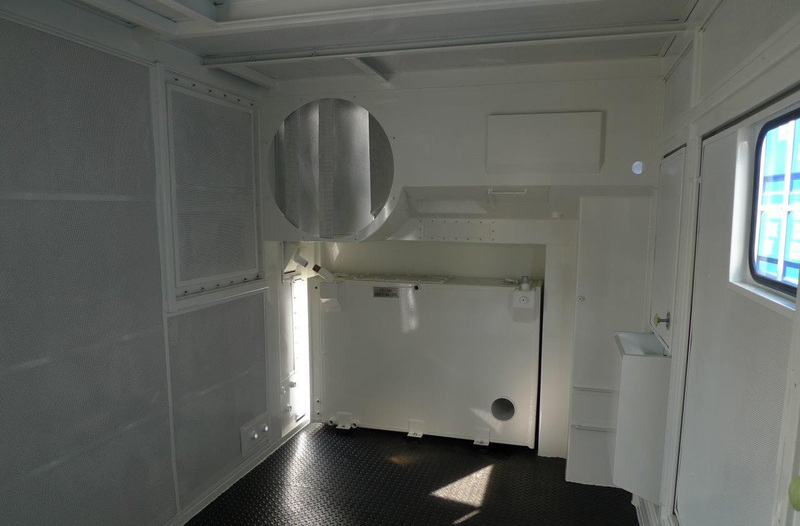 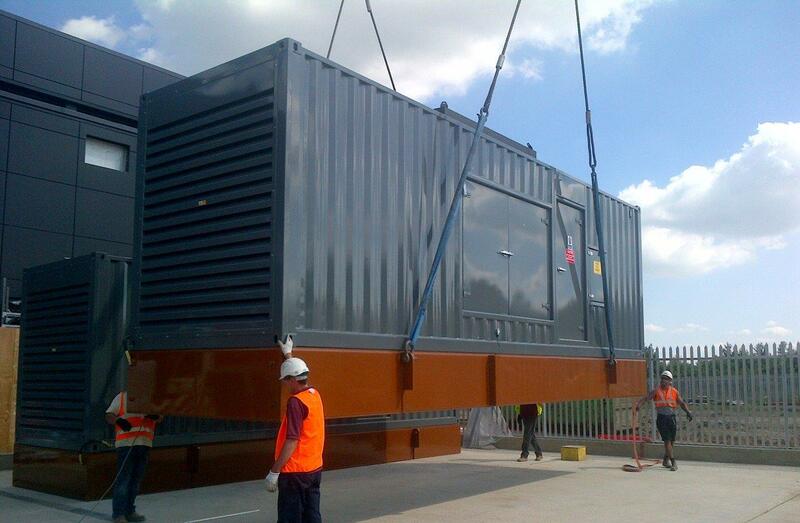 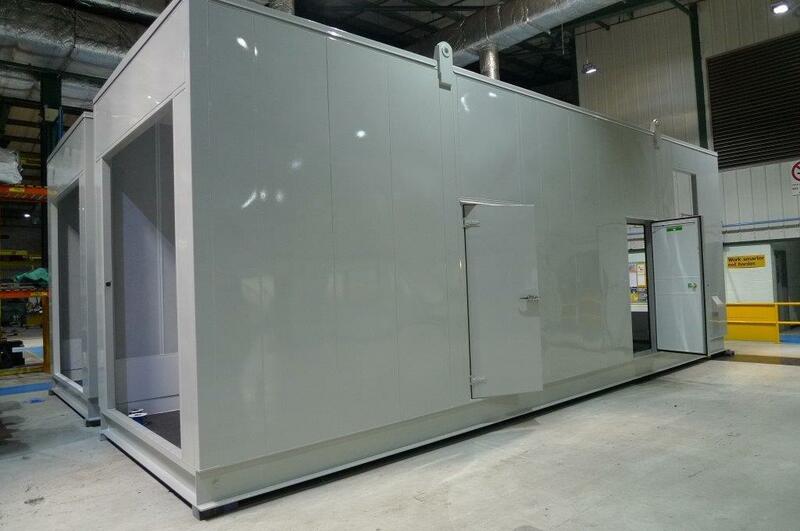 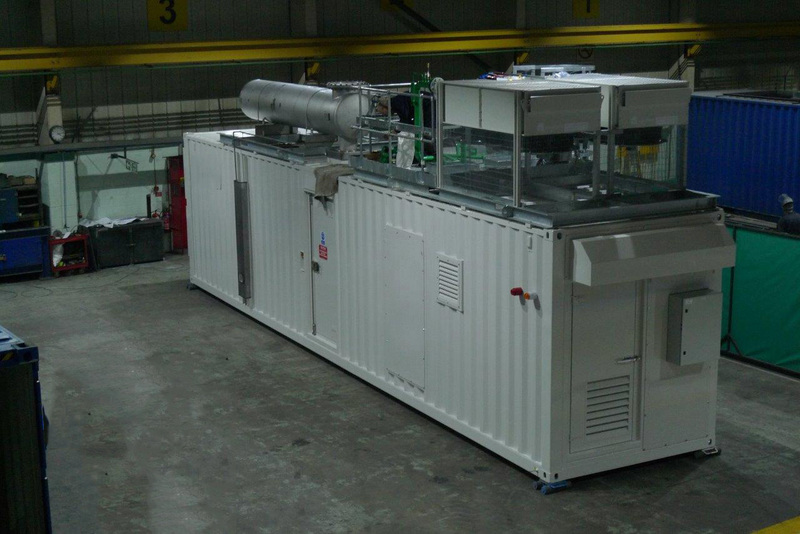 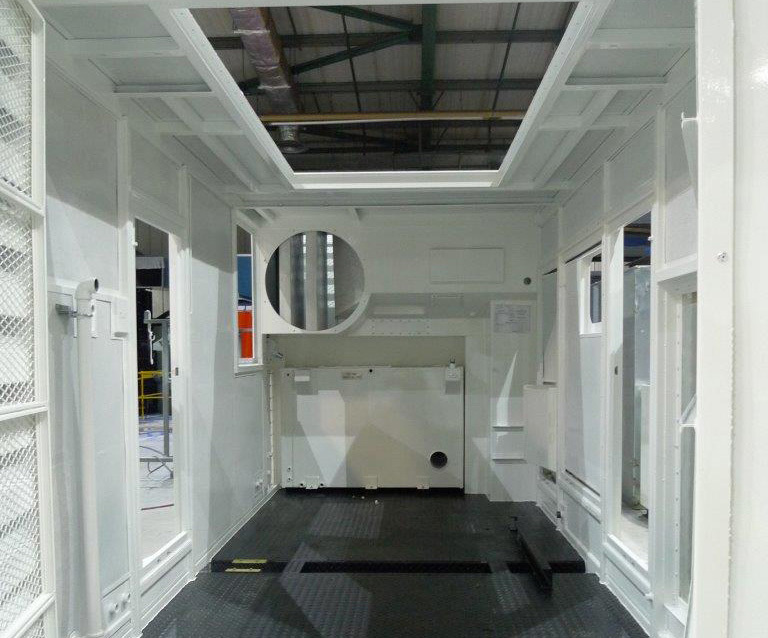 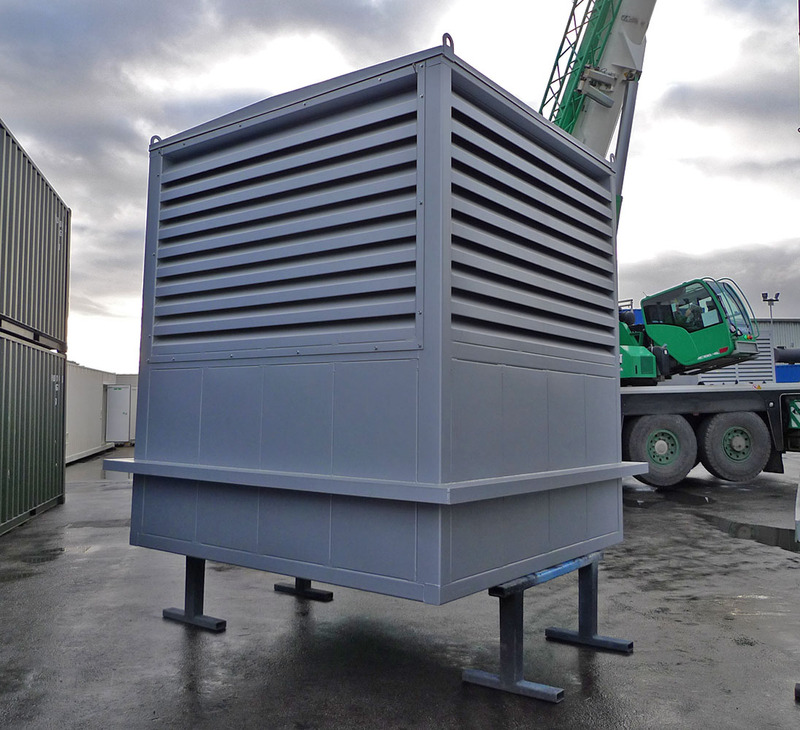 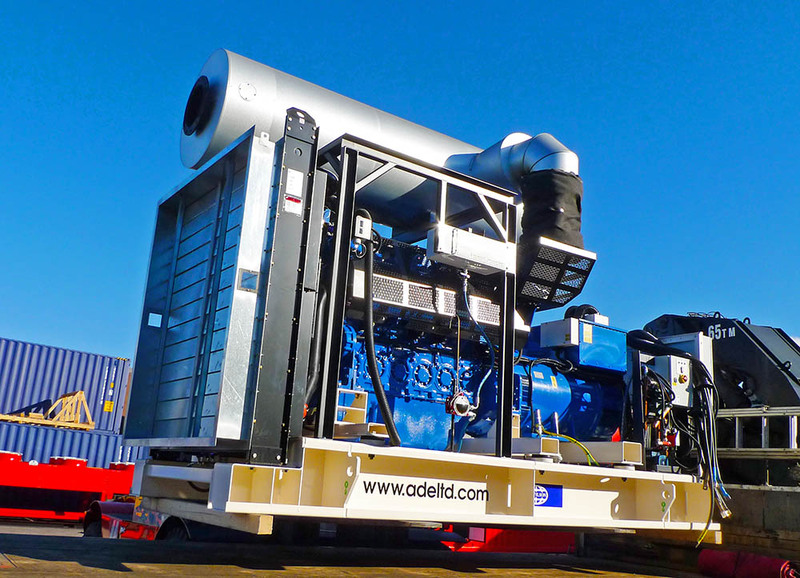 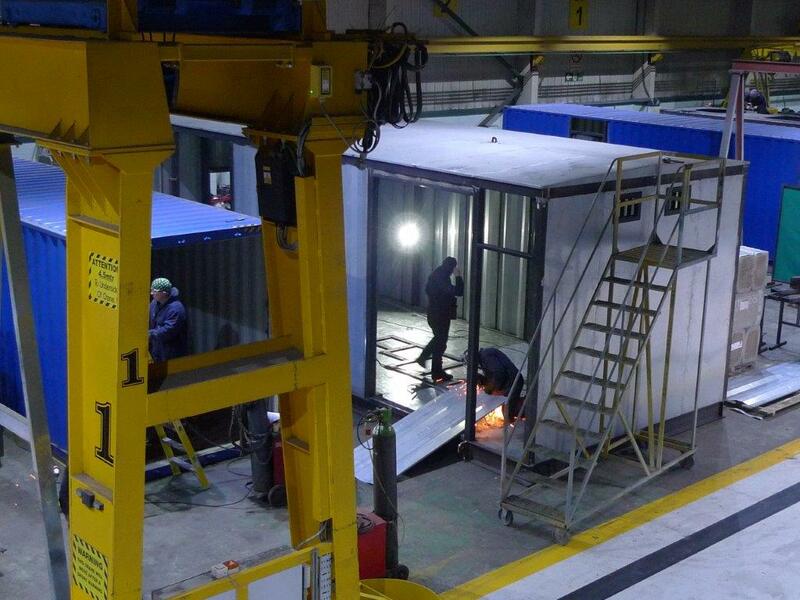 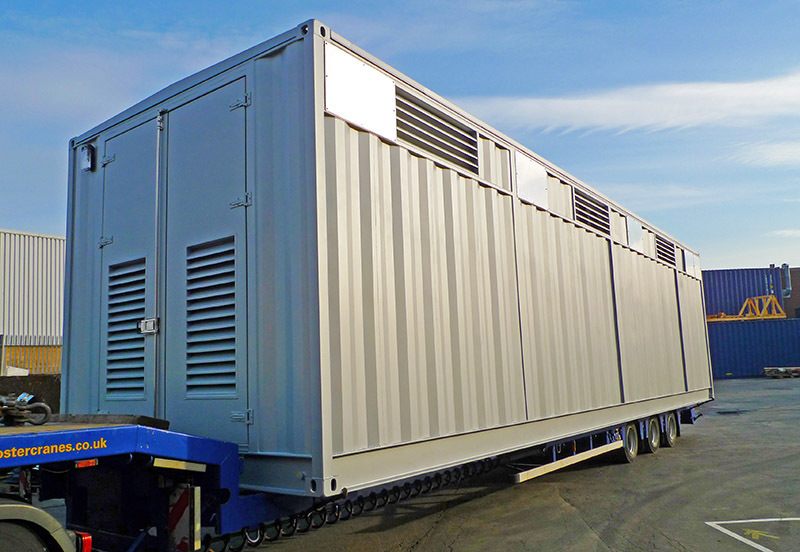 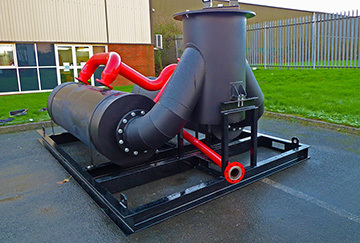 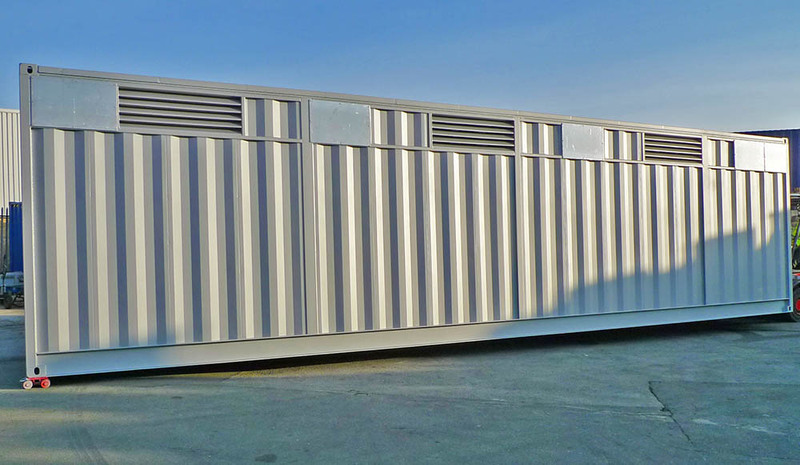 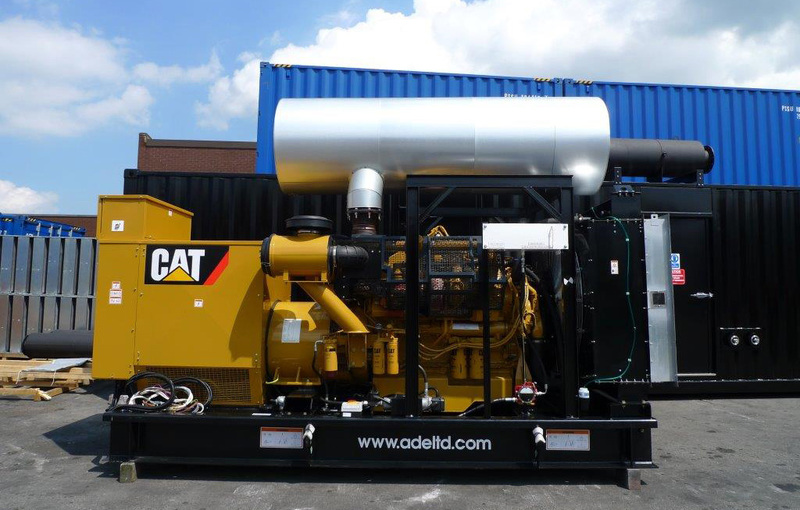 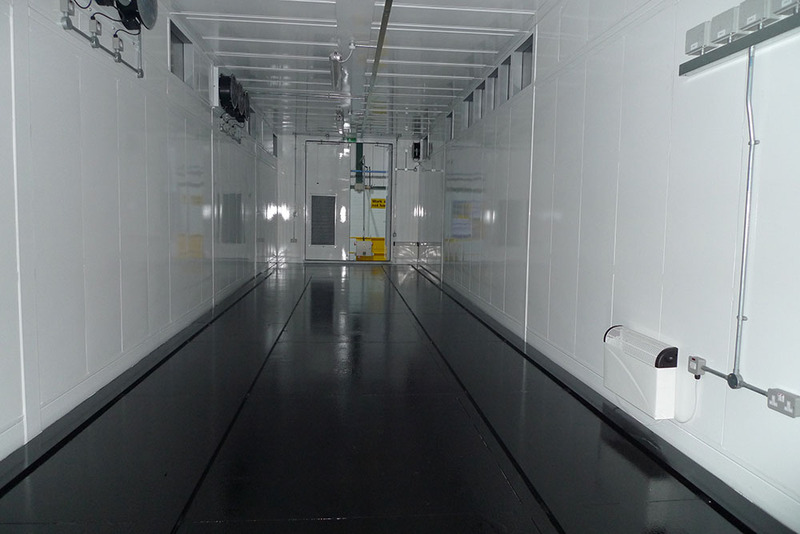 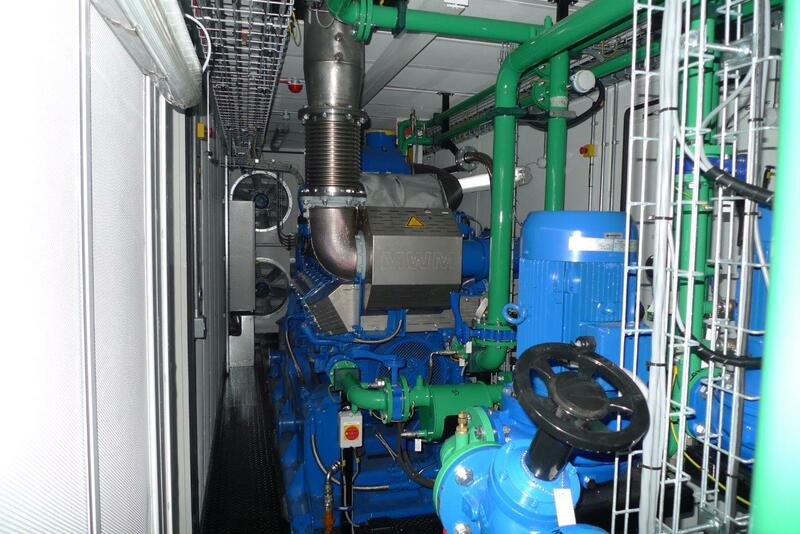 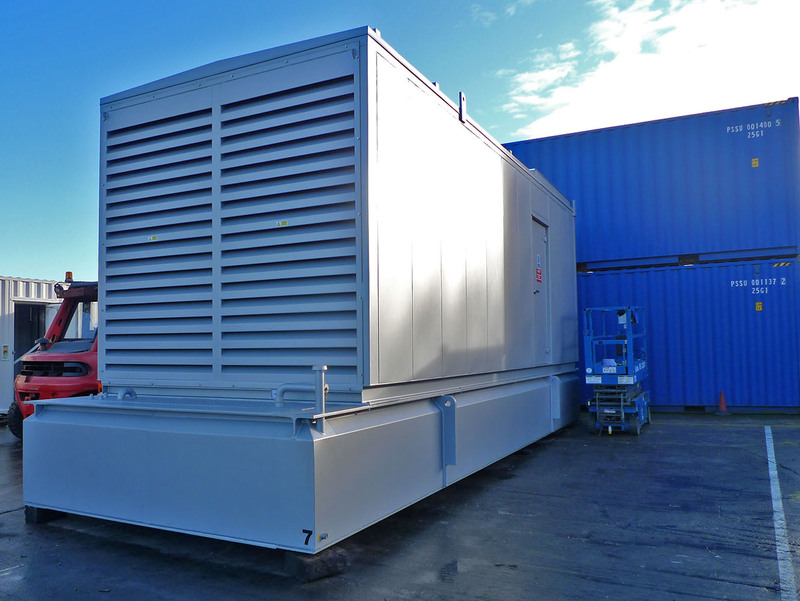 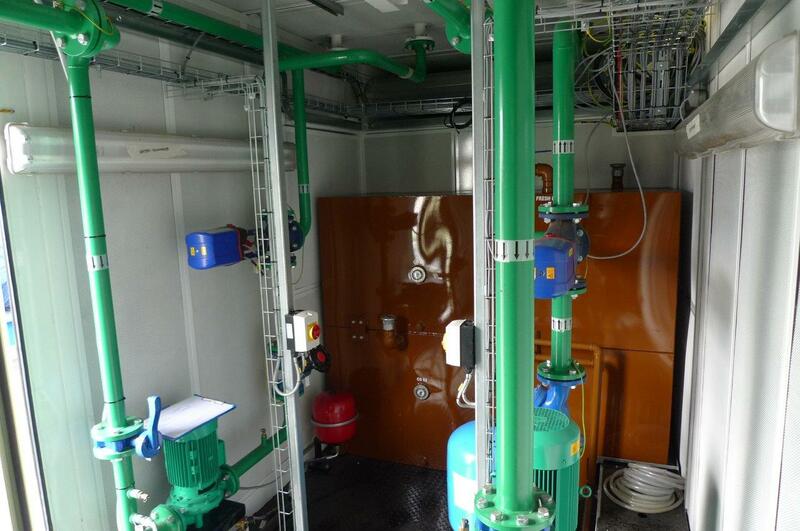 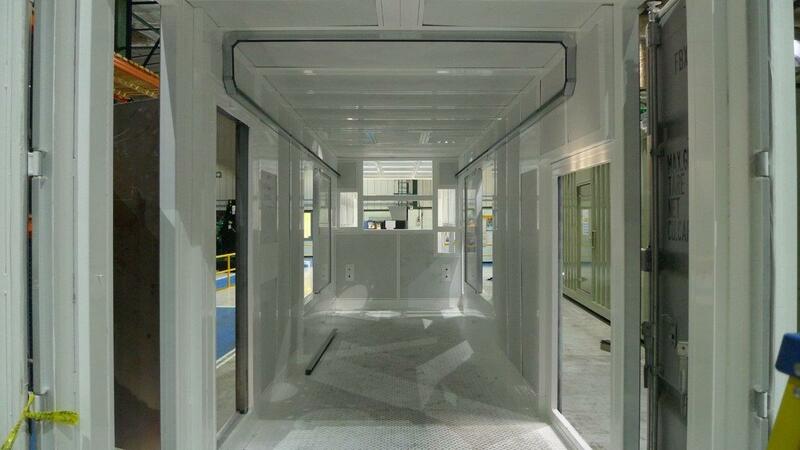 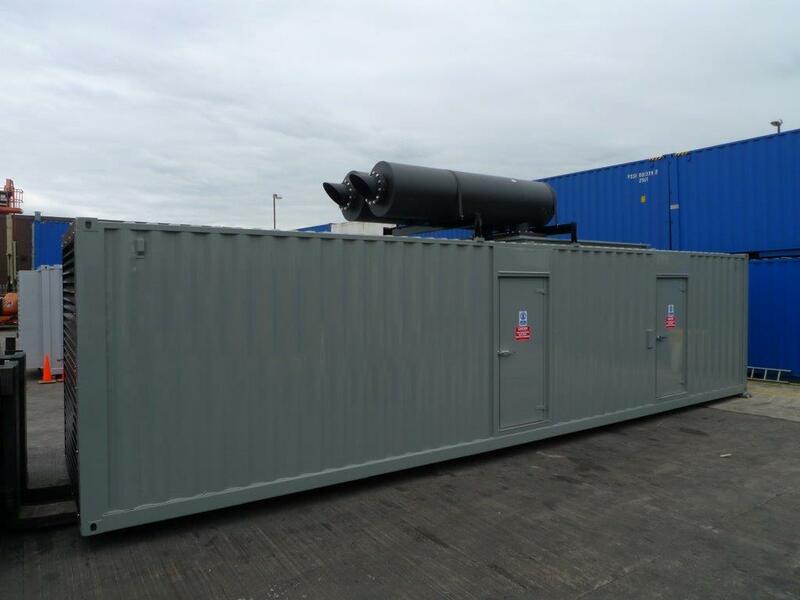 One of four acoustic units designed & built by ADVANCED to house Perkins diesel generators. 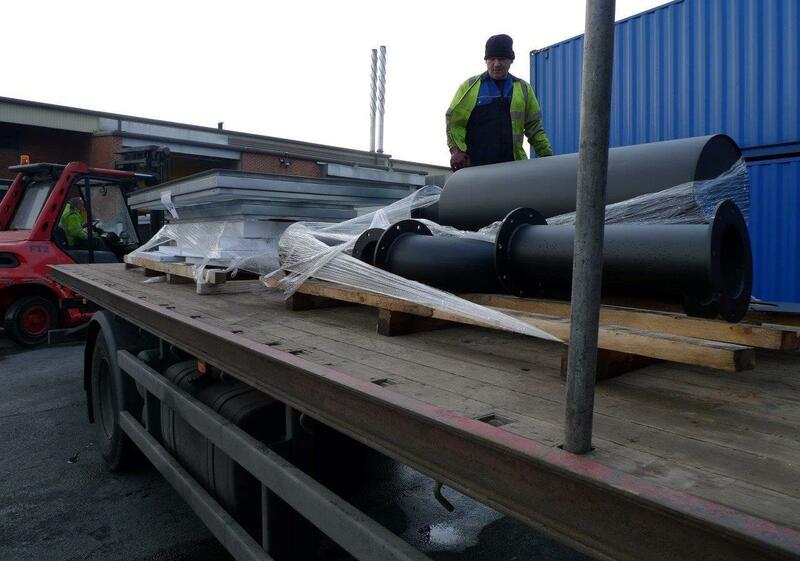 Six of Six – order complete and despatched on time - This completes this order.. 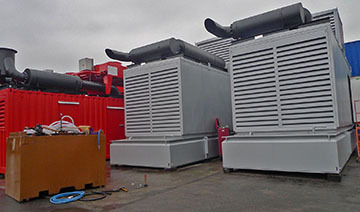 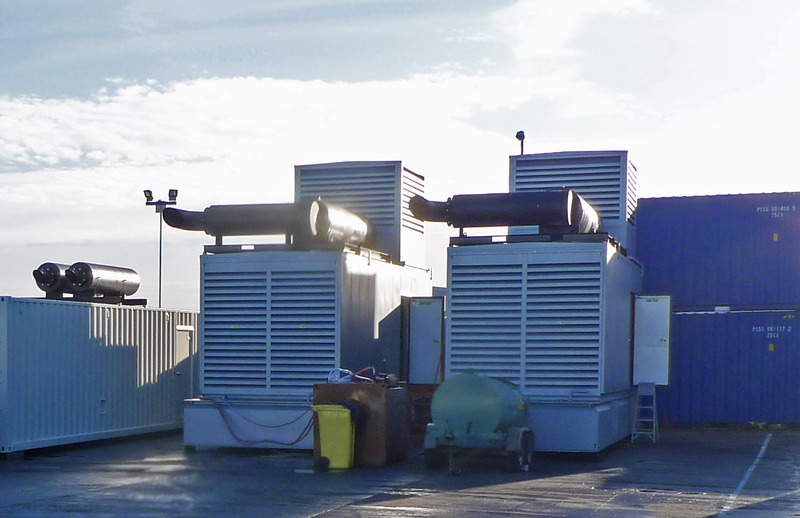 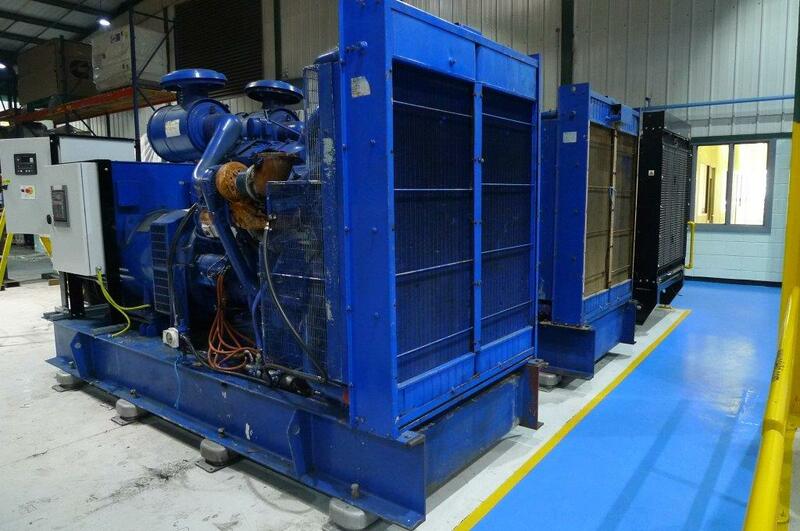 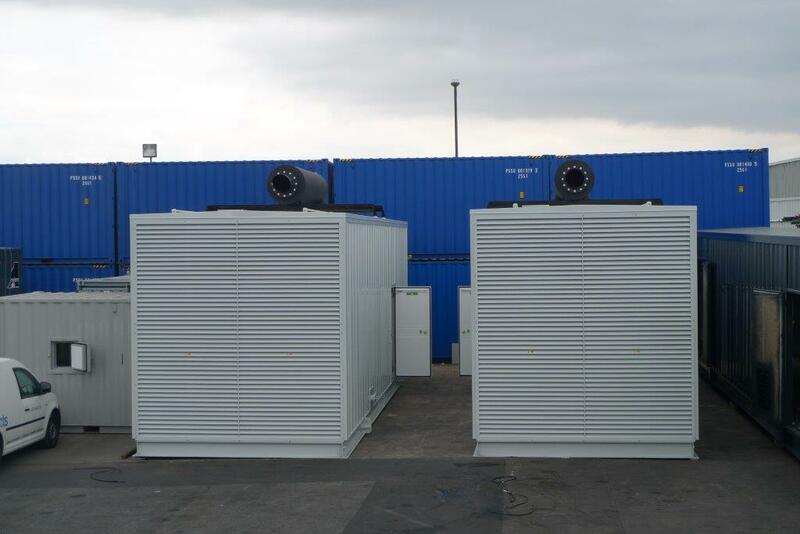 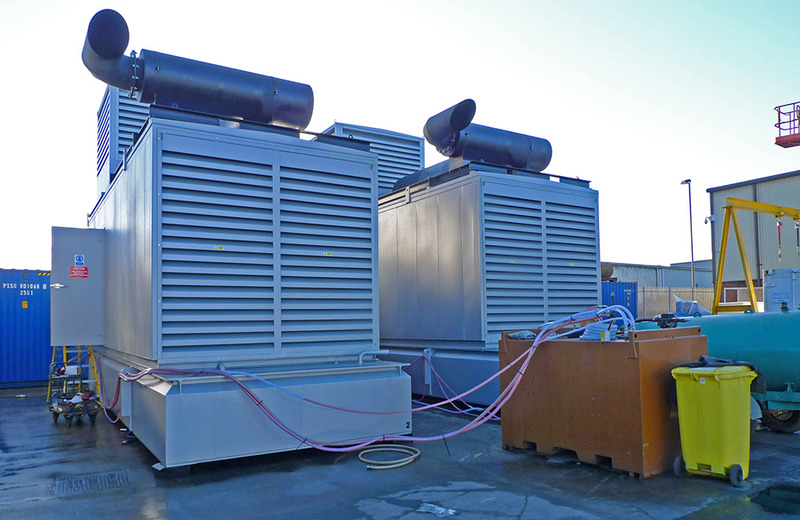 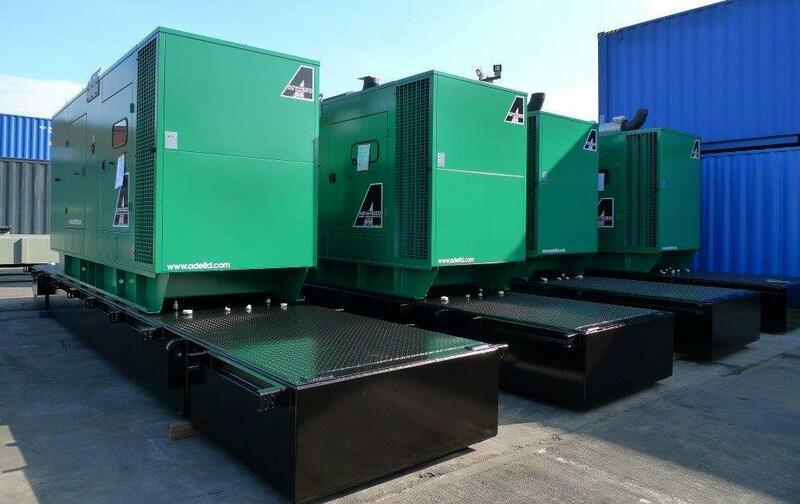 These two Cummins C1400 diesel generators were fitted into the ADVANCED designed & built acoustic enclosures and then fitted on top of the double skinned bulk fuel tanks.All the testing was carried out simultaneously prior to stripping and transporting to site to met up with the rest of this order. 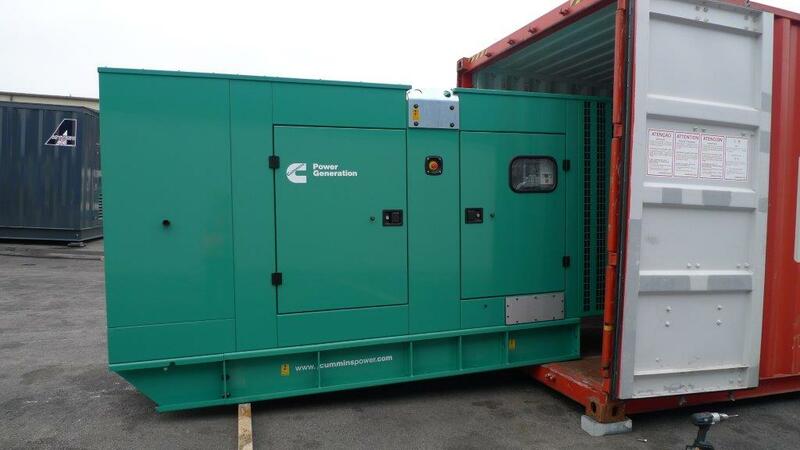 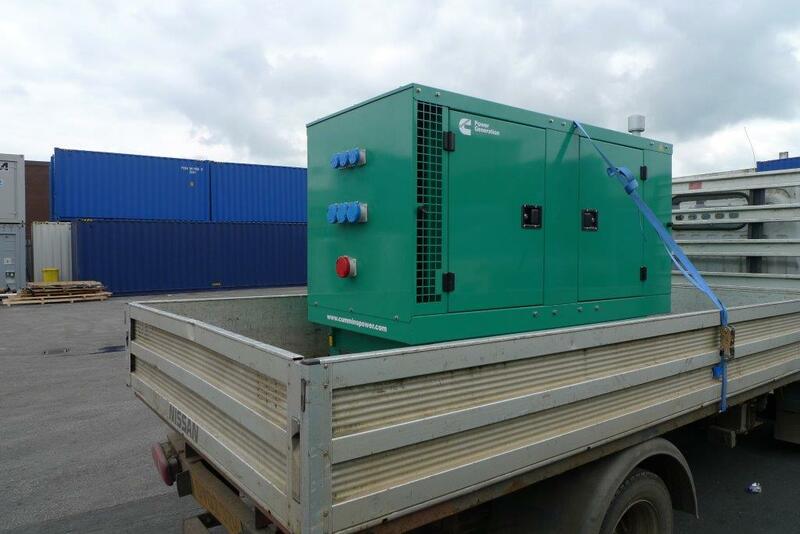 This Cummins enclosed 90Kva diesel generator was sold on to one of our UK reseller clients in Wales. 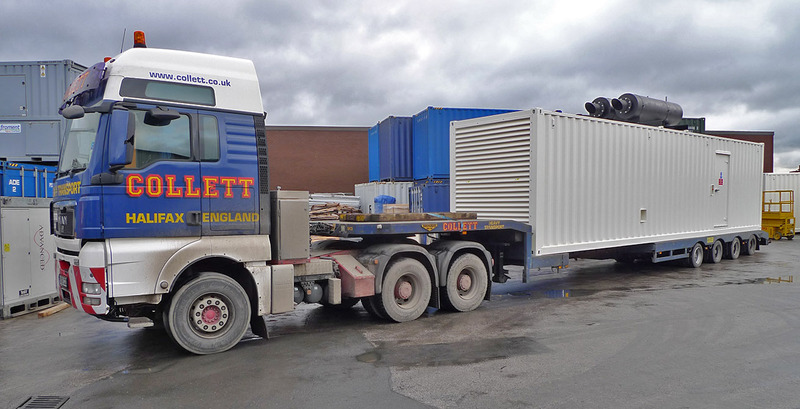 All the ancillary items such as the exhaust silencers and Remote radiators left the works today to meet up with the containers for installation in Germany. 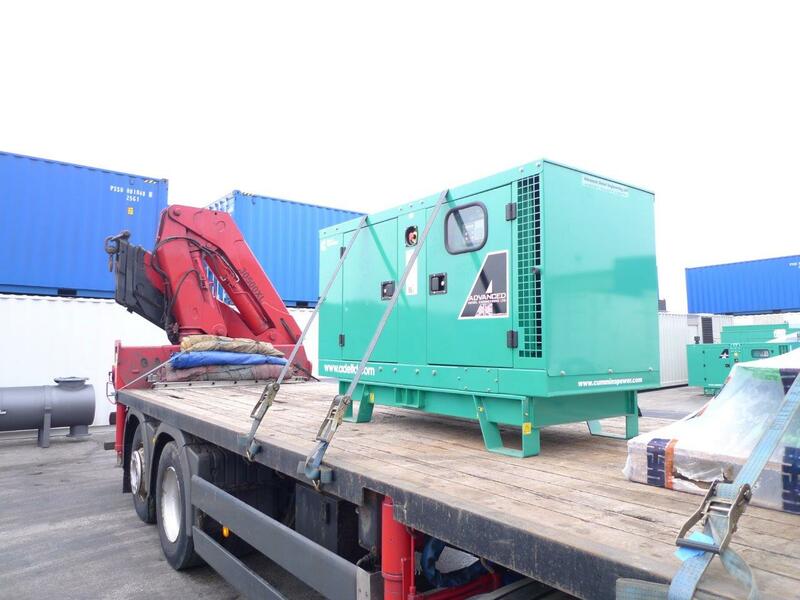 The complete generators were thoroughly tested in parrallel at our works, and witnessed by the clients and then stripped for transport. 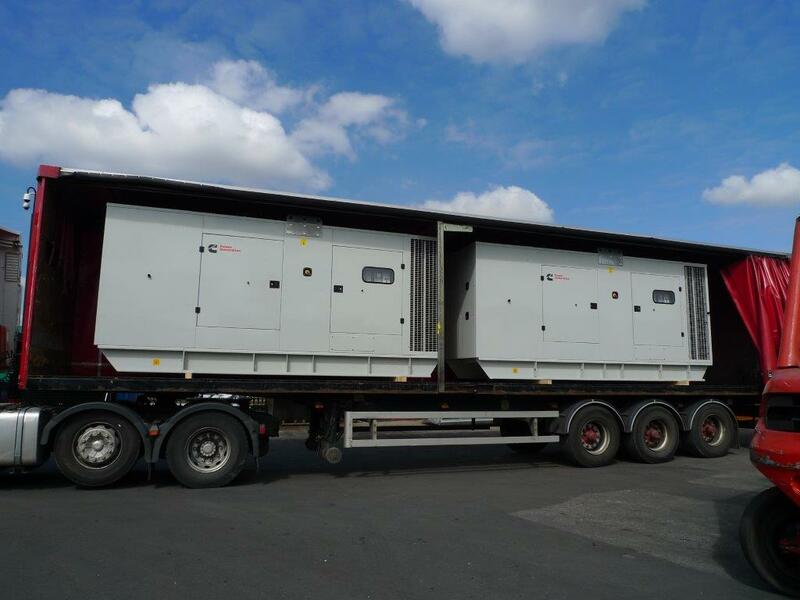 This match pair of Cummins 2500 Kva diesel generators in their bespoke ADVANCED designed & built 85 @ 1 mtr enclosures are now well on their way to a data centre in Germany. 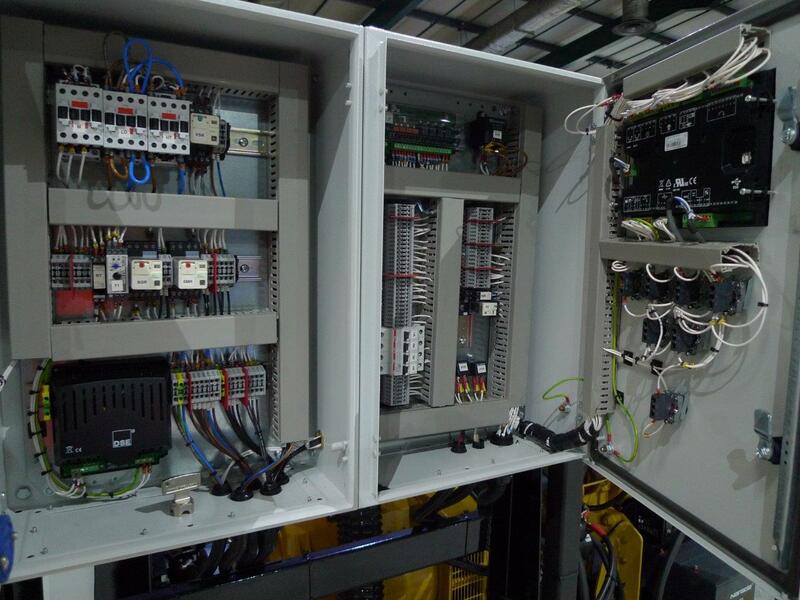 Probably the last telecoms set we get out the works this side of the christmas break,is this ADVANCED modified Perkins diesel generator c/w plant room installation equipment. 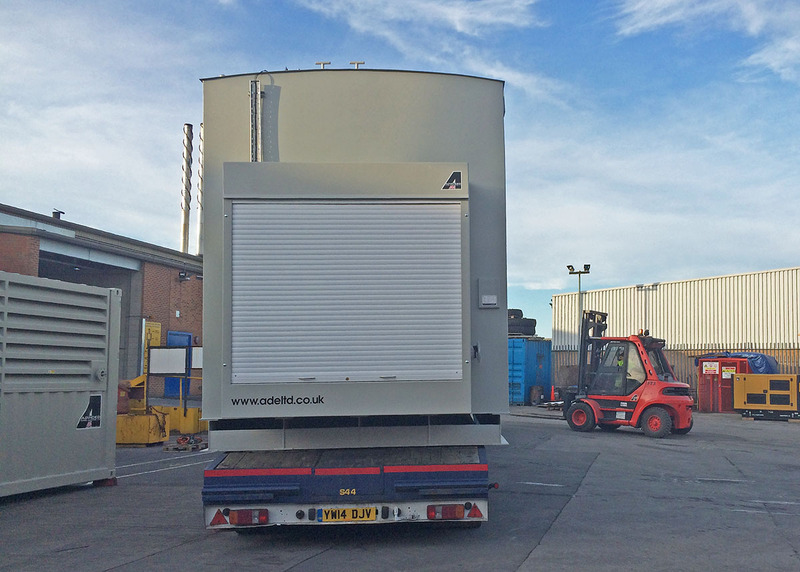 On its way to be installed at Derby UK. 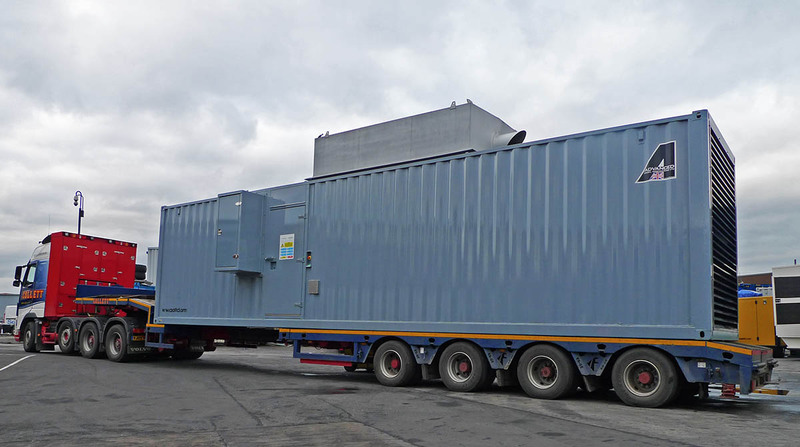 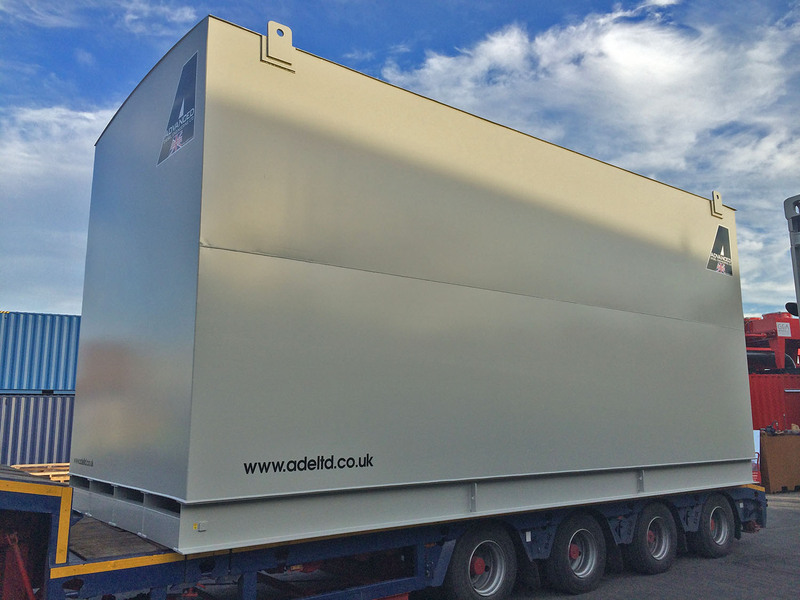 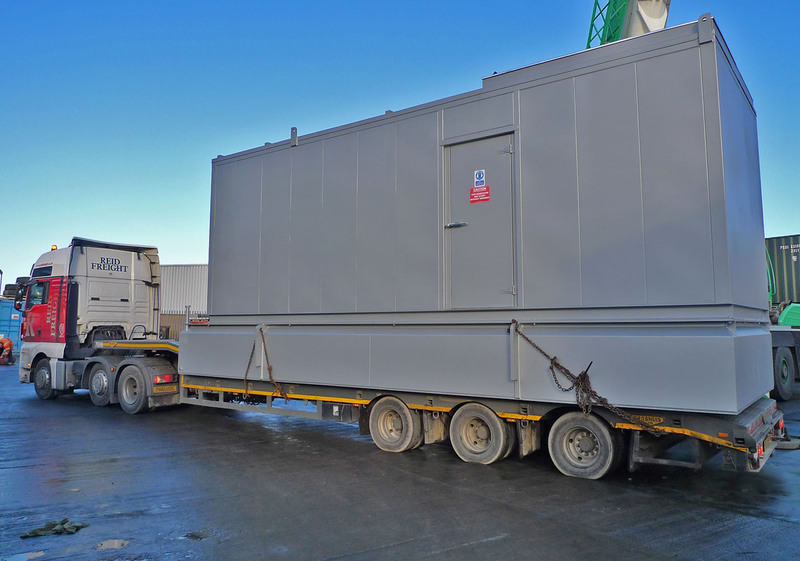 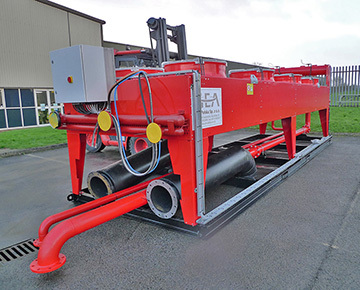 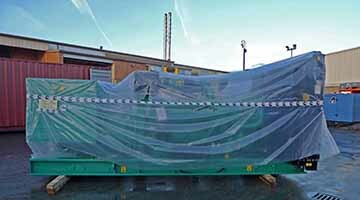 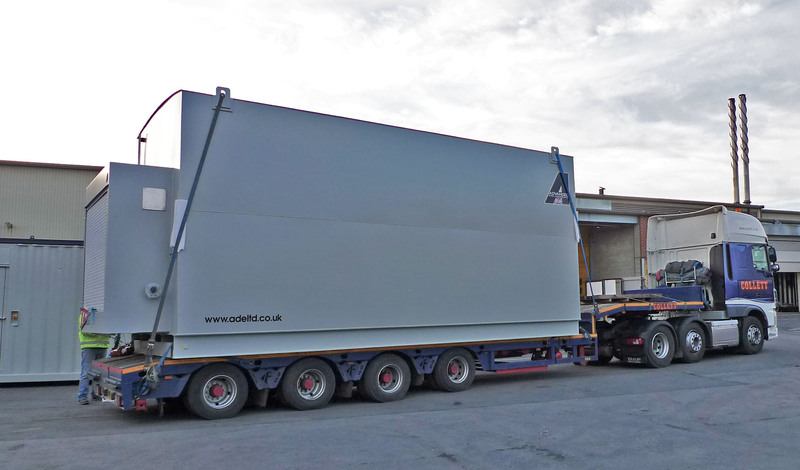 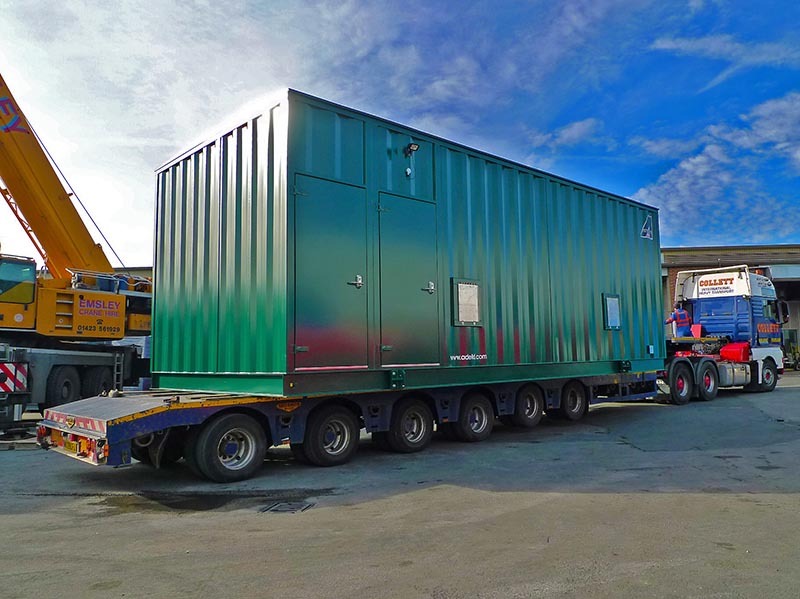 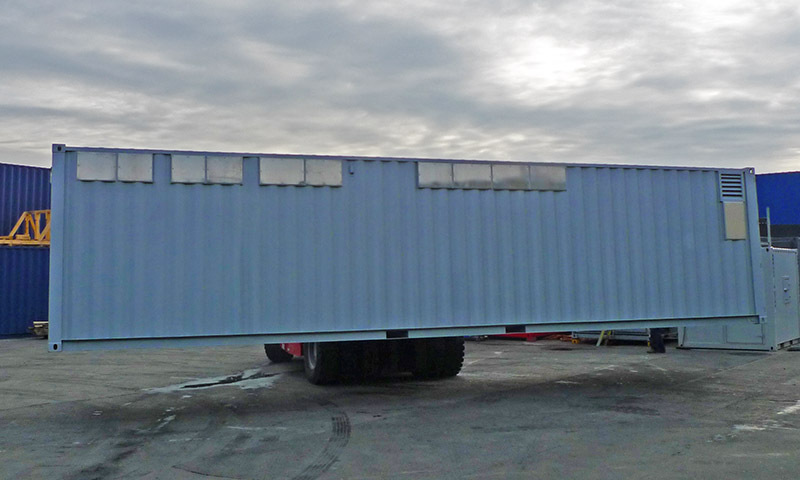 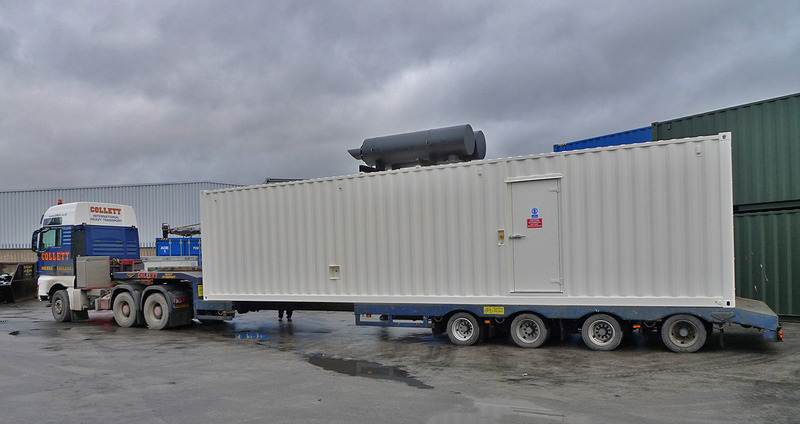 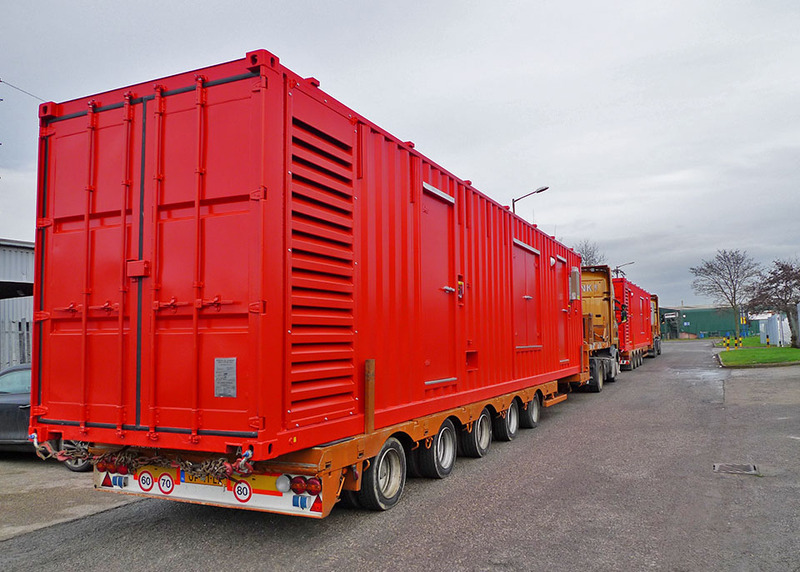 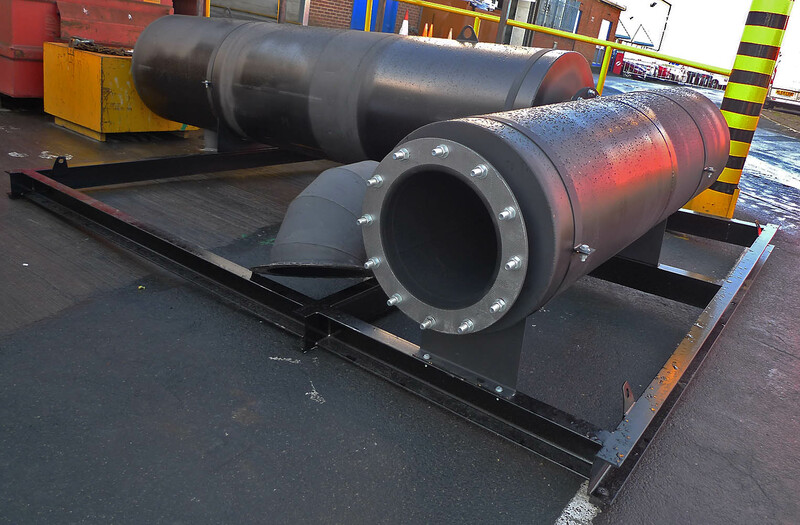 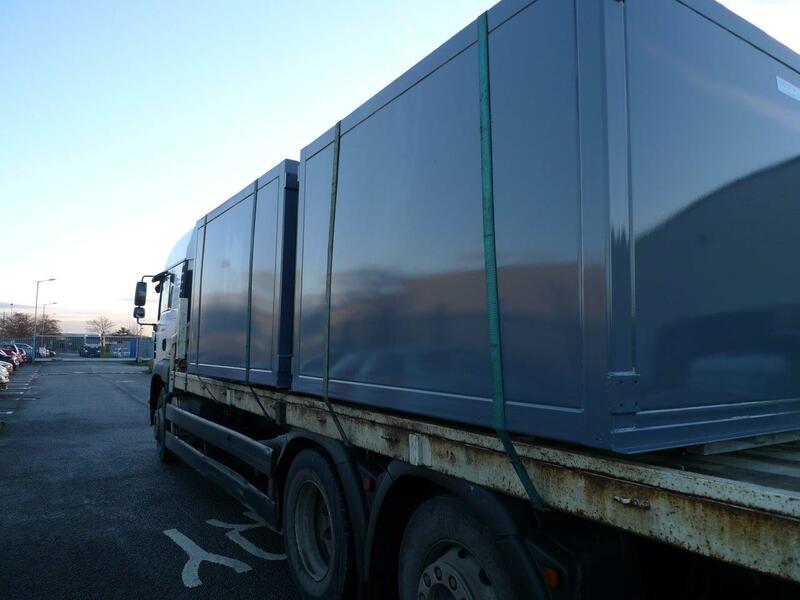 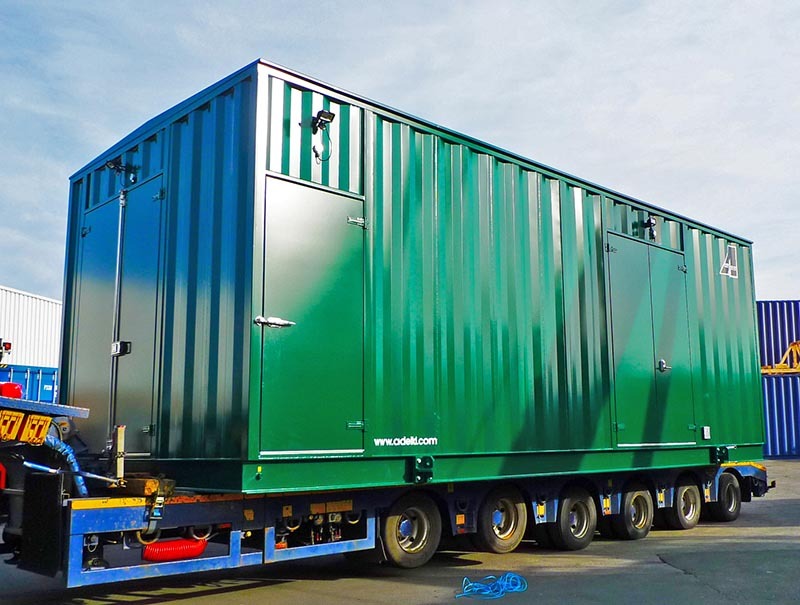 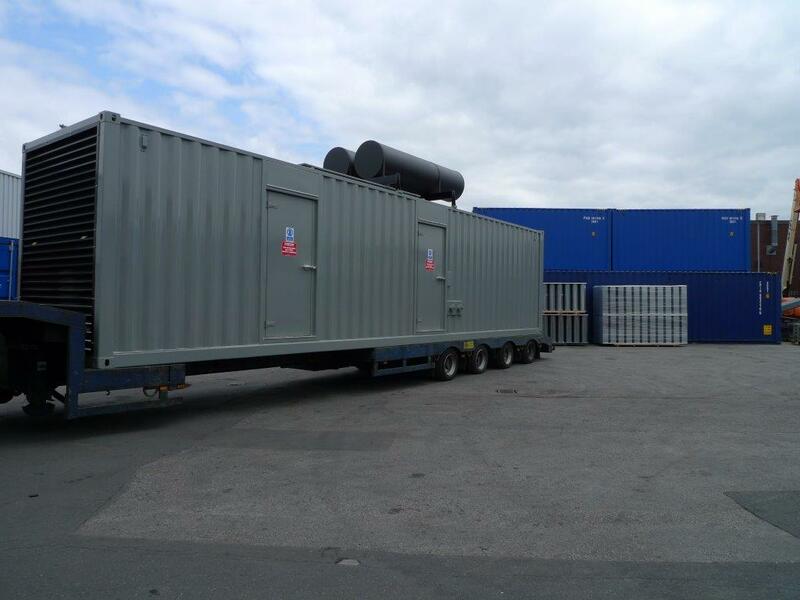 The design and manufacture of this 19Mtr long and 4.5 meter wide switchgear enclosure raised concerns on how we would get it out of the works road end…Over the back fence it went onto the waiting extra long low loader. 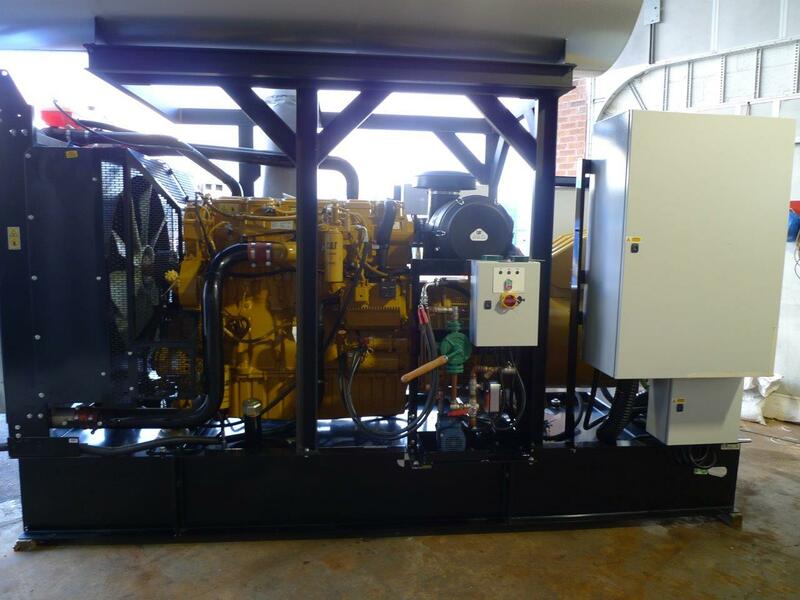 Along with the bulk fuel tank, this Cummins 1675 Kva Diesel Generator in its ADVANCED designed & built 75 dBa enclosure will provide back up power for the hospital essential services. 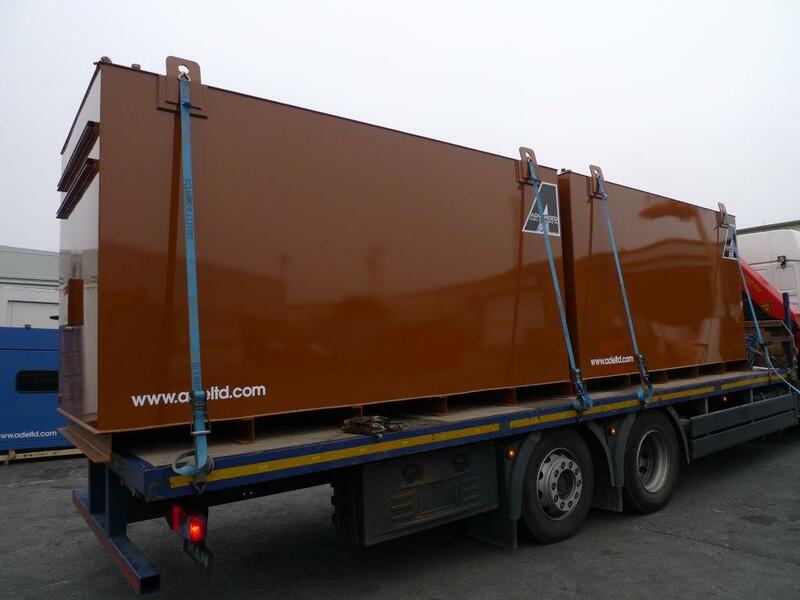 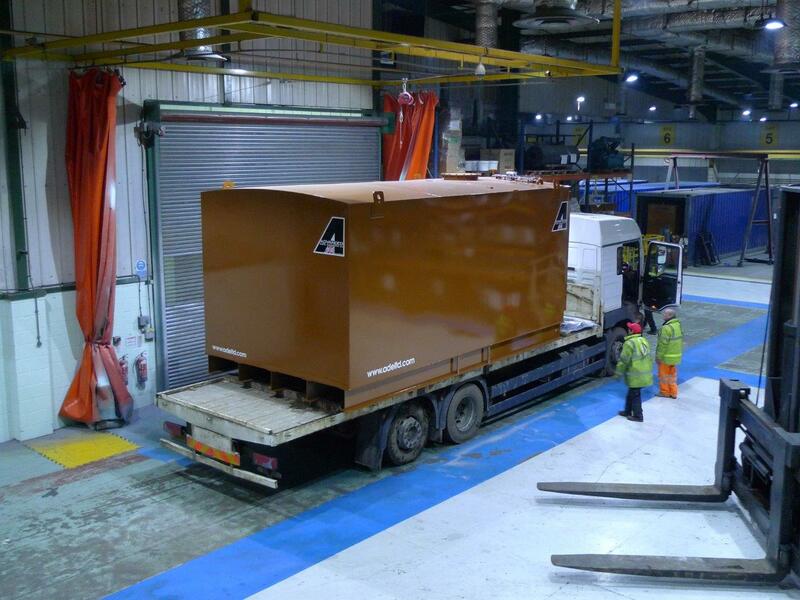 This ADVANCED designed & built 67,000 Litre double skinned bulk fuel tank is on its way to an NHS Hospital in Cumbria. 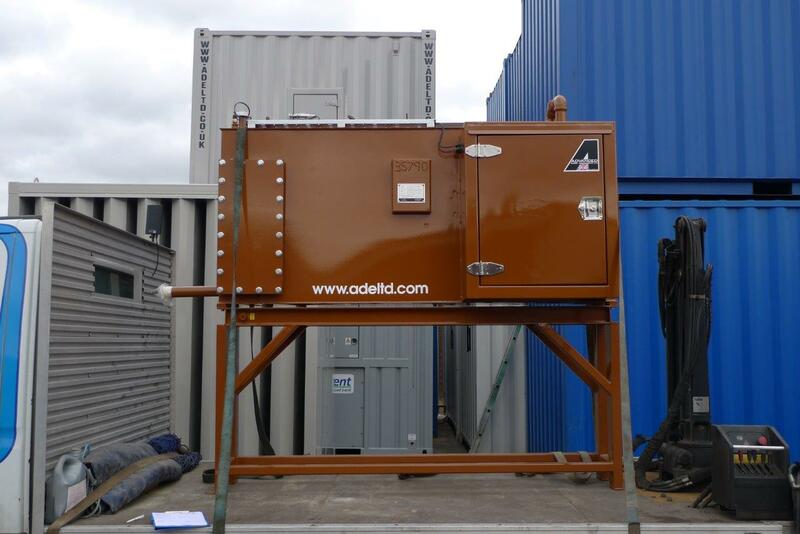 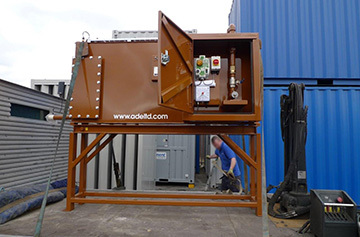 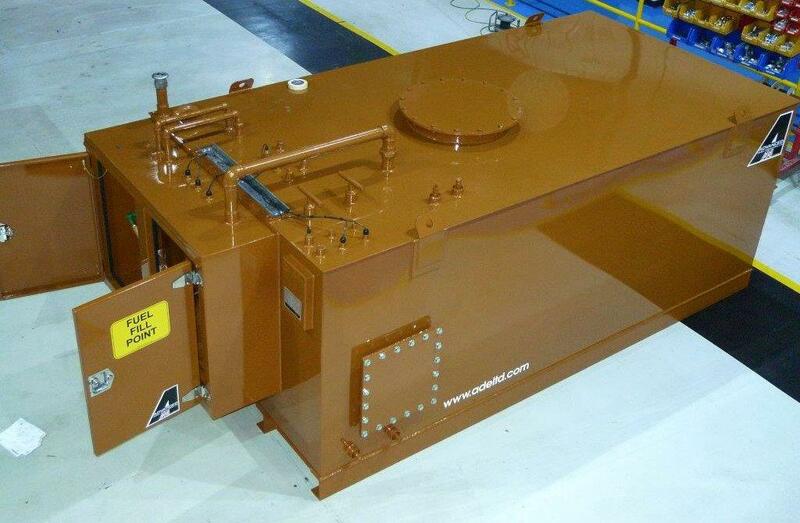 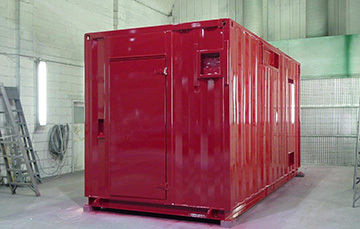 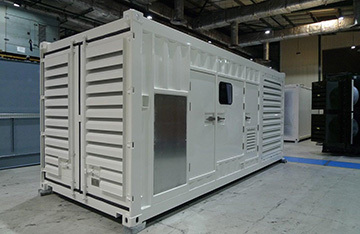 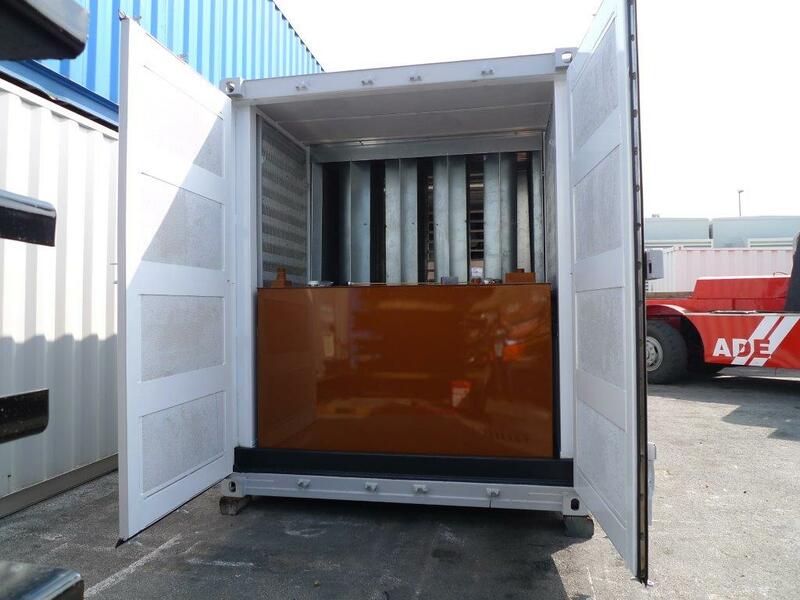 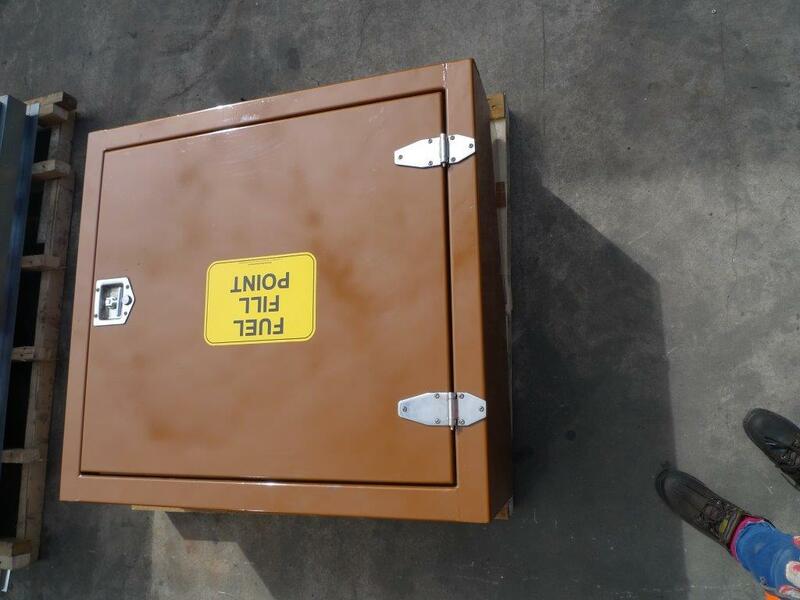 This switchgear container is part of an order of six, Four switchgear enclosures of different sizes and two identical generators. 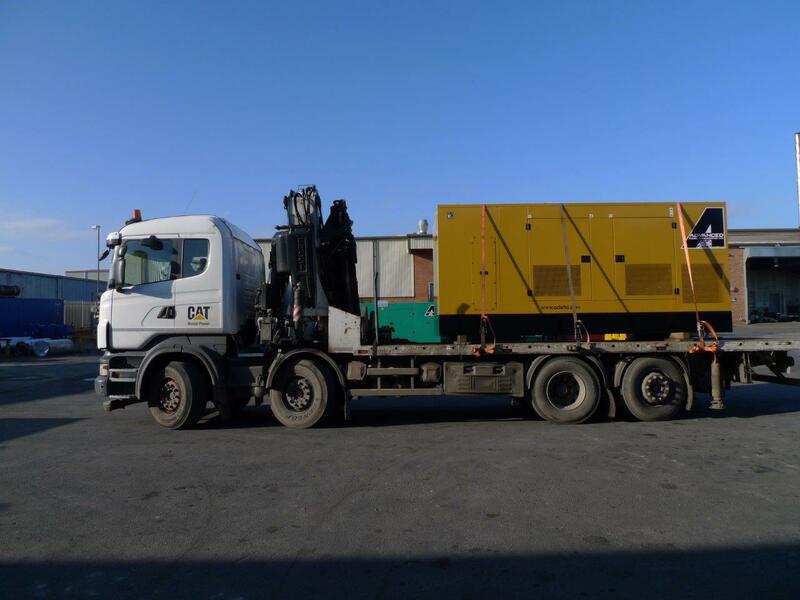 Being loaded and despatched is a Cummins 1675Kva 70dBa @ 1 mtr, c/w 22,000 litre base fuel tank. 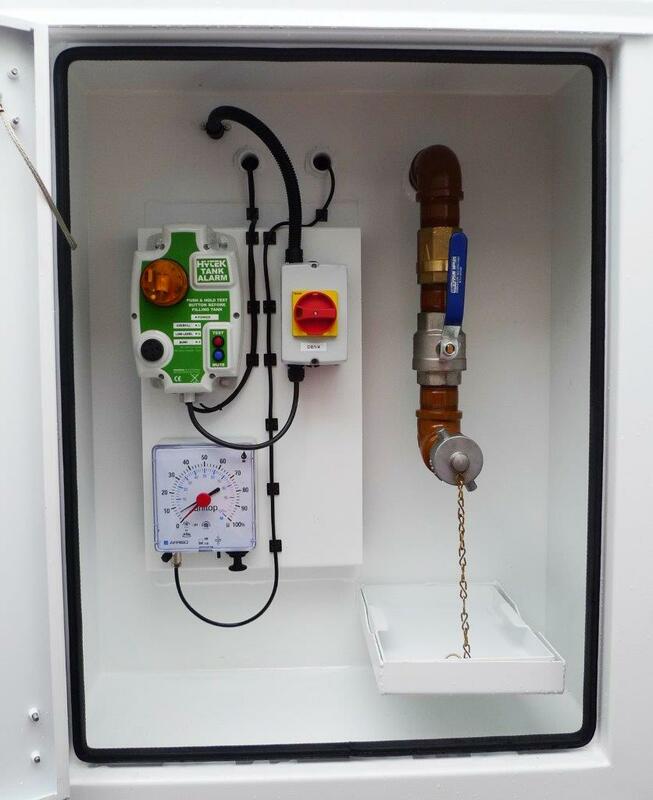 Now being installed in a Hospital in Wales. 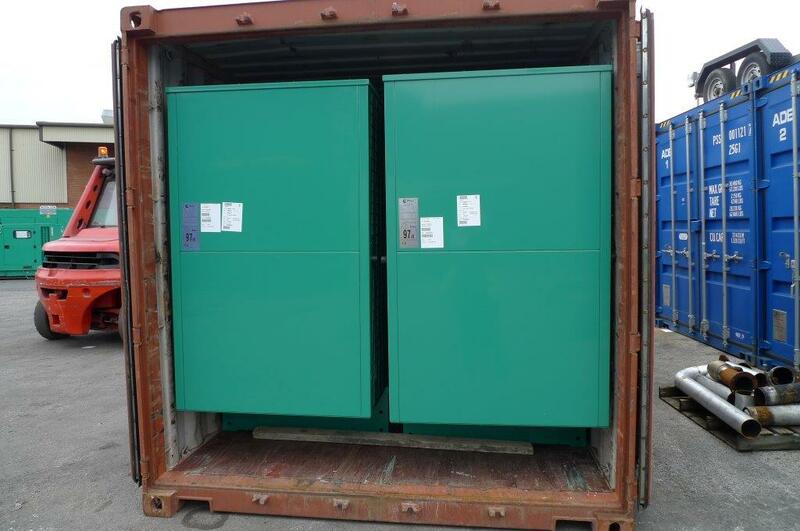 Another telecoms set is despatched to a site in London during November. 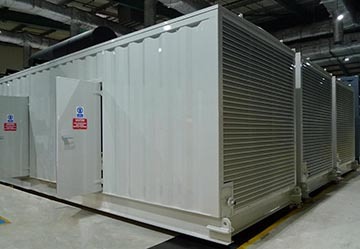 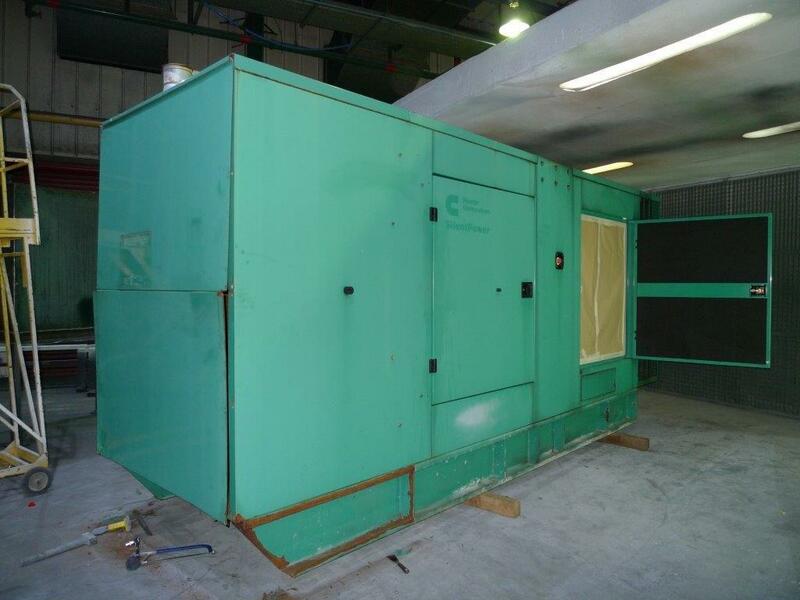 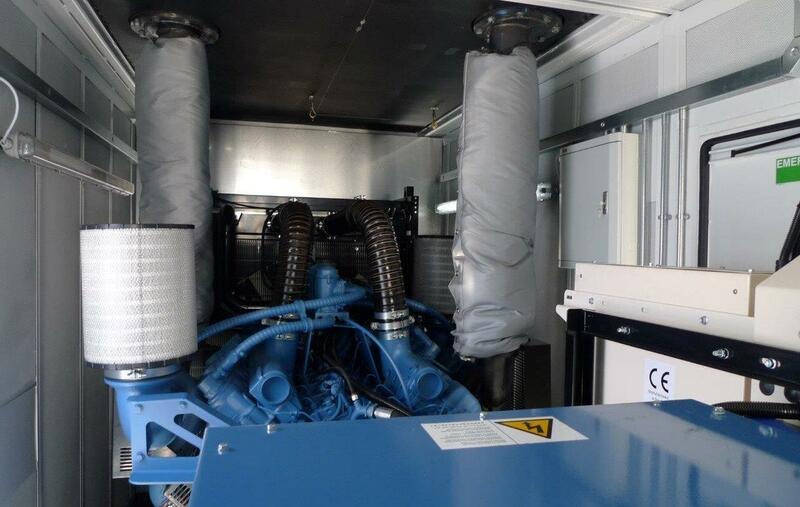 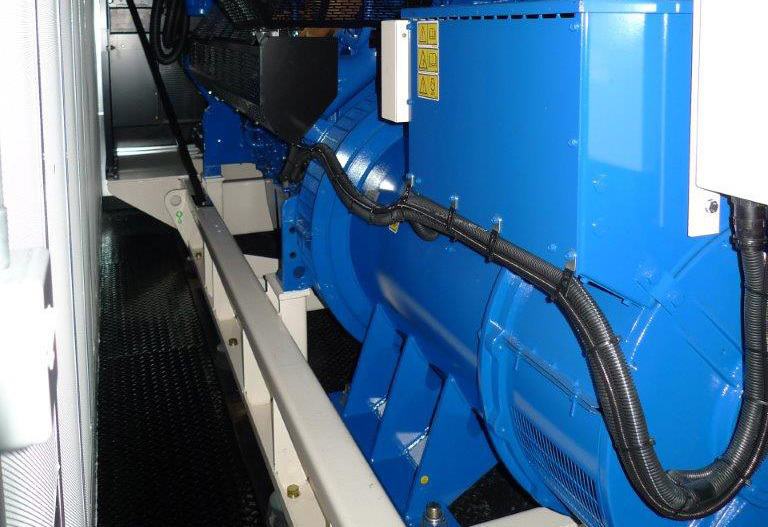 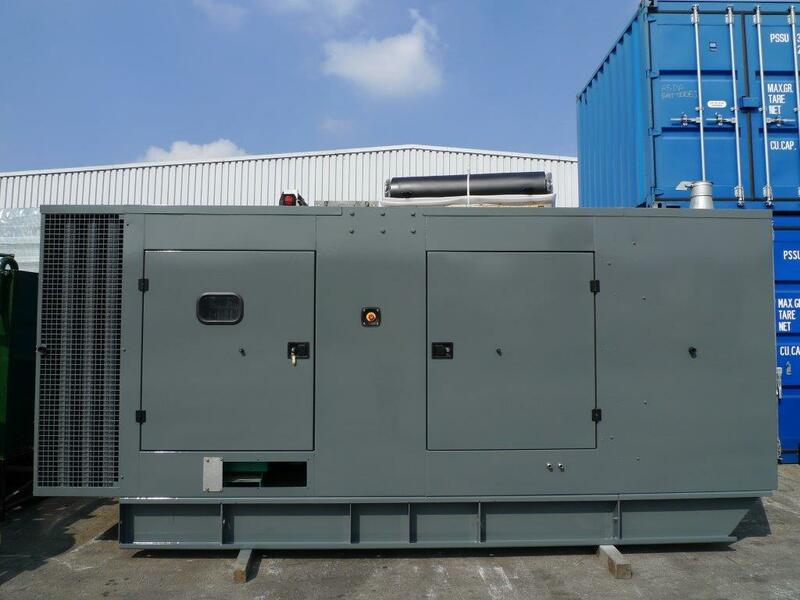 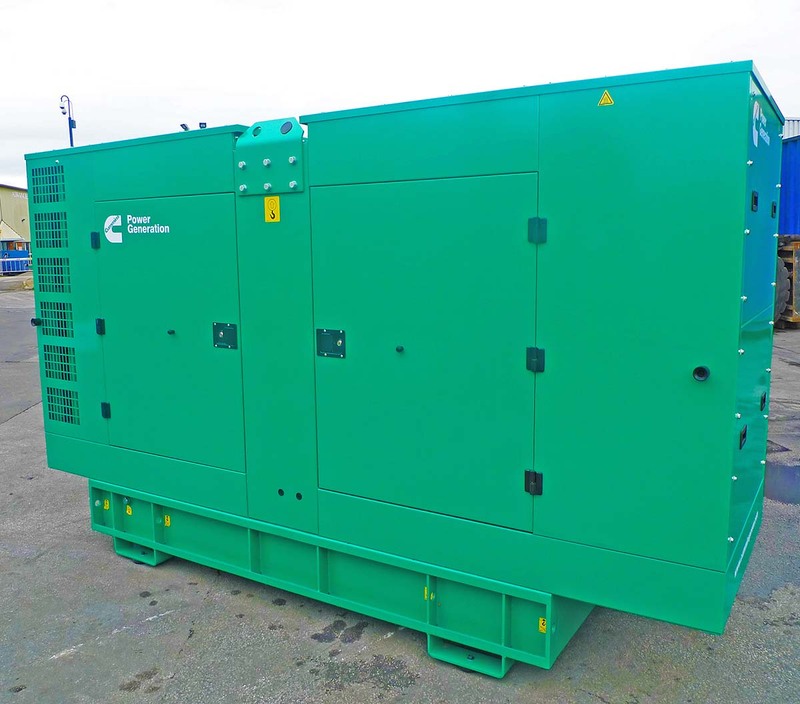 This 500 Kva Cummins diesel generator in its ADVANCED designed & built acoustic enclosure is to be used as back up power for the national work smart offices. 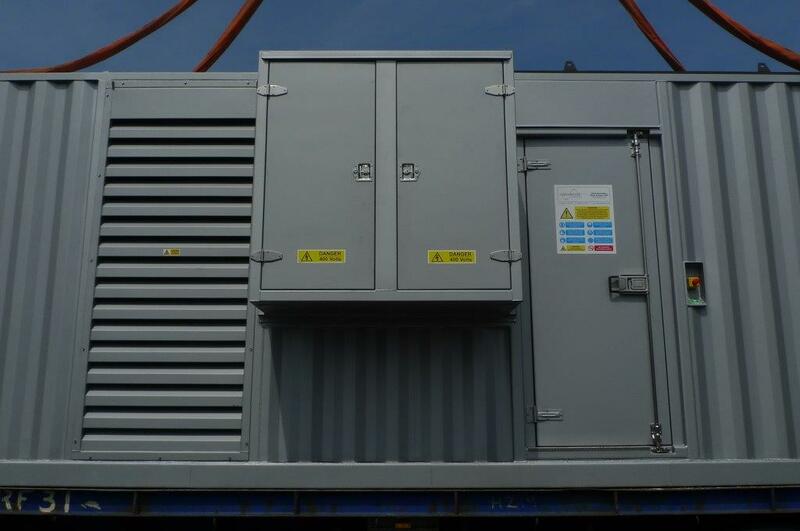 This Modified 40Kva Perkins is currently being installed in a telephone exchange in Cranbrook. 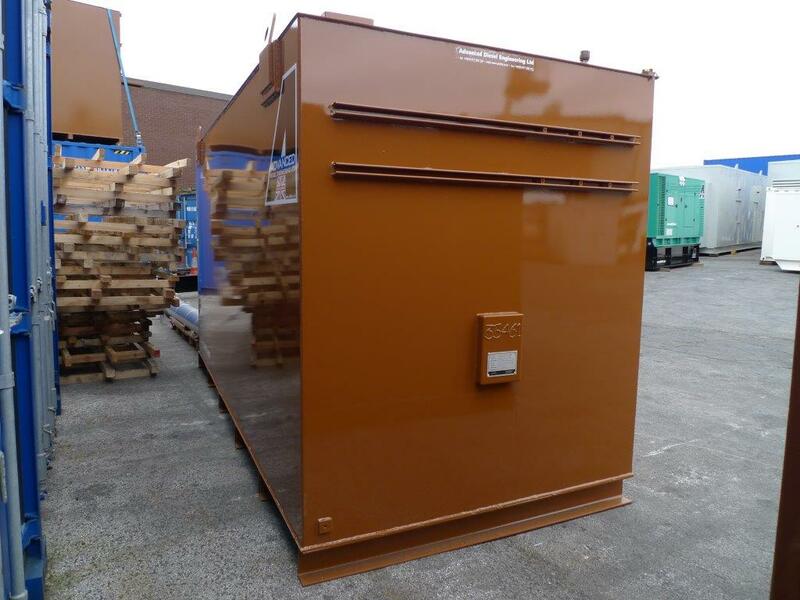 The second unit of its kind to be despatched this week is exactly the same apart from it being Brown in colour.The insulated housing encloses some 33KV switchgear, all fitted at our works. 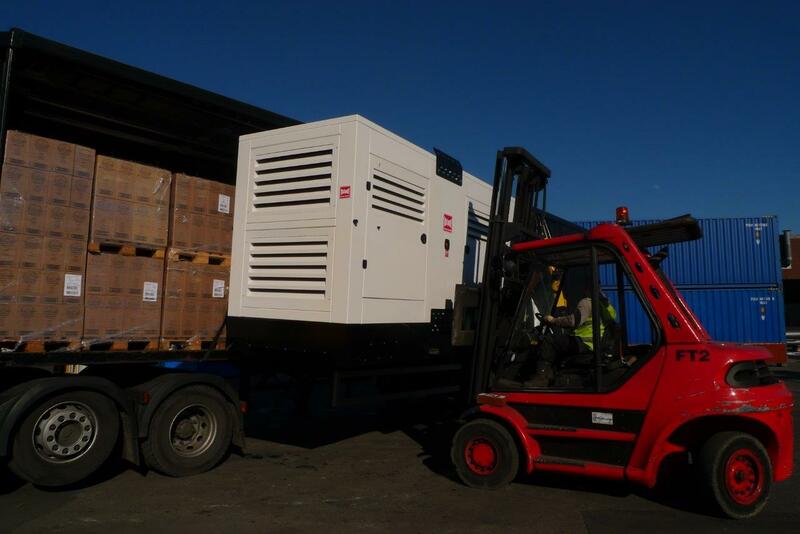 Production ramps up once again as we aim to despatch two to three telecoms generators per week, This Perkins 800kva units is bound for Wrexham. 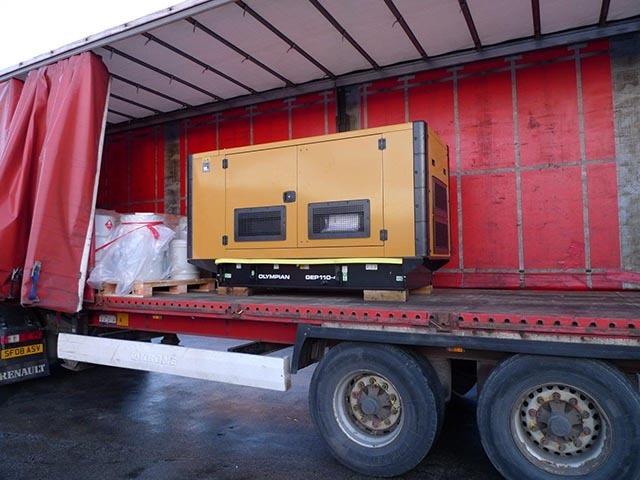 Just about the last of the 38 Cummins 550 kva diesel generator order was despatched today, leaving only one left in the yard for despatch at a later date.The majority are now on site and commissioned. 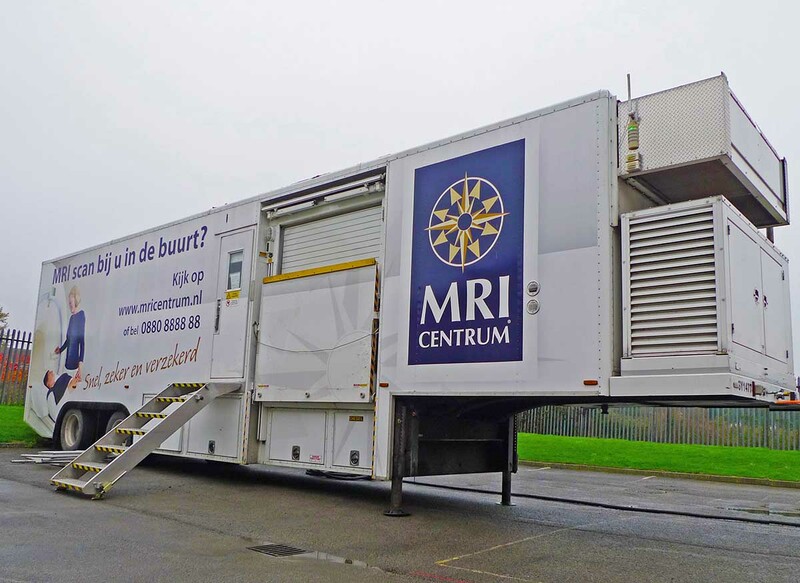 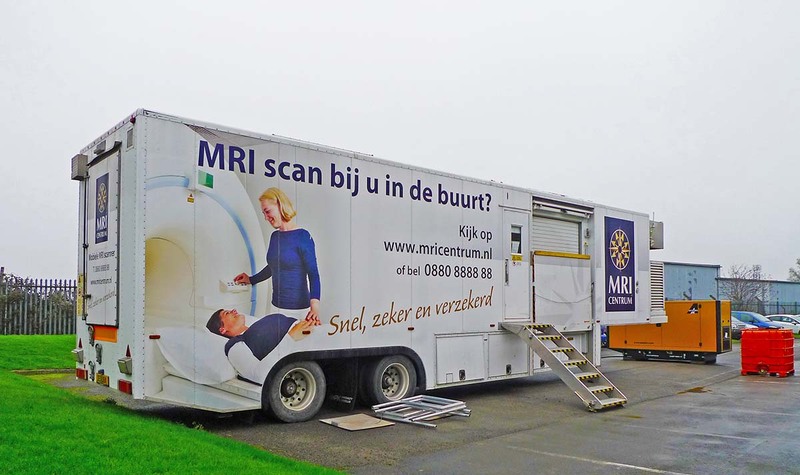 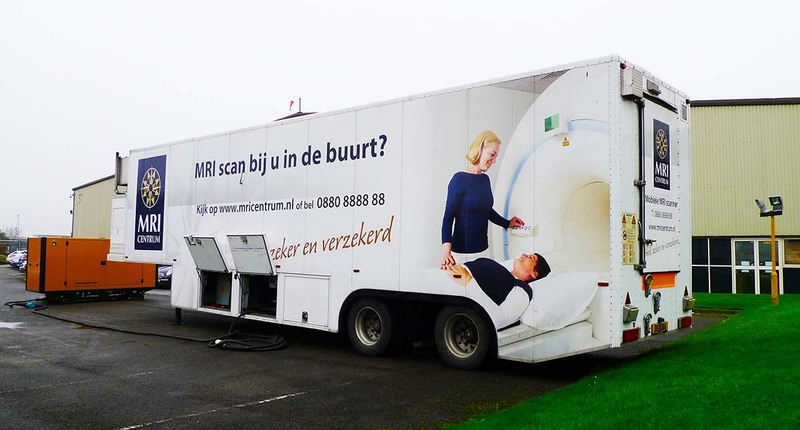 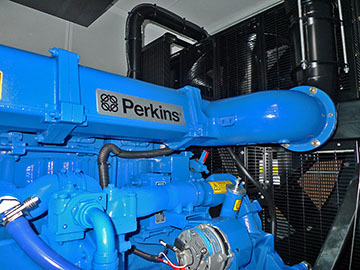 This 150Kva silent Perkins diesel generator was put through its paces to demonstrate to the client that it would run silently while the MRI scanner was in operation.The unit is now powering the mobile MRI scanner at a private hospital and further orders for the genset are expected as and when more MRI units arrive in the UK. 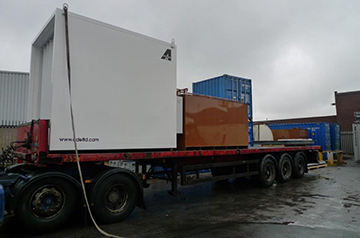 Another Prison expansion project, This Cummins 1100Kva diesel generator in its ADVANCED designed & built 65dBa enclosure is now on its way to an Oxford Prison. 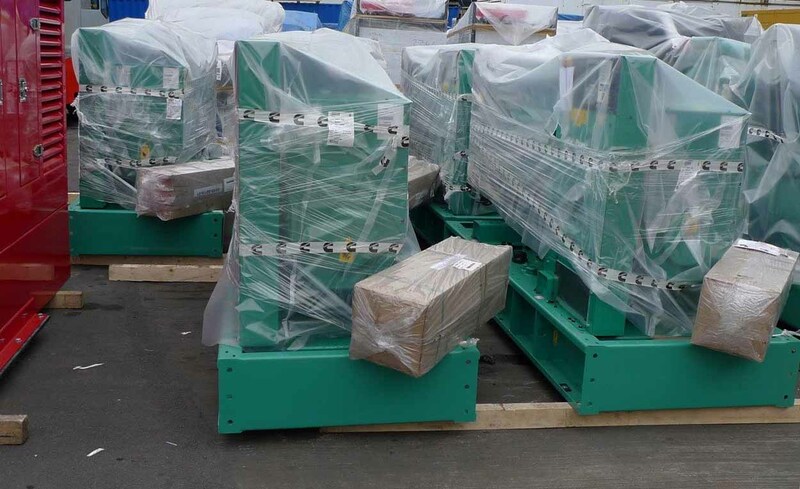 As part of our ongoing expansion plans, we have made great headway into other markets such as switchgear housings, shown being despatched in one of six identical units which has already been fitted out at our works with the HV switchgear. 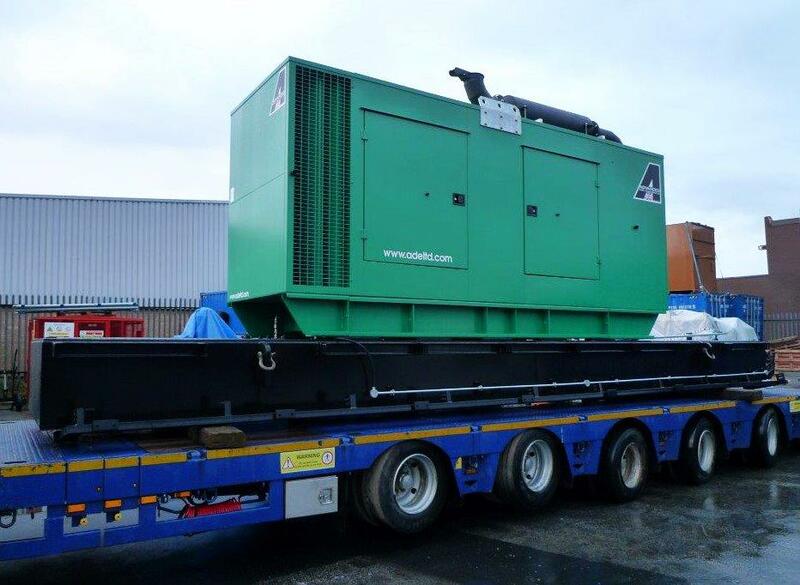 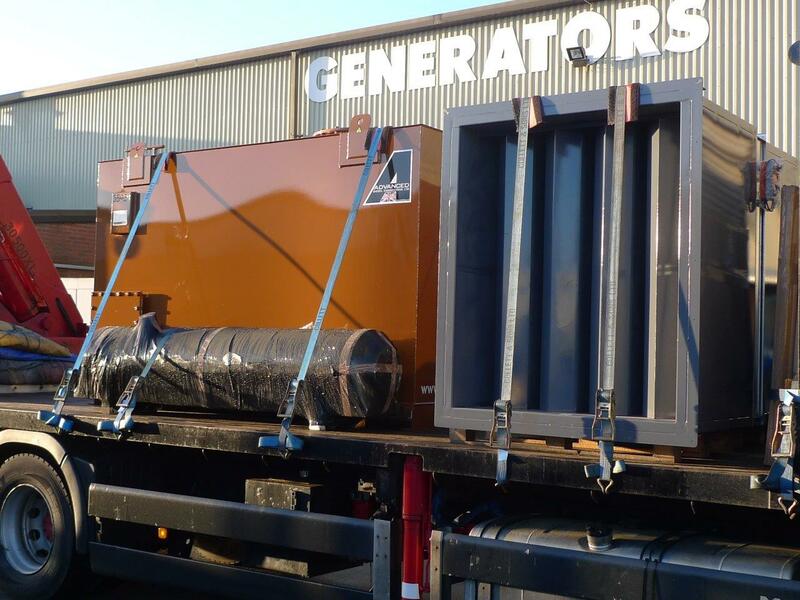 This generator was brought in to the works for a full refurbishment, and the fitting of an additional 4000Ltr double skinned base fuel tank. 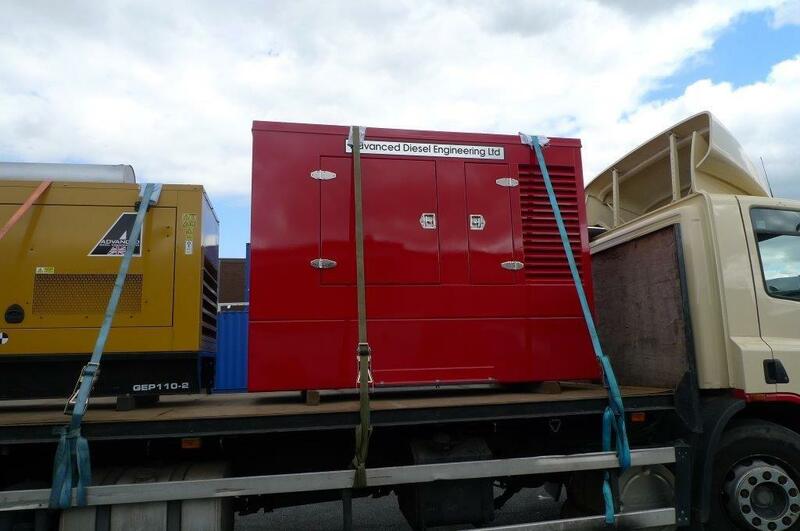 Ongoing telecoms project, This ADVANCED modified Perkins diesel generator is to be installed later this week into a telephone exchange in Sussex. 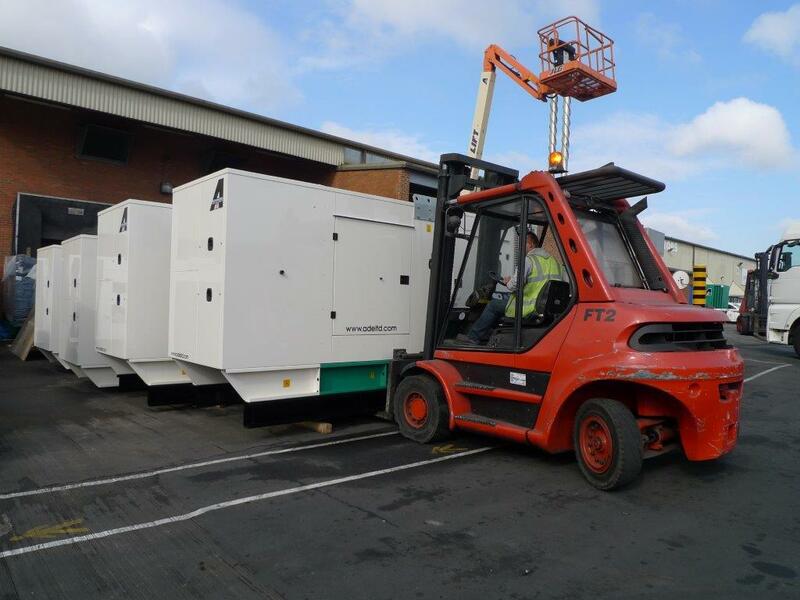 As people and companies now start to prepare for the upcoming winter, one company chose to protect all its sites against the threatened power cuts due to the shortage of capacity announced this week by the national grid. 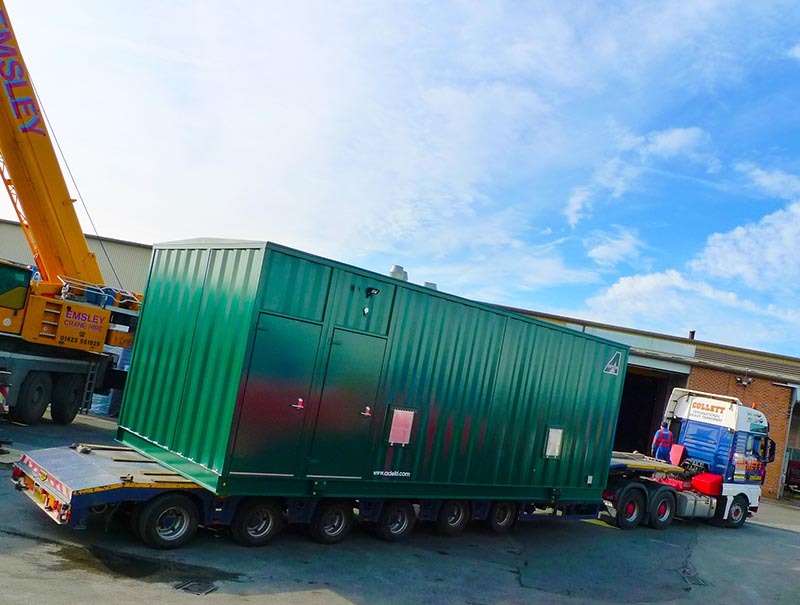 Despatched to separate UK private care homes are a Cummins 900Kva, 550Kva, 275Kva, 150Kva and a 110Kva. 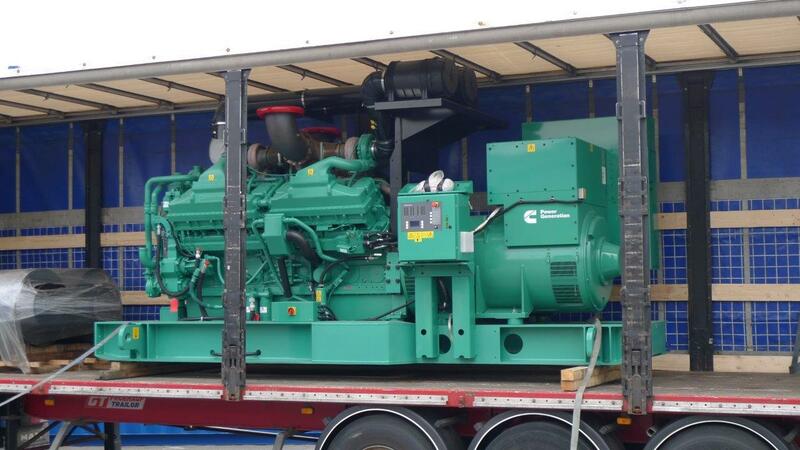 Given three out of the five care homes have suffered from a power cut in the past month alone ! 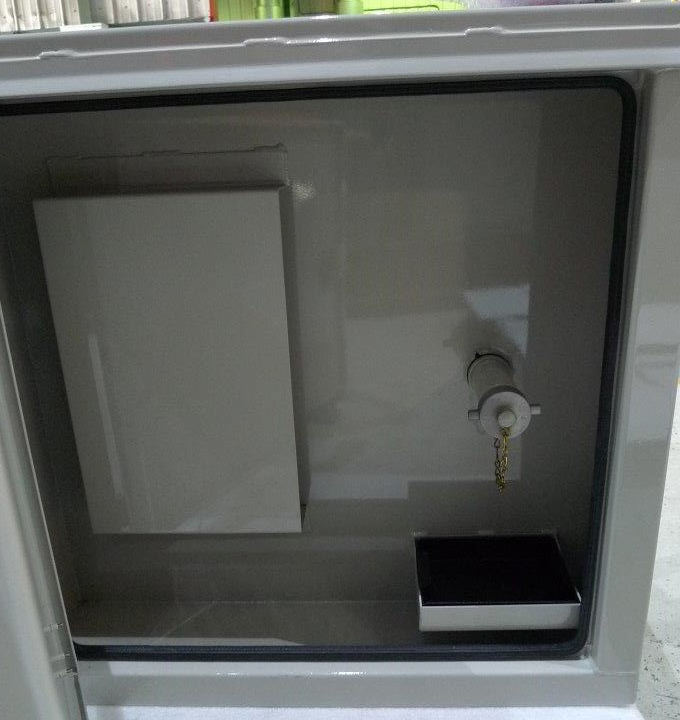 This company is taking the necessary steps to prevent loosing money. 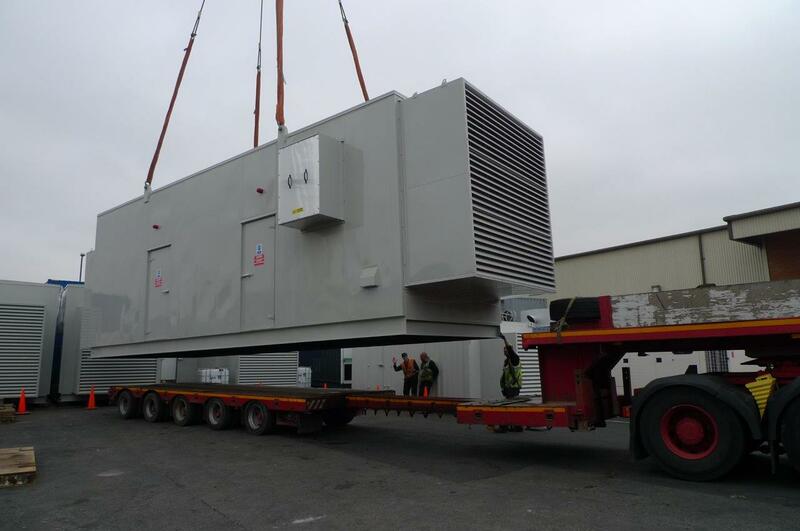 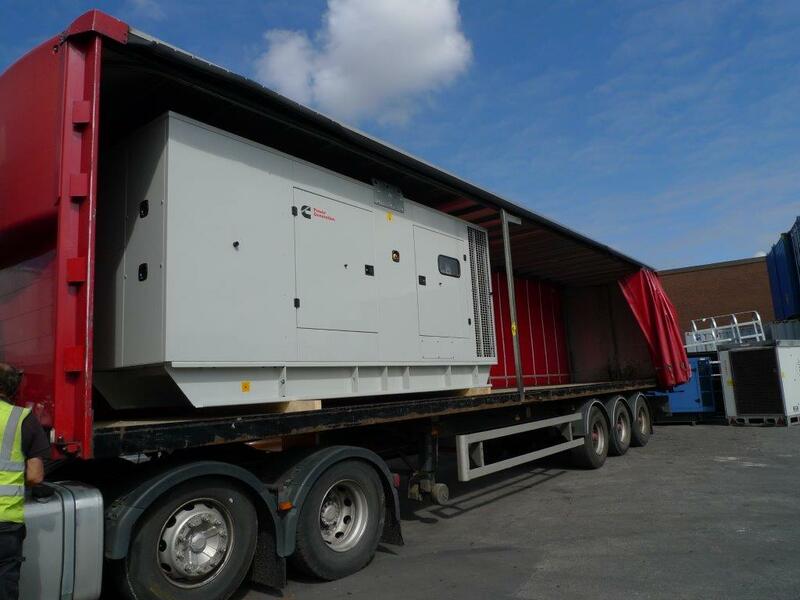 ADVANCED secure orders for another seven UK HMP Prison expansion contracts, comprising the diesel generator and ancillary equipment. 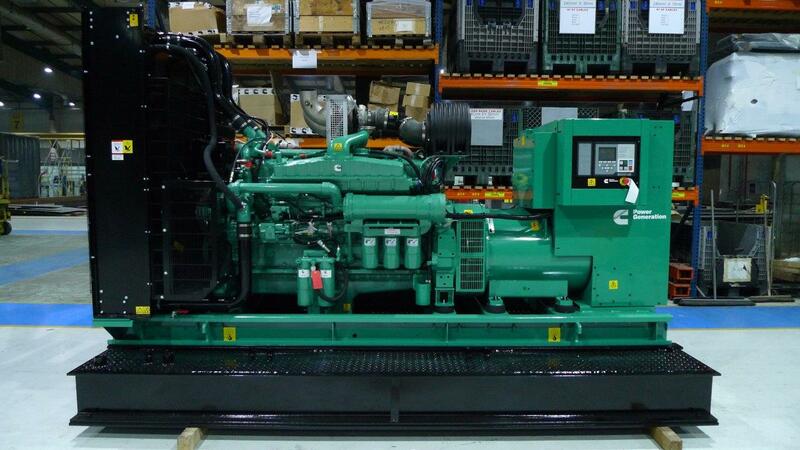 Being despatched this month is a super quiet 65dBa @ 1 Mtr Cummins 825Kva diesel generator and on board bulk fuel tank. 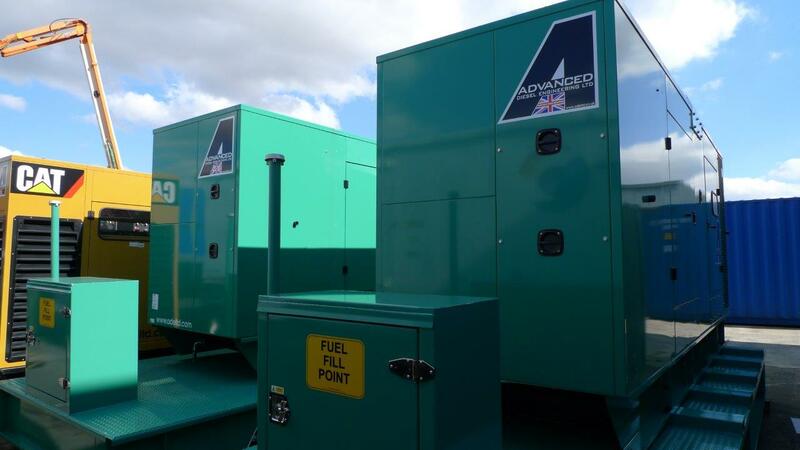 These five synchronised load sharing Cummins 550kva silent diesel generators and their respective ADVANCED designed & built 6000 Ltr walk on base fuel tanks will be used as primary power at main event race meetings at Chelmsford race course. 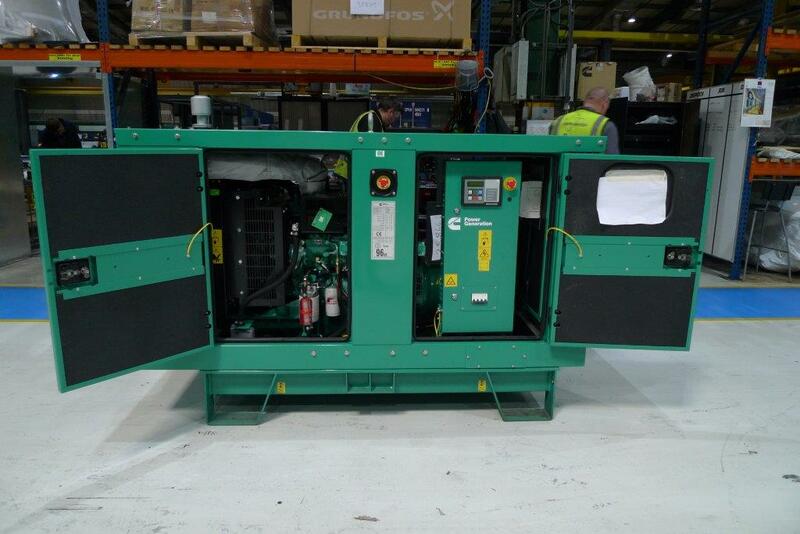 This Cummins 550kva diesel generator is the start of a new site part of the 38 off order. 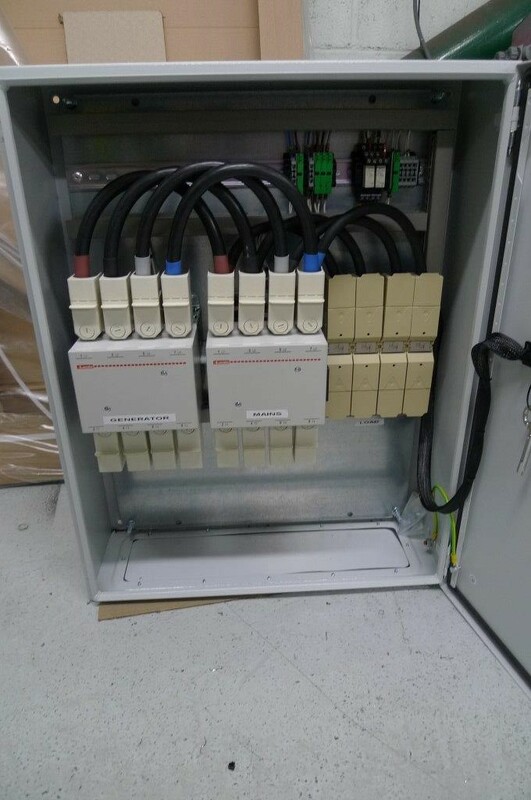 The rest will follow shortly. 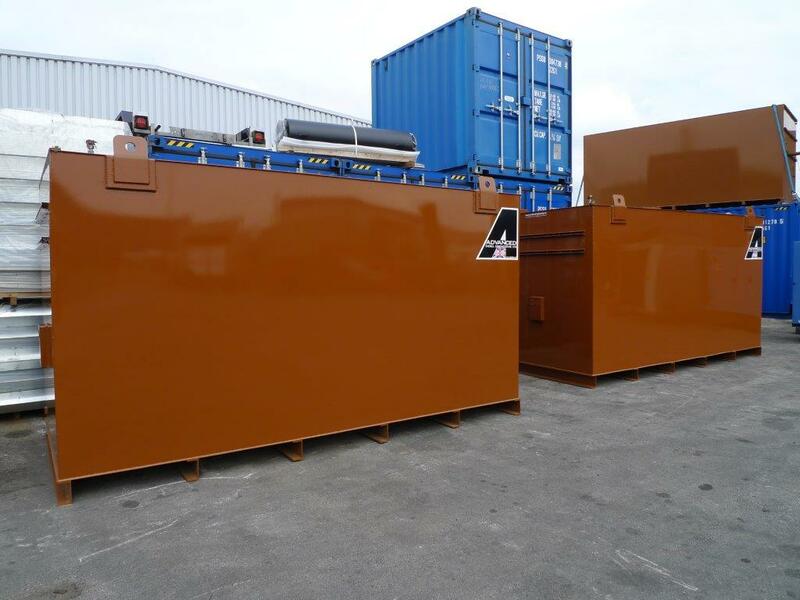 The tank manufacturing bays continue to be busy 24 hours a day with work now stacking up, we may choose to increase the tank bays to four teams of 5 men as the workload shows no sign of letting up. 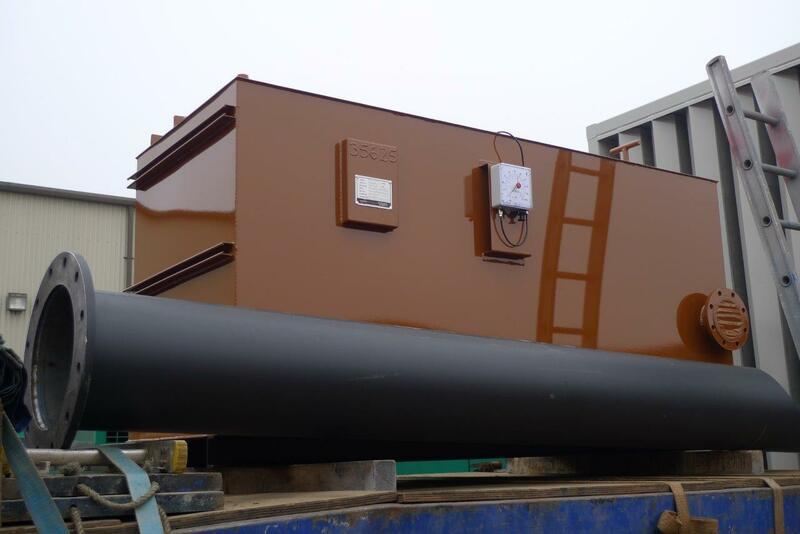 This 7500 Litr tanks was completed start to finish in less than three days. 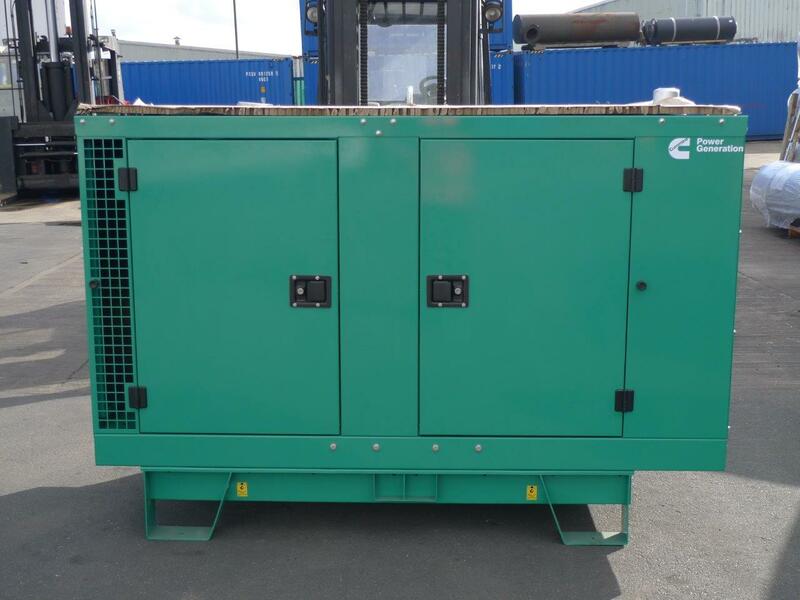 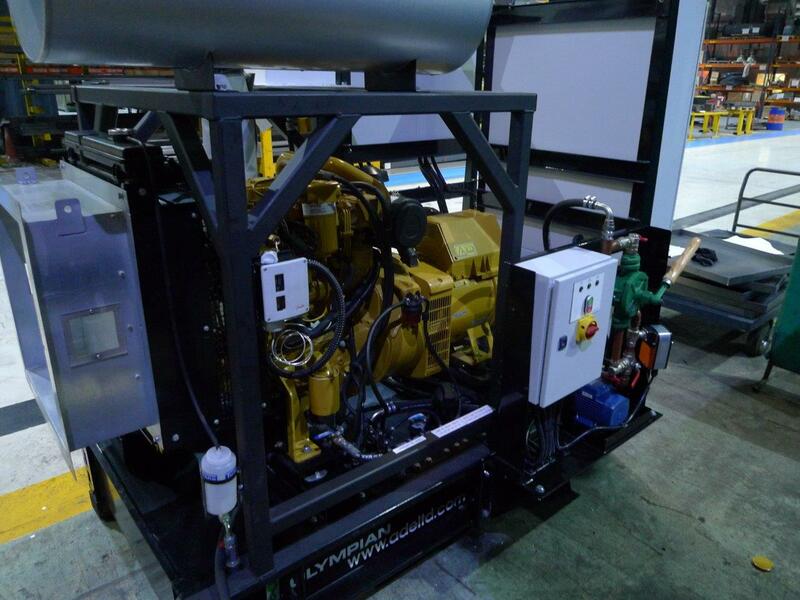 This Cummins 330kVA silent diesel generator was up fitted with an ADVANCED designed & built 2200 Litre double skinned extended fuel tank for use in a remote area. 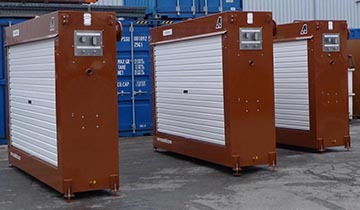 These replacement Cummins radiators are being shipped to our Bangladeshi Agent. 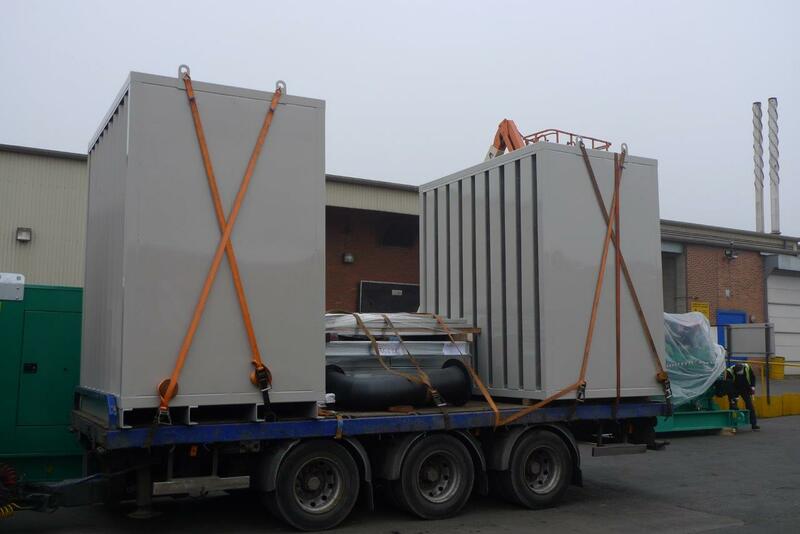 And we're off again with the telecoms sets, a further order for the larger sets has been received. 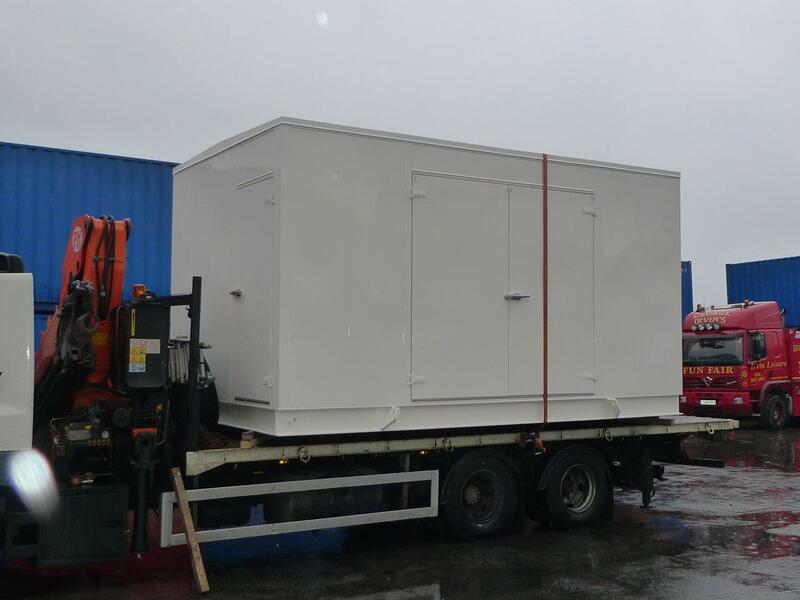 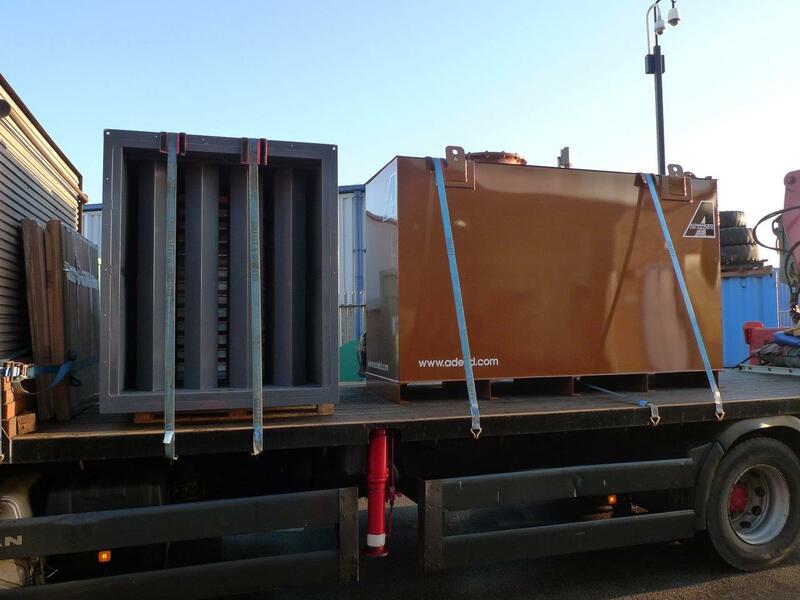 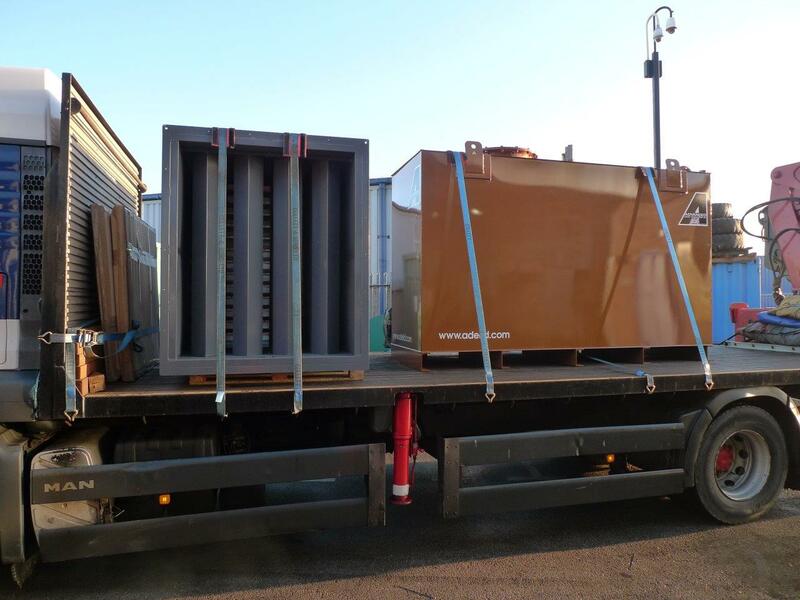 The decision to venture into the switchgear enclosure market around 18 months ago has paid off nicely, New orders & clients are being added on a daily basis.This switchgear housing will be transported to site where the electrical up fit will take place. 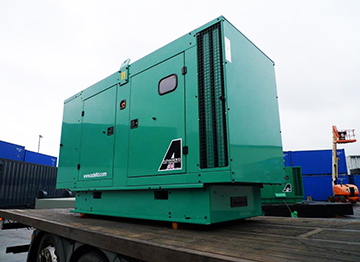 A further seven Cummins 550kVA silent generators with ADVANCED designed panel modifications are dispatched to site making the total to 30 units shipped. 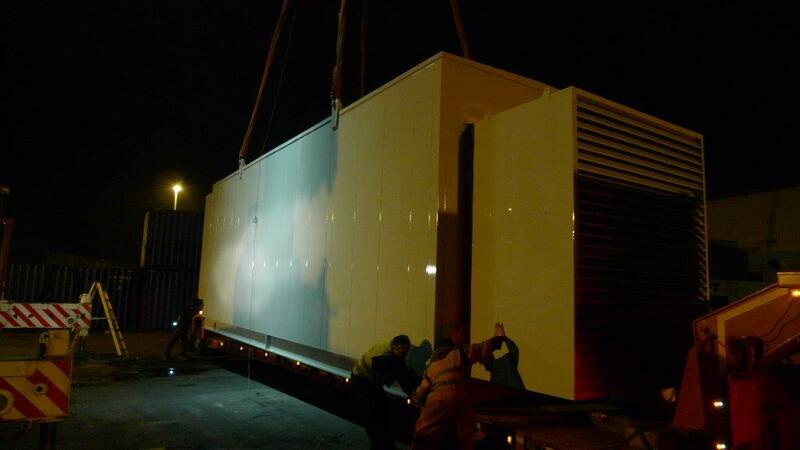 The final four massive enclosures leave our works late at night to join the four that went last week on site at a Data Centre in Crawley UK. 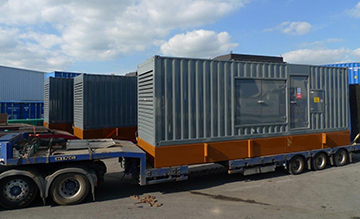 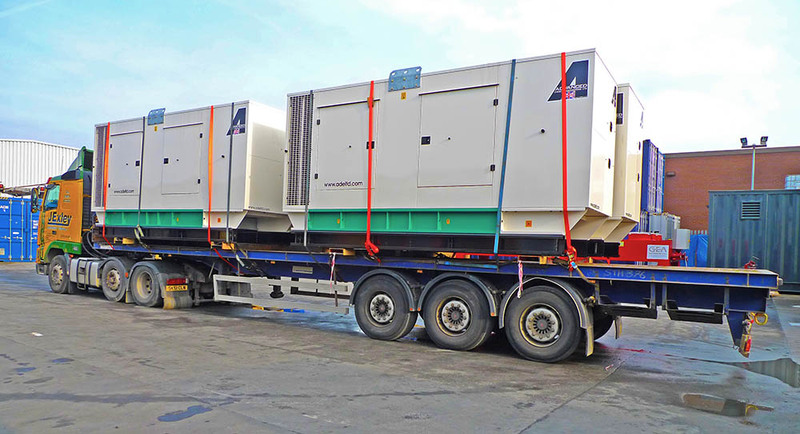 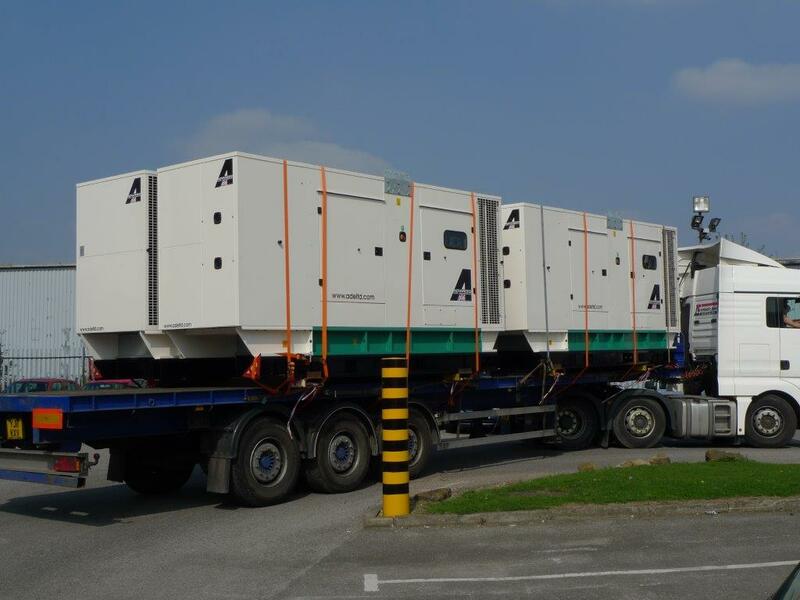 These three enclosed diesel generators are on their way to join the larger sets we built for an Iceland Data Center, The smaller units will be used for site accommodation and offices while the project as a whole is being built. 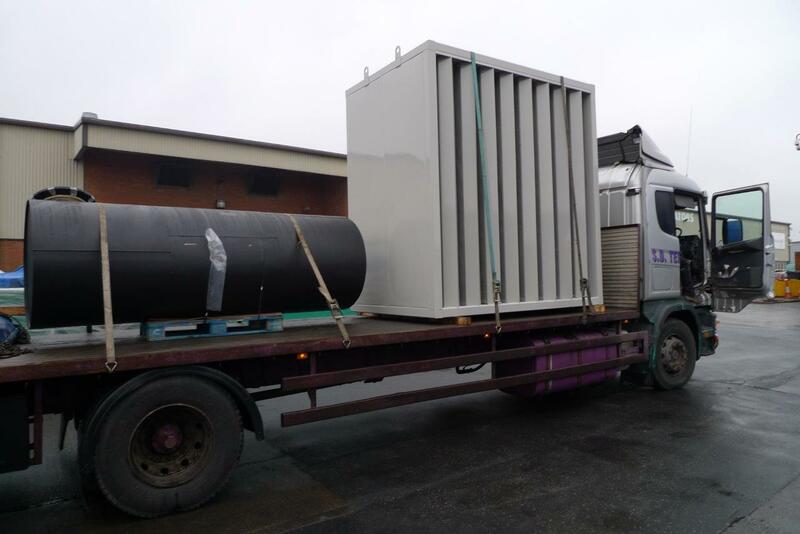 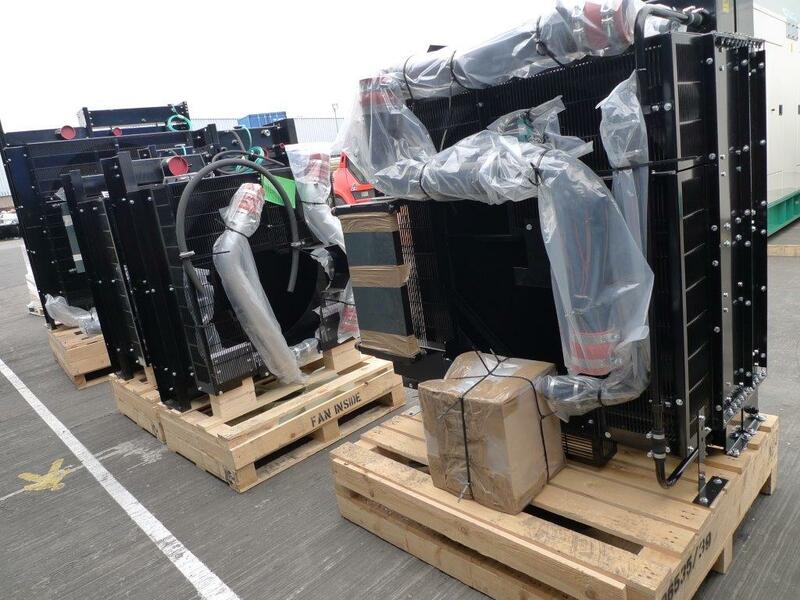 These eight super silent Cummins 2000kVA ADVANCED designed & built enclosures were dispatched over two days, and are heading for a data centre expansion project in Crawley. 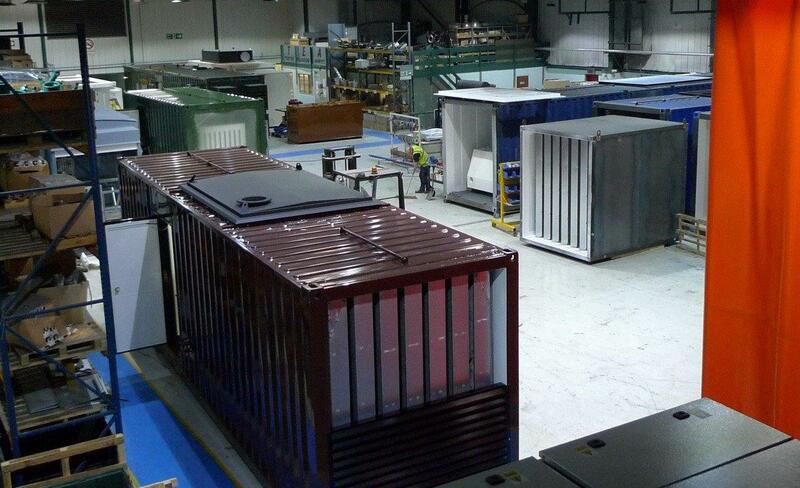 Six more special 550kVA units dispatched on this Monday morning, leaving another 15 still to dispatch on this order. 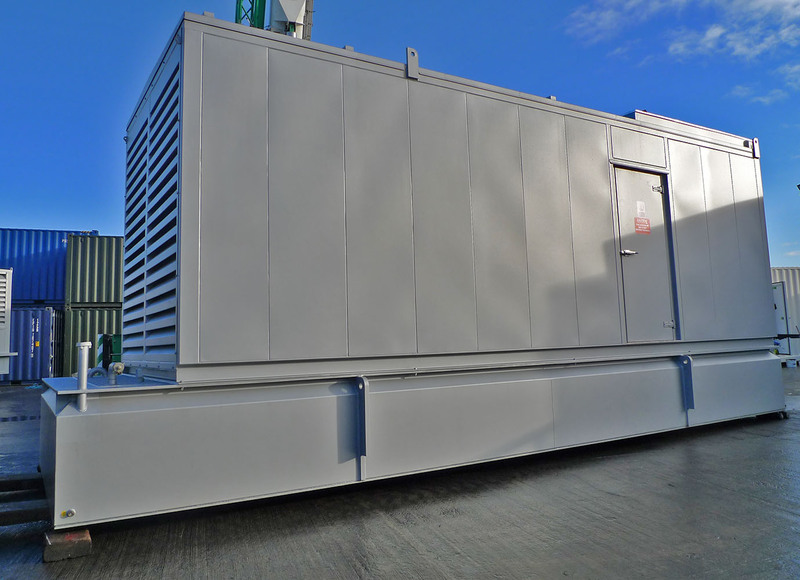 This 75dBA @1 metre 275kVA Volvo diesel generator in its purpose built ADVANCED designed super silent enclosure, it is to be lifted way up high onto a London office block roof. 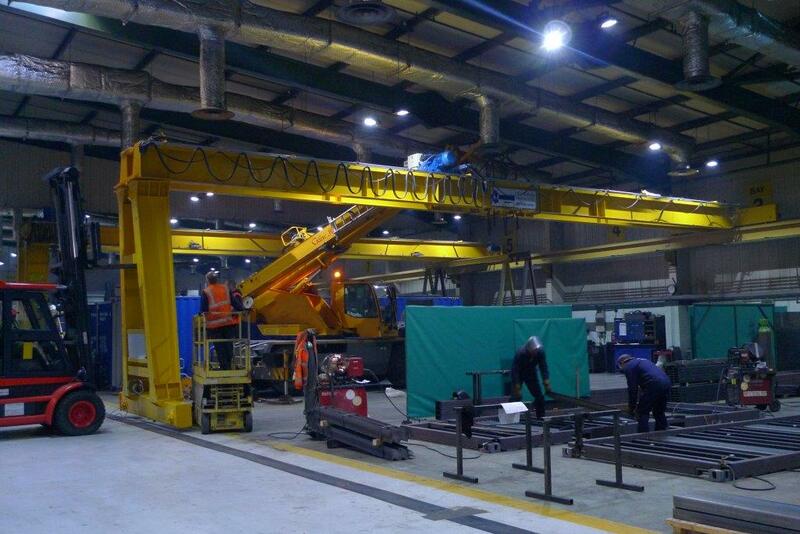 The steel work shown under the set is to spread the weight on the roof. 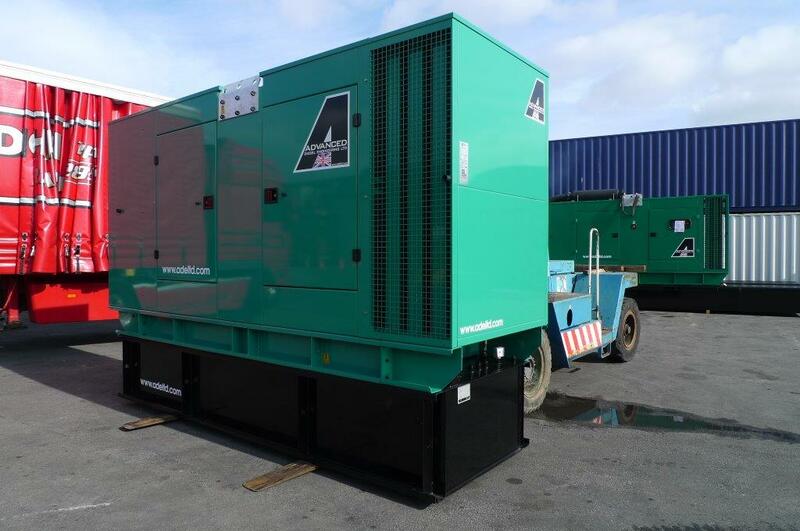 A further six Cummins 550 kVA modified diesel generators are dispatched this week. 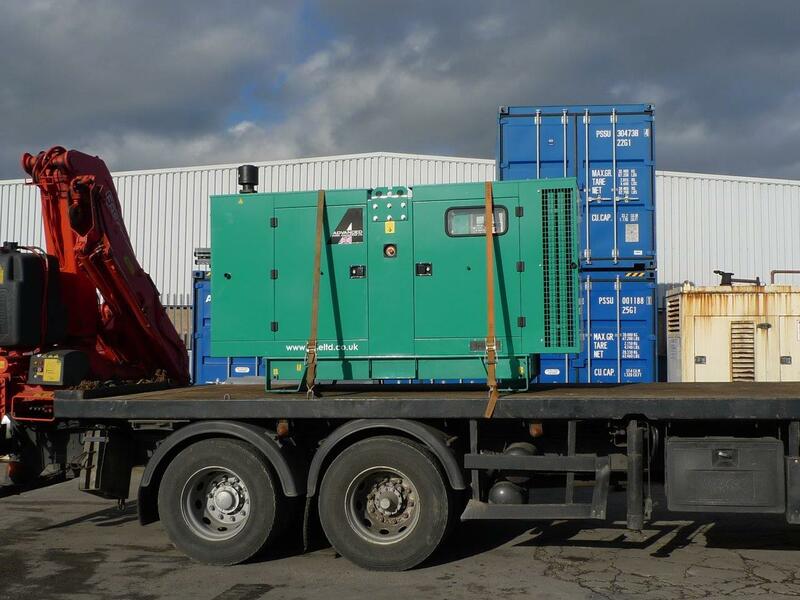 This 550 kVA Cummins diesel generator was brought back to our works after many years on site for a full paint refurbishment and colour change. 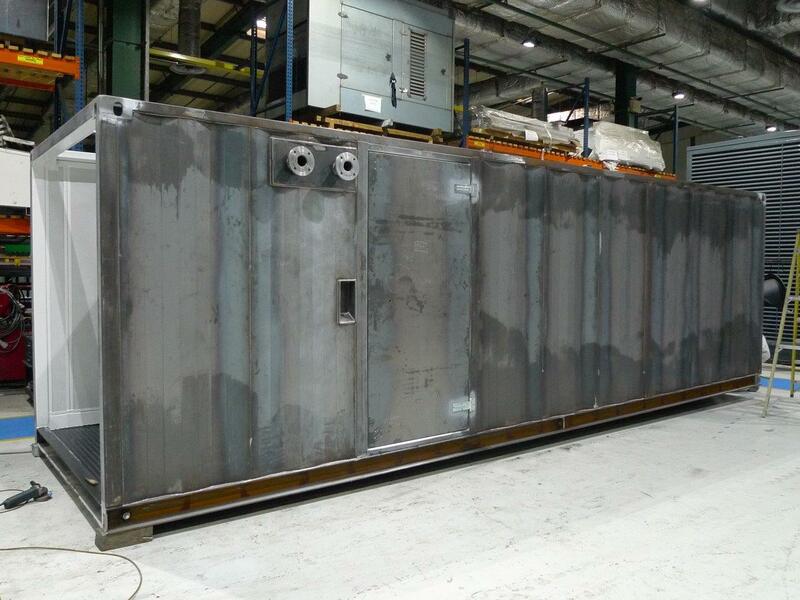 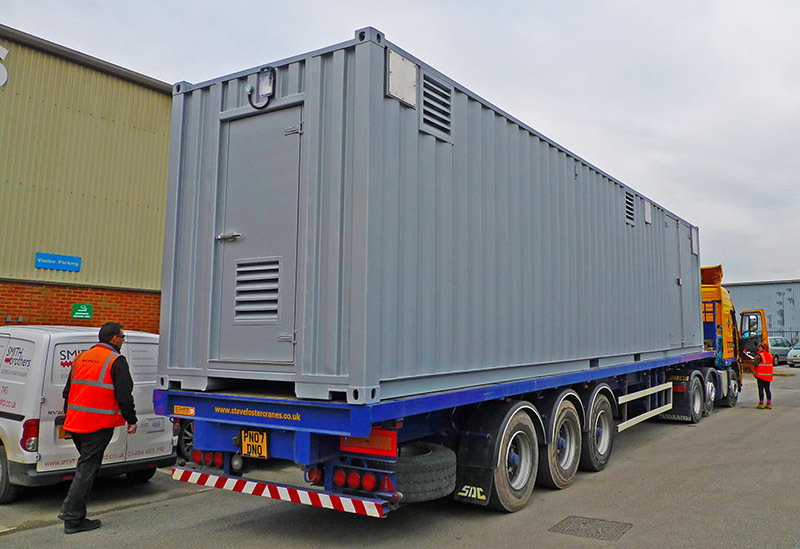 This 30ft 75dBA @ 1 metre enclosure was designed & built at ADVANCED for one of our many UK generator partners, this unit will house a 550kVA Perkins unit and incorporate a 5000 Litre double skinned bulk fuel tank. 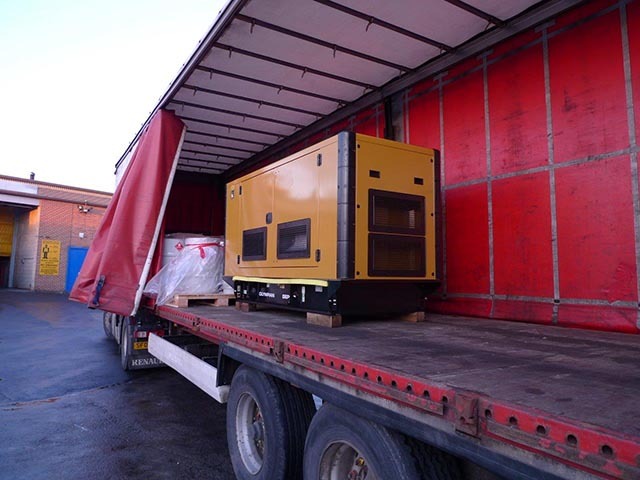 A further 5 units dispatched today. 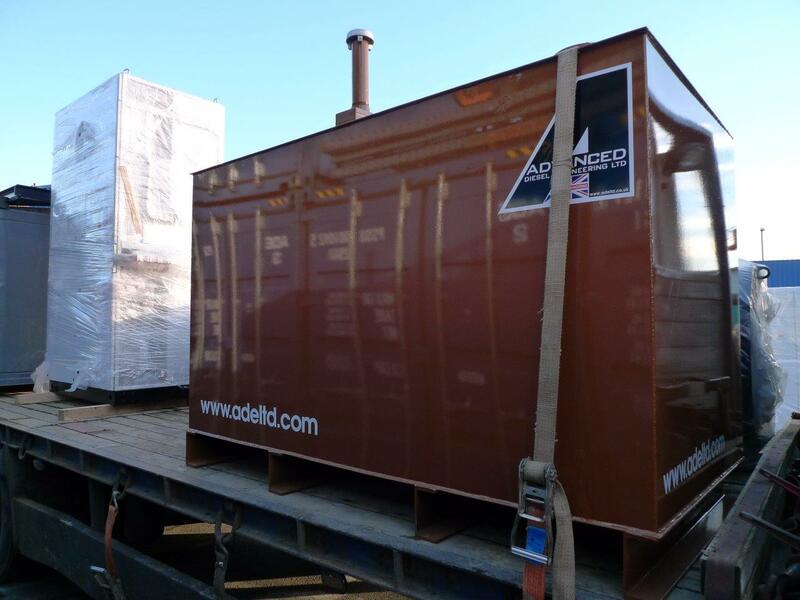 These two ADVANCED designed & built 11,000 Litre double skinned bulk fuel tanks are now on site in Sunderland feeding a matching pair of existing generators. 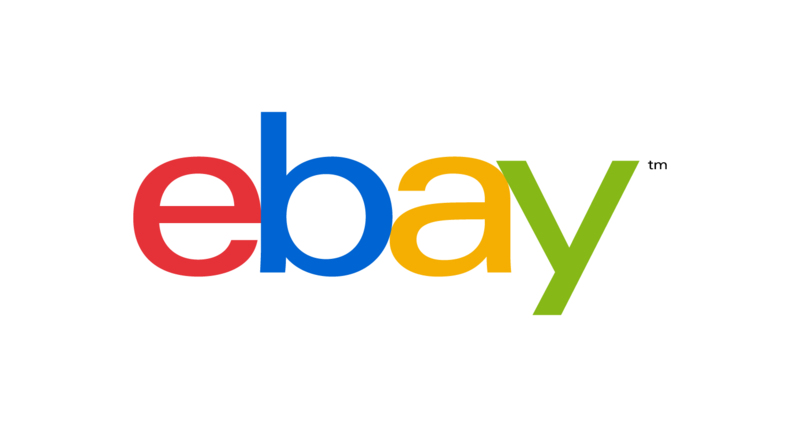 Even the ebay sales are starting to take off now. 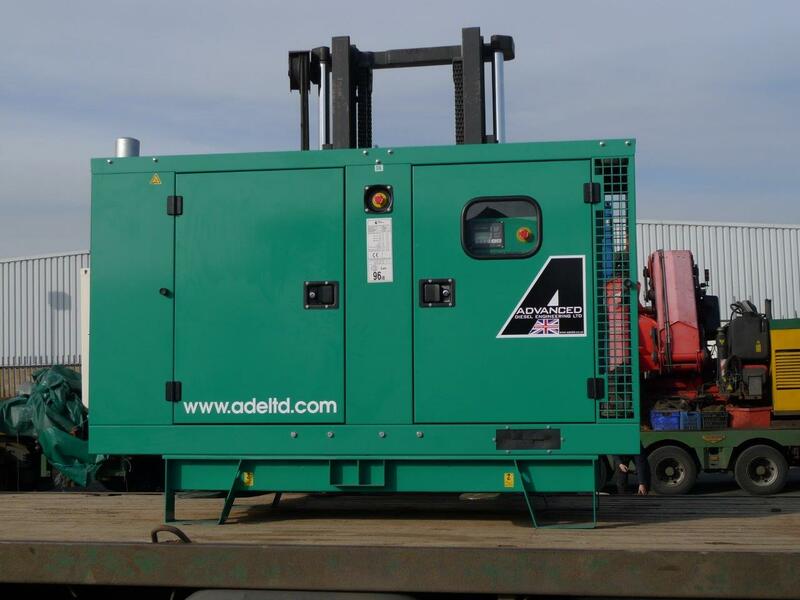 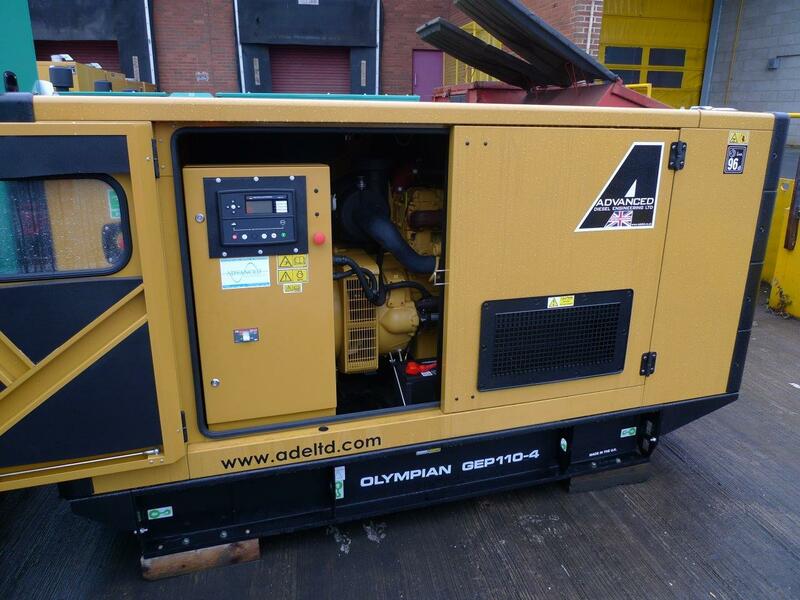 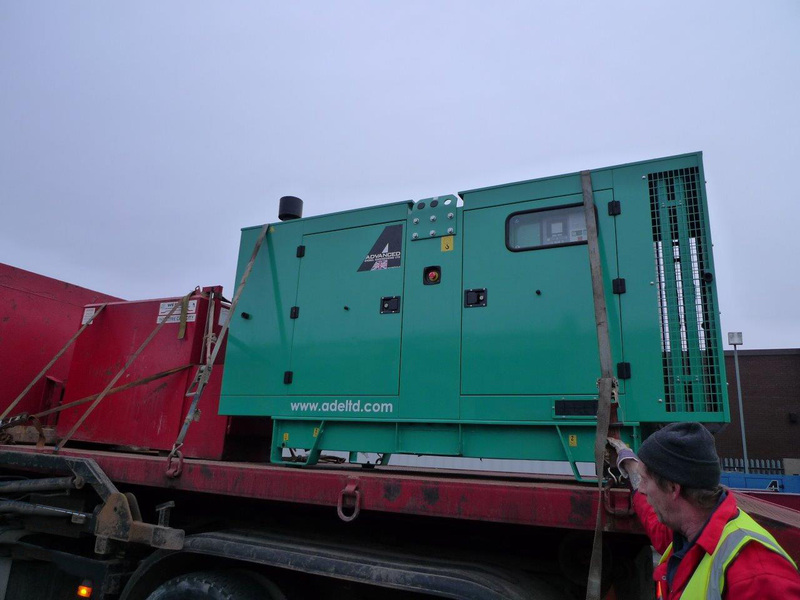 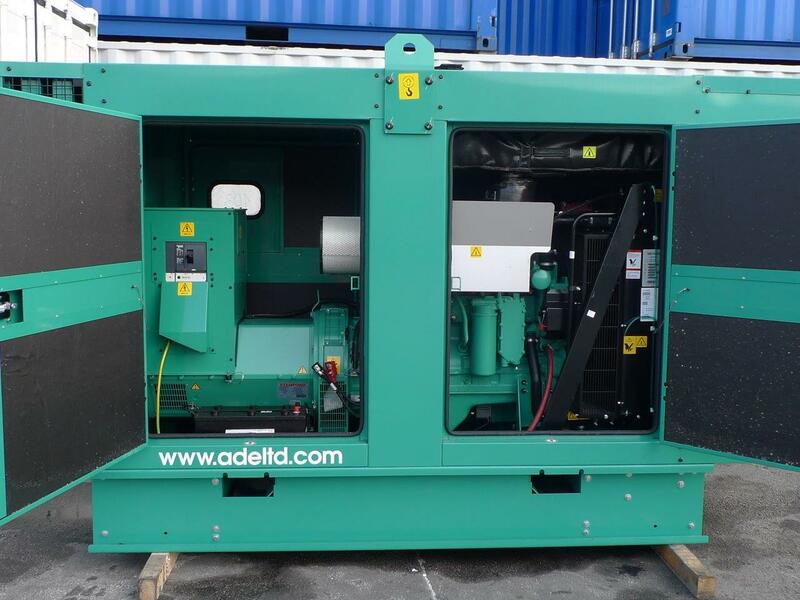 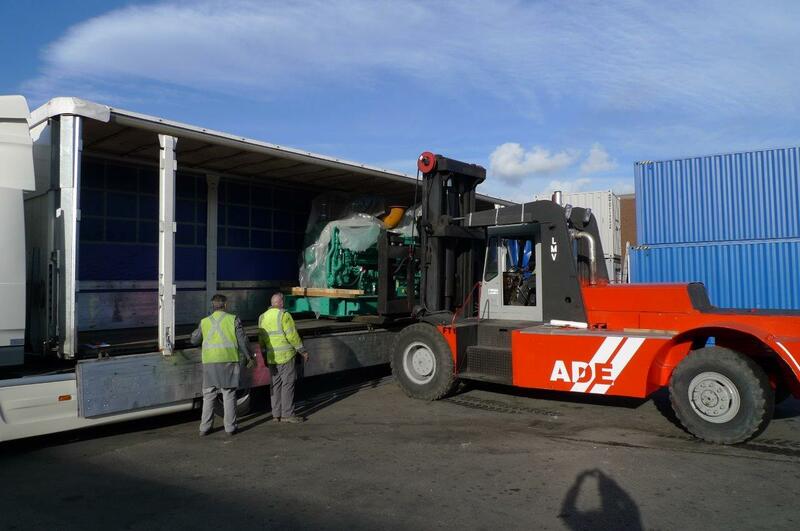 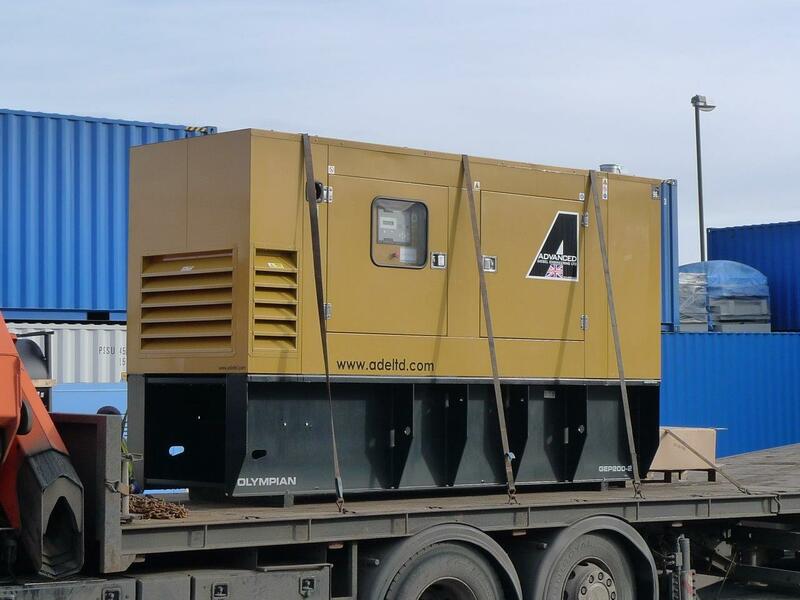 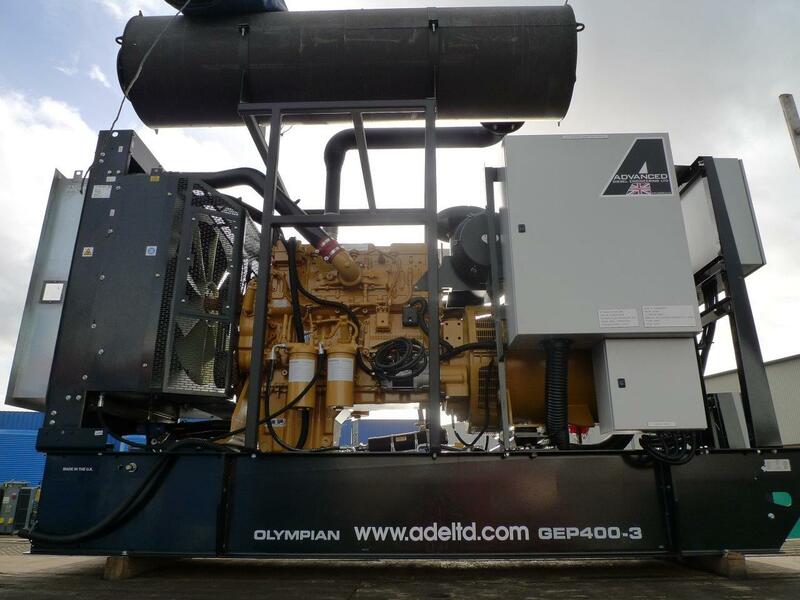 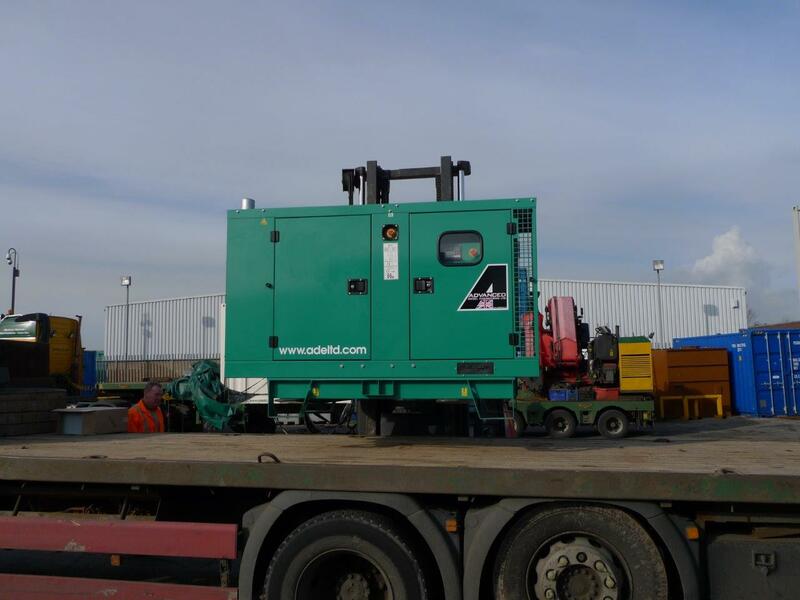 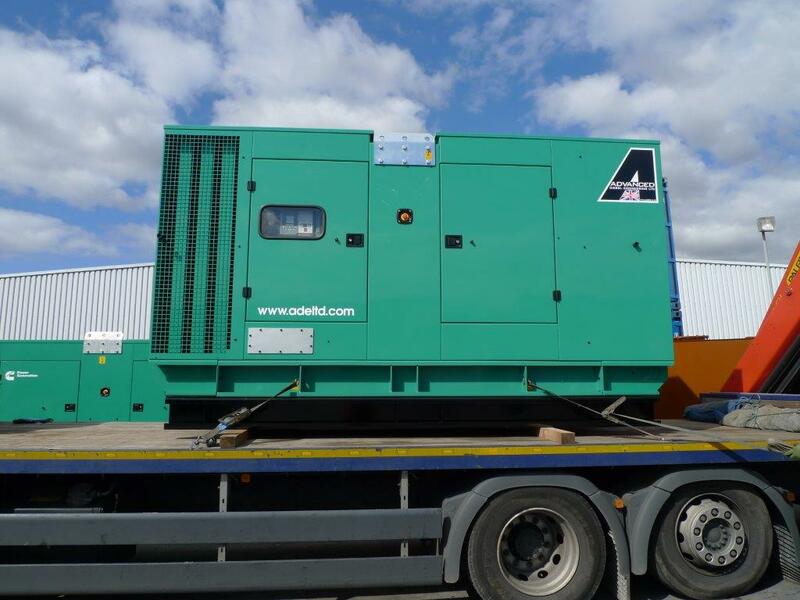 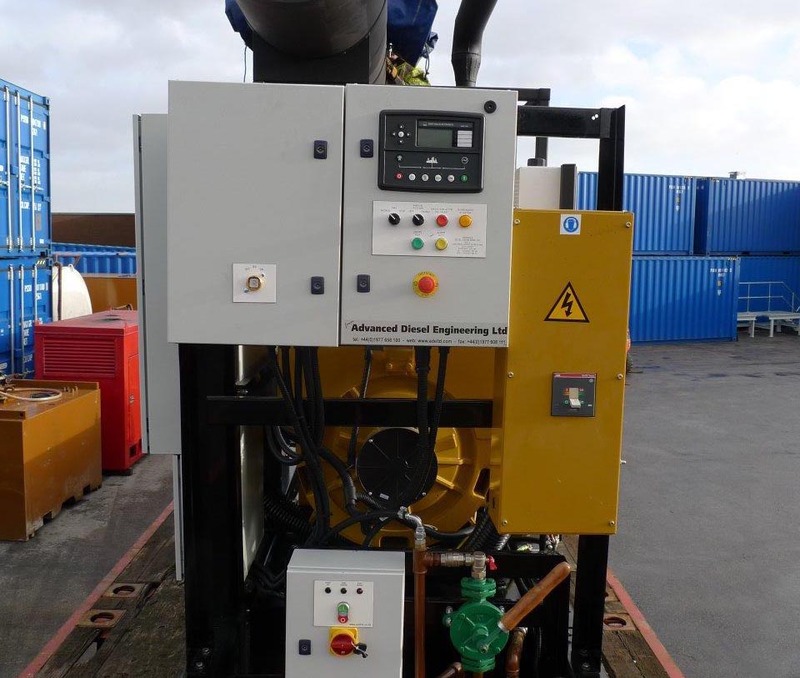 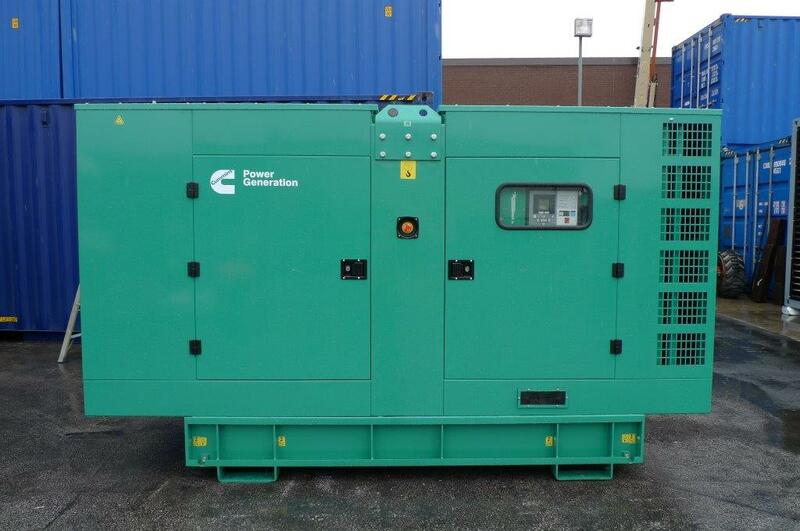 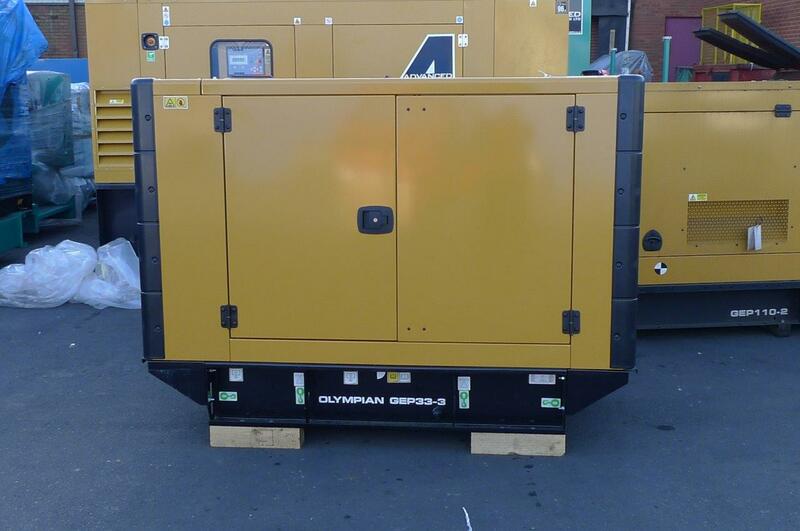 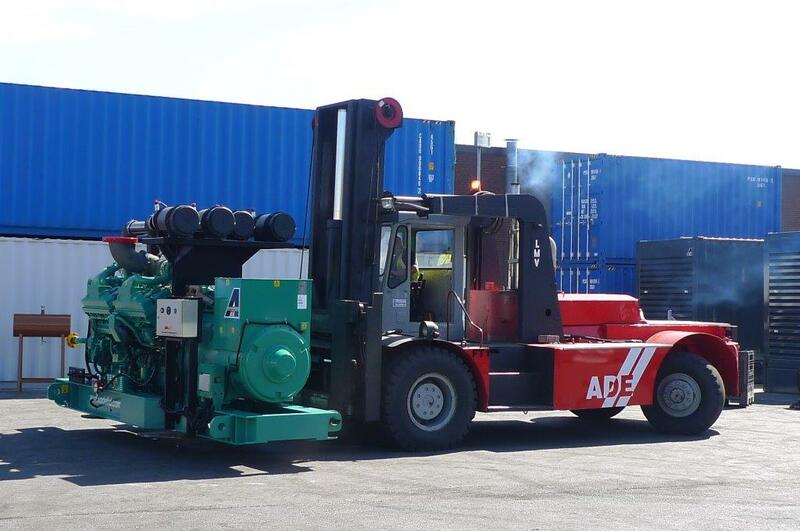 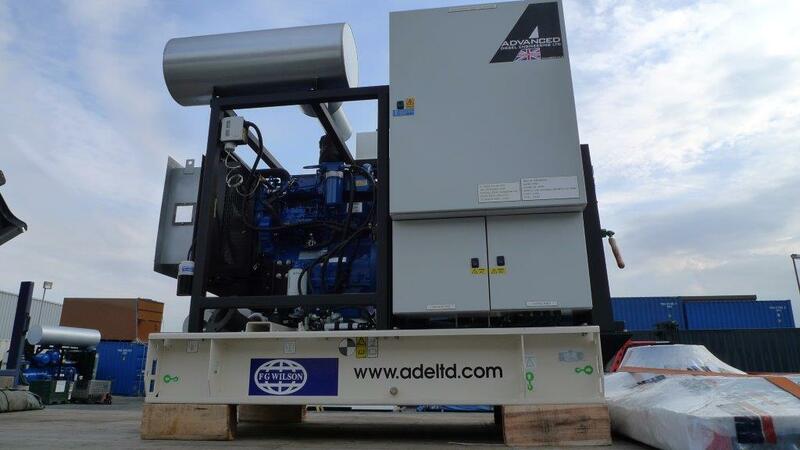 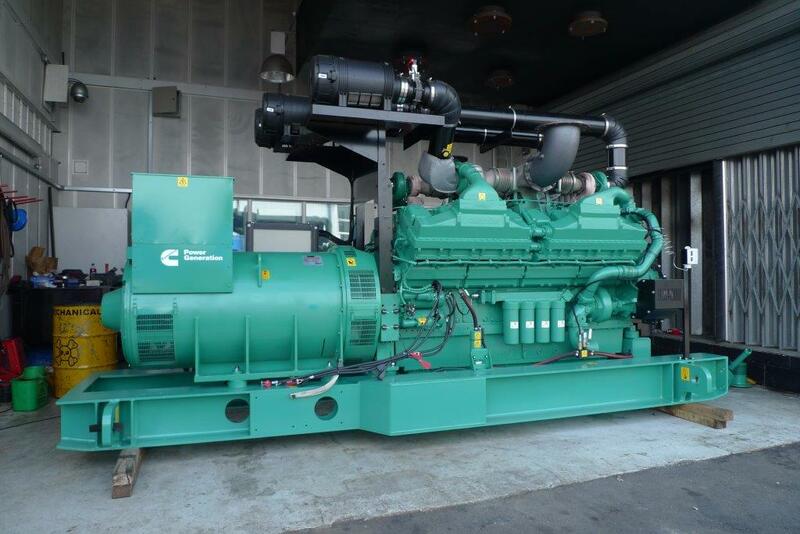 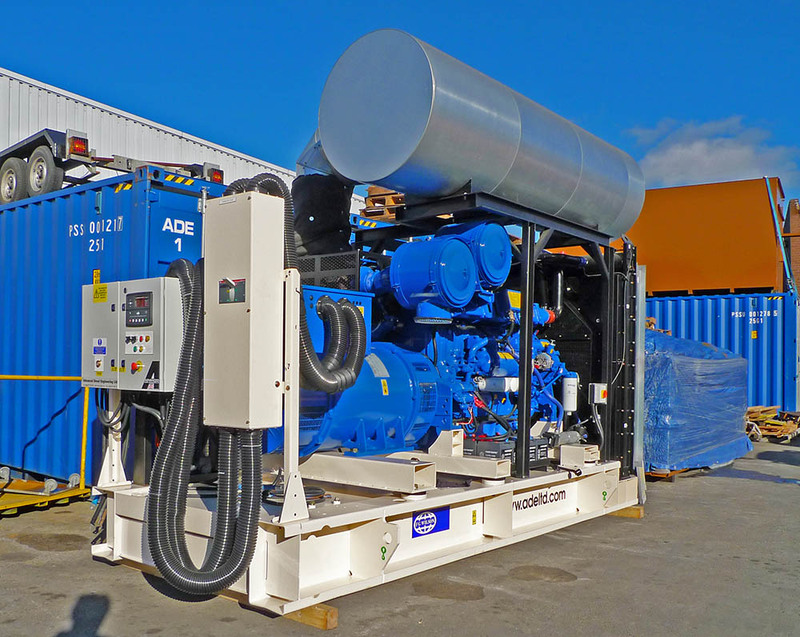 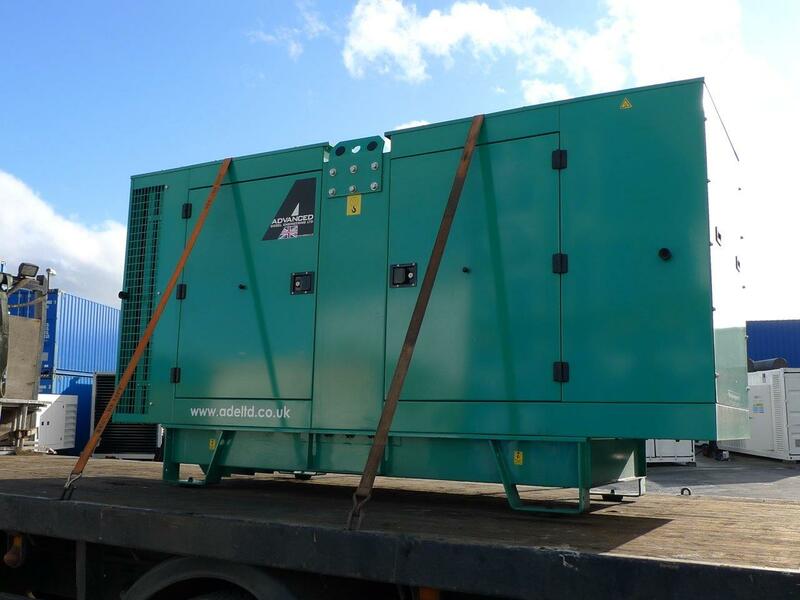 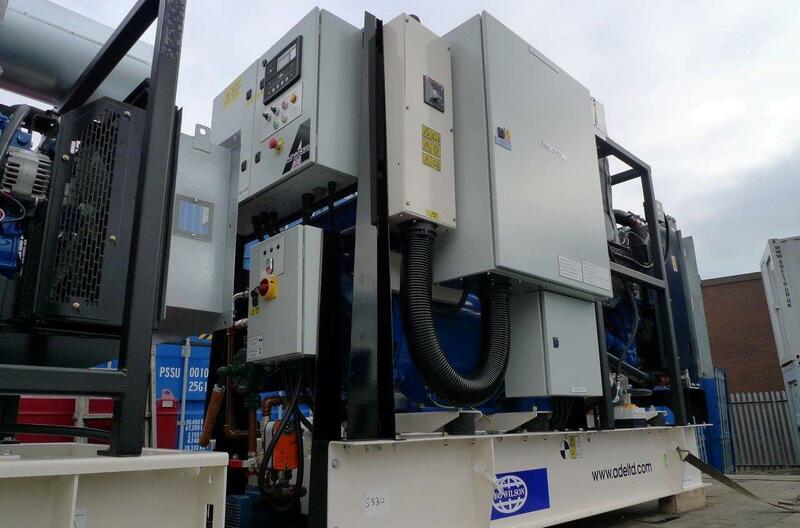 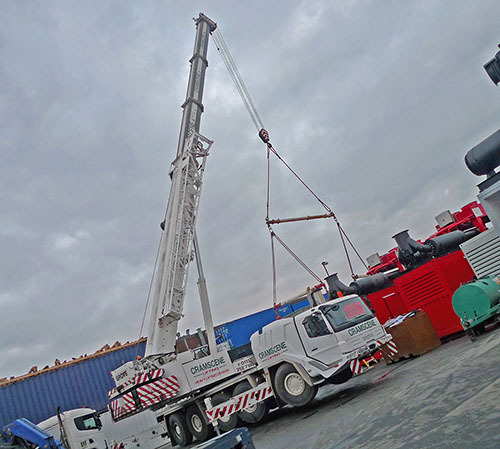 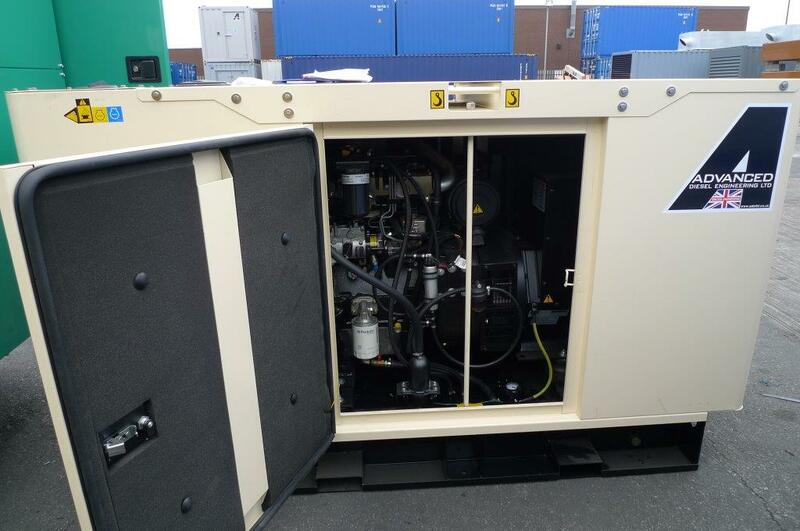 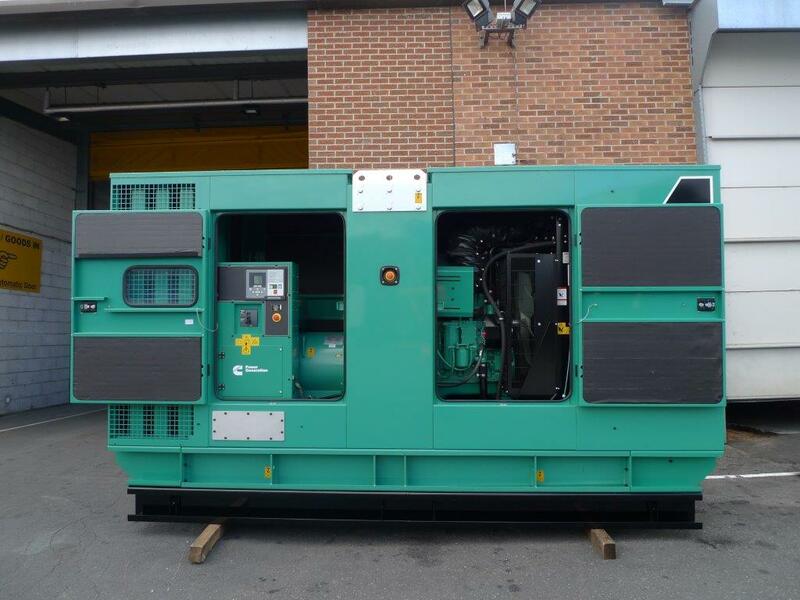 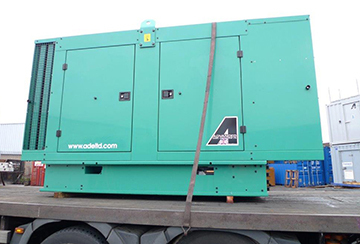 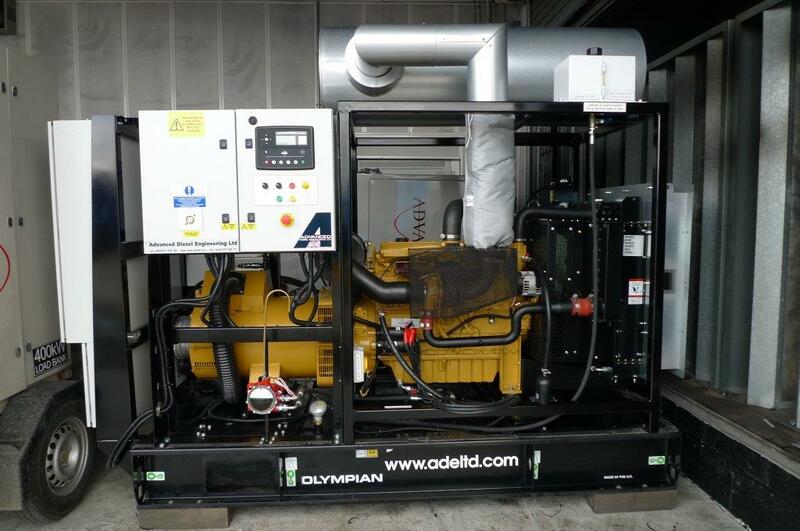 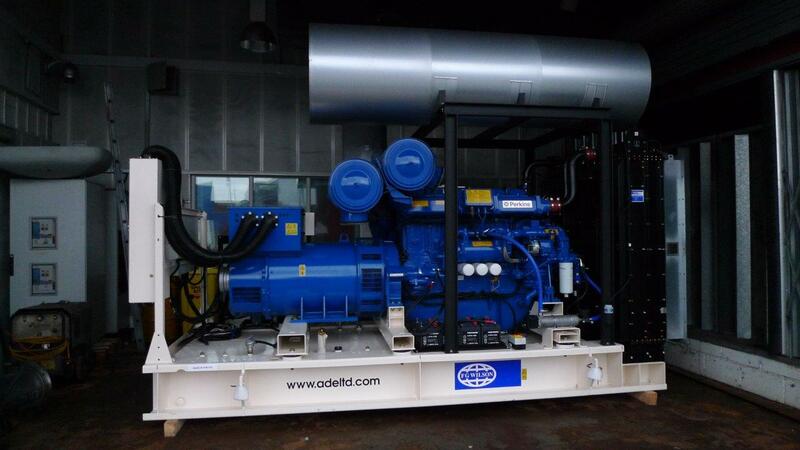 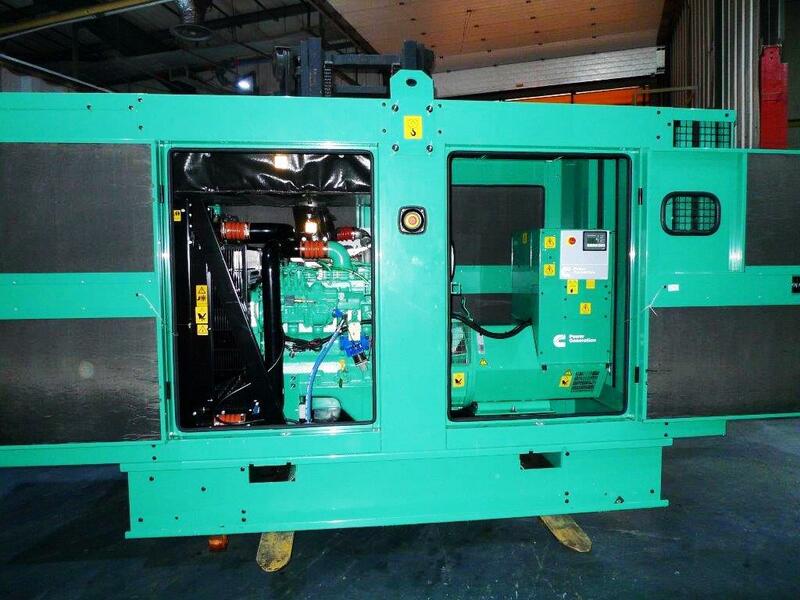 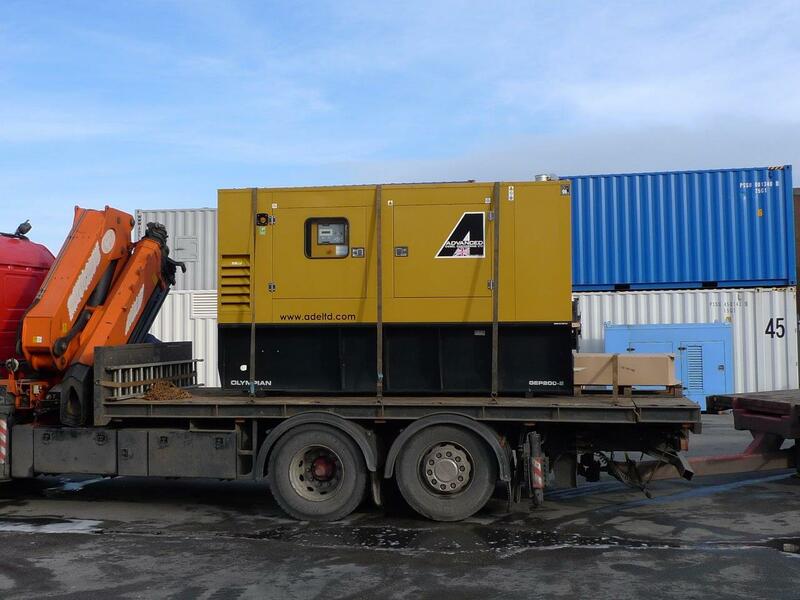 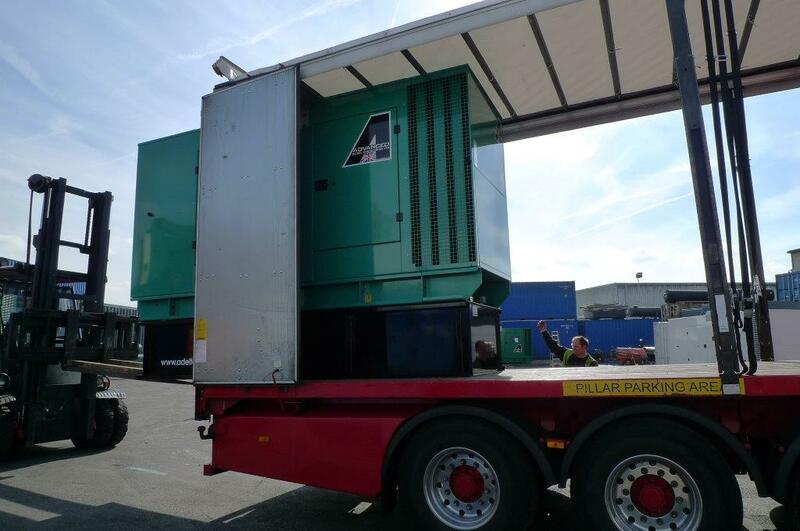 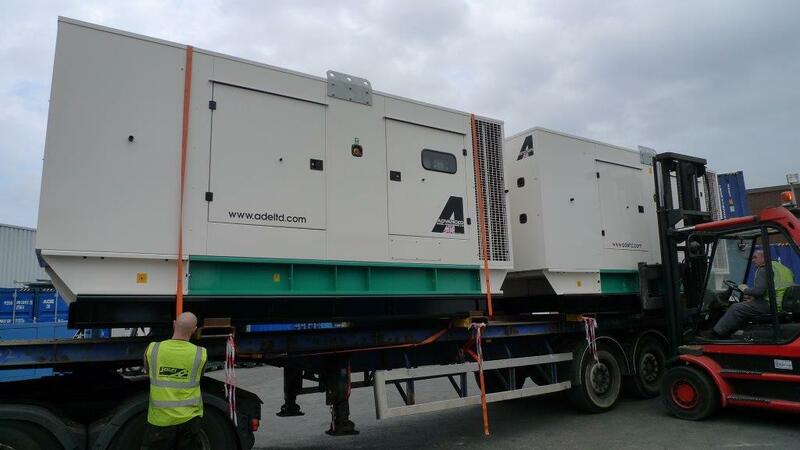 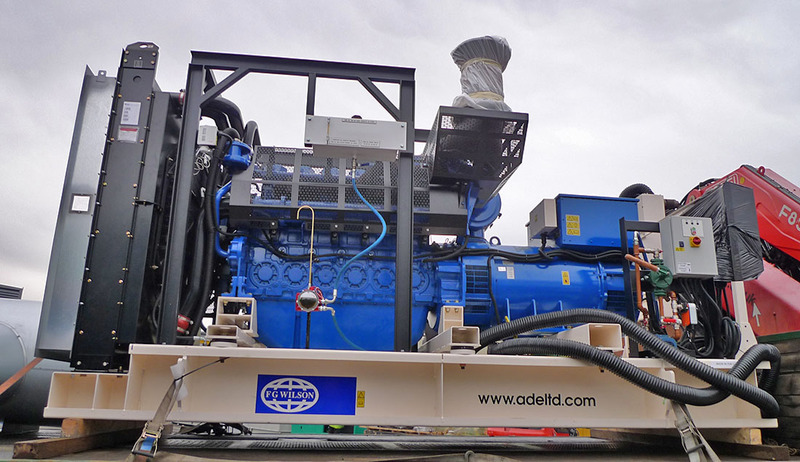 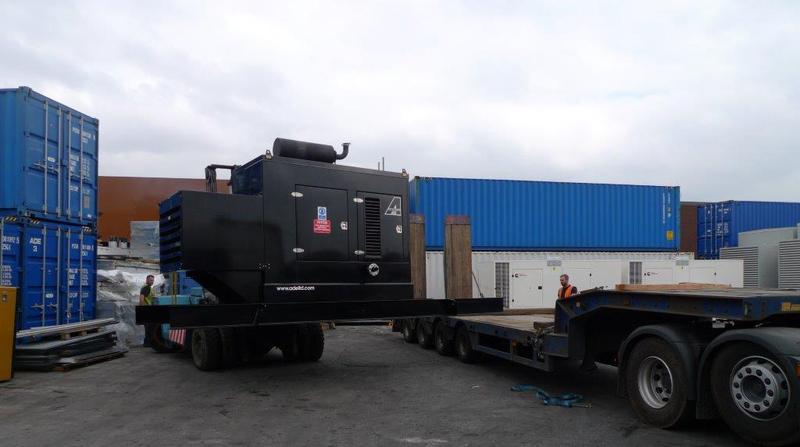 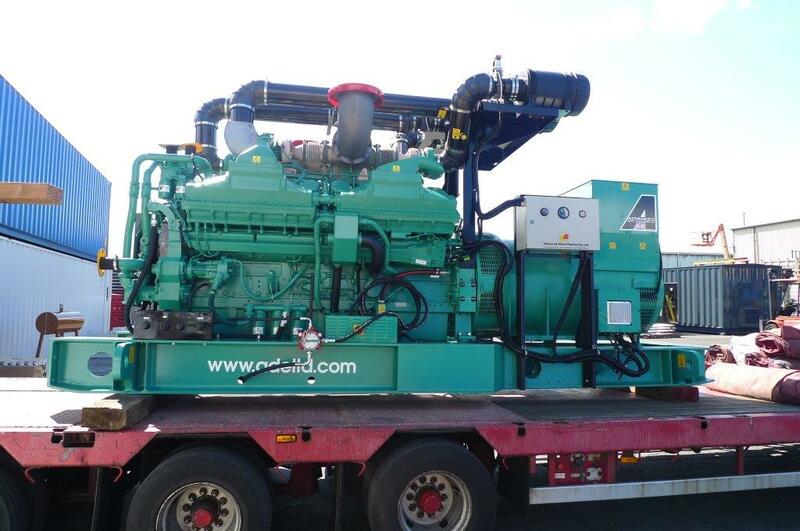 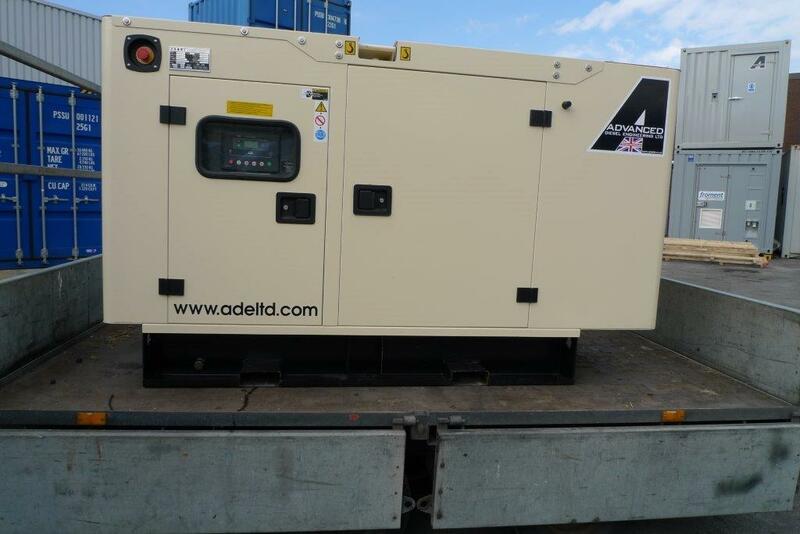 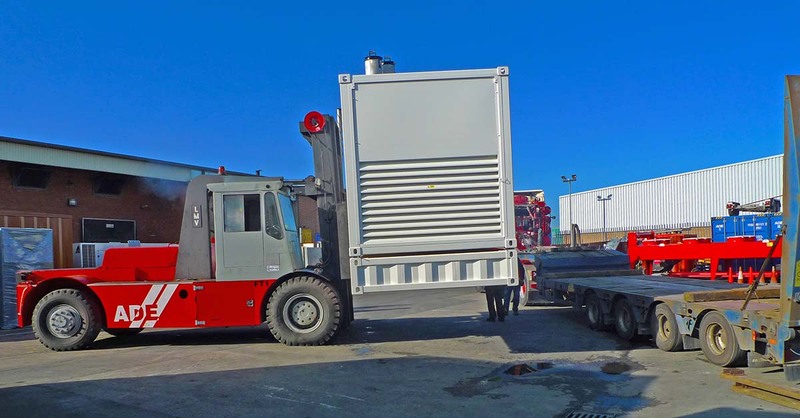 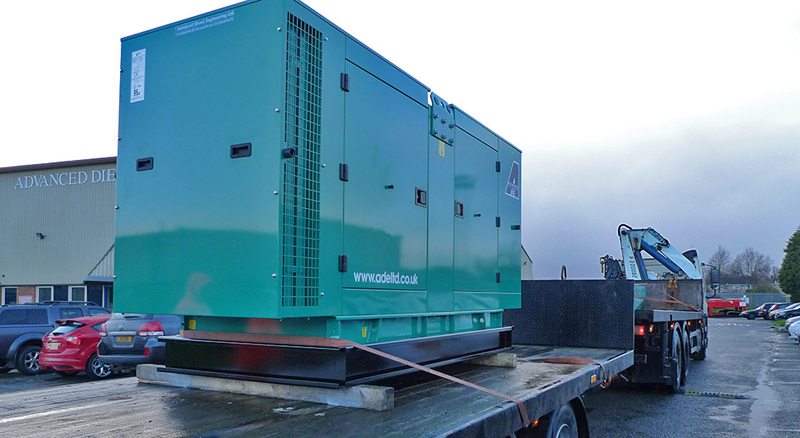 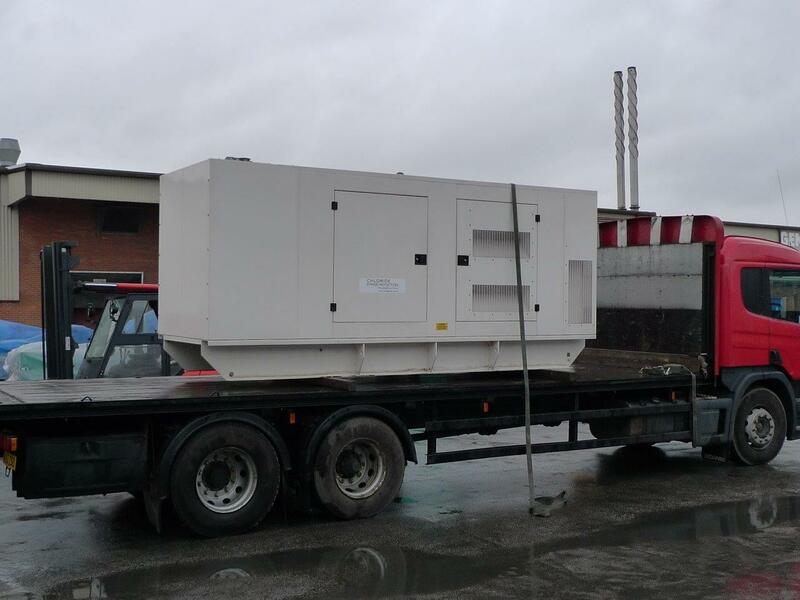 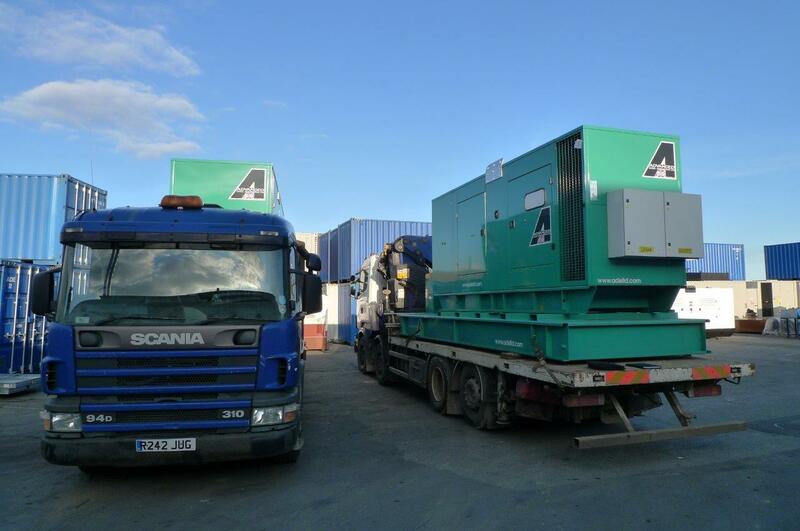 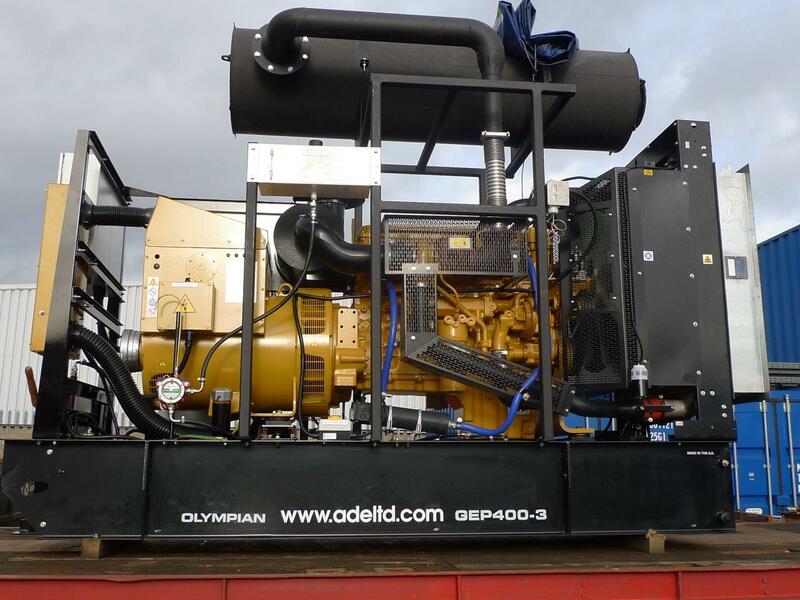 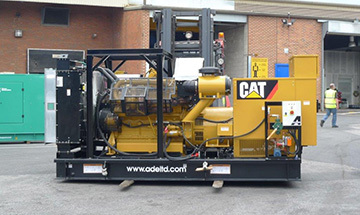 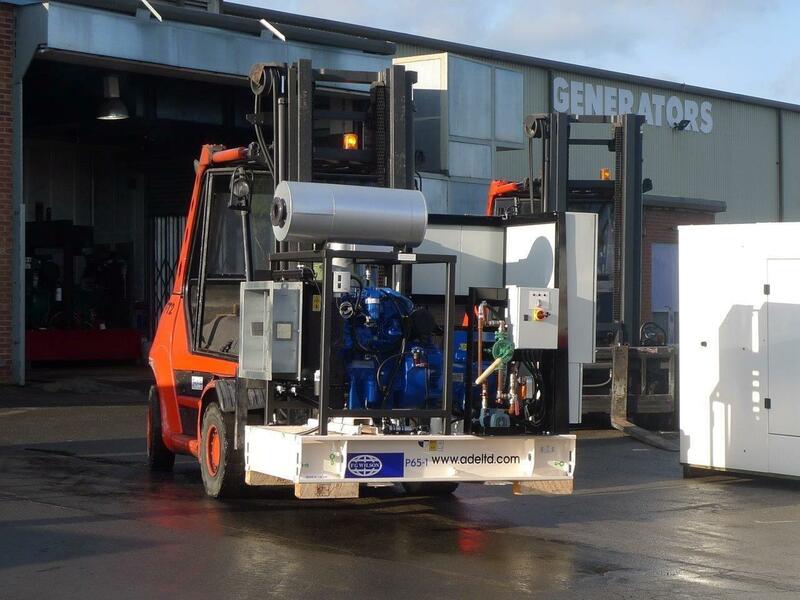 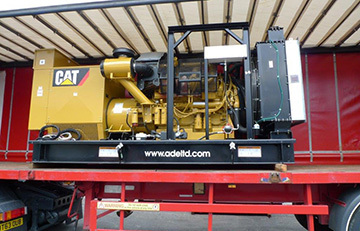 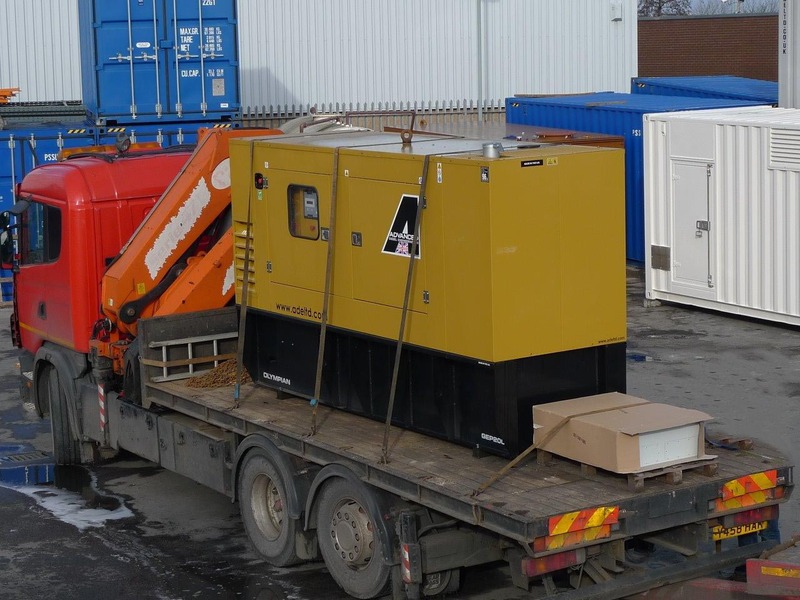 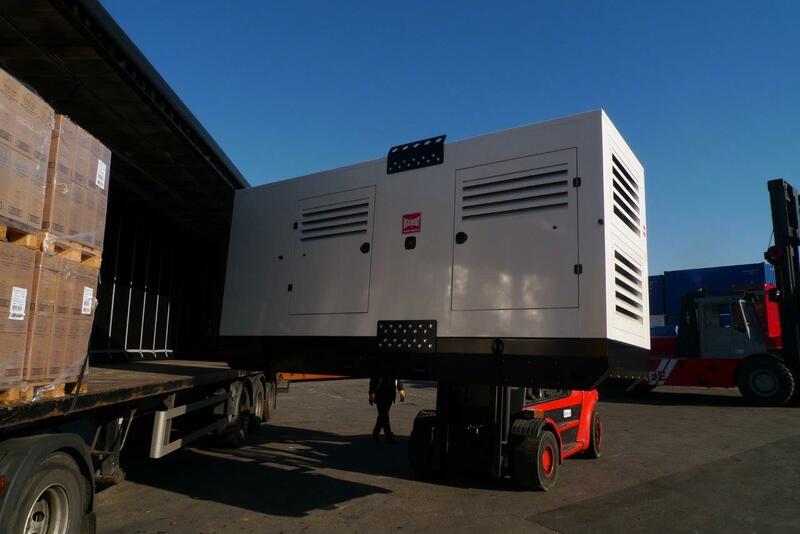 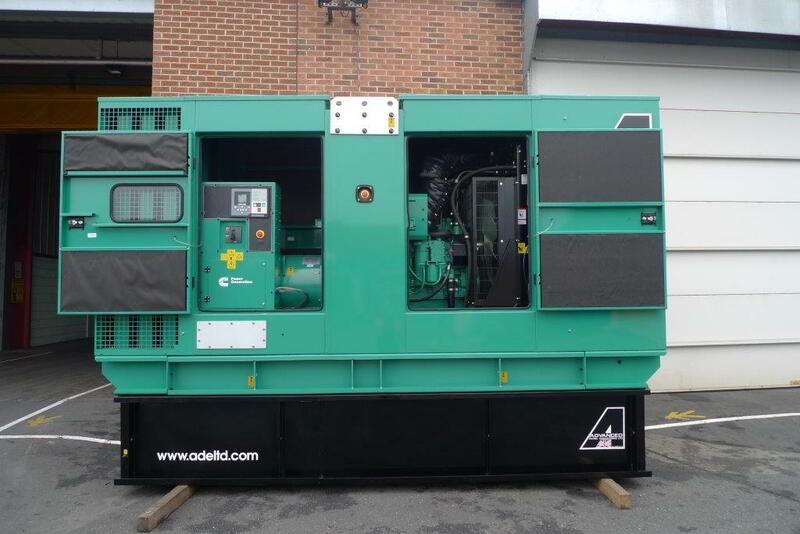 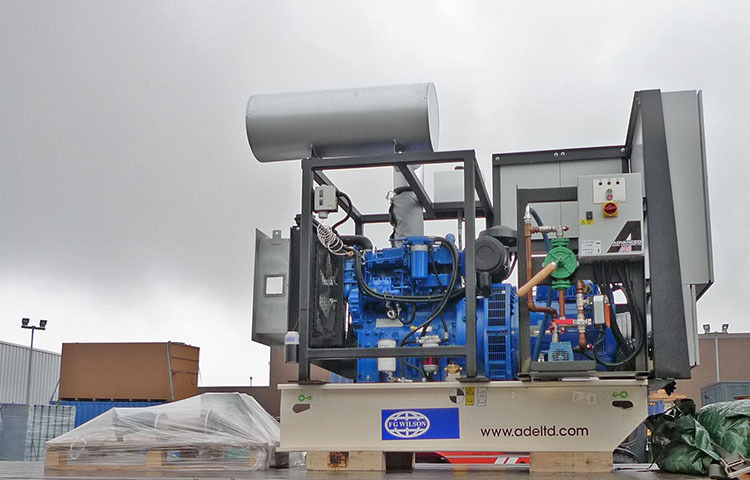 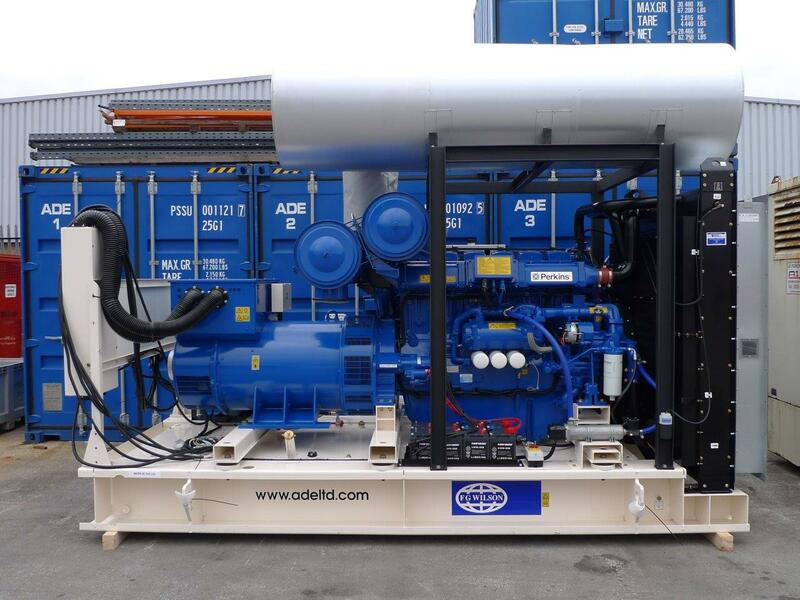 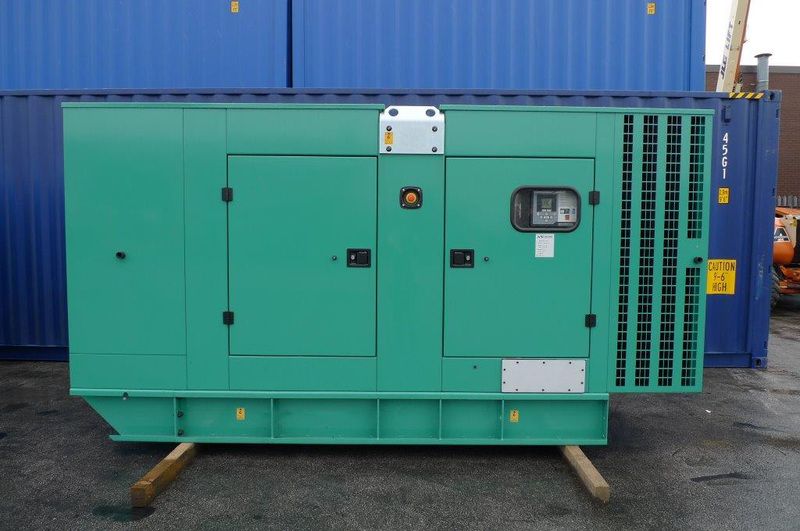 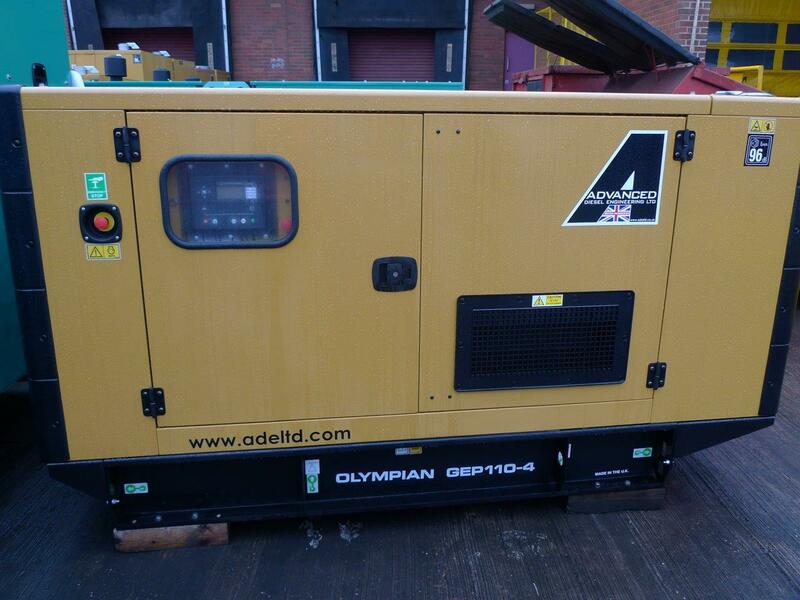 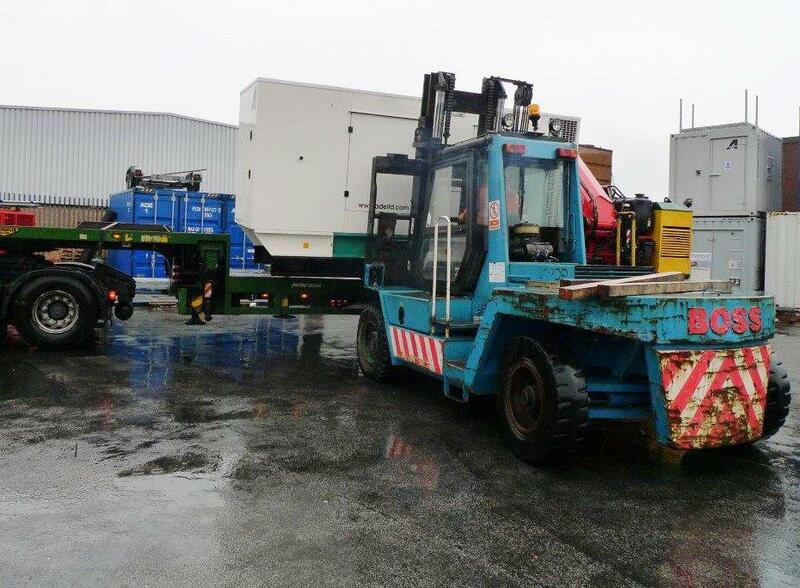 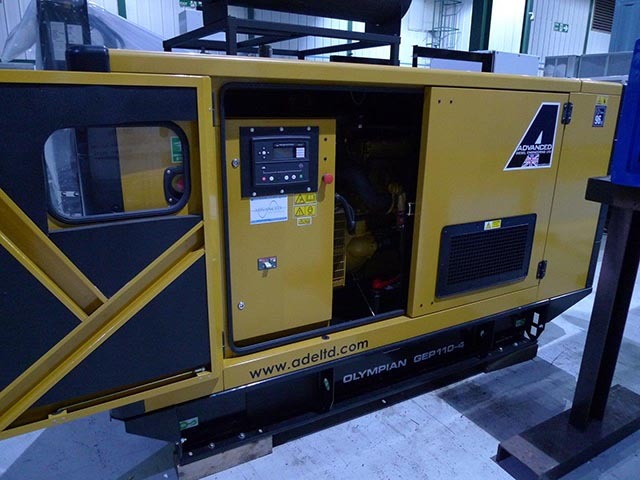 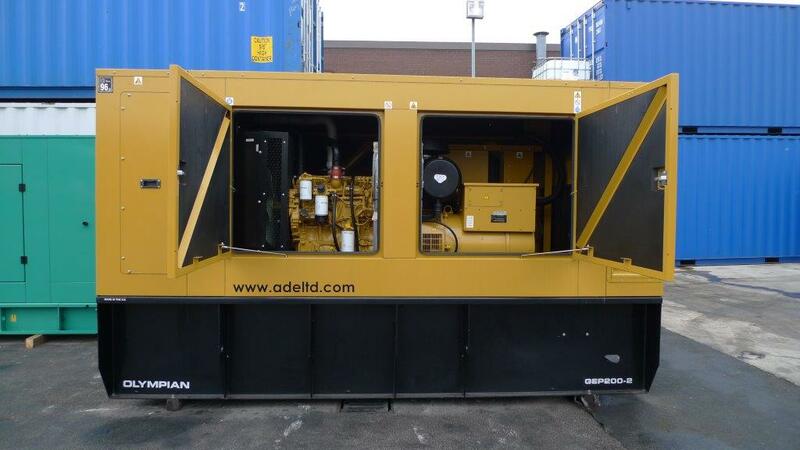 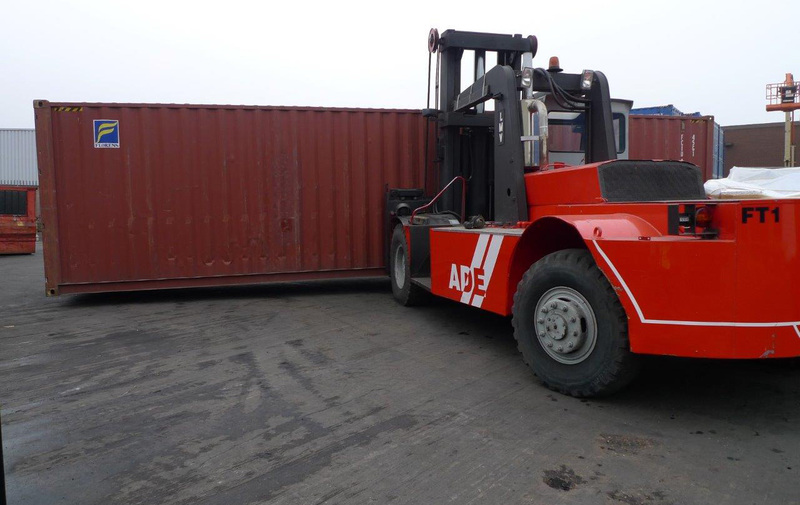 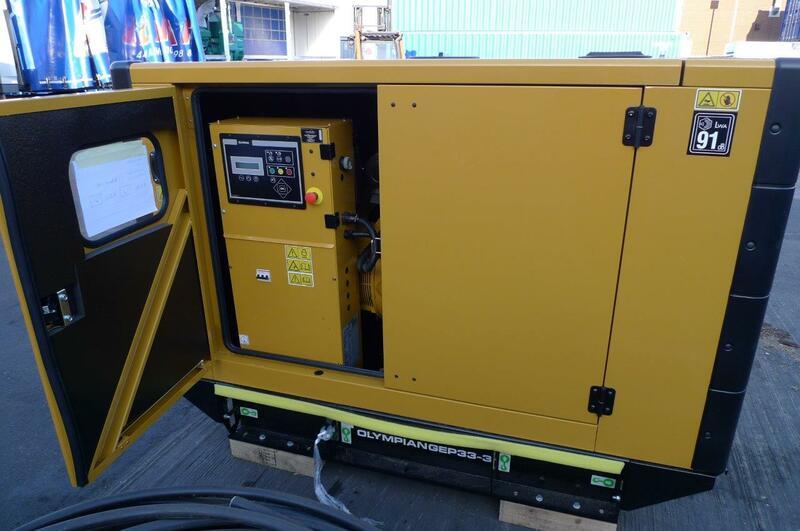 This week the sale of a GEP50 – 50 kVA Olympian silent diesel generator sold to a mobile crane operator. 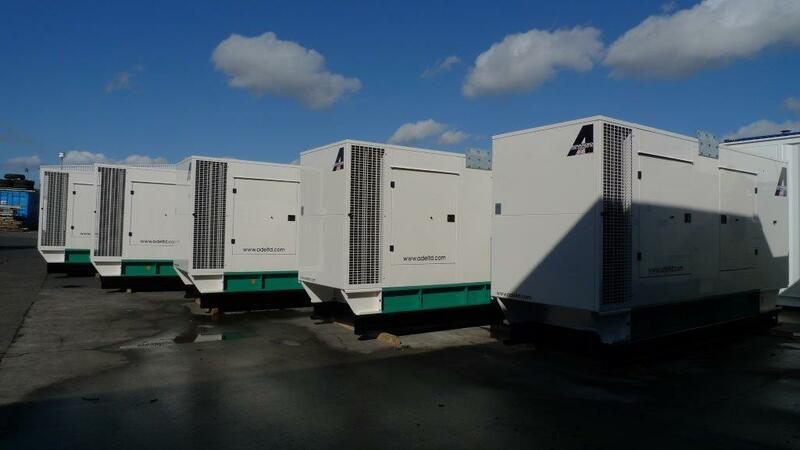 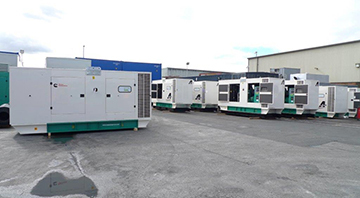 This matching pair of 500kVA Cummins diesel generators were repainted at our works from Cummins Green to Grey, to match the surrounding buildings and existing plant already on site at a UK Data Centre. 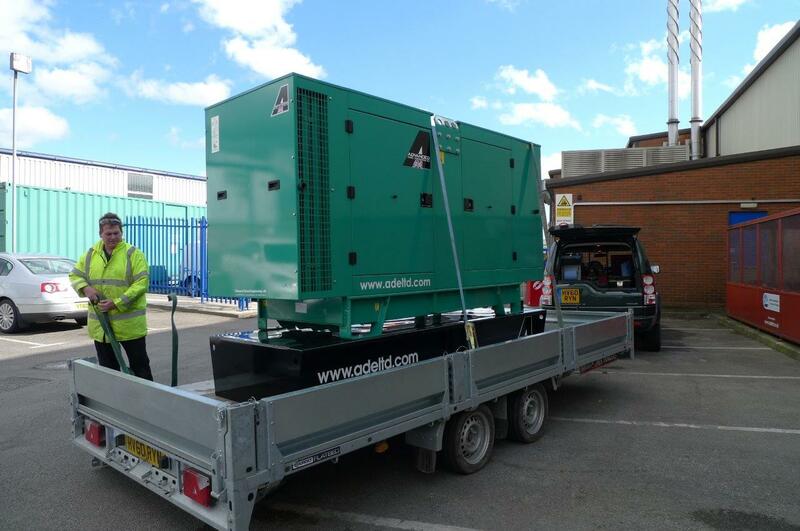 to ADVANCED from a client that we have been working with for a good few years.The generator panels were upgraded by ADVANCED to the Comap Intel-vision 5 and fully tested at our works. 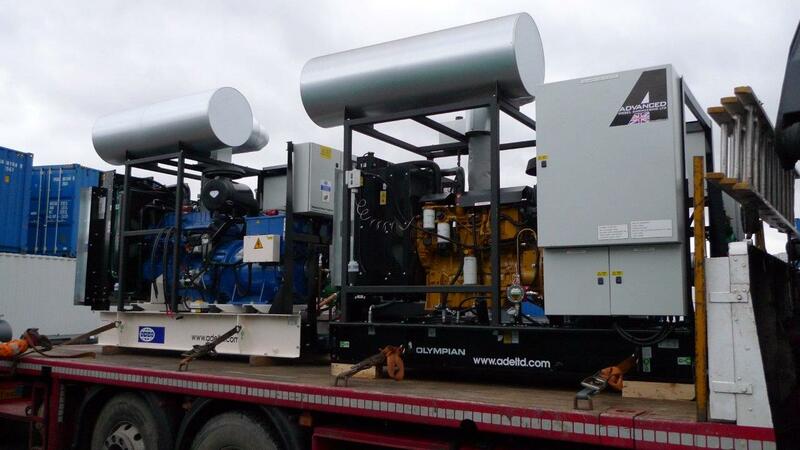 Shown here are the first six Cummins generators to leave our works. 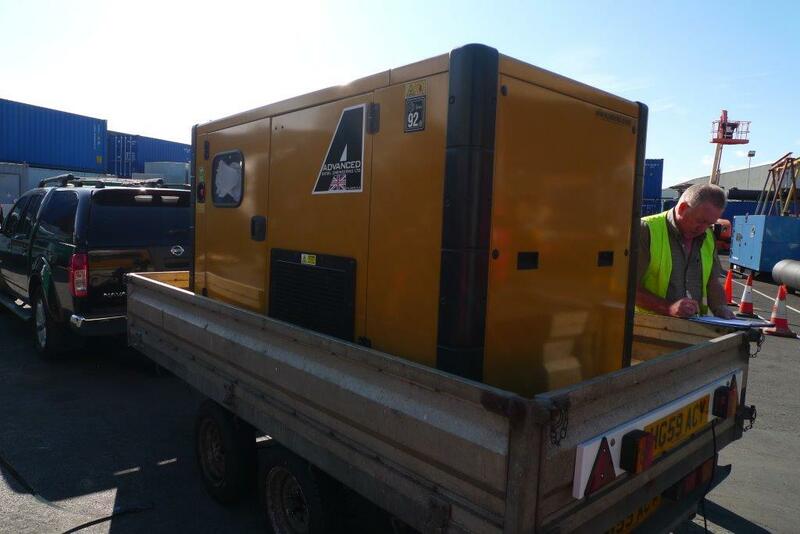 This Cummins 330kVA silent diesel generator had a bund modification upfitted at ADVANCED, and is now on its way to a site in Berkshire to be used as standby power. 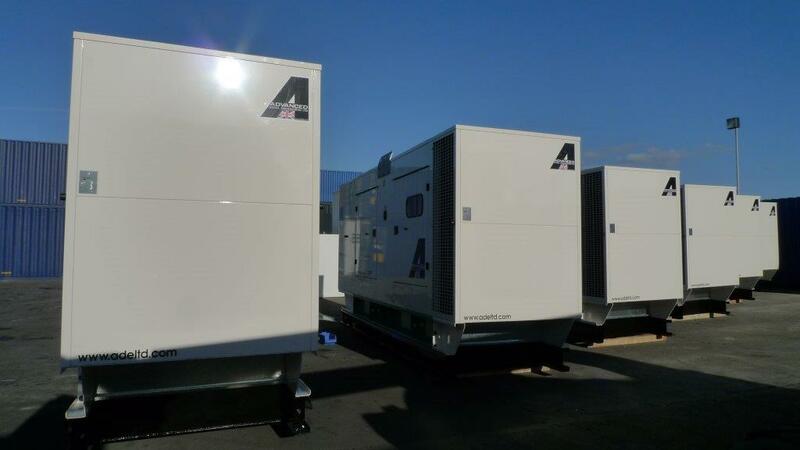 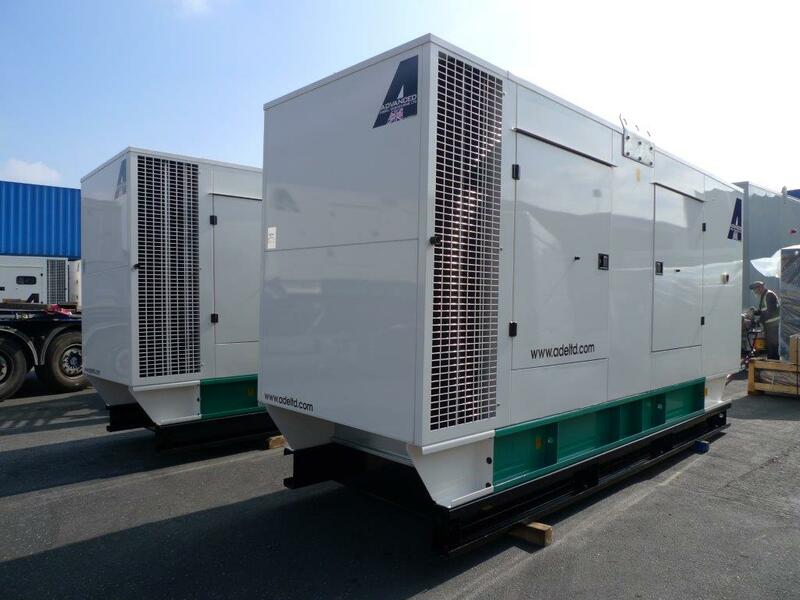 A repeat order from one of our prestigious clients, these three Cummins 900kVA fully synchronised diesel generators packaged at ADVANCED into 75dBA @ 1 metre containers, mounted on 72 hour bulk fuel tanks. 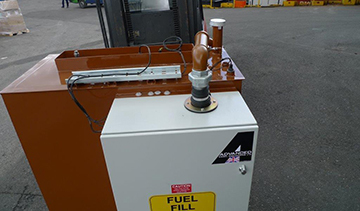 The tanks also incorporated automatic fuel conditioning and polishing. 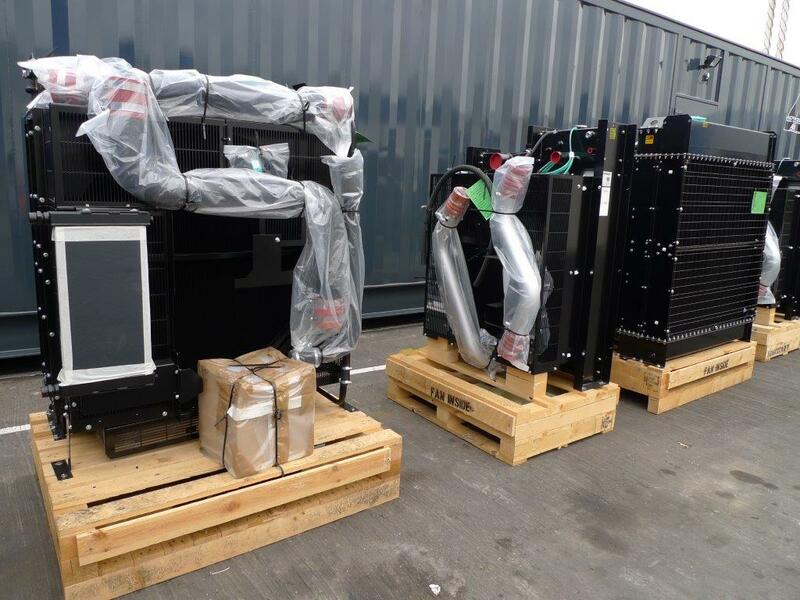 They are now being installed at a Data Centre in Iceland. 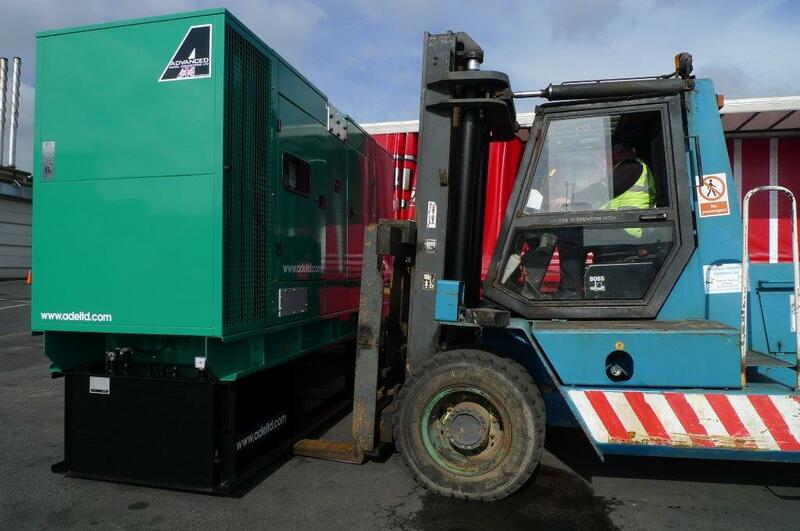 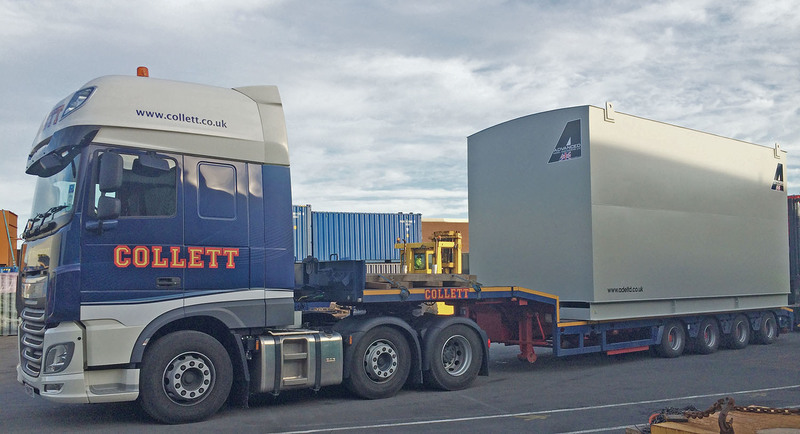 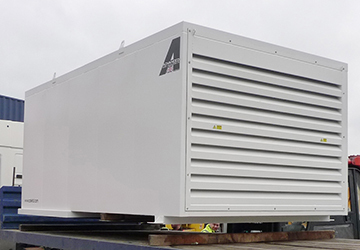 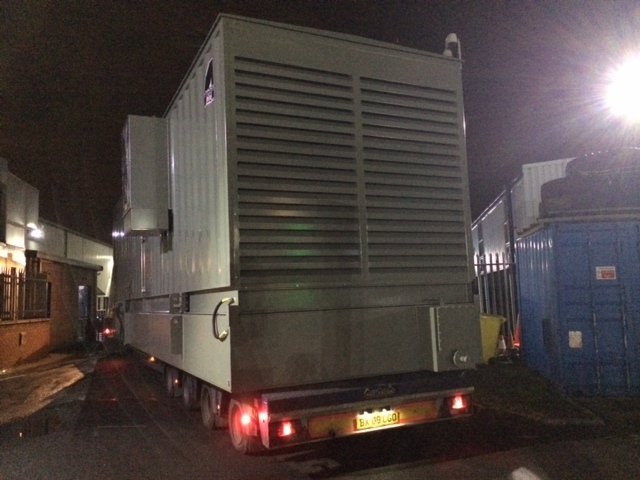 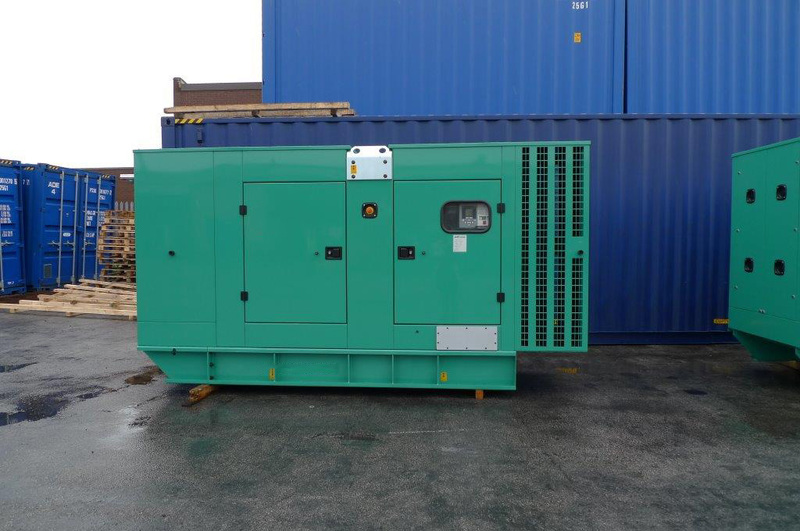 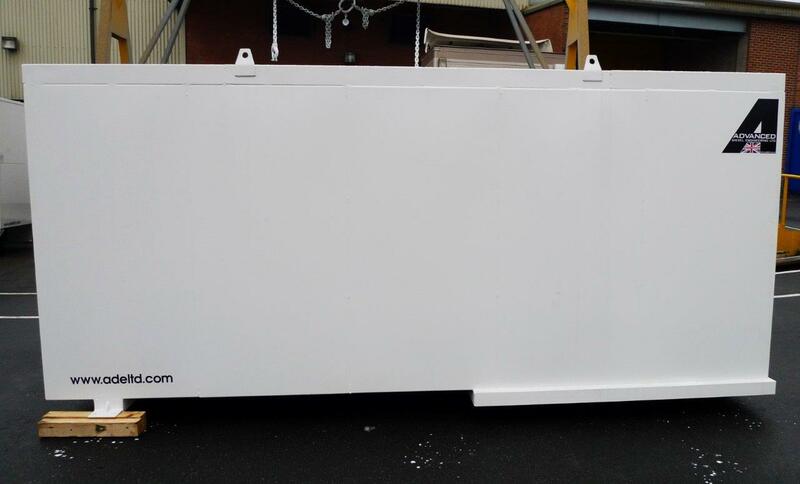 This Cummins 700 kVA diesel generator and 3500 litre fuel tank was packaged at ADVANCED into this 65dBA @ 1 metre container and is now providing backup power at Aintree Hospital. 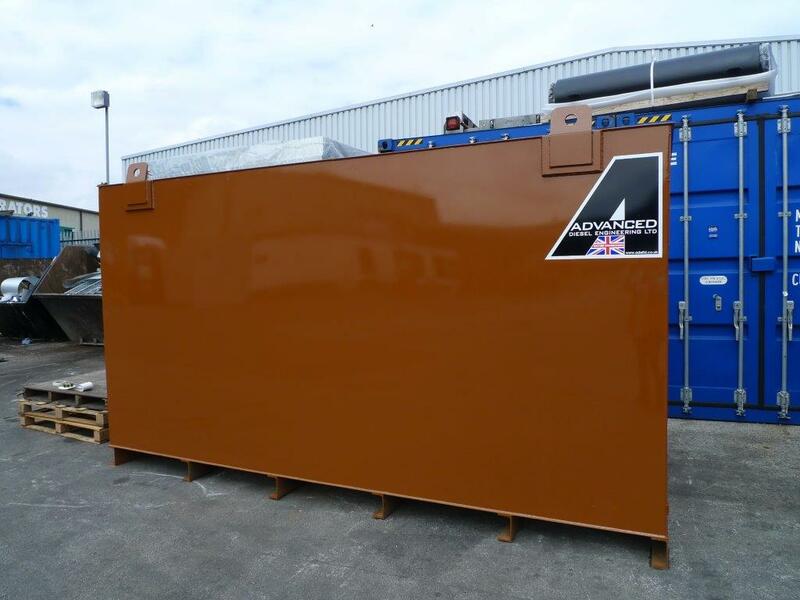 This 1400 Litre double skinned bulk fuel tank is on its way to Switzerland, built for one of our UK resellers. 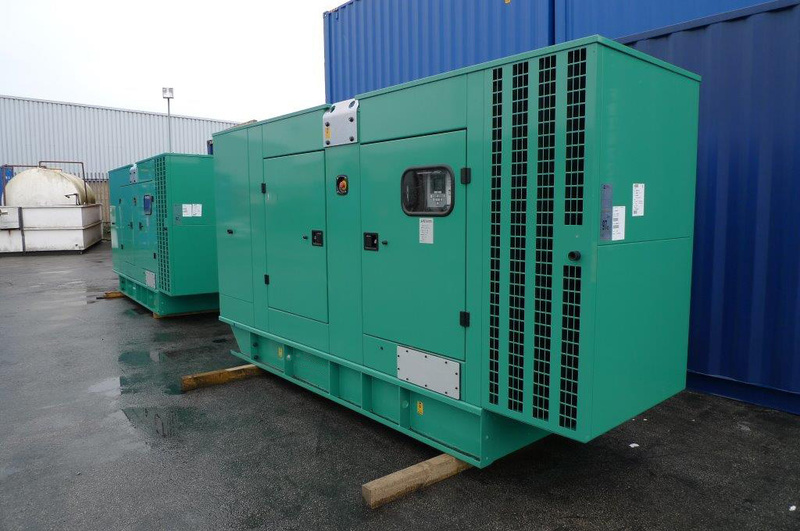 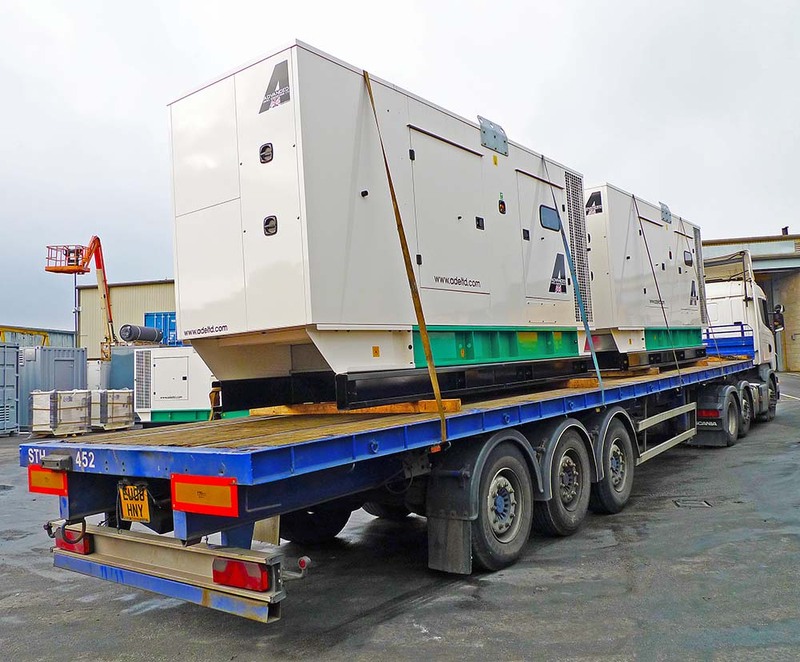 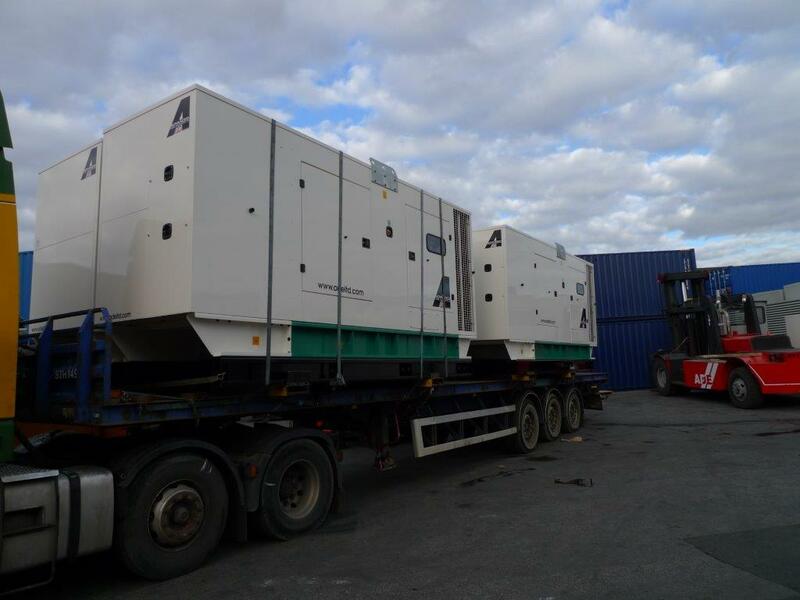 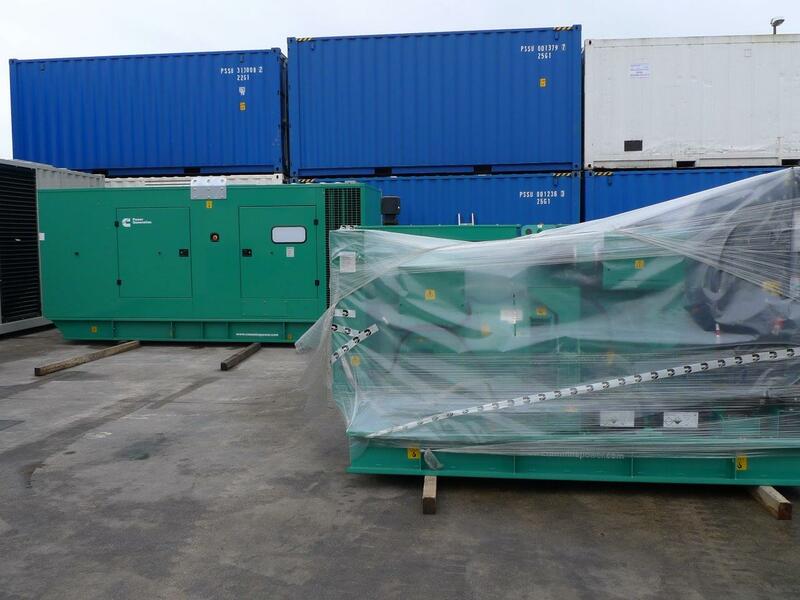 On the final day of our financial year, these ADVANCED designed & built matching pair of Perkins 2000kVA diesel generators in their 80dBA @ 1 metre enclosures were despatched to a southern budget retailer’s warehouse. 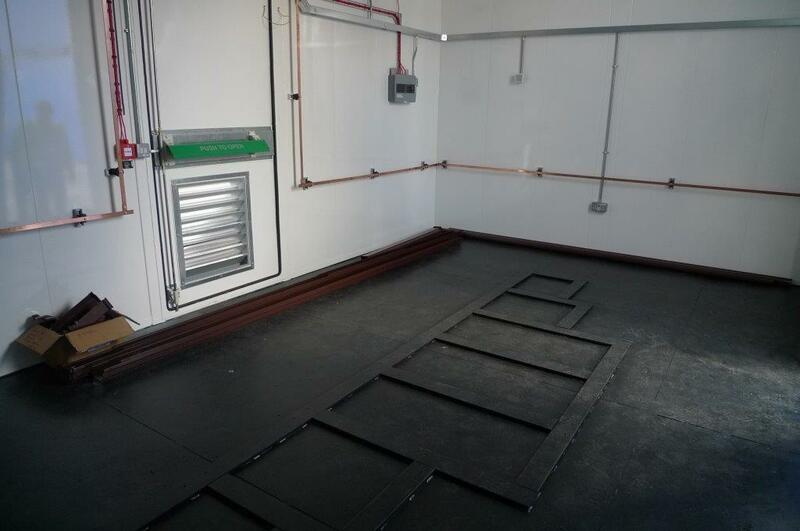 Making room on the test bays for the next project to be rolled out. 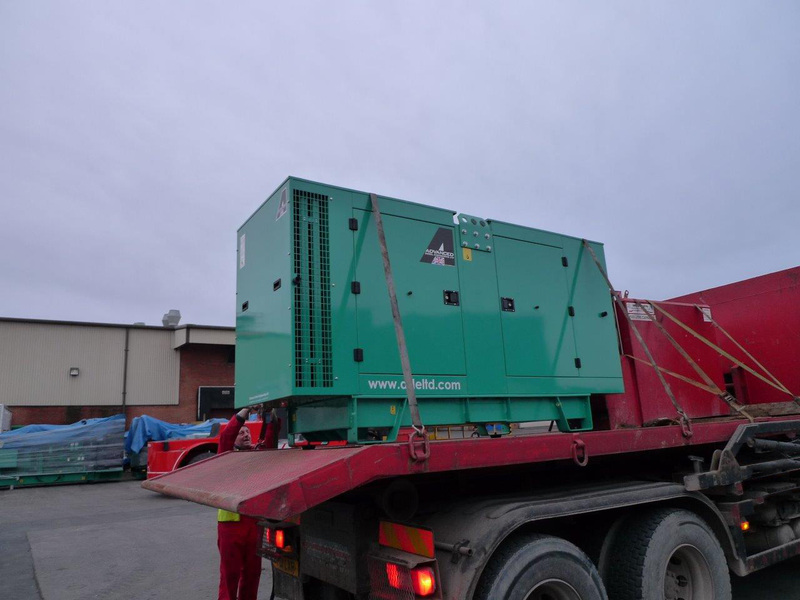 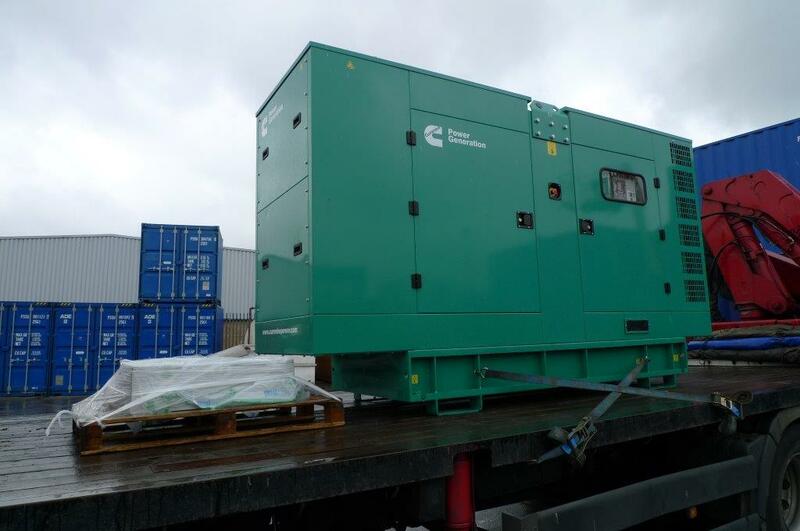 To Date the telecoms project has been taking various modified sized sets between 60 and 500kVA – This Cummins QSK60-G3 2250kVA diesel generator being loaded is bound for one of the UK,s ‘LARGER’ exchanges and will also serve as standby power should the mains fail. 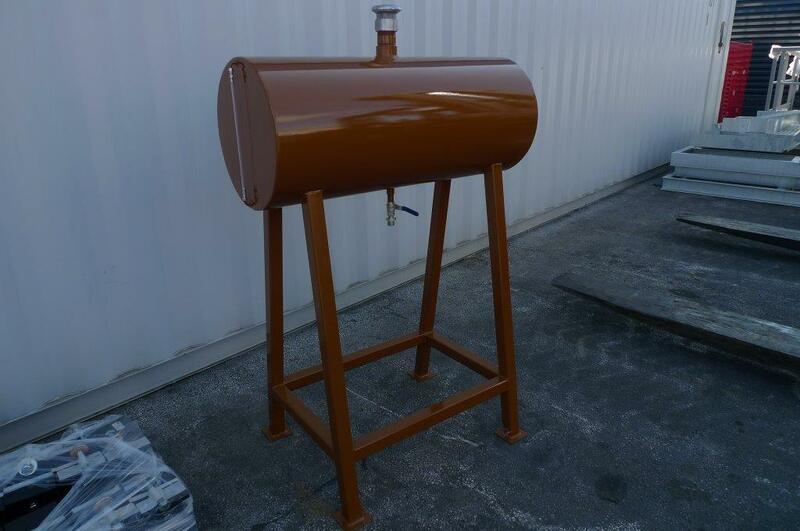 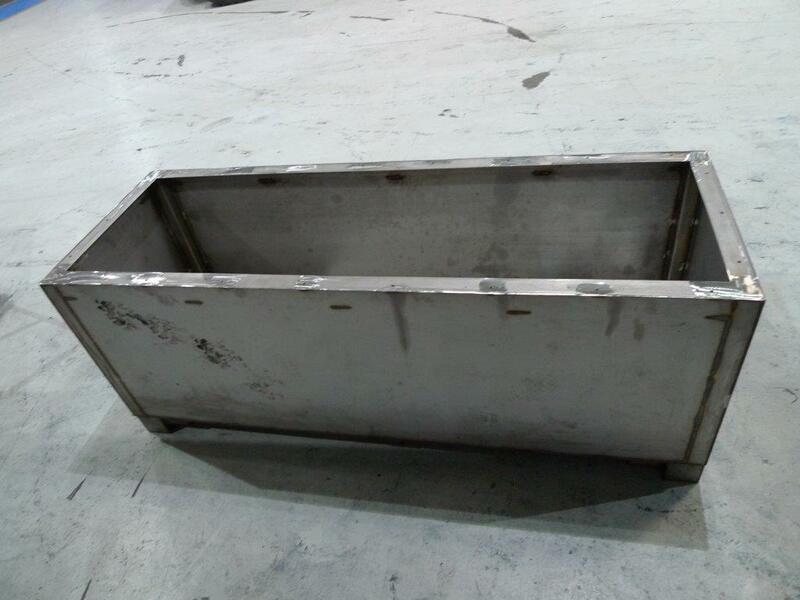 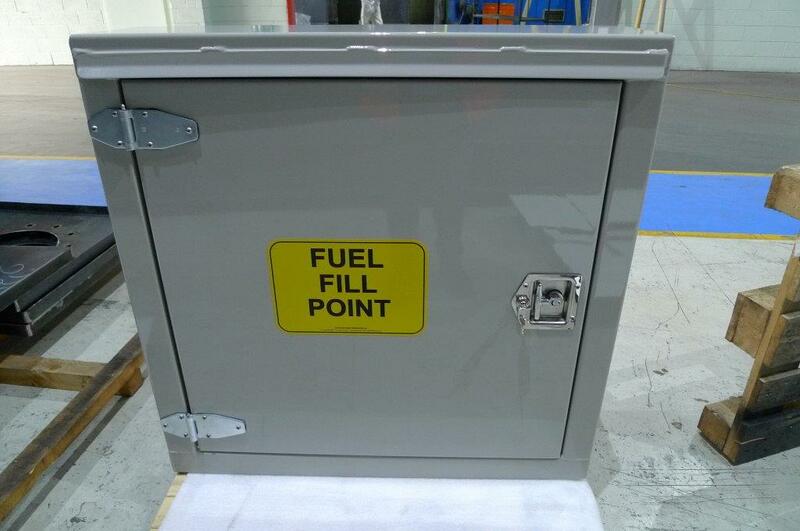 A standard fuel tank fill point manufactured for another generator company. 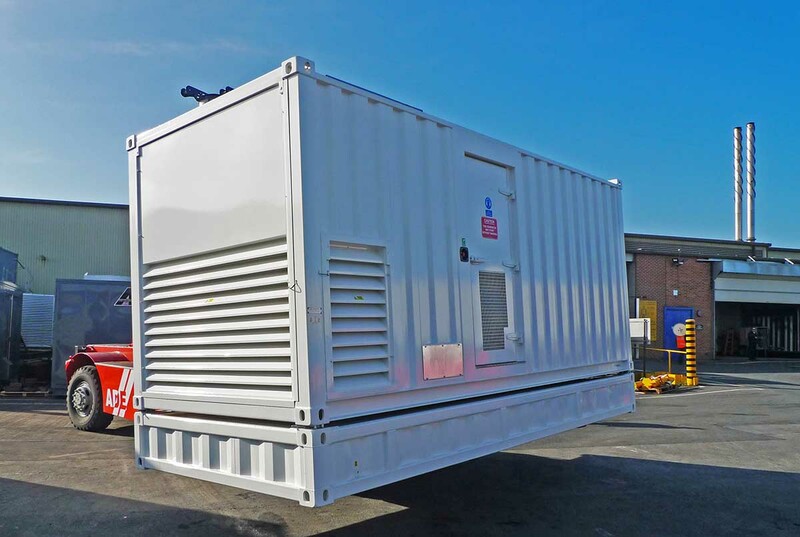 This Cummins 1100 kVA in its ADVANCED designed & built 75dBa @1 metre enclosure will provide back up power for BET 365 data servers in the event of a mains failure. 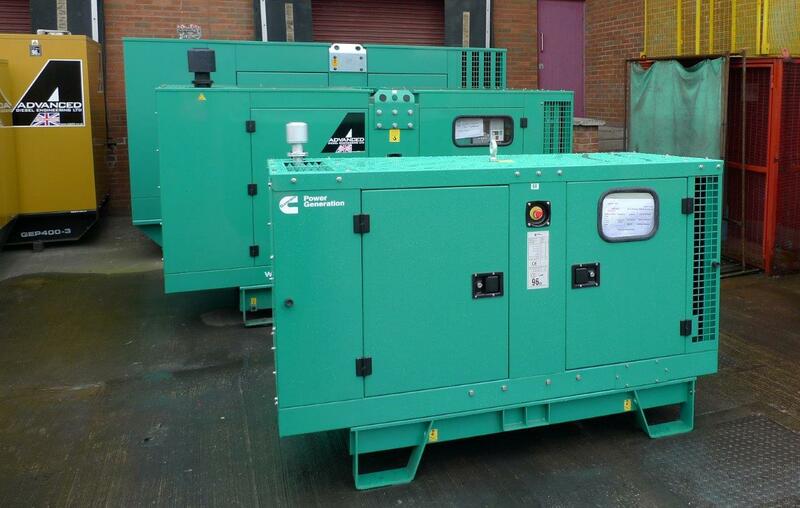 This matching pair of 1675kVA Cummins acoustic diesel generators c/w 5200 Litre built in double skinned fuel tanks will provide back up power to Stoke City Football club to keep the lights on and the players playing should the mains power fail. 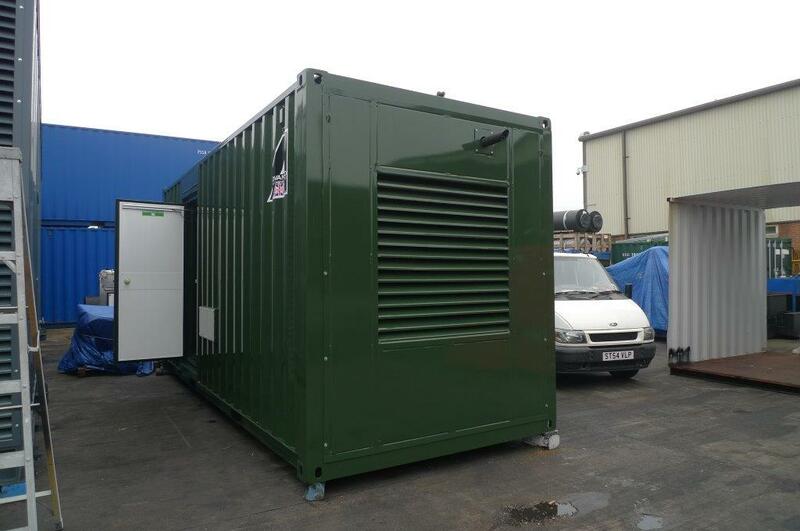 The Police go green... this 330kVA Cummins enclosed diesel generator and ADVANCED built double skinned bulk fuel tank was already Cummins green, but the client requested that it matched the surrounding buildings which meant re-painting to the lovely deeper green that it is now.The package is to act as backup to a police HQ in Stafford. 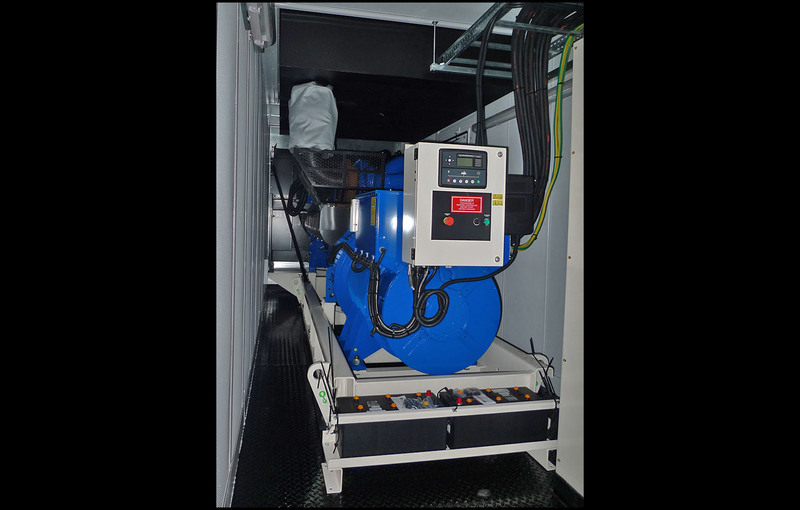 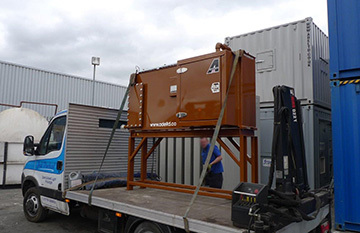 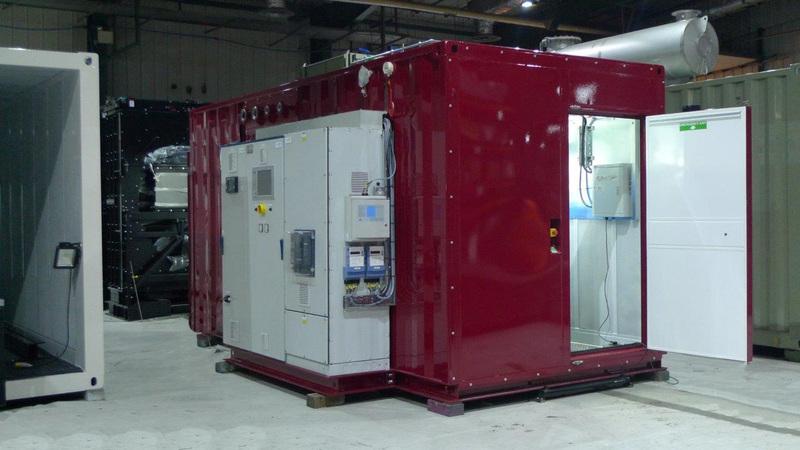 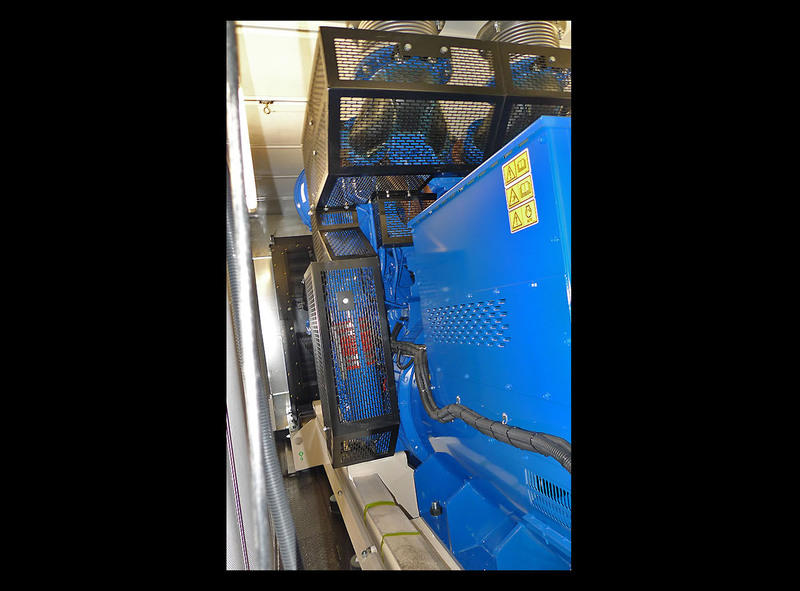 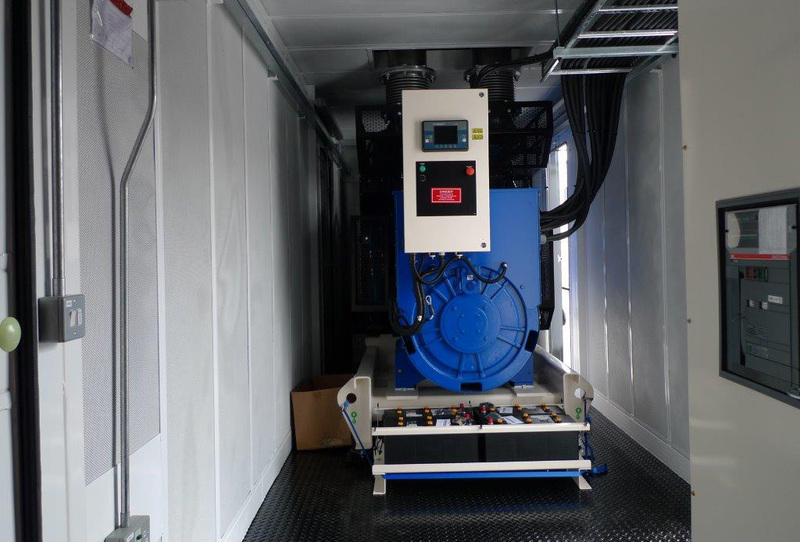 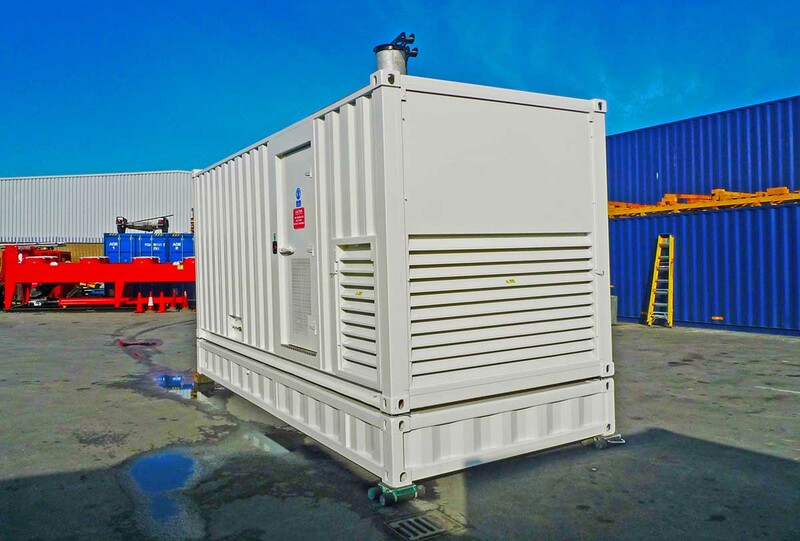 This free issue 800 kVA Perkins diesel generator was packaged at ADVANCED into a 30ft acoustic enclosure comprising a 3000 Litre double skinned bulk fuel tank. 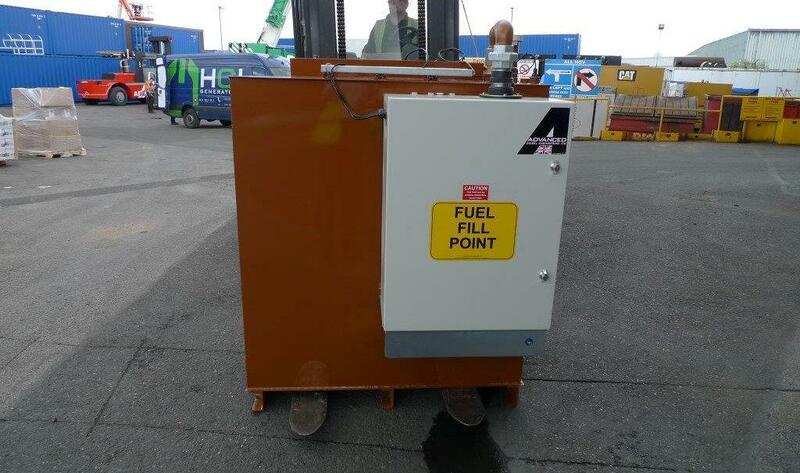 All to achieve 80dBA @ 1 metre. 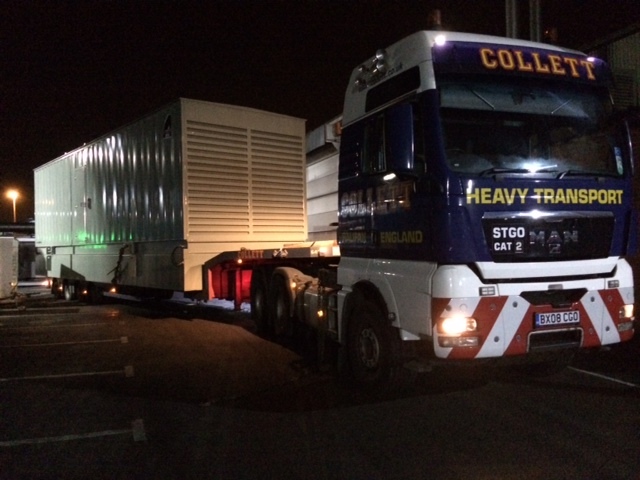 Bound for Reading. 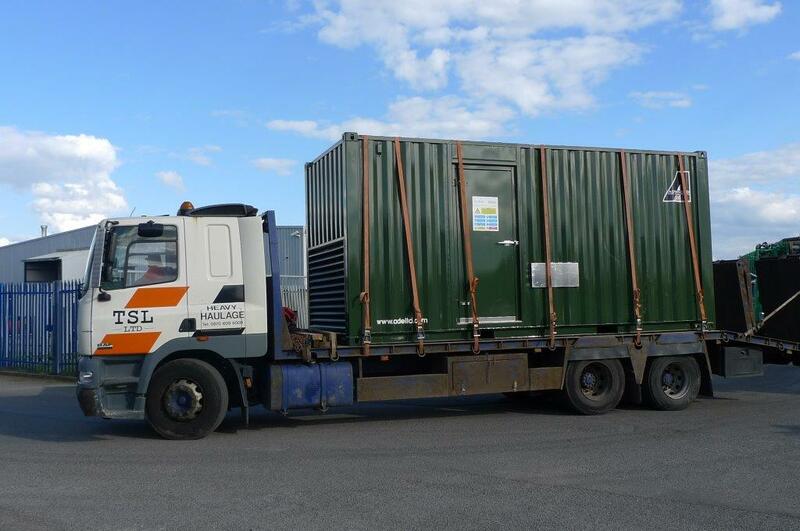 A containerised 1250kVA Perkins diesel generator is being despatched to a police HQ in Scotland for one of our prestigious clients. 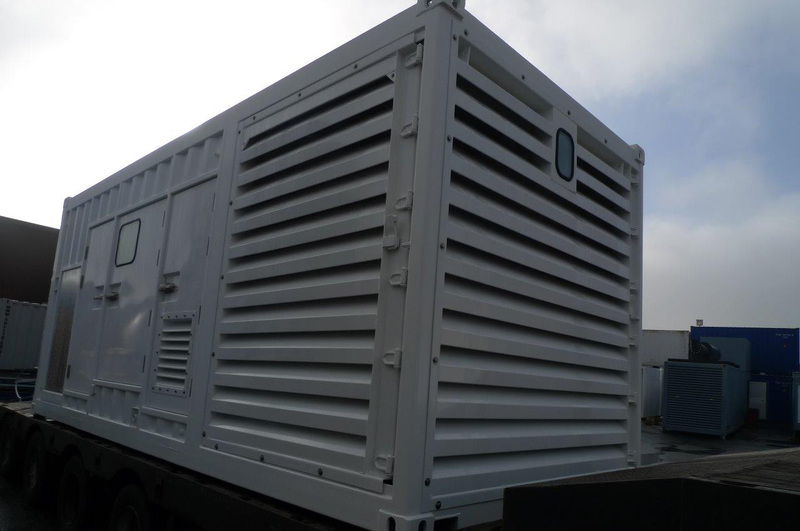 This CAT 800 kVA modified to the telecoms specification by ADVANCED will be installed in one of the country's larger communications exchanges. 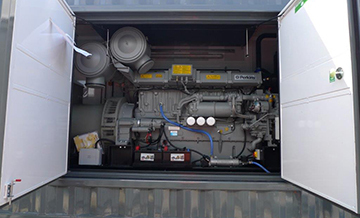 Another Cummins 55kVA diesel generator has had sockets and distribution equipment fitted for a repeat client who hires out marquees for outdoor events. 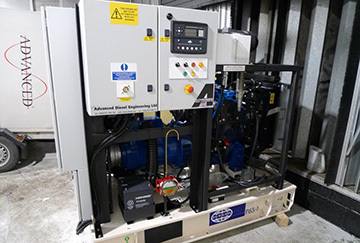 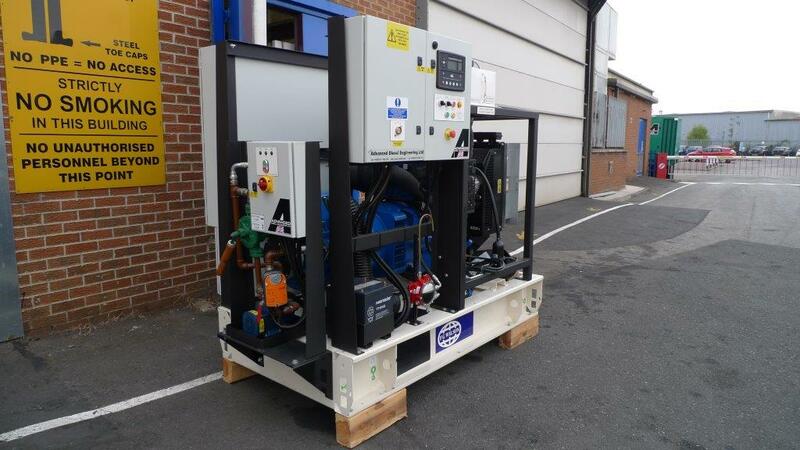 Designed & manufactured by ADVANCED , this 85dBa @ 1 metre containerised Perkins 1500kVA diesel generator is currently being installed at a high street retailers distribution centre. 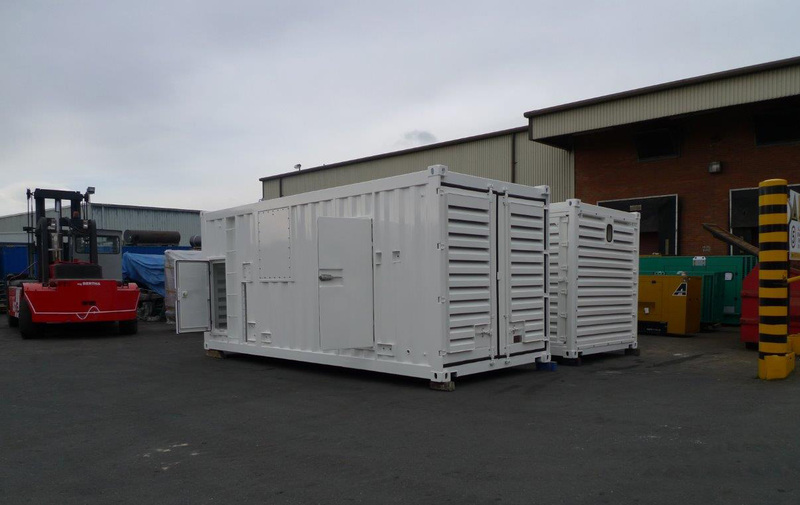 These enclosures & 11,000 Litre double skinned base fuel tanks were designed & built by ADVANCED for three free issue Perkins 1100kVA diesel generators, supplied to one of our many prestigious clients.Lead time on this project was tight…. 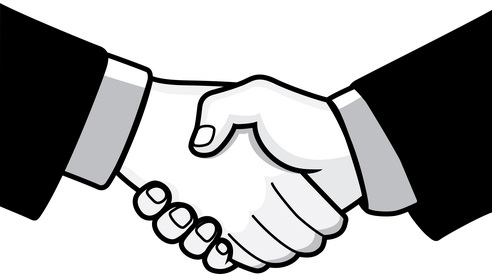 But when the client requested a week earlier than the target date if possible. 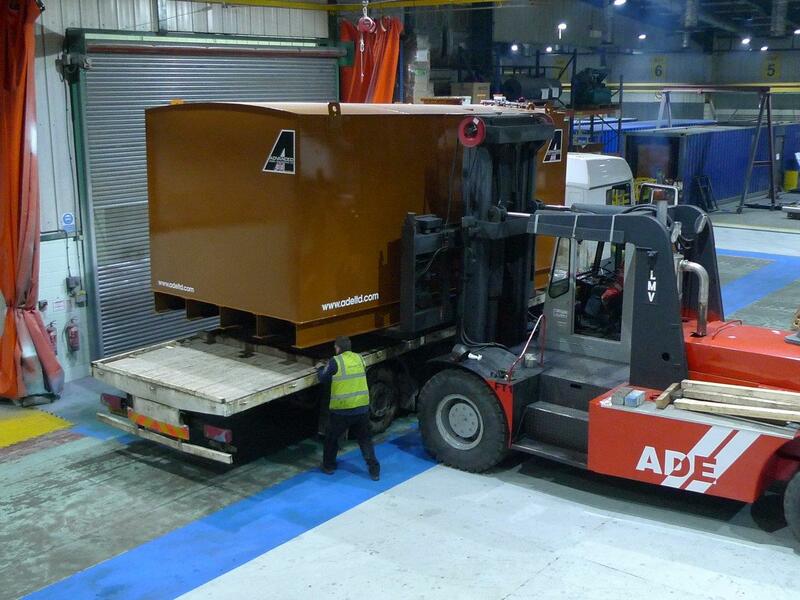 The ADVANCED team once again pulled up tree's to meet the new deadline. 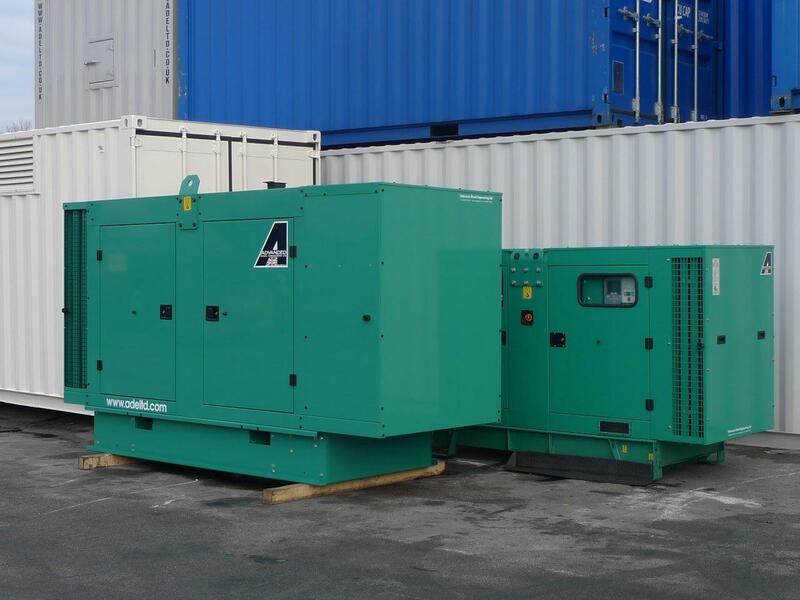 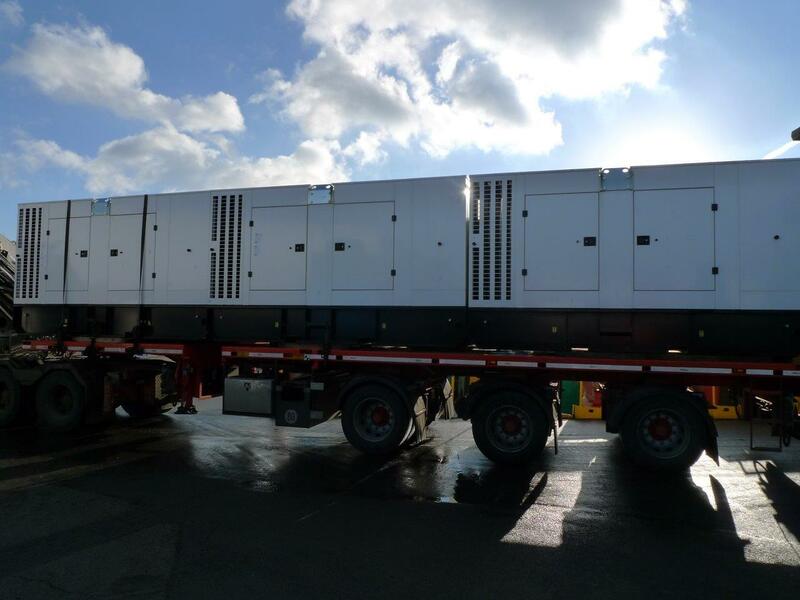 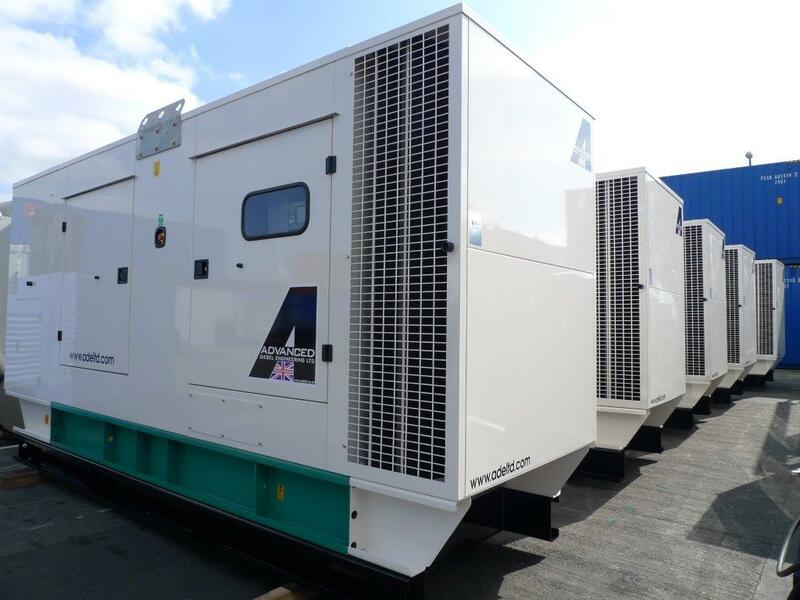 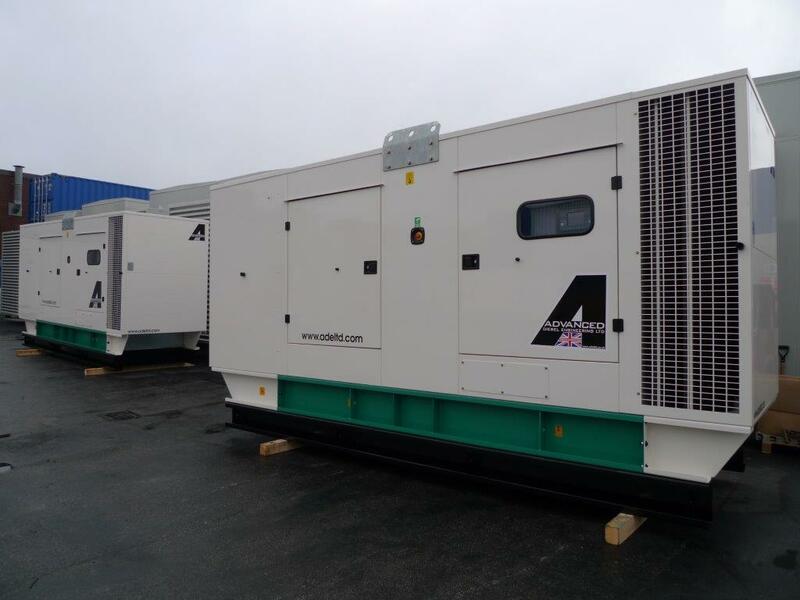 These two Cummins diesel enclosed generators a 440kVA and a 44kVA along with additional plant room items are to be installed in two separate UK locations to provide back up power in the event of a power failure. 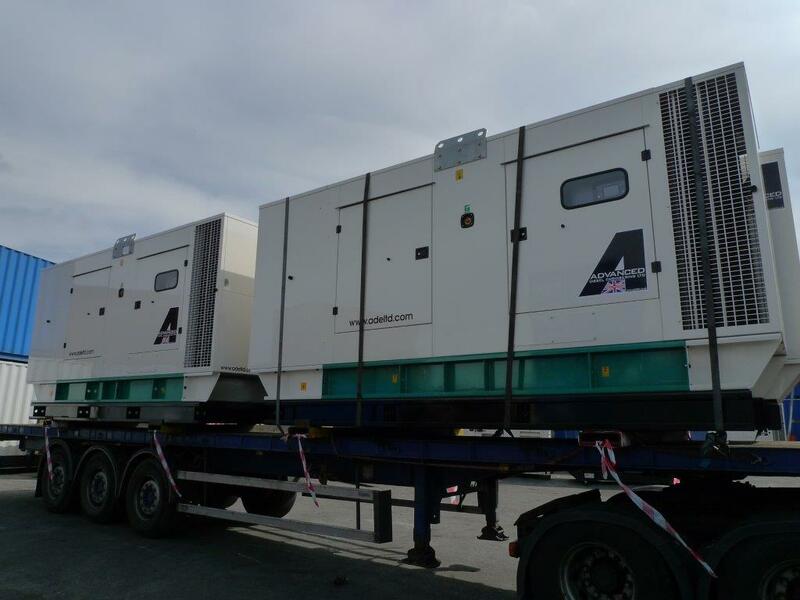 A pair of Cummins 825kVA open diesel generators are well on their way to India to meet with a British installation team.The gensets will provide back up power for a UK computer technical support phone Centre. 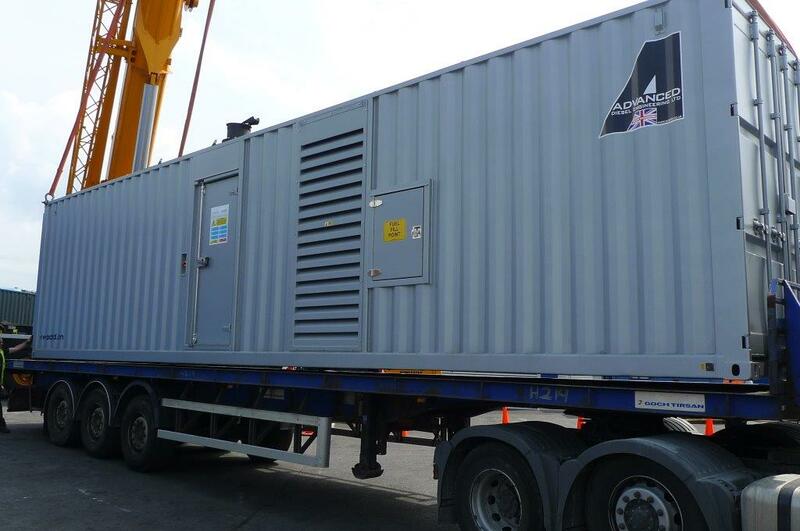 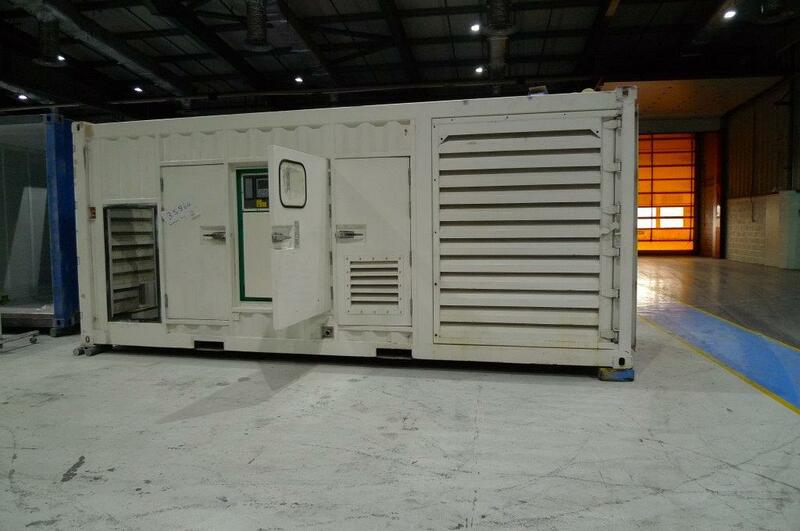 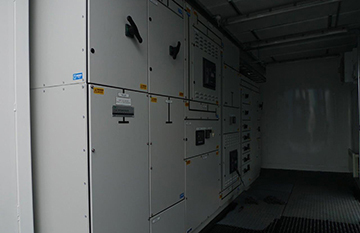 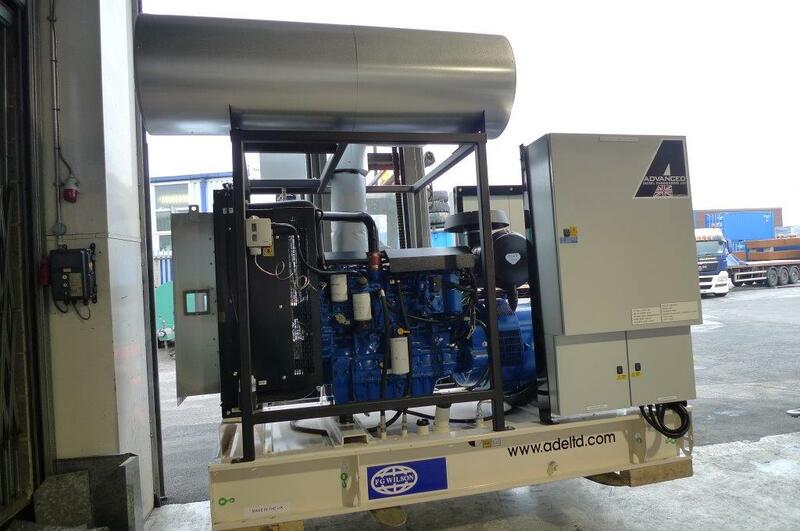 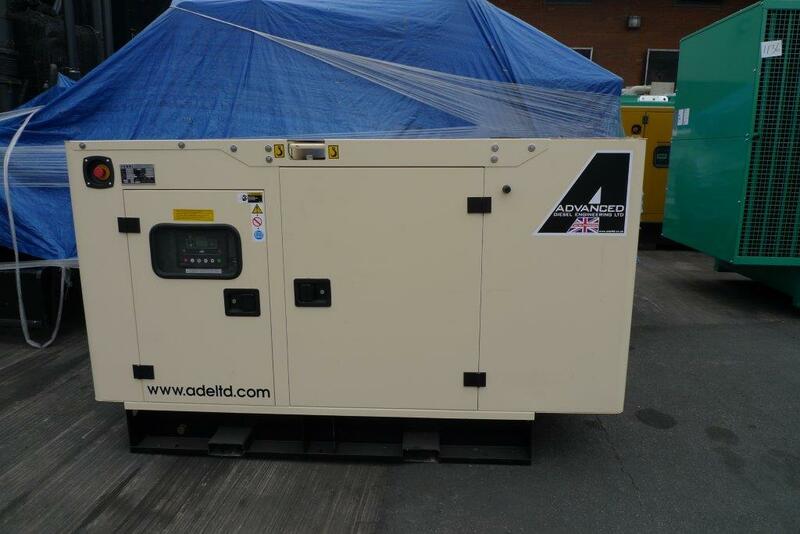 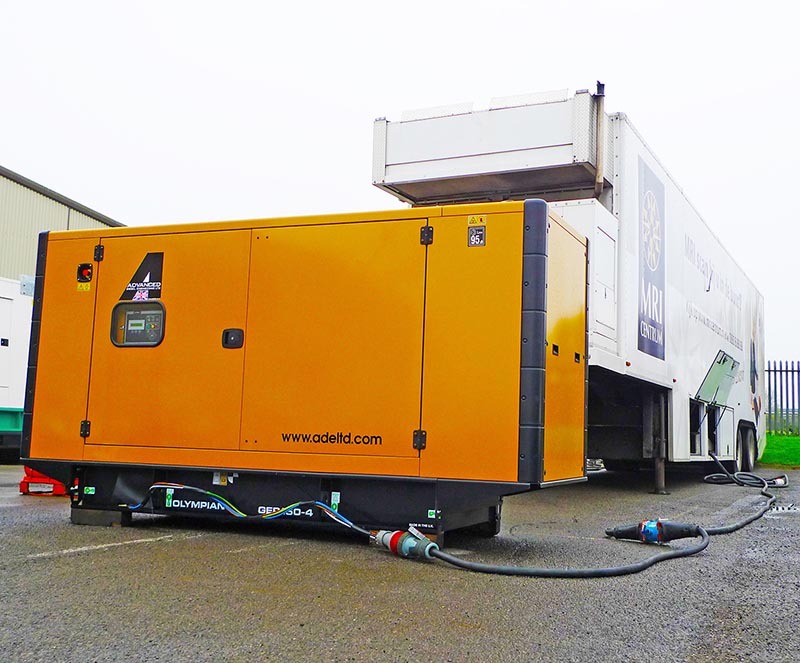 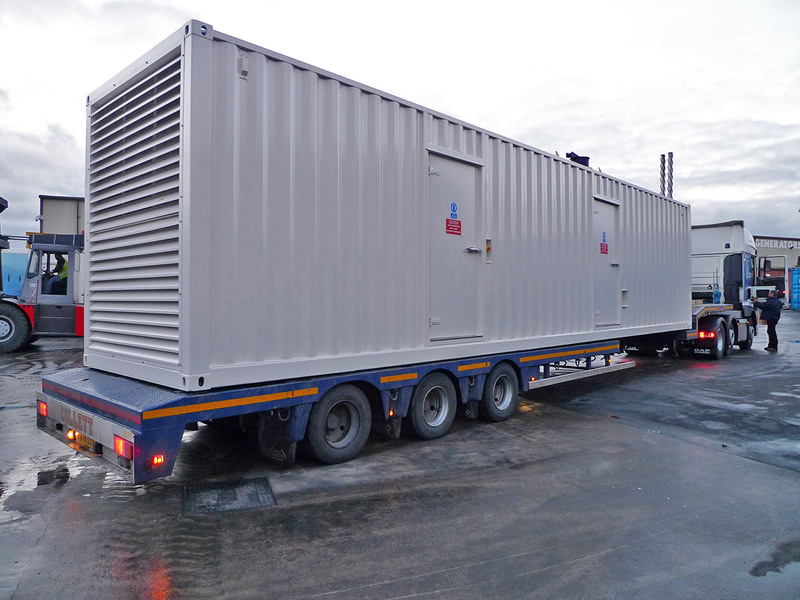 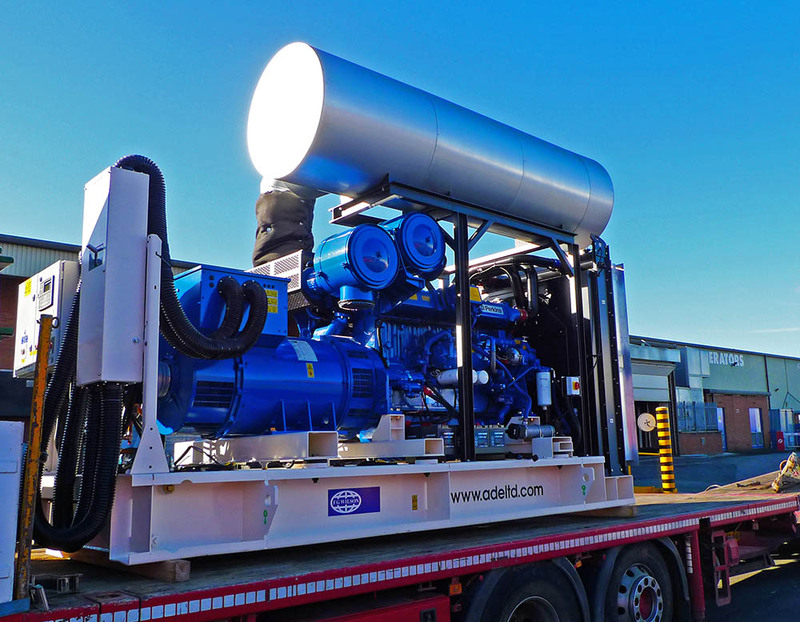 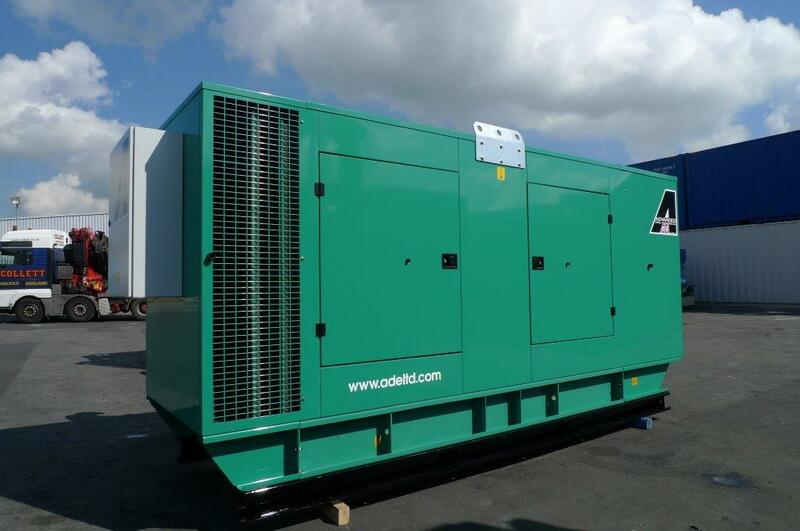 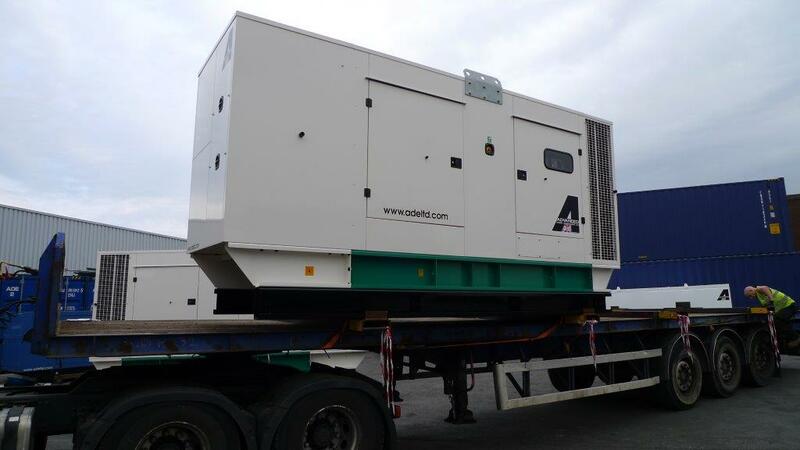 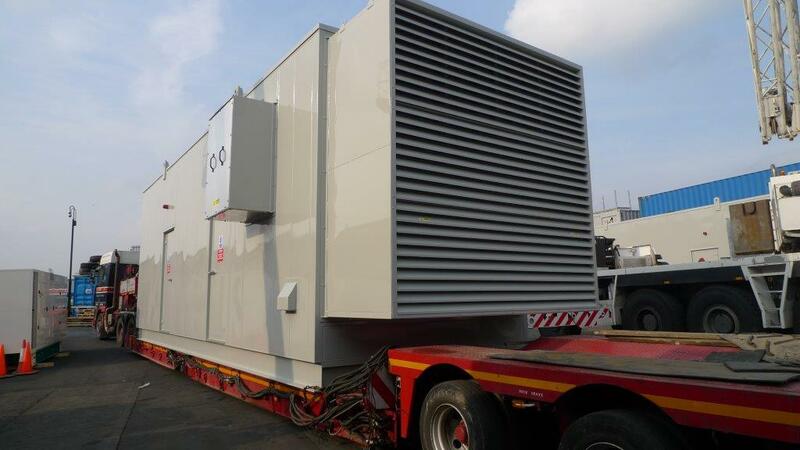 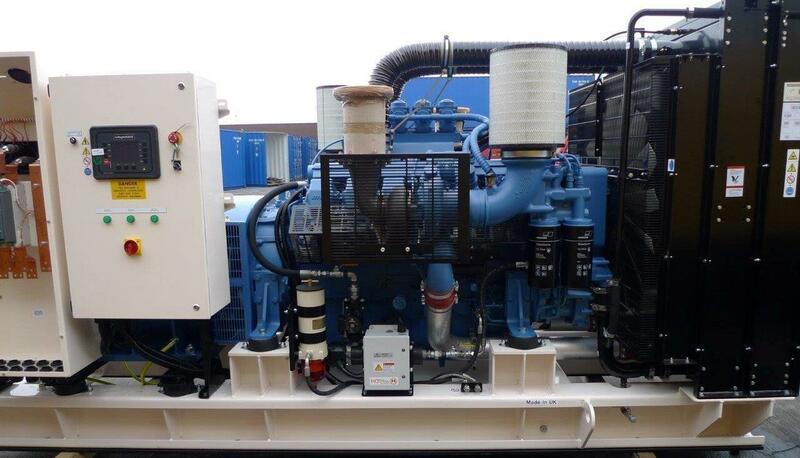 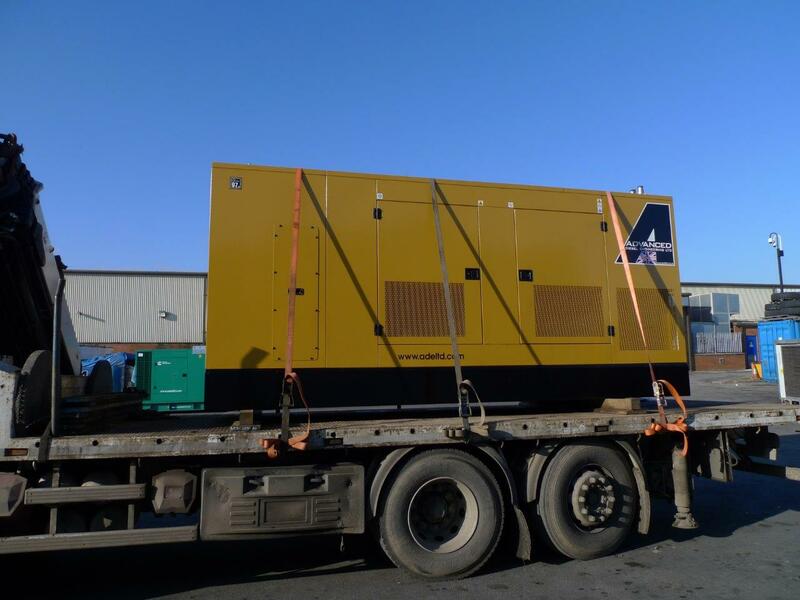 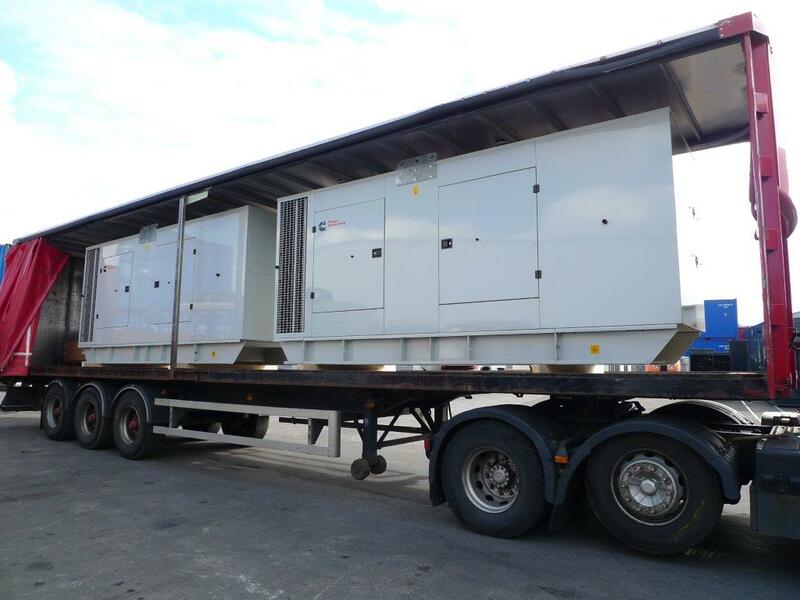 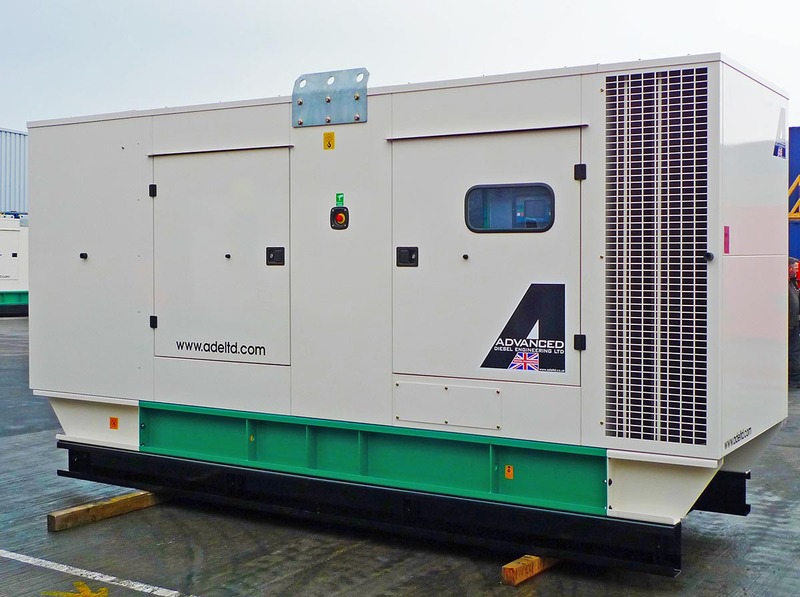 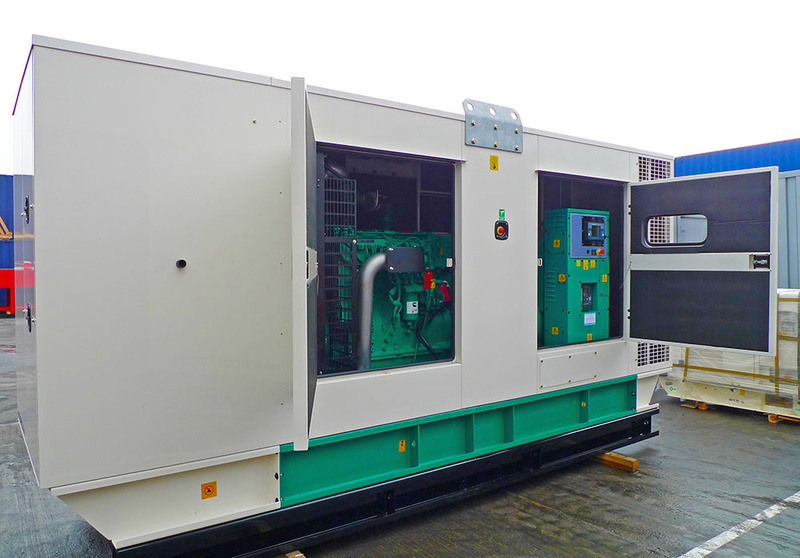 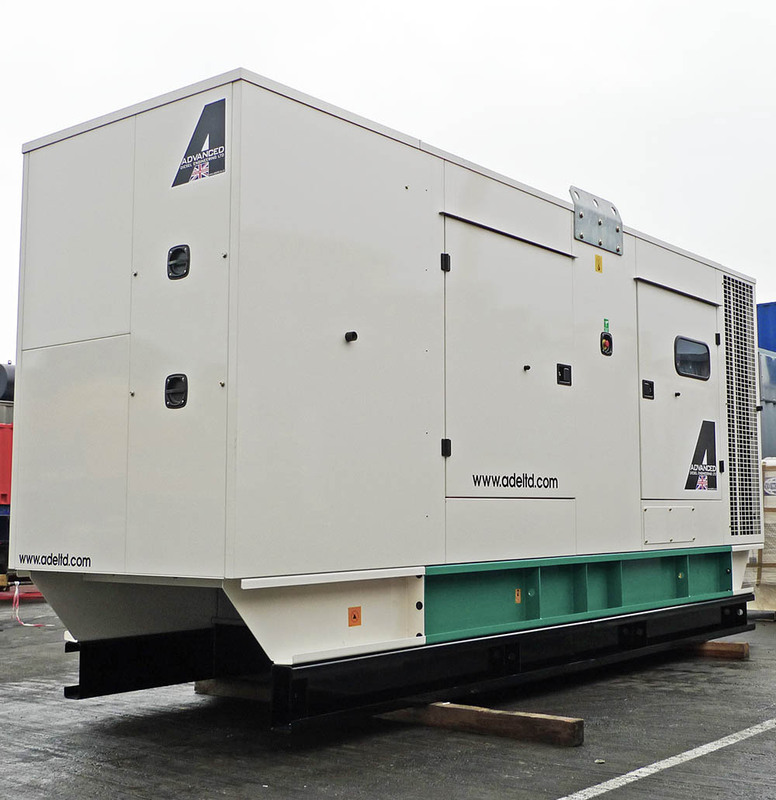 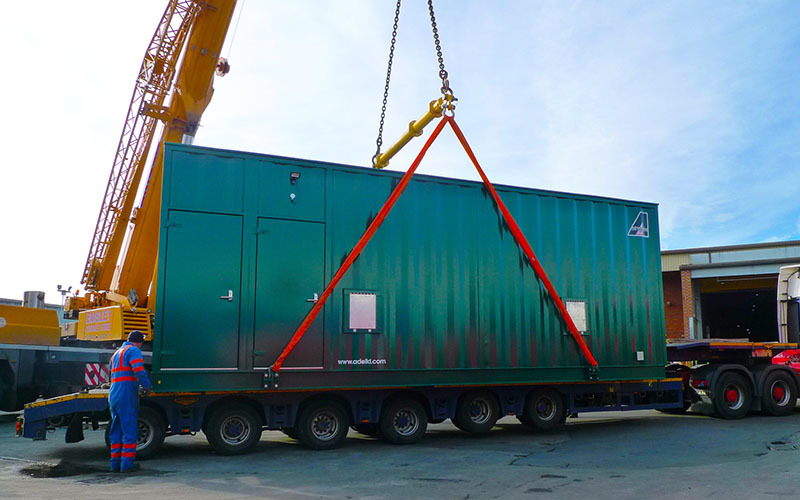 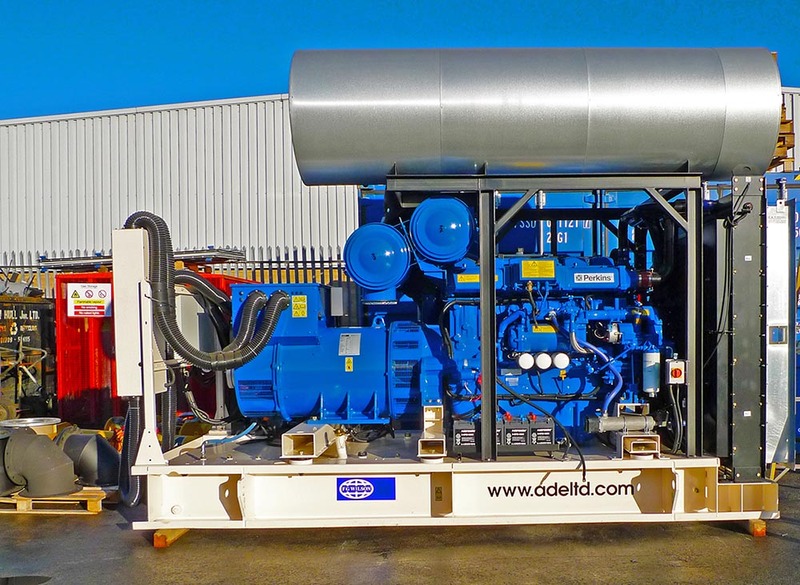 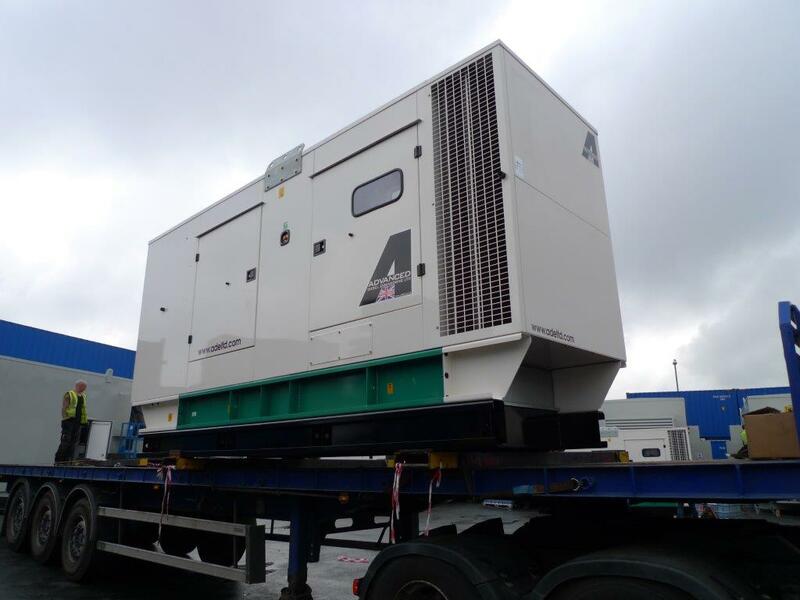 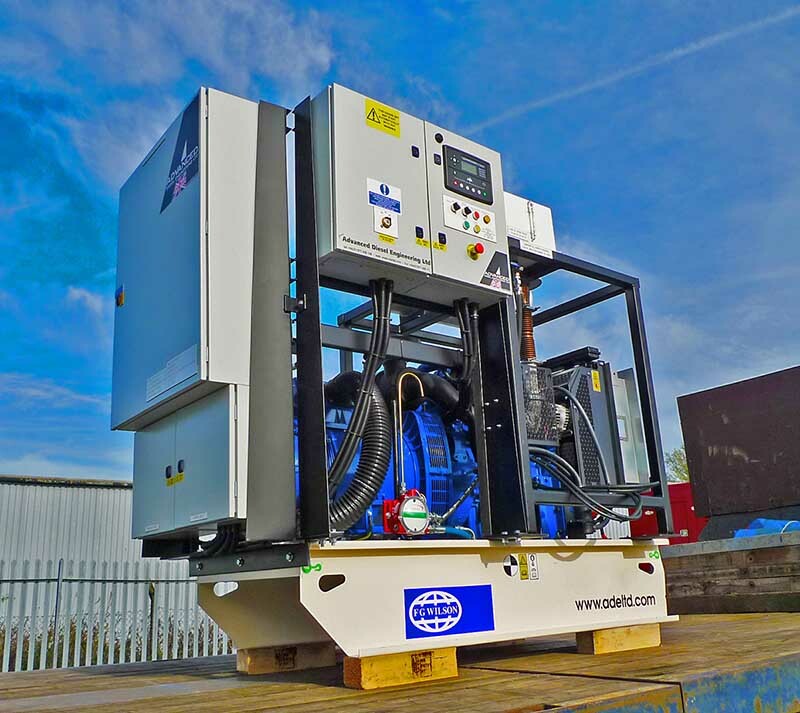 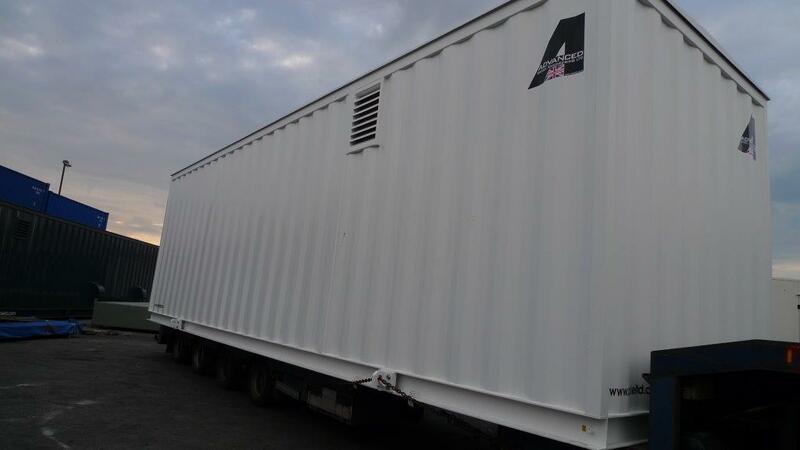 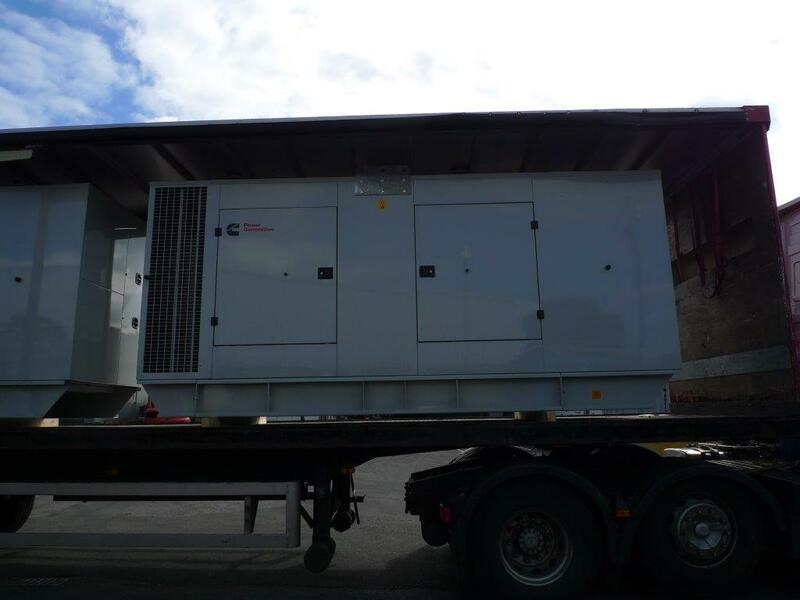 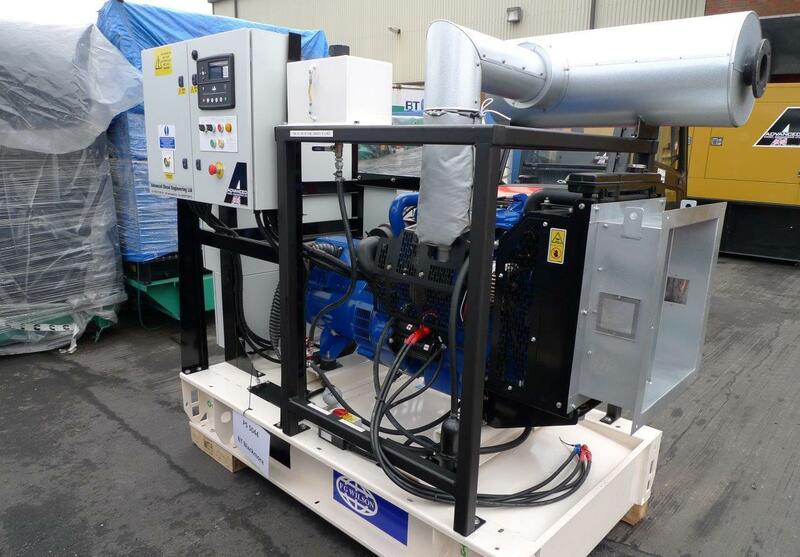 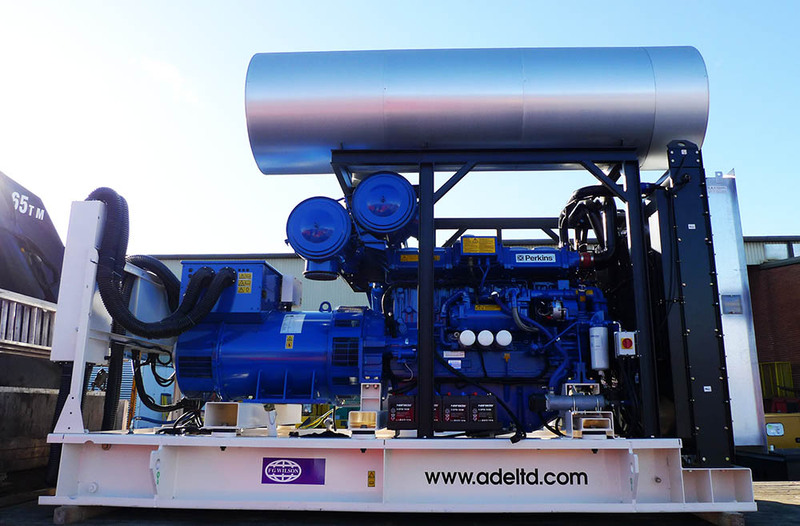 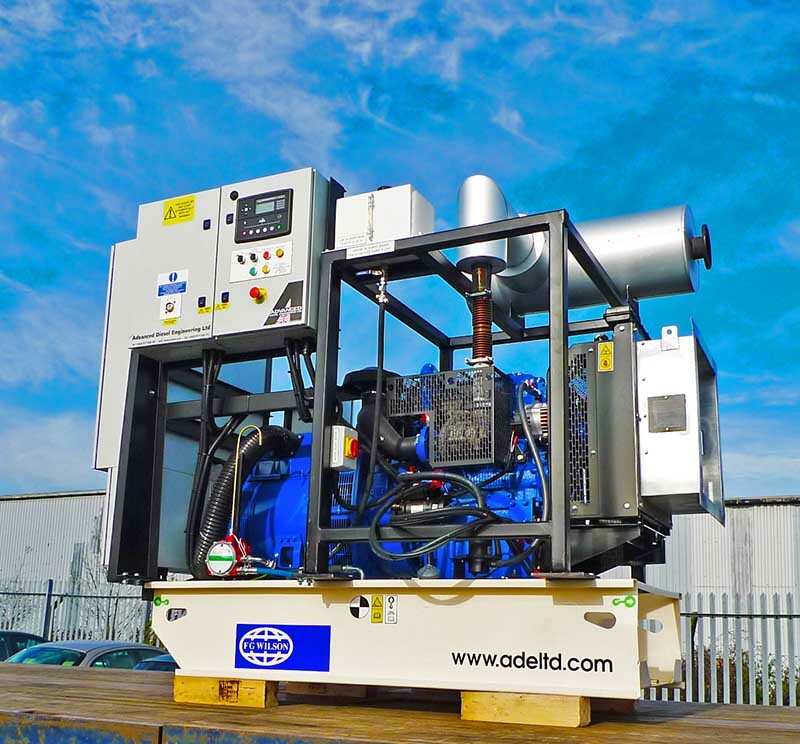 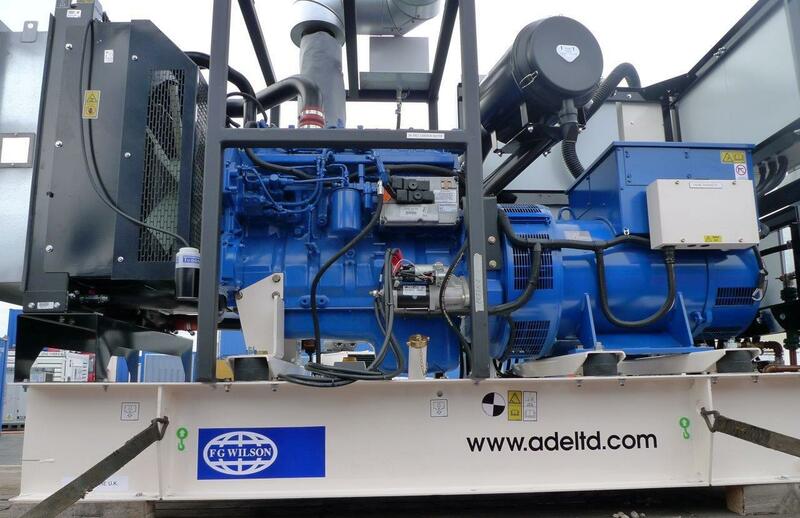 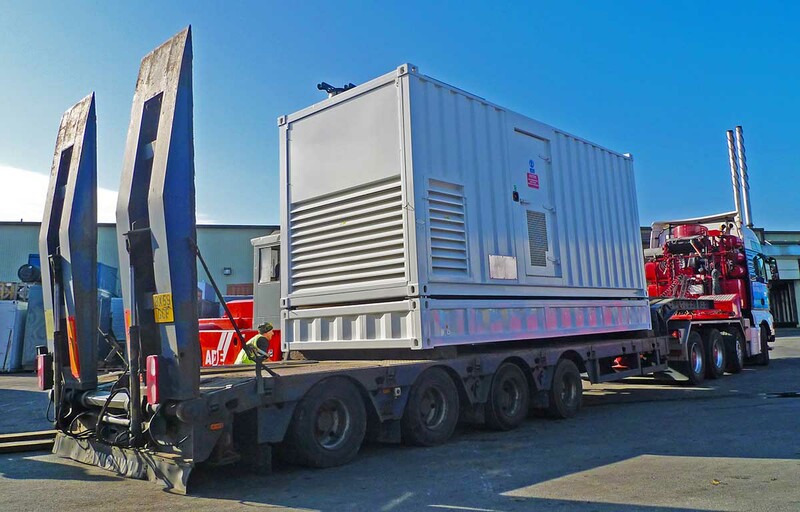 This ADVANCED modified 110kVA Perkins diesel generator is part of the UK telecoms project. 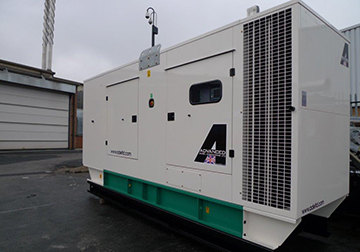 This standard 150kVA enclosed Cummins diesel generator was sold complete with an ADVANCED built ATS panel, to an electrical installation company on the Isle of White. 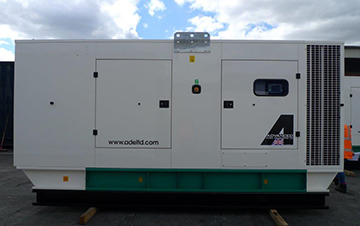 This standard enclosed 50kVA three phase Perkins diesel generator was dispatched to a children's play centre in the midlands. 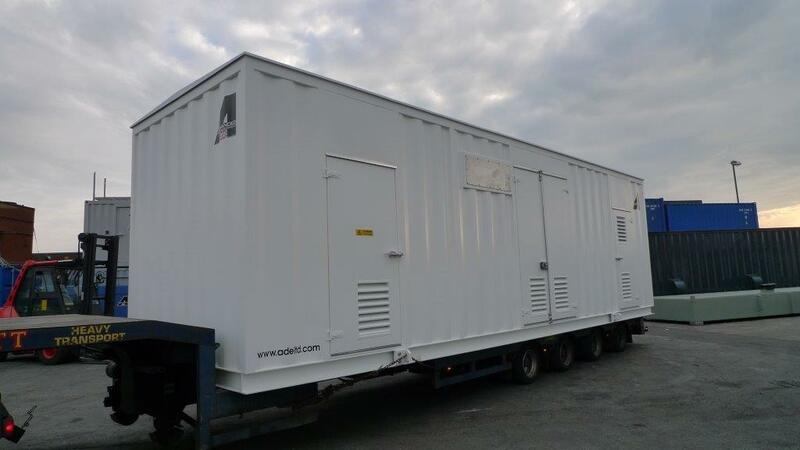 Power cuts in the uk are now double this year compared to the same time last year.Proving even companies like this cannot operate and keep the doors open without power. 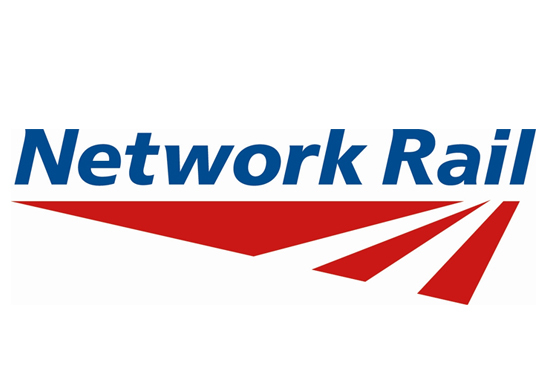 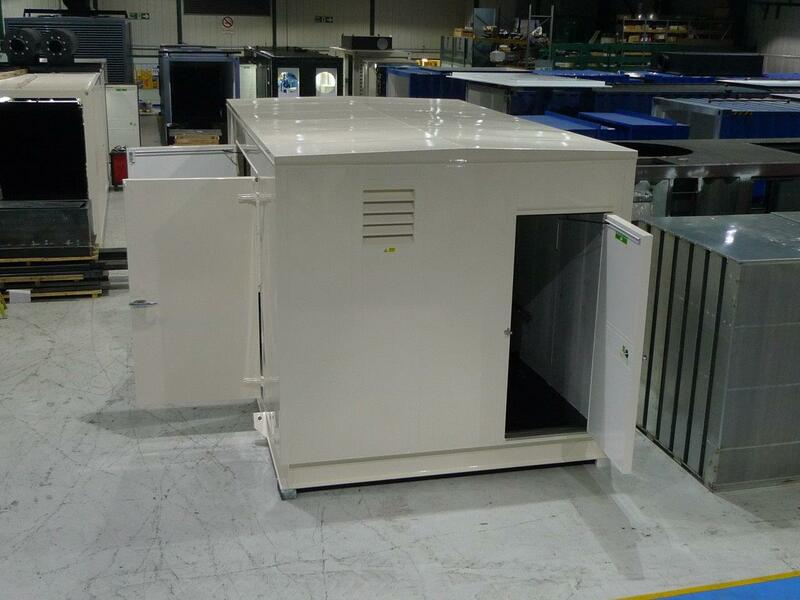 ADVANCED now have full approval to design and manufacture switchgear enclosures for Network Rail. 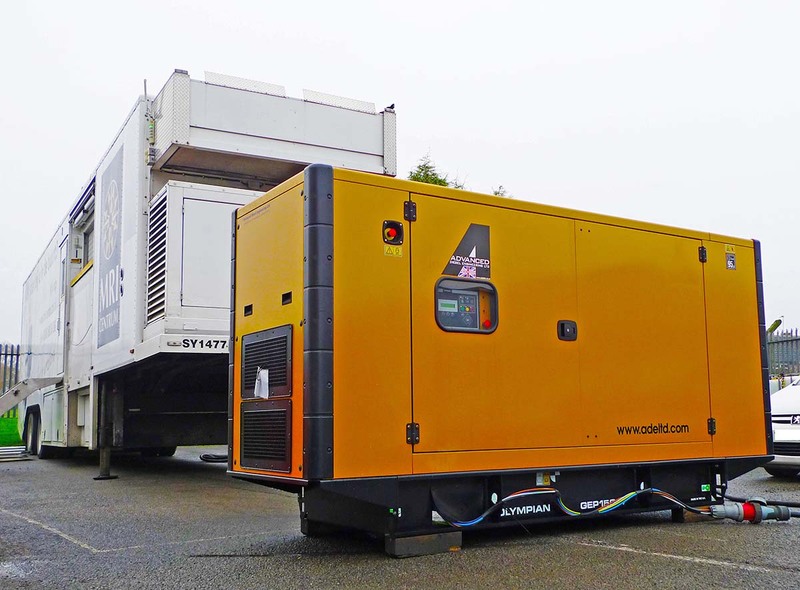 This silent Cummins enclosed 28kVA diesel generator was up fitted with sockets and distribution equipment and sent on to a Marquee vendor who hires the equipment out for weddings and other such events. 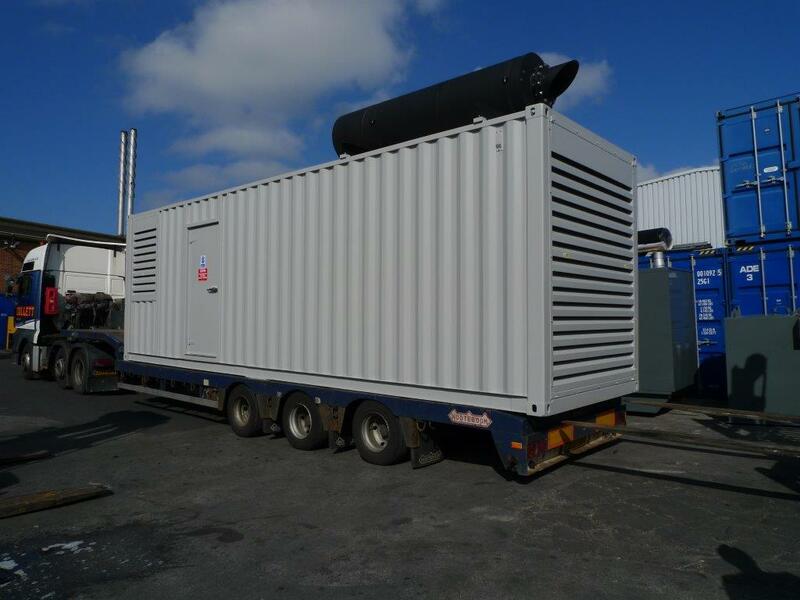 This 200kVA Perkins modified by ADVANCED to the telecoms spec is the last one in this months schedule to be dispatched for this project. 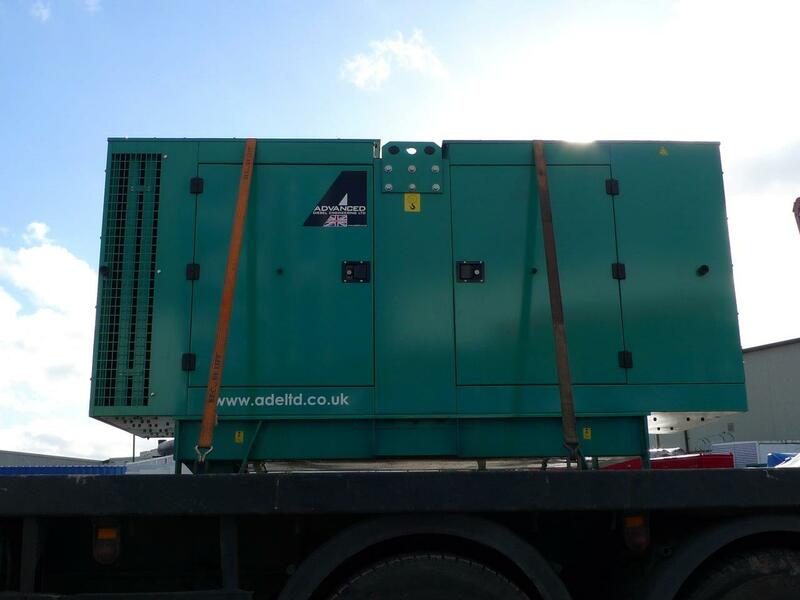 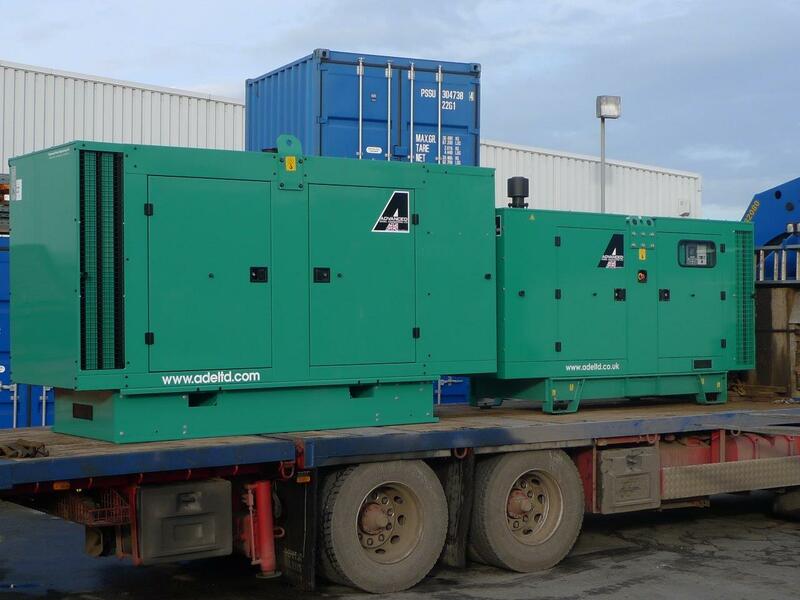 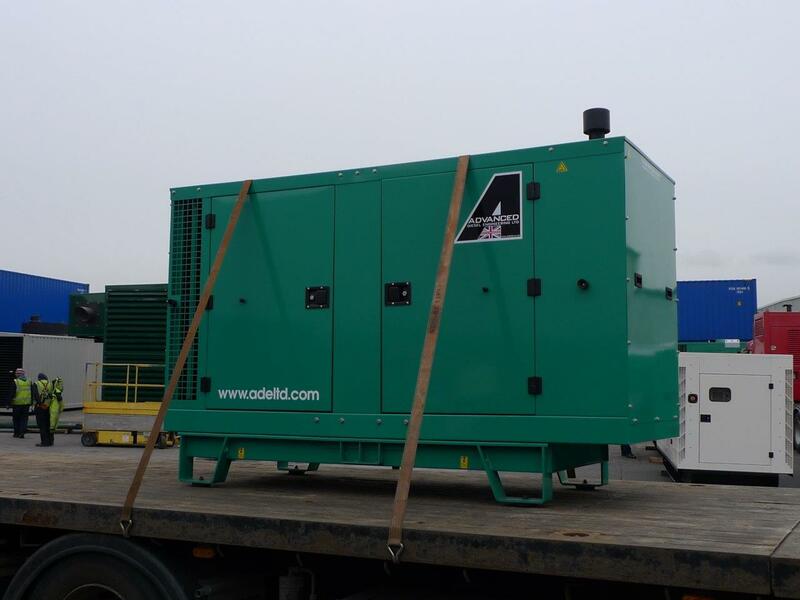 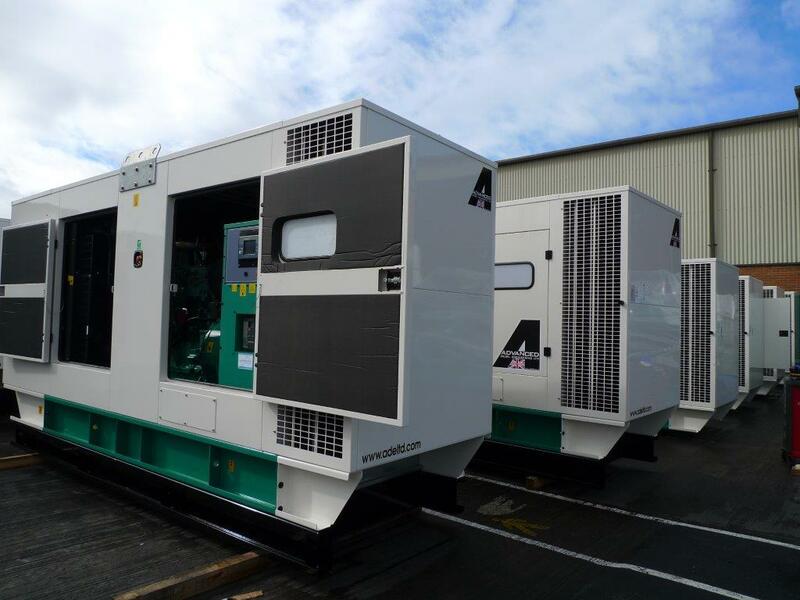 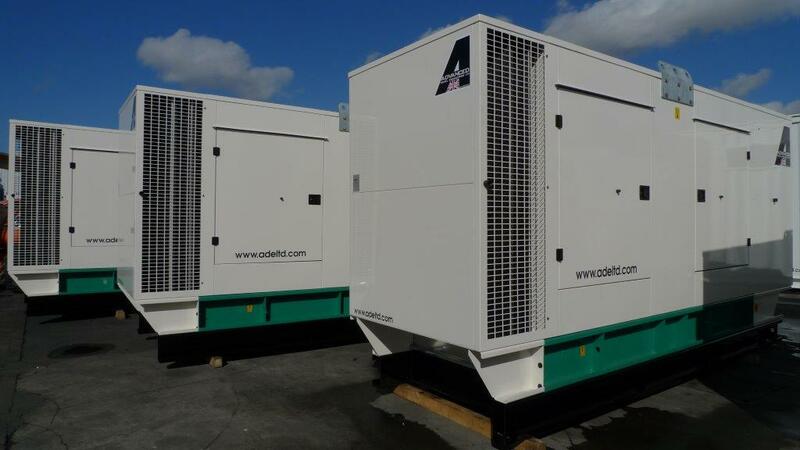 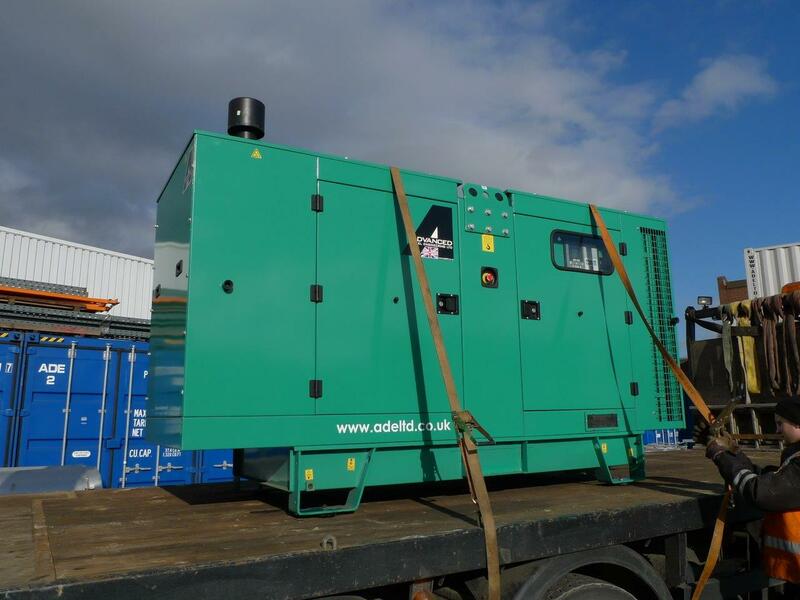 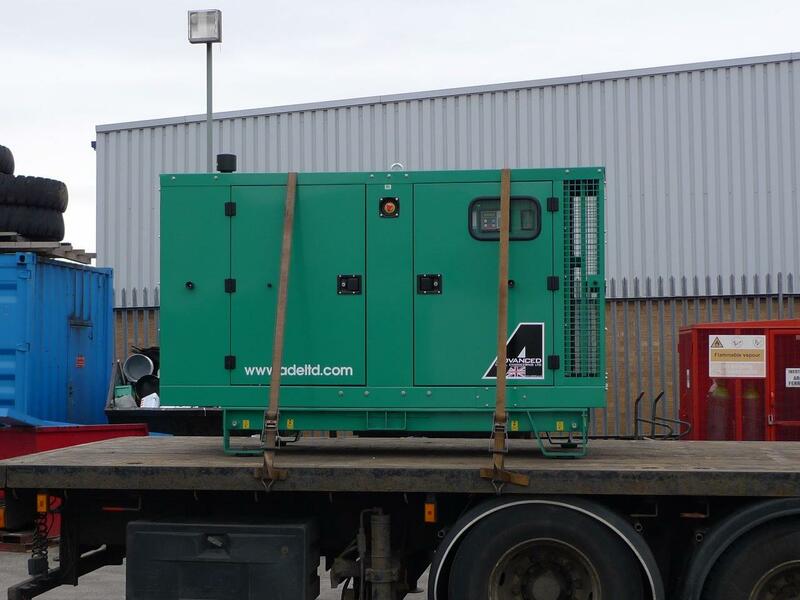 Five three year old open Perkins diesel generators were removed from two Asda warehouses to be packaged into ADVANCED designed & built acoustic enclosures. 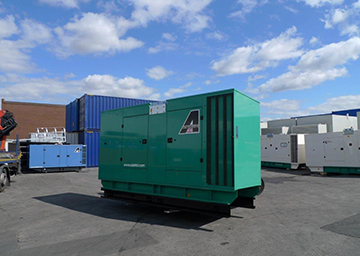 The generators were modernised with up to date STOR capable control gear and an upgraded motorised circuit breakers.All fully tested at our Pontefract works.The enclosures were then returned to the sites for installation outside the building, giving the warehouse some extra 3000 ft warehouse floor space. 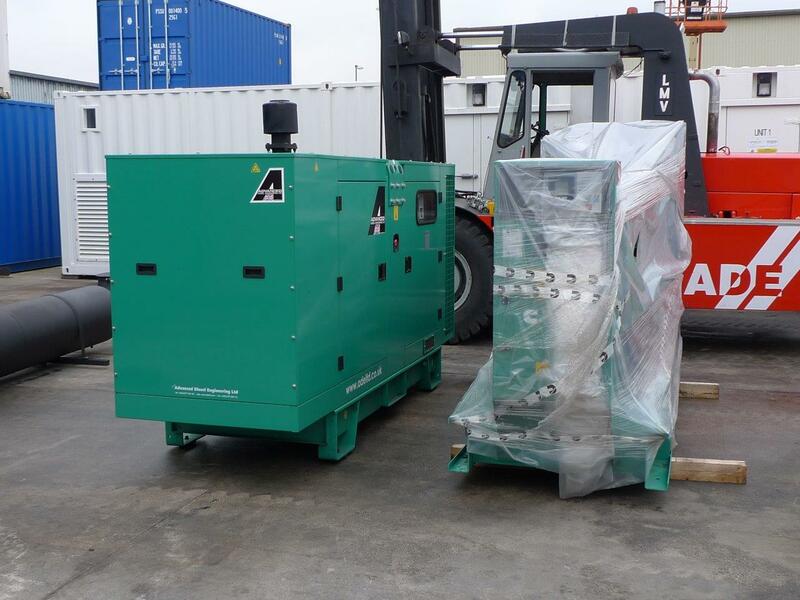 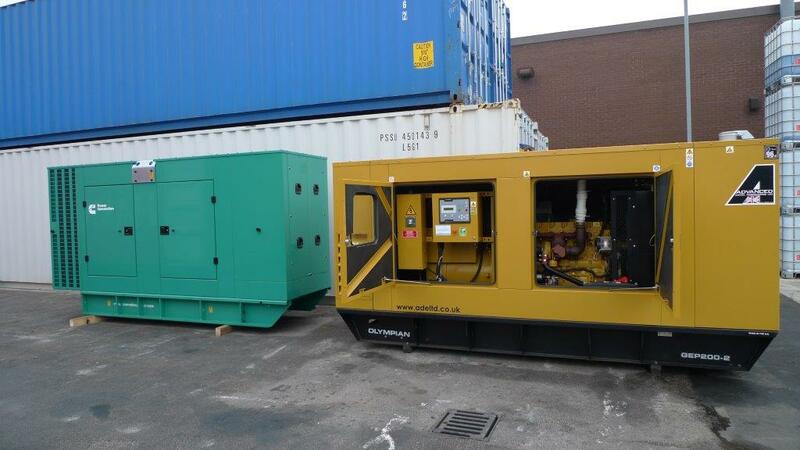 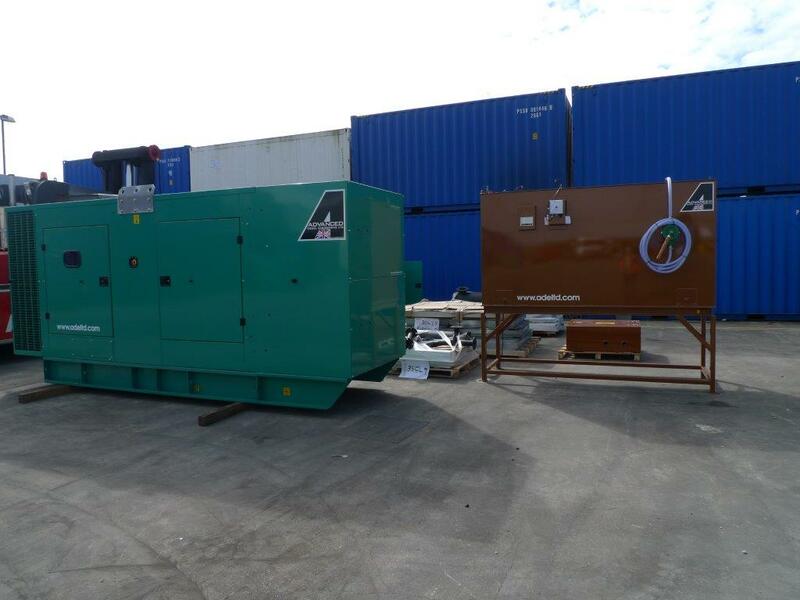 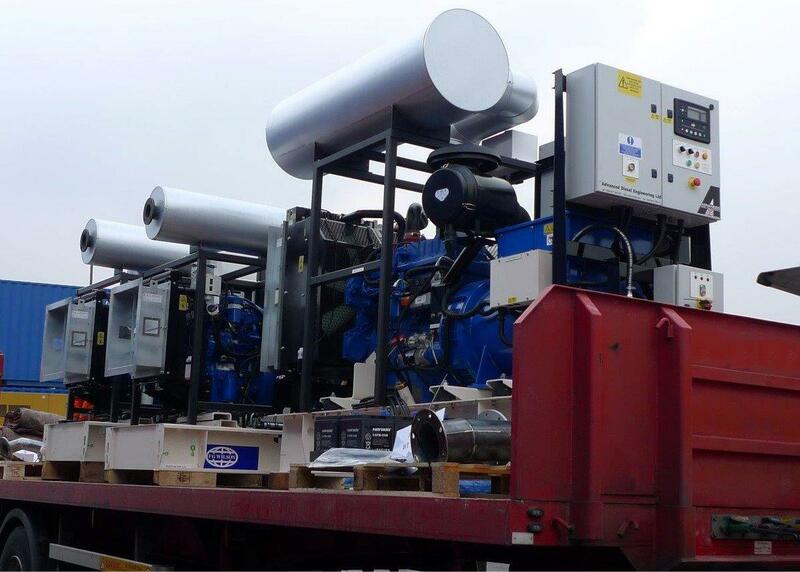 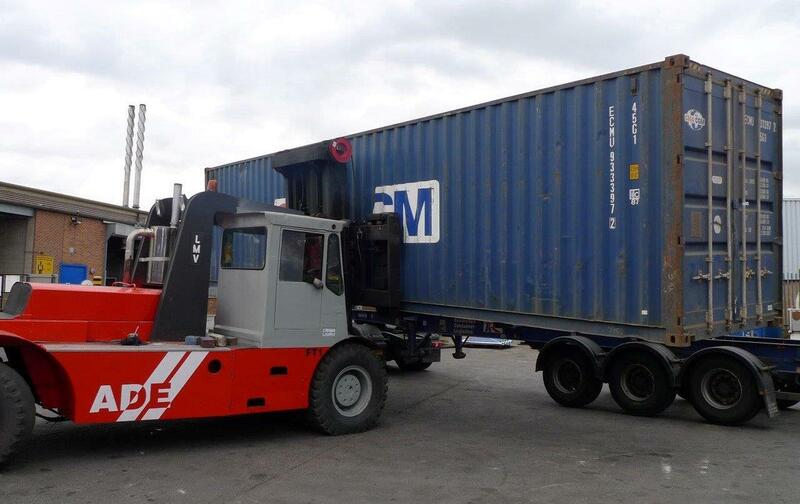 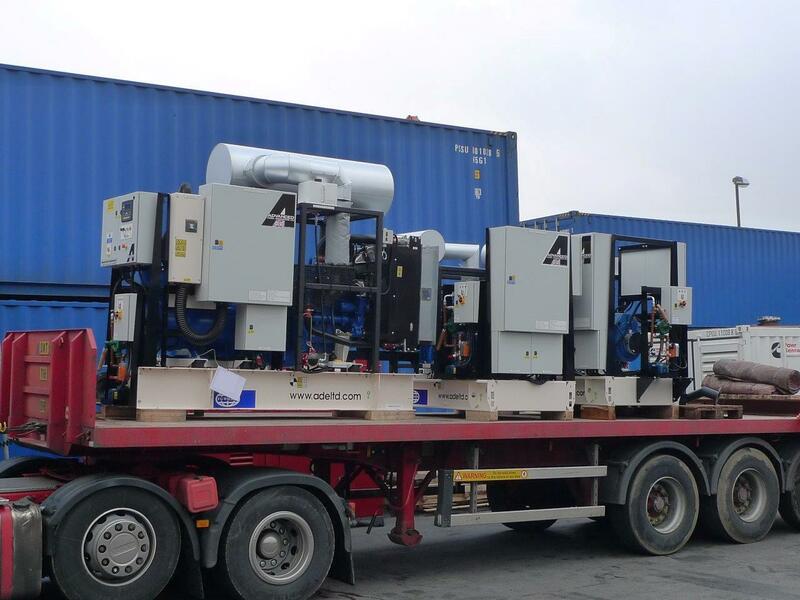 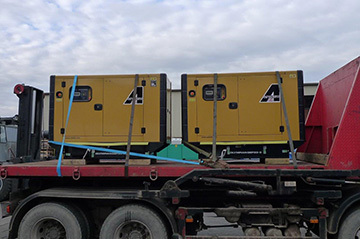 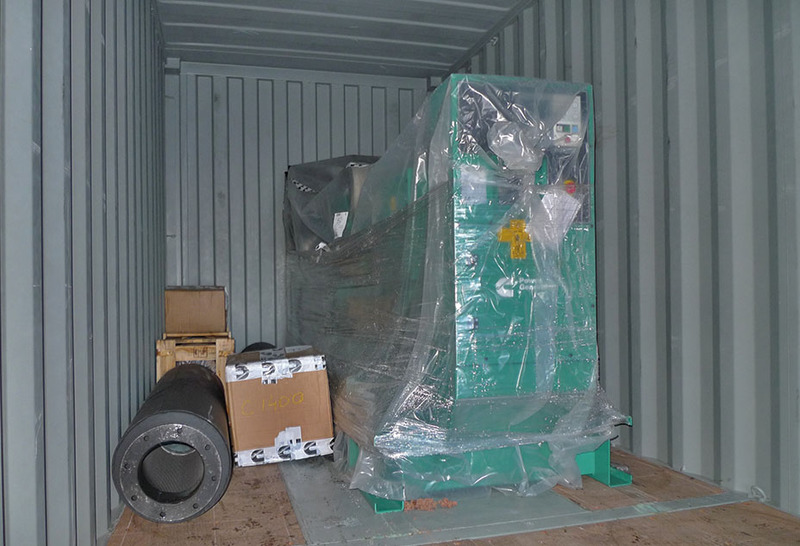 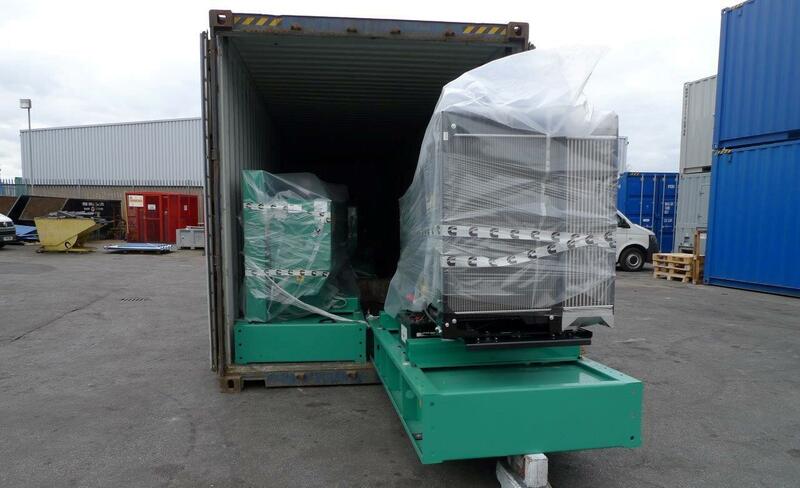 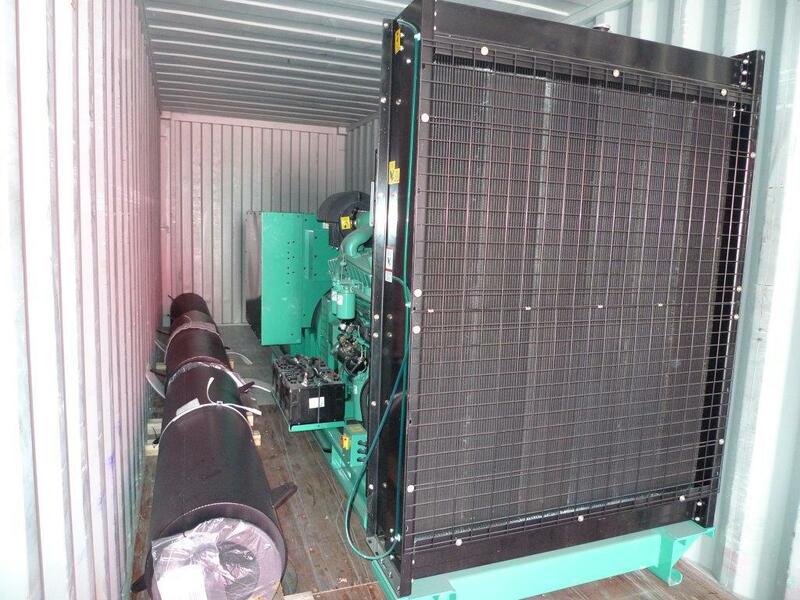 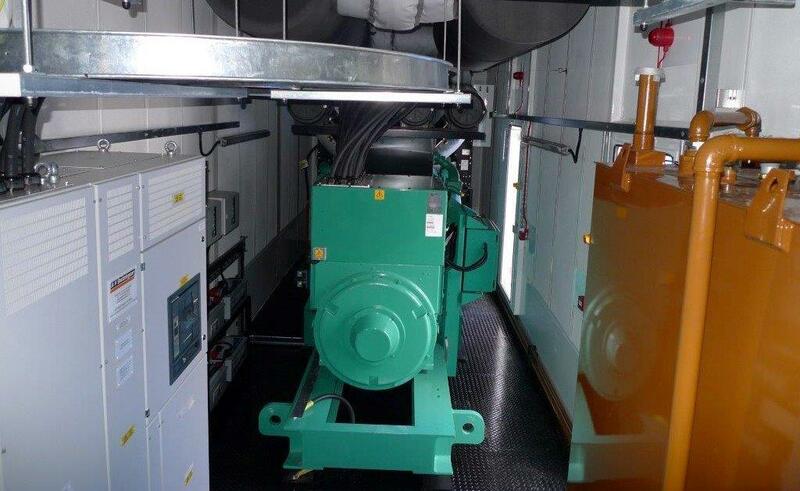 These two Cummins 220kVA enclosed diesel generators were loaded into a shipping container bound for the African continent to be used on a major coffee bean processing plant as the primary power source. 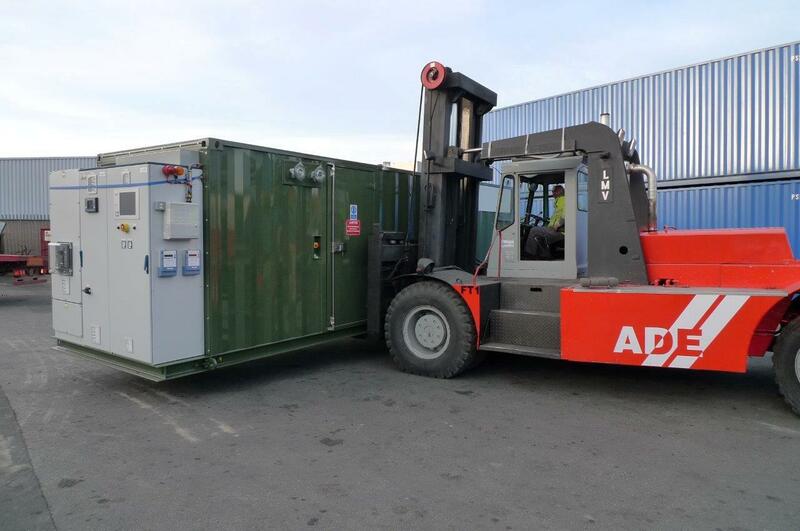 Perkins 65kVA, Perkins GEP 88kVA and a Perkins 150kVA, all modified and up fitted with the ADVANCED telecoms package of extras, the units are being installed at several locations throughout the UK. 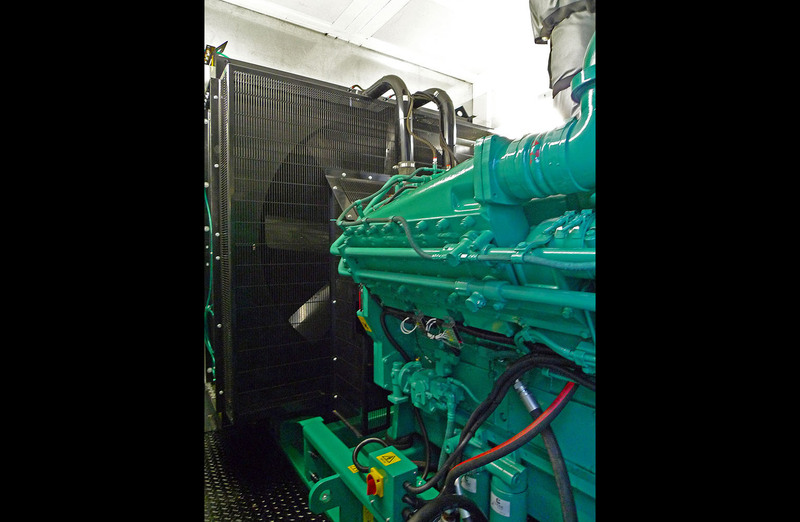 This Cummins 550kVA enclosed diesel generator and 3000 Litre double skinned bulk fuel tank is currently being installed at a UK Hospital. 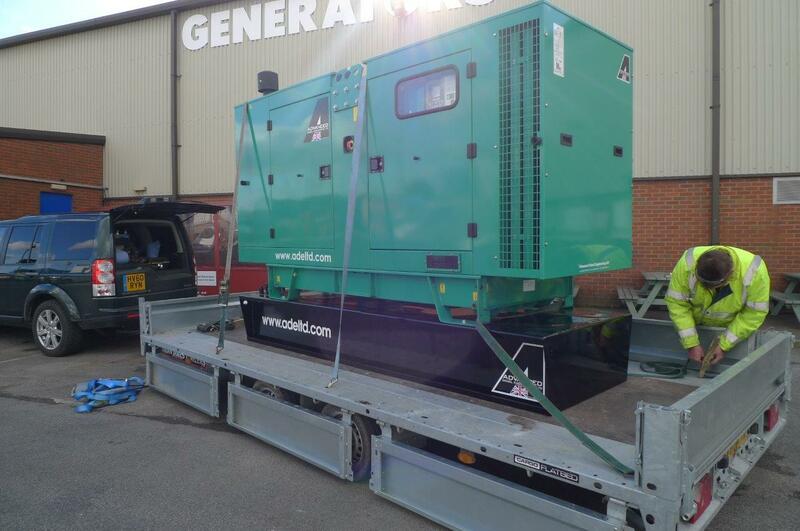 Another Cummins power box rolls off the production line ready to be dispatched down to Cummins Kent for the engine upfit. 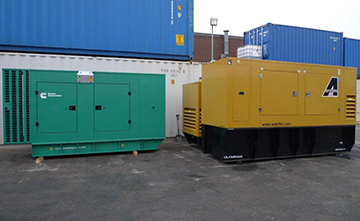 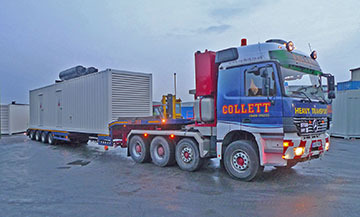 Two Cummins 825kVA diesel generators were packaged into a shipping container for export to our African client, the generators are to be installed into a shopping centre complex. 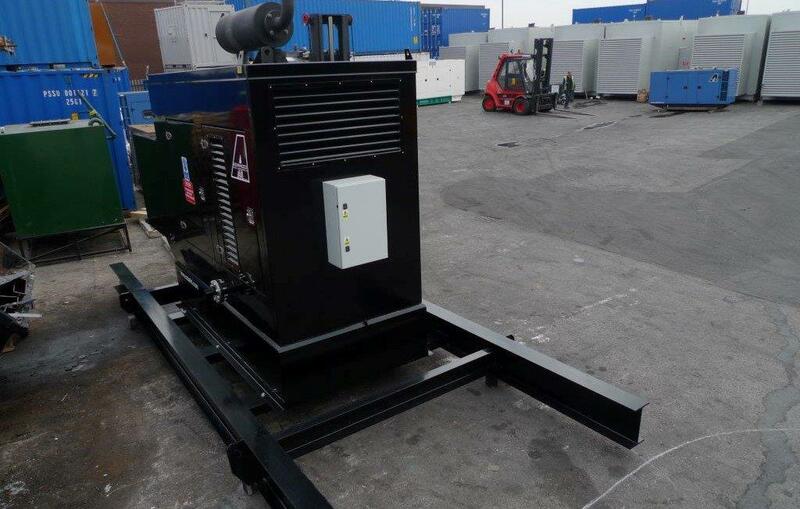 This 2016V12 MWM gas powered generator was fitted into its ADVANCED designed & built enclosure at our works, all ancillary equipment is fitted then most of it removed for shipping to site as shown in the pictures. 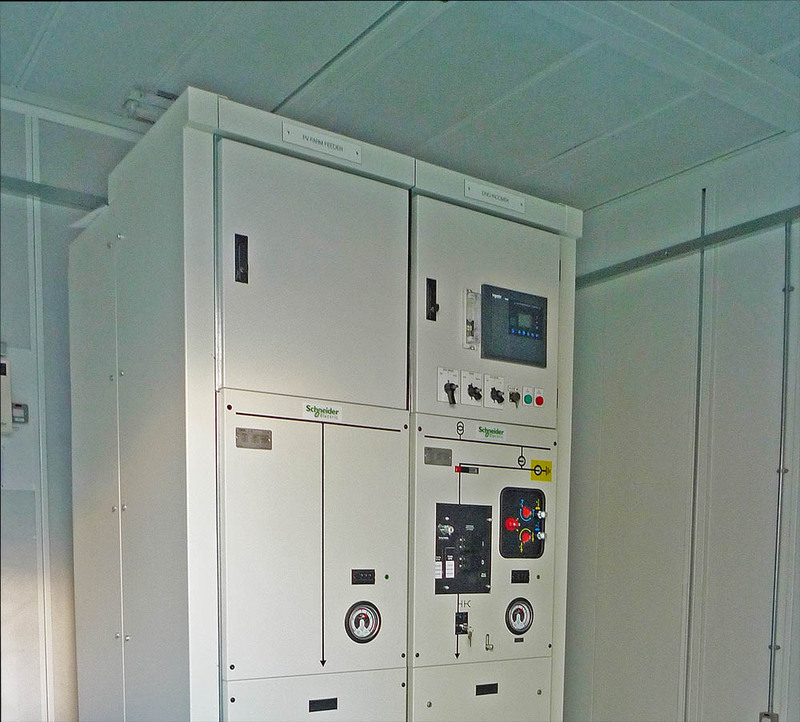 Another client is added to our portfolio for bespoke switchgear rooms, this ADVANCED designed & built 7 x 4.5 Mtr enclosure was fitted out at our works with the clients High Voltage switchgear and then despatched to a site near Newcastle. 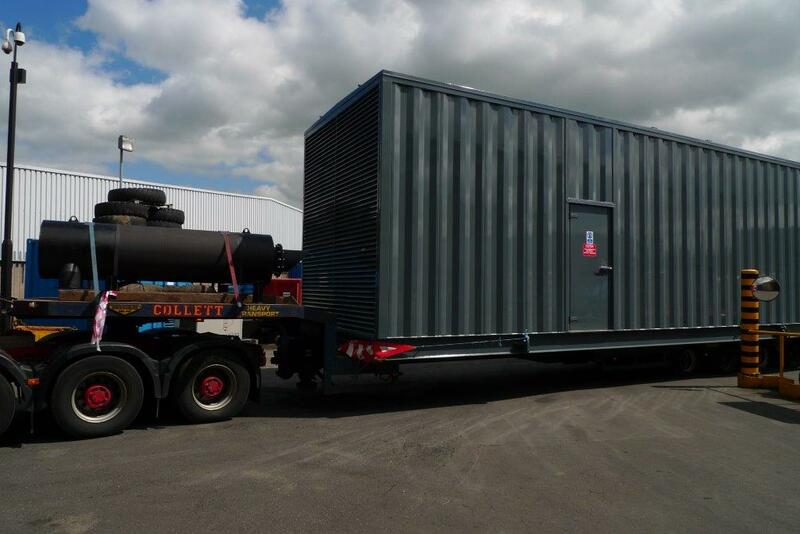 To continue on the prison power front, this ADVANCED designed & built Cummins C1100 containerised 65dBA @ 1 metre generator and associated bulk fuel tank was dispatched to a government prison near Hemel Hempstead. 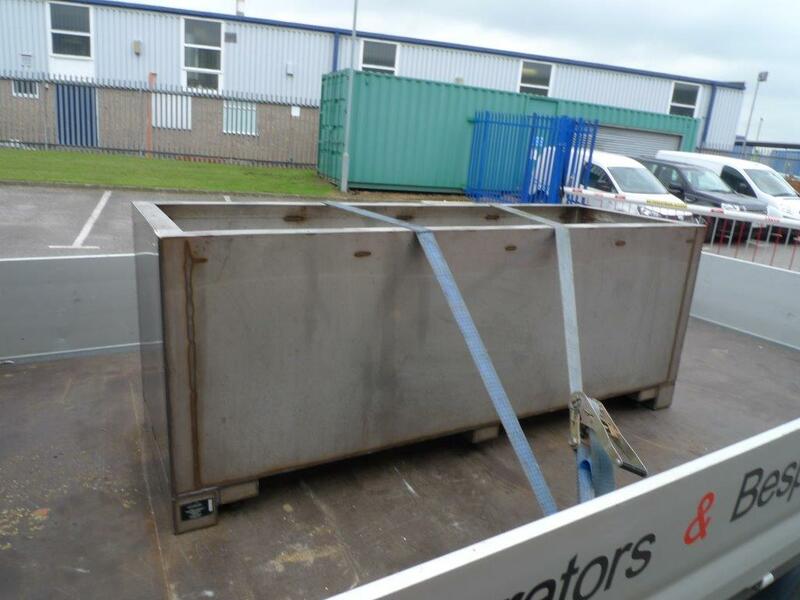 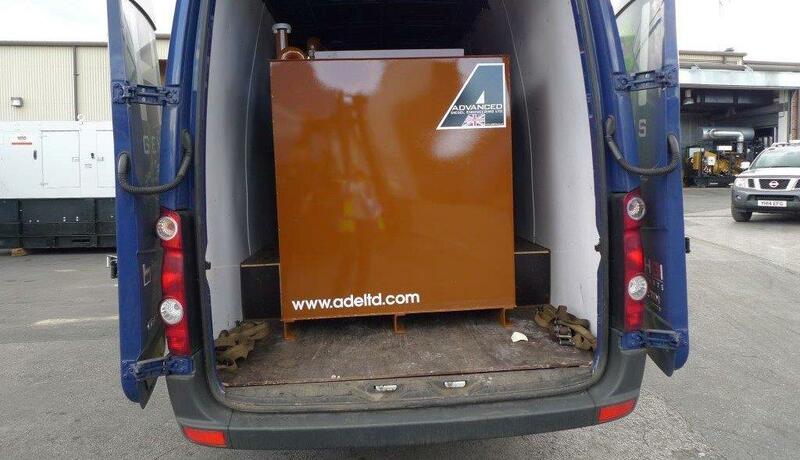 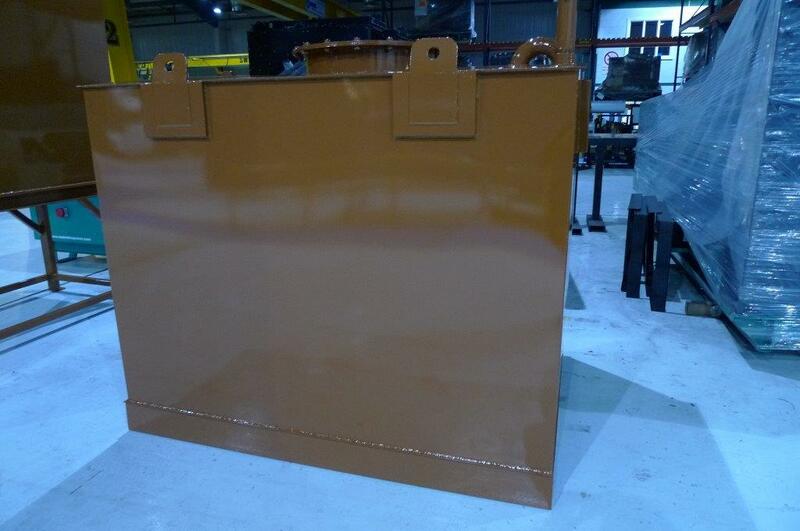 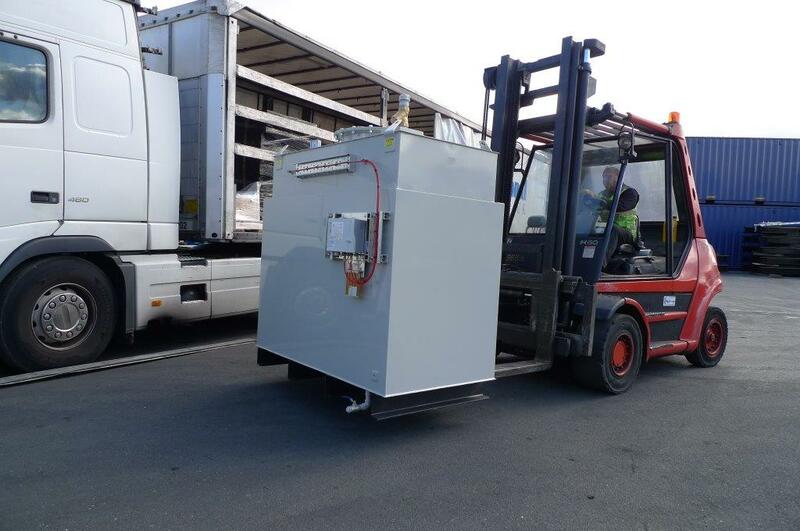 Yet another double skinned fuel tank is dispatched from ADVANCED, a 550 Litre day tank with fuel fill cabinet ! 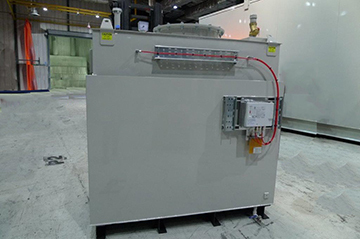 The first of hopefully many in a new relationship with ABB, an ADVANCED Designed 9.5 X 4 X 3.5 Mtr switchgear enclosure for a petrochemical plant in Wilton . 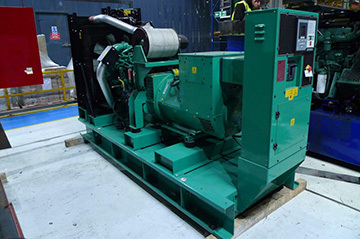 This Cummins 900kVA open diesel generator and associated plant room equipment is currently being installed at the bank of New York in the UK. 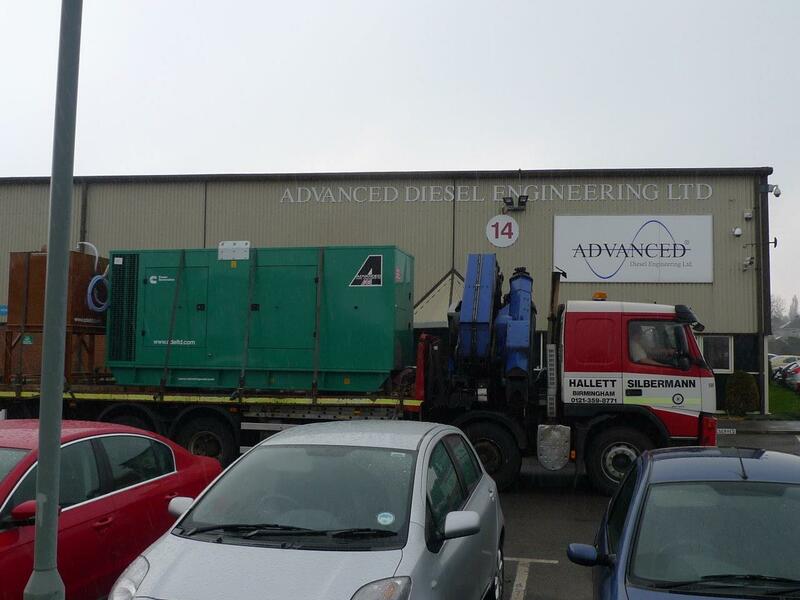 With that being the last dispatch for April we feel we have had a good month all round. 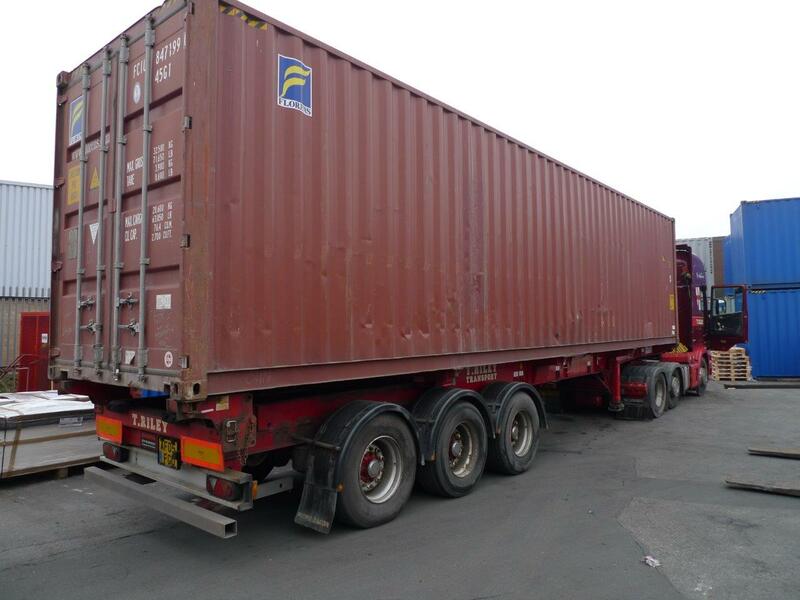 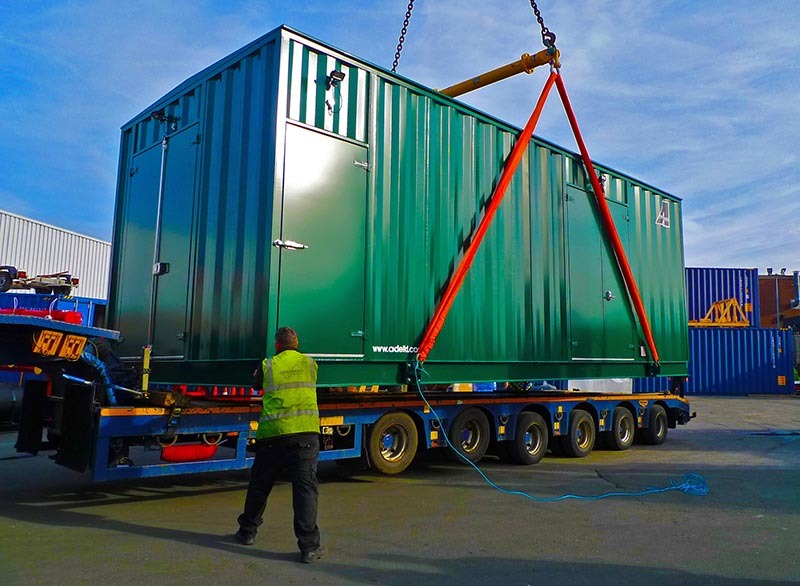 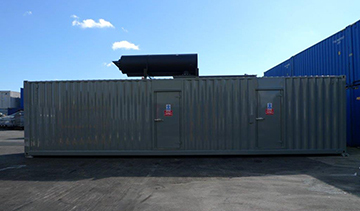 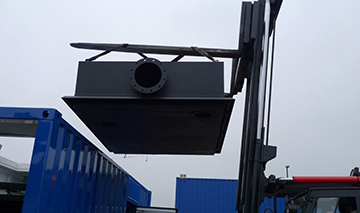 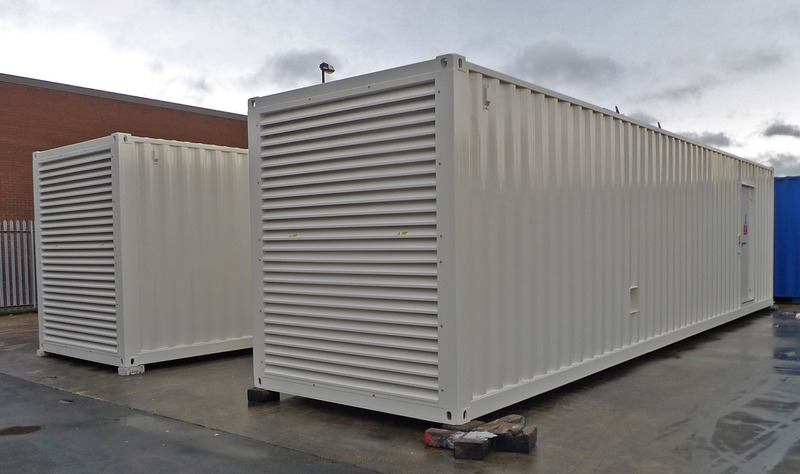 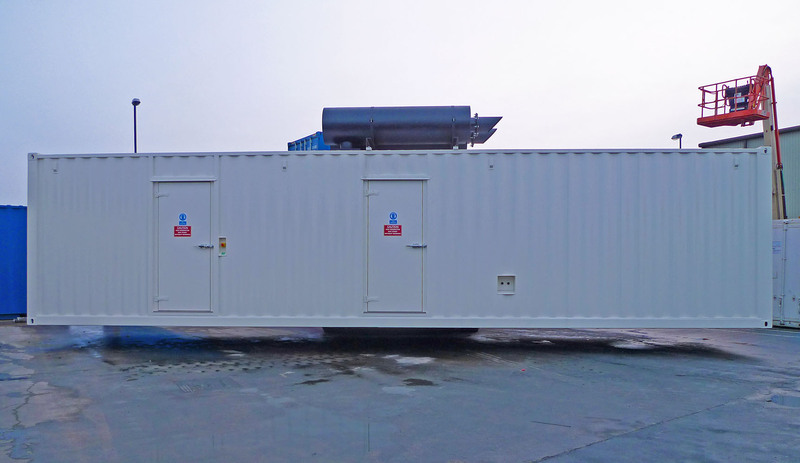 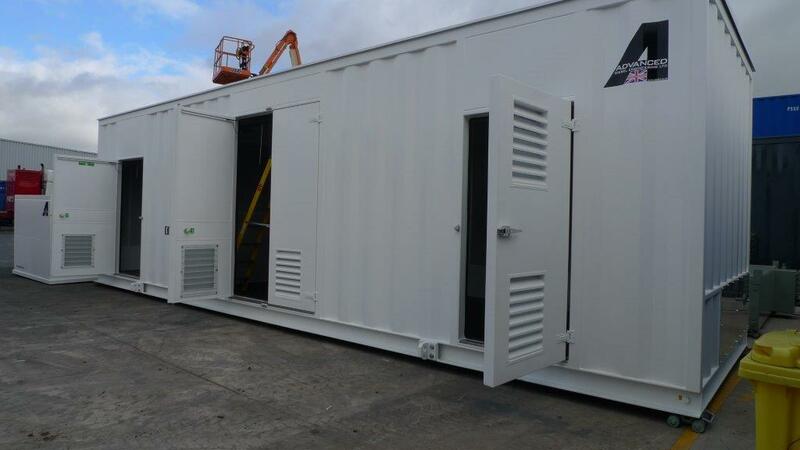 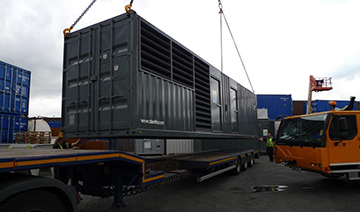 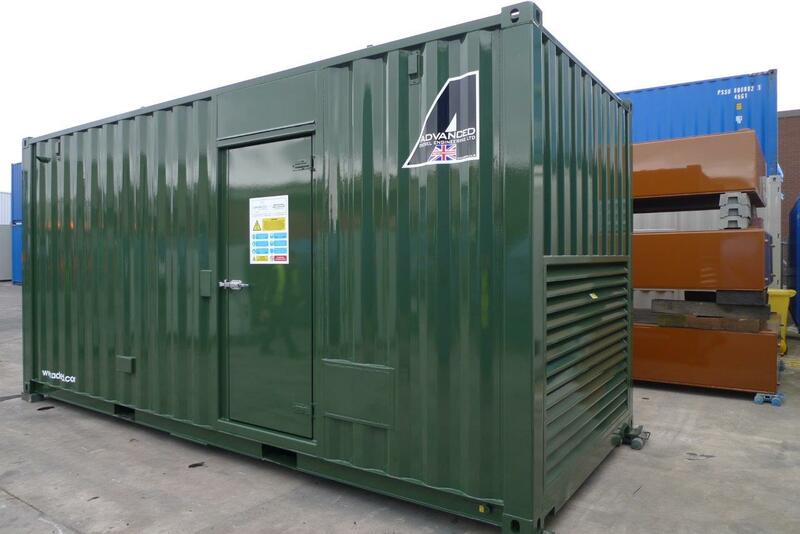 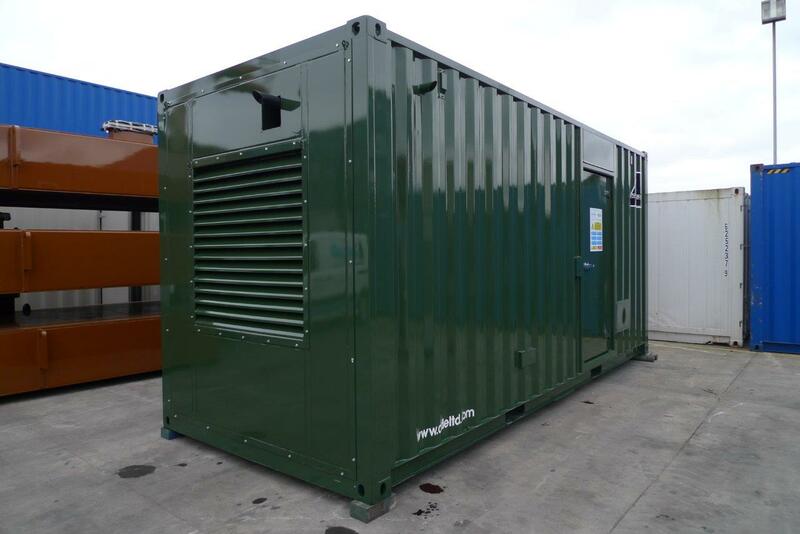 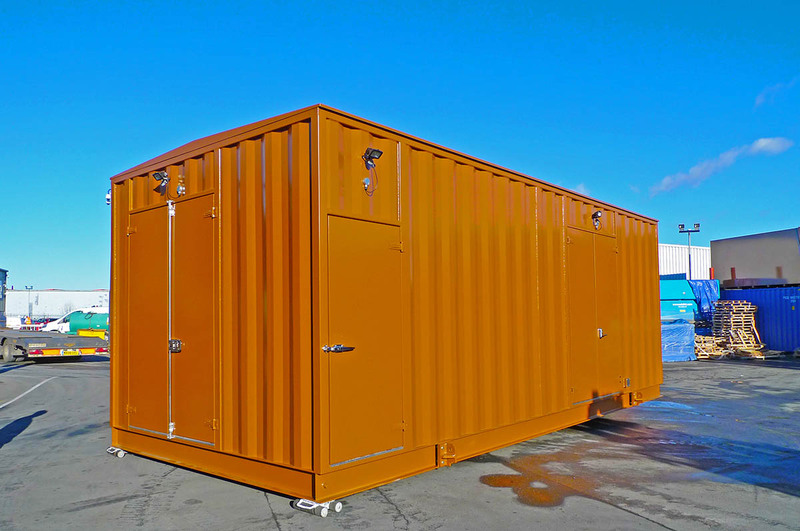 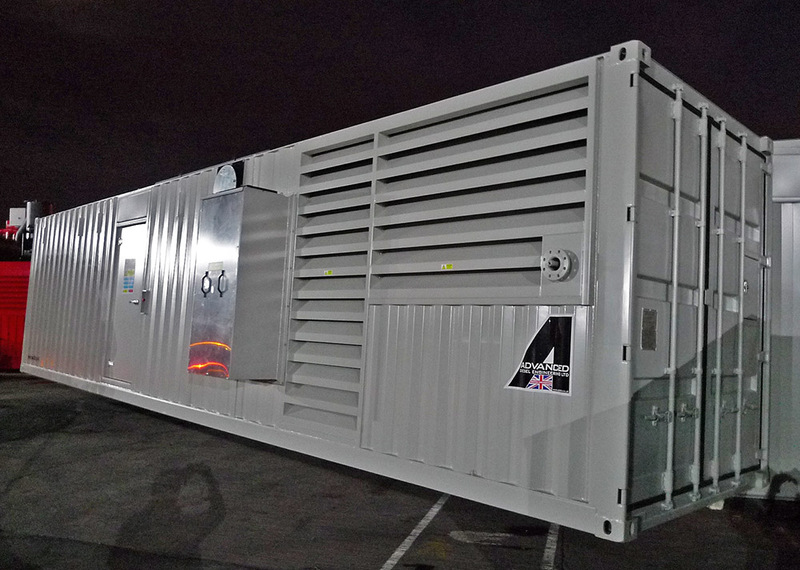 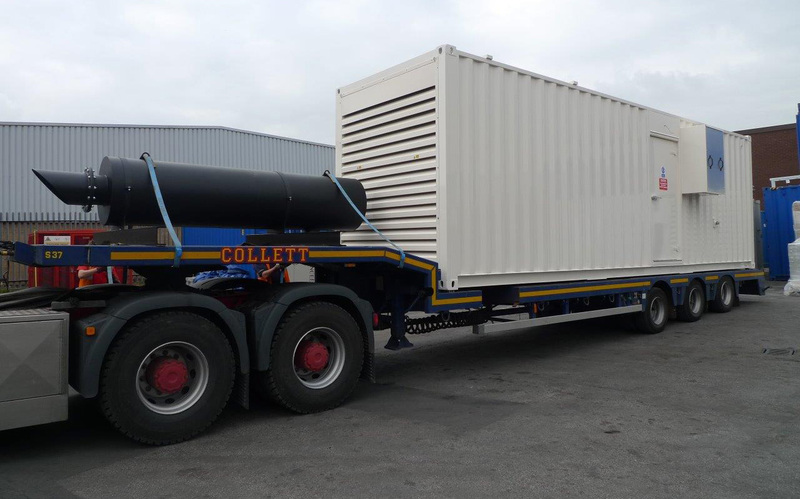 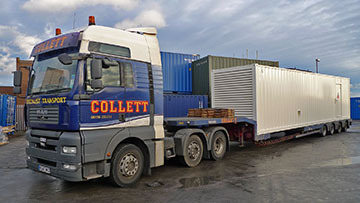 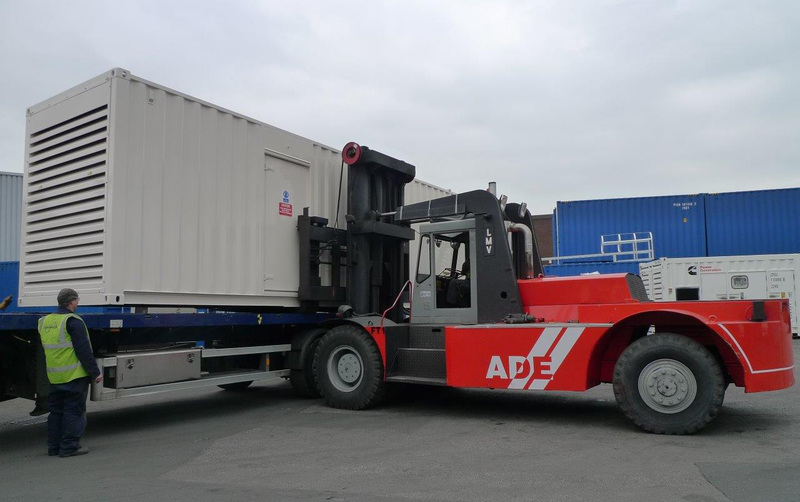 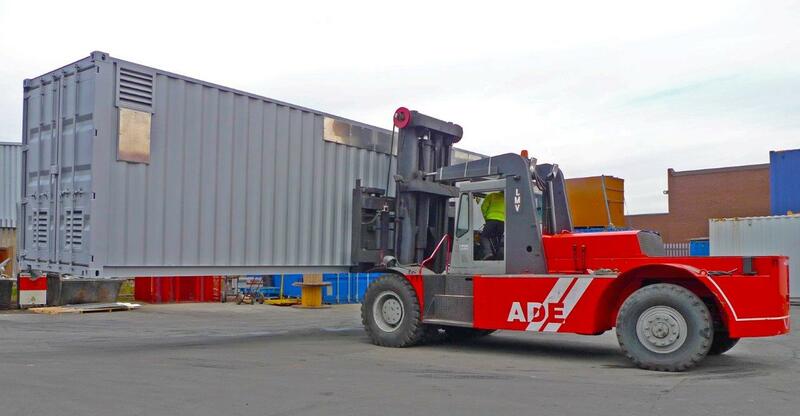 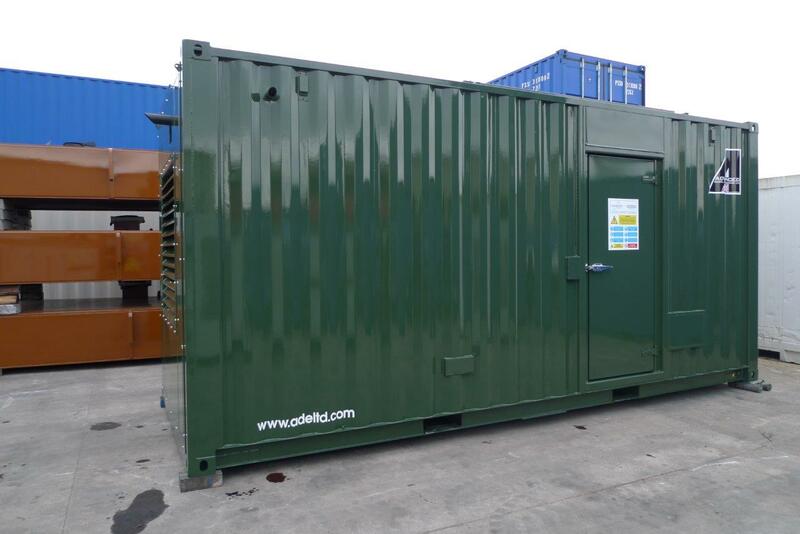 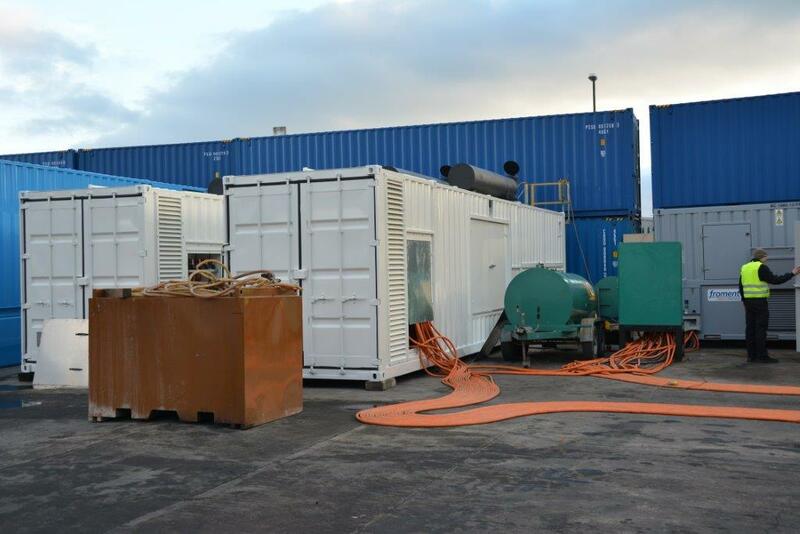 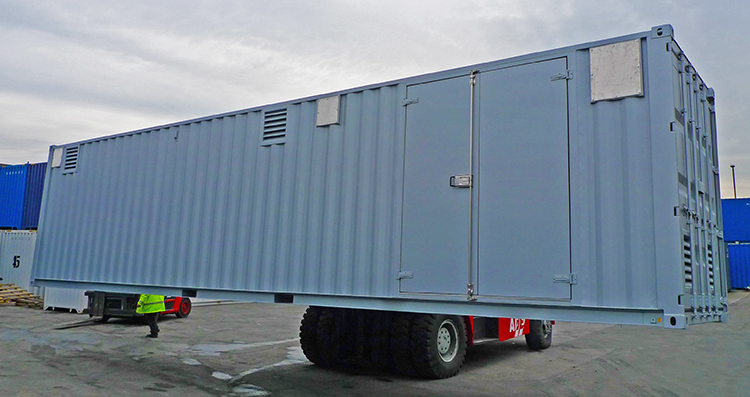 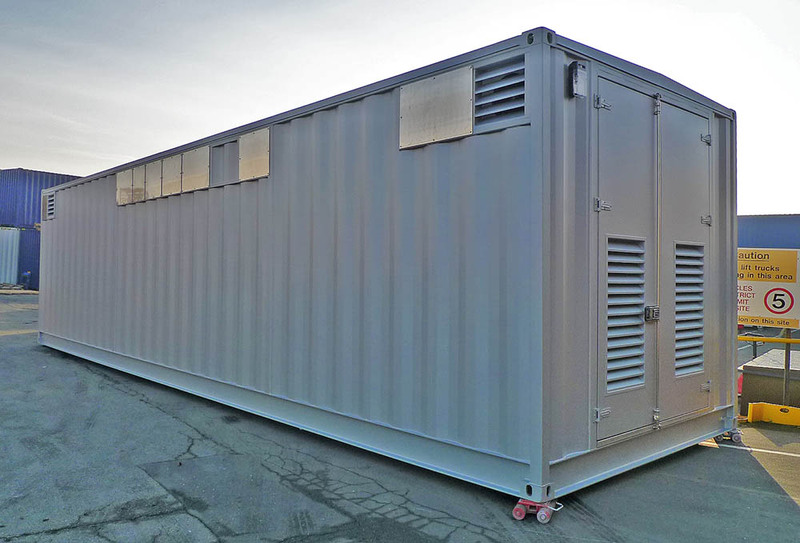 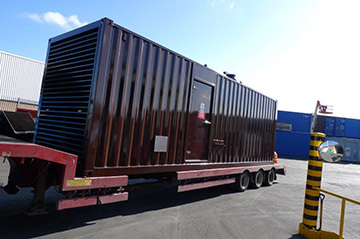 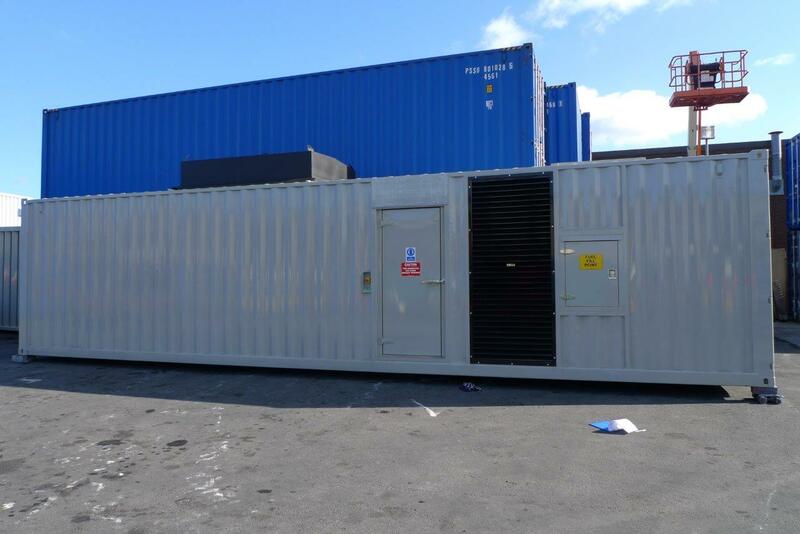 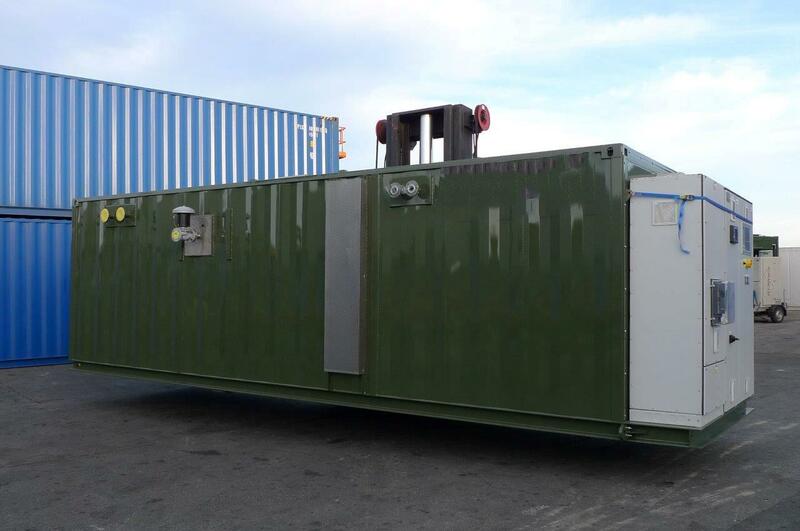 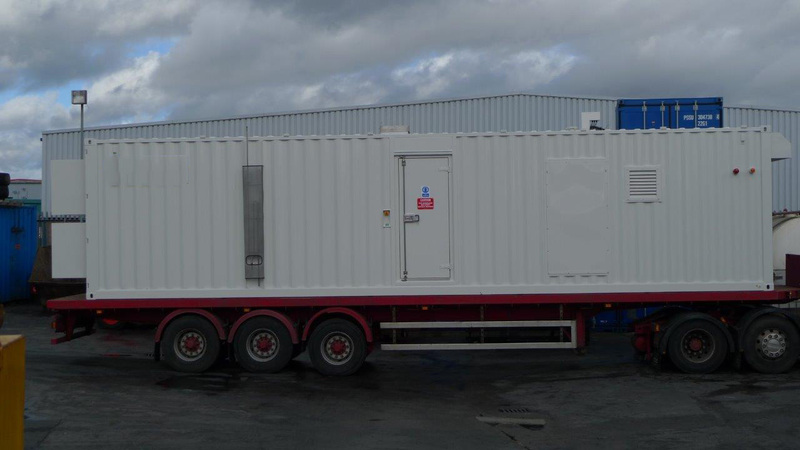 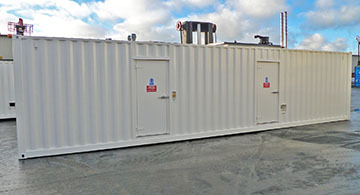 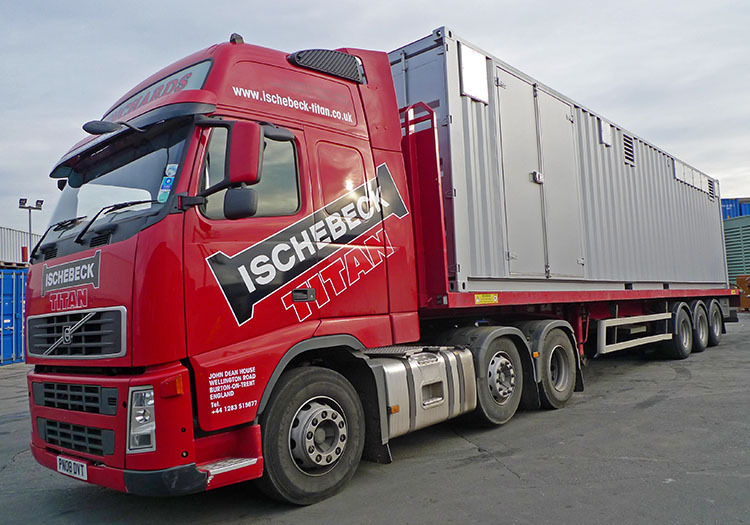 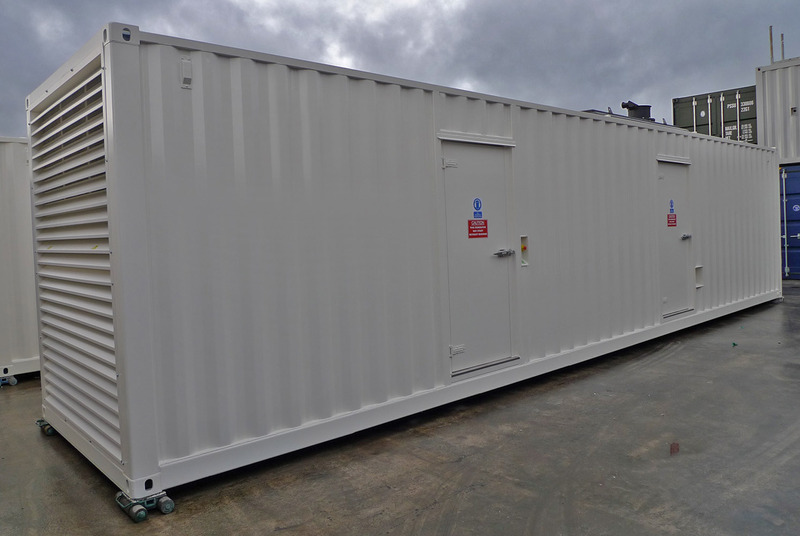 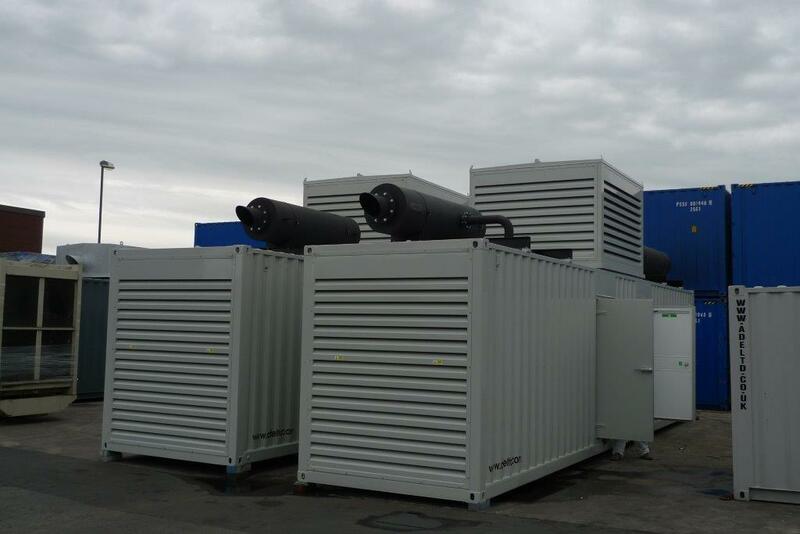 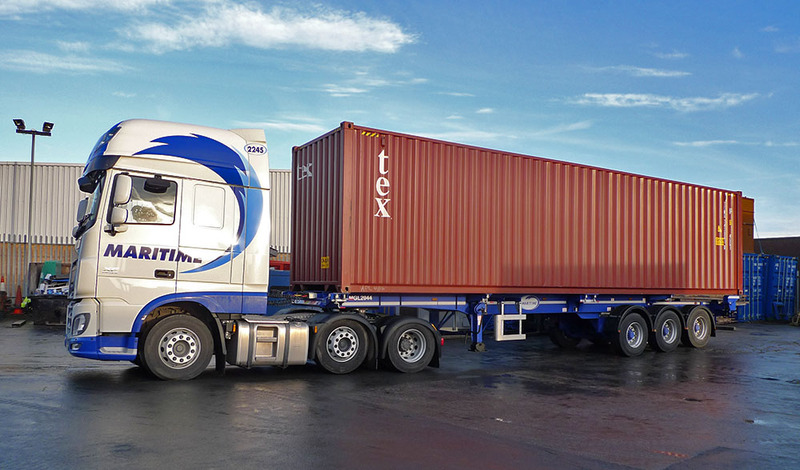 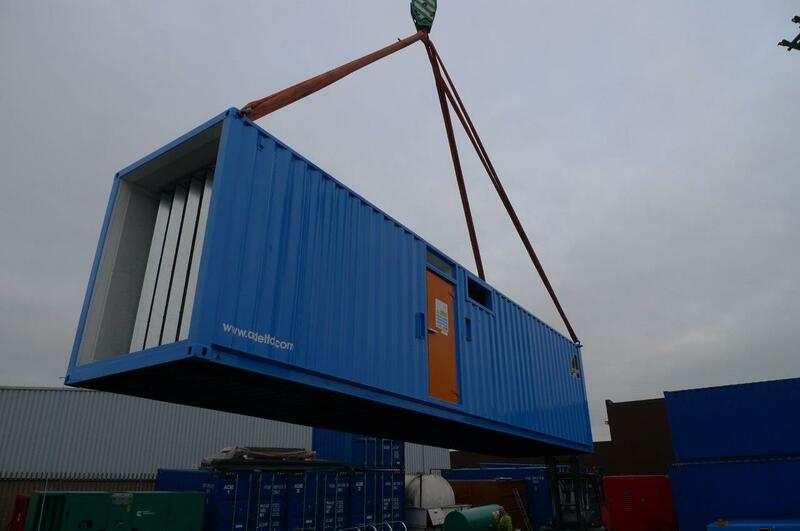 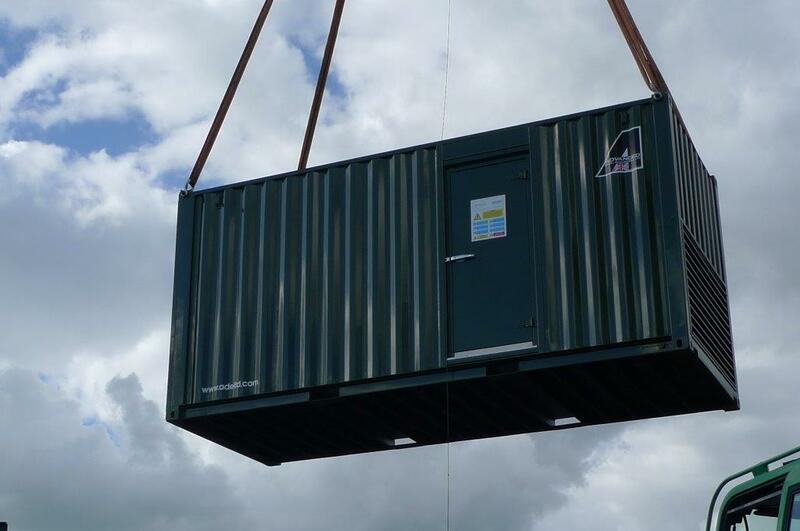 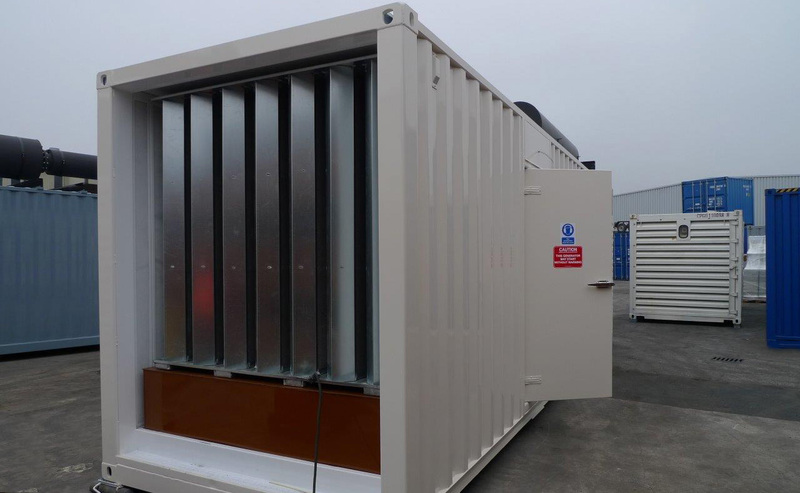 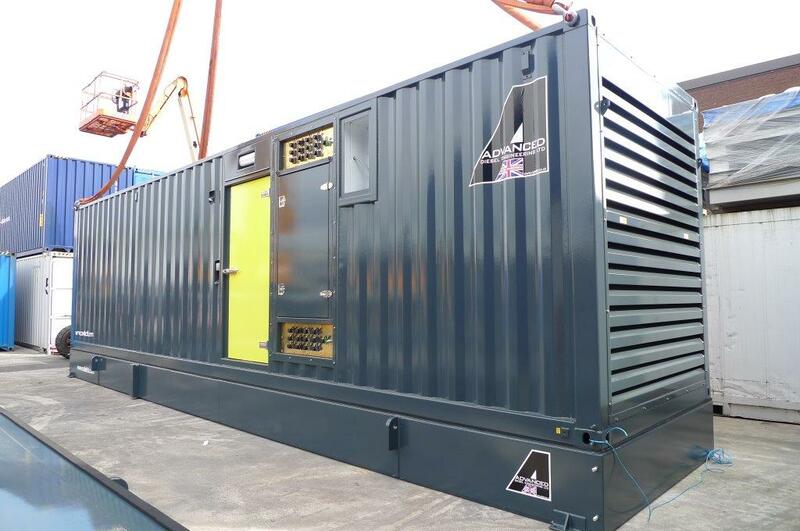 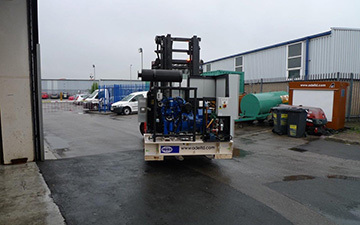 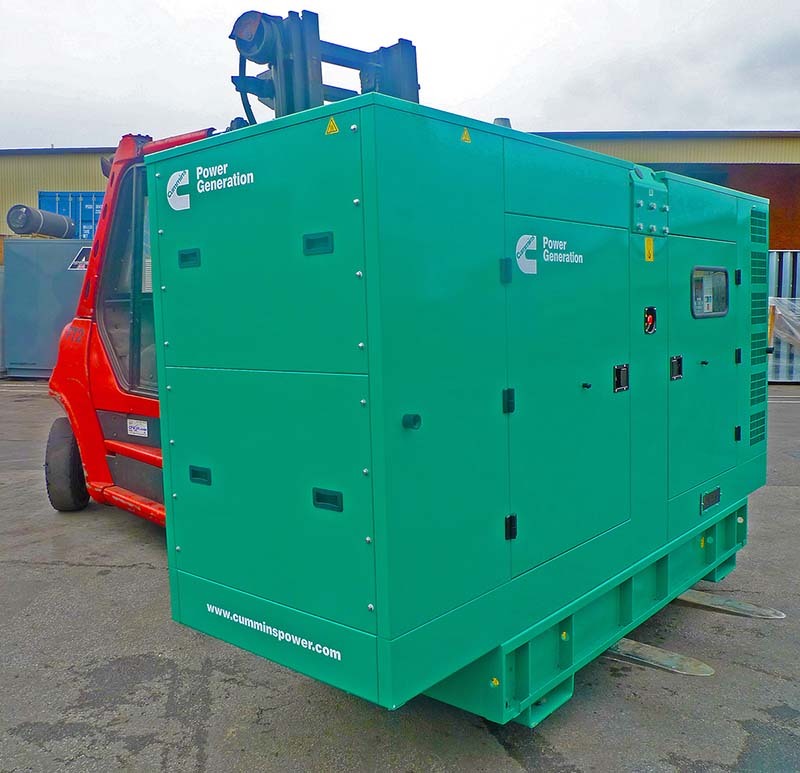 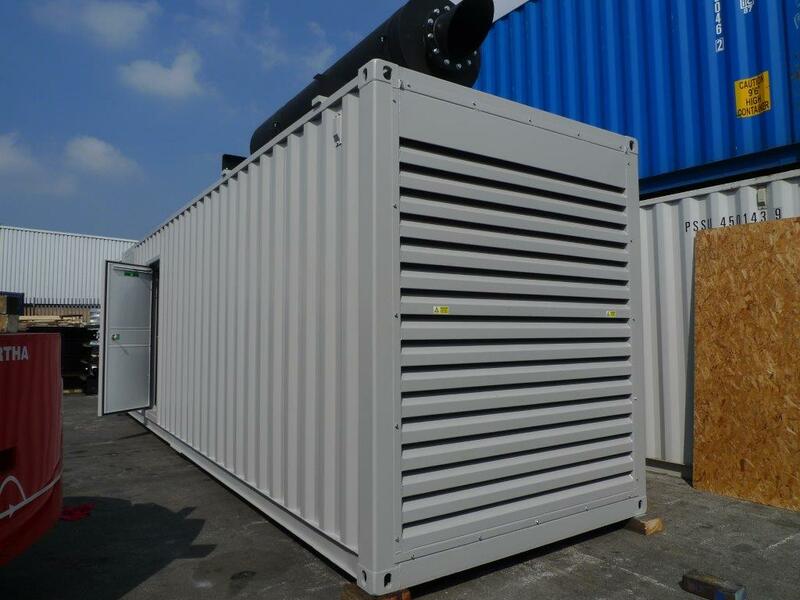 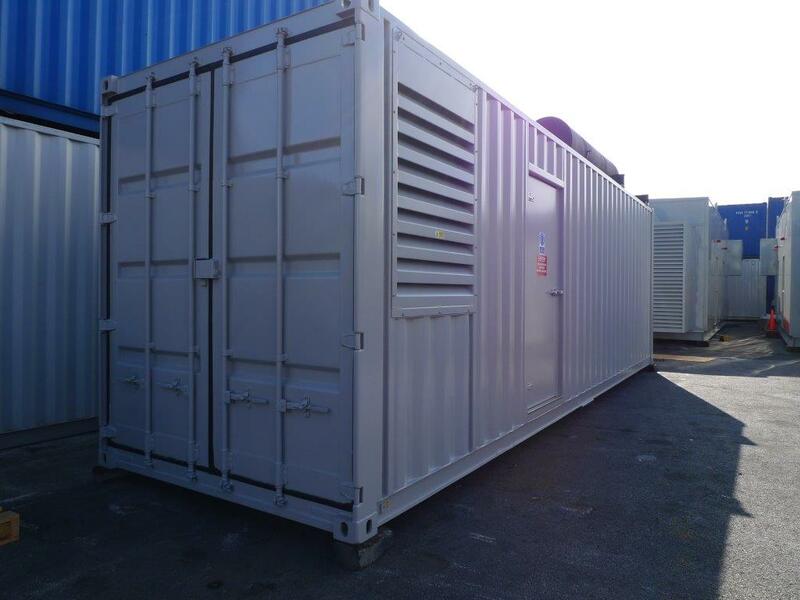 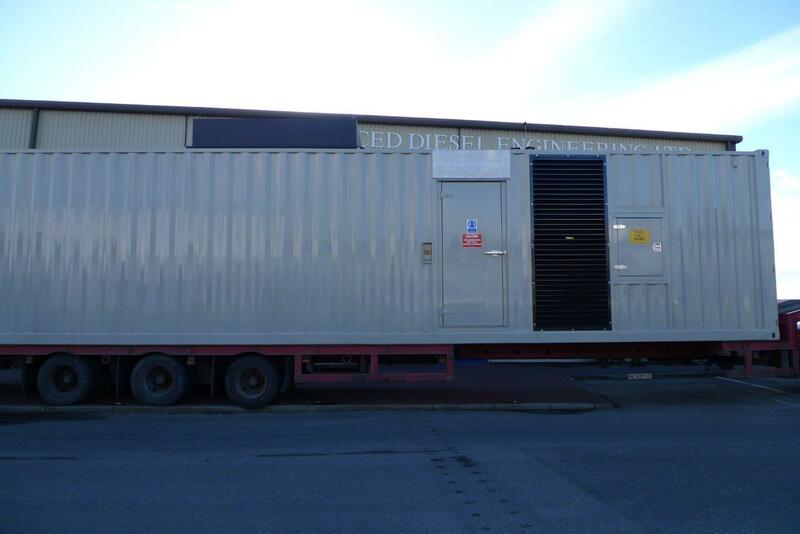 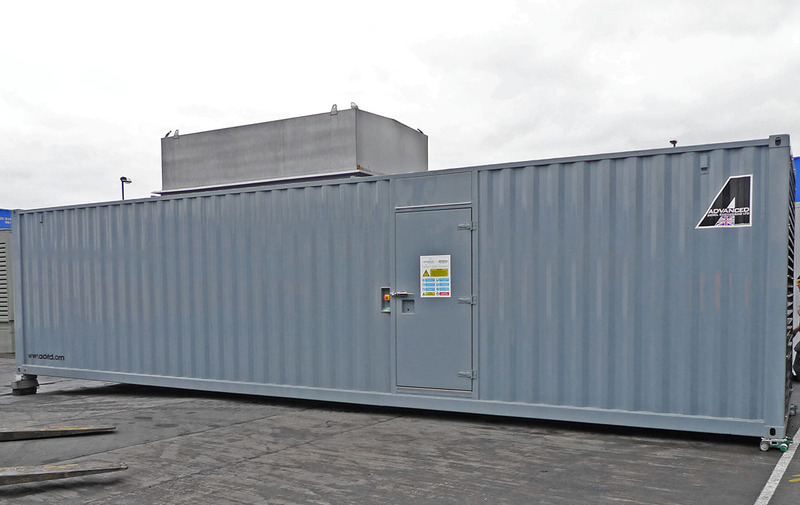 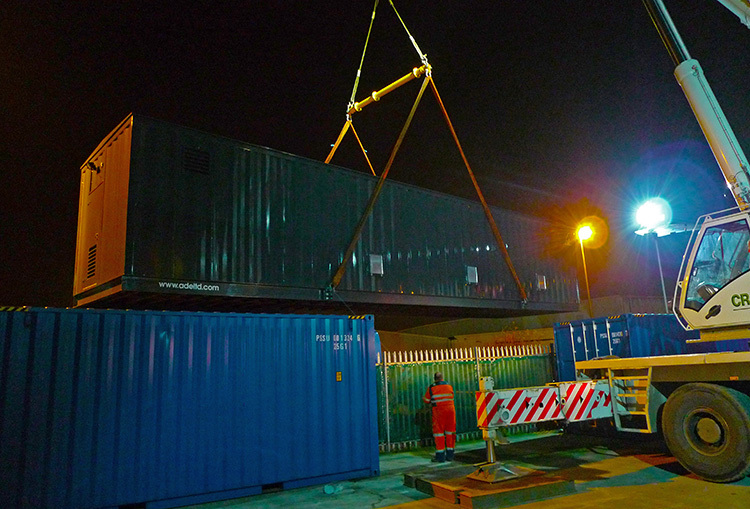 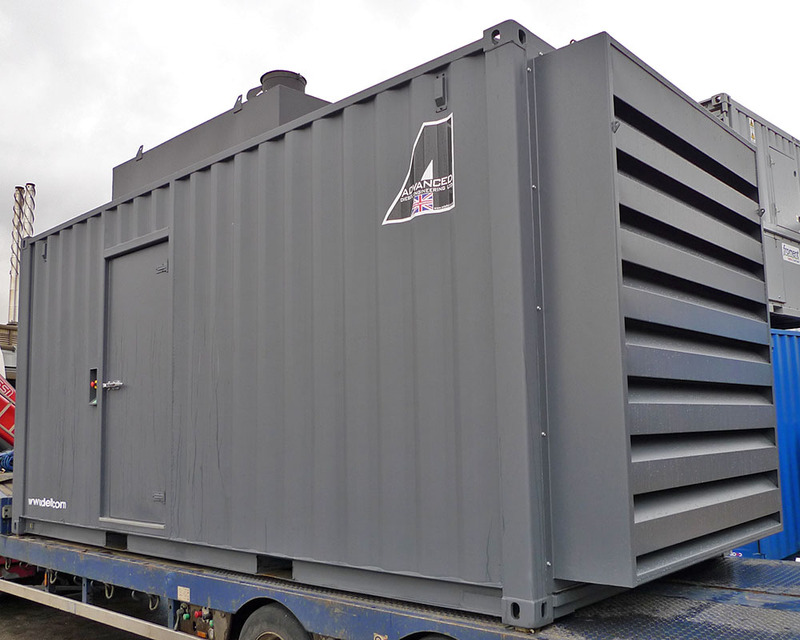 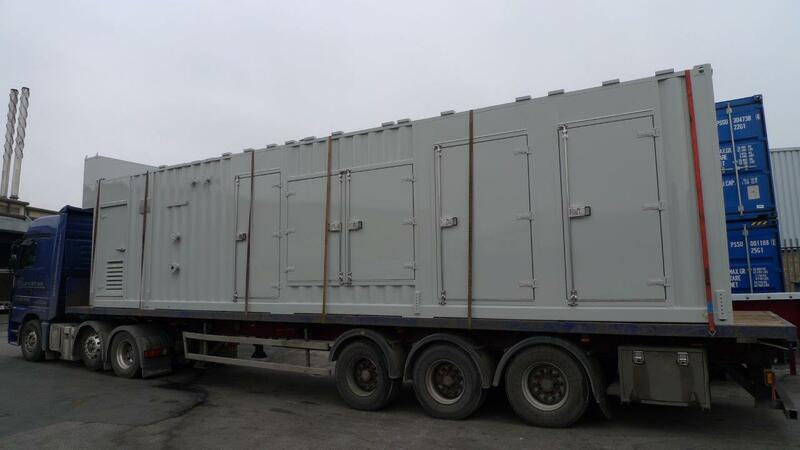 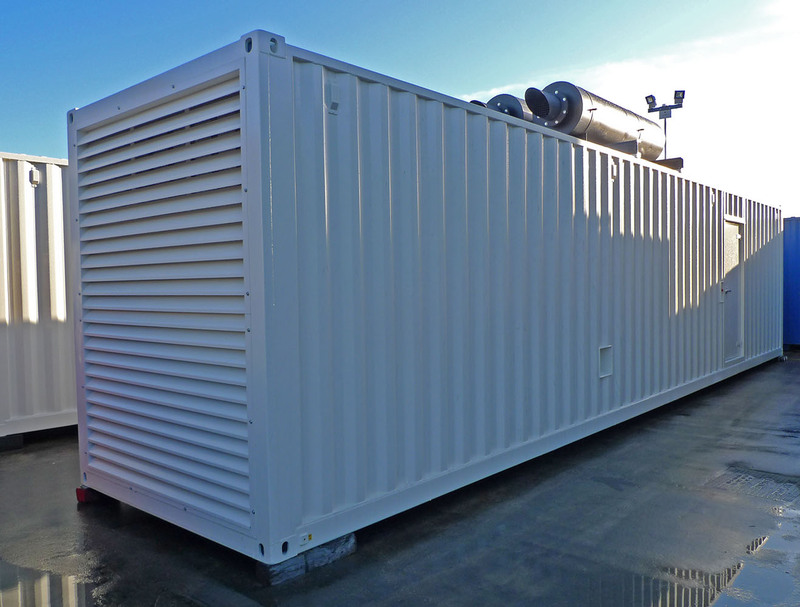 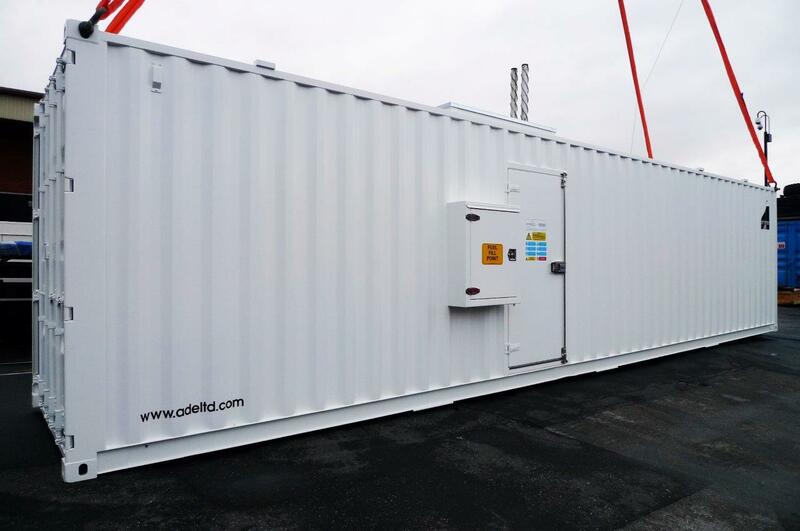 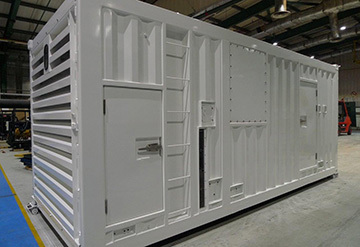 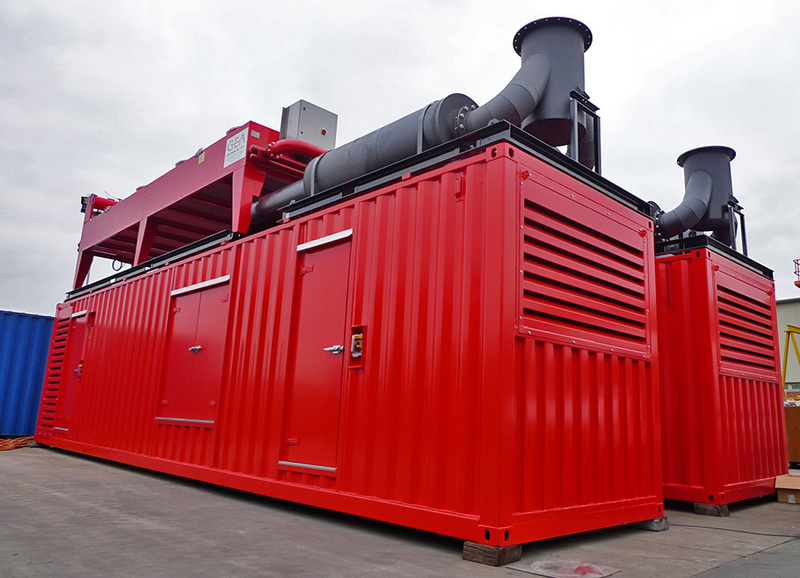 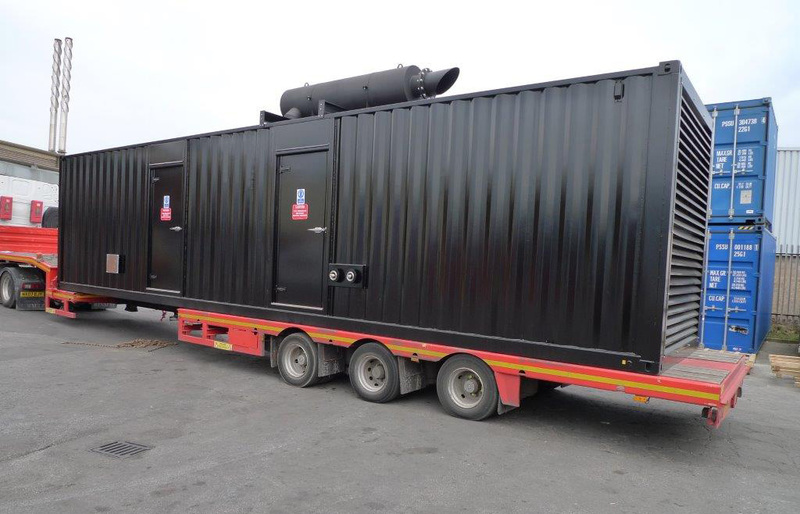 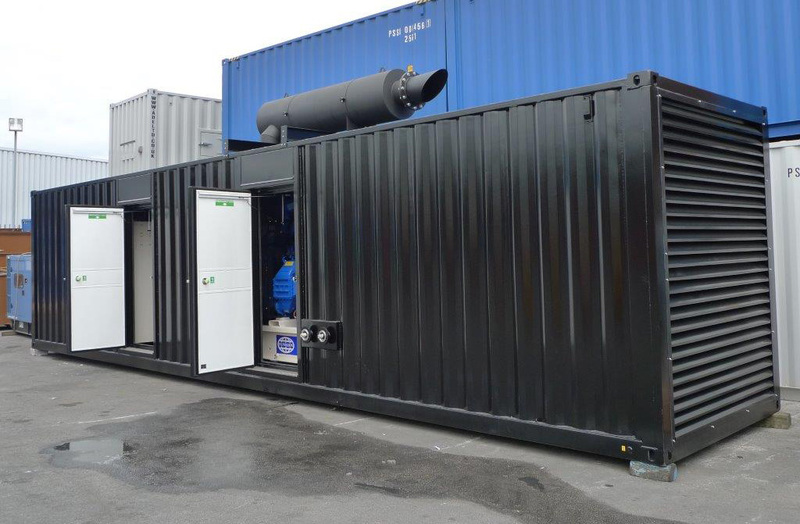 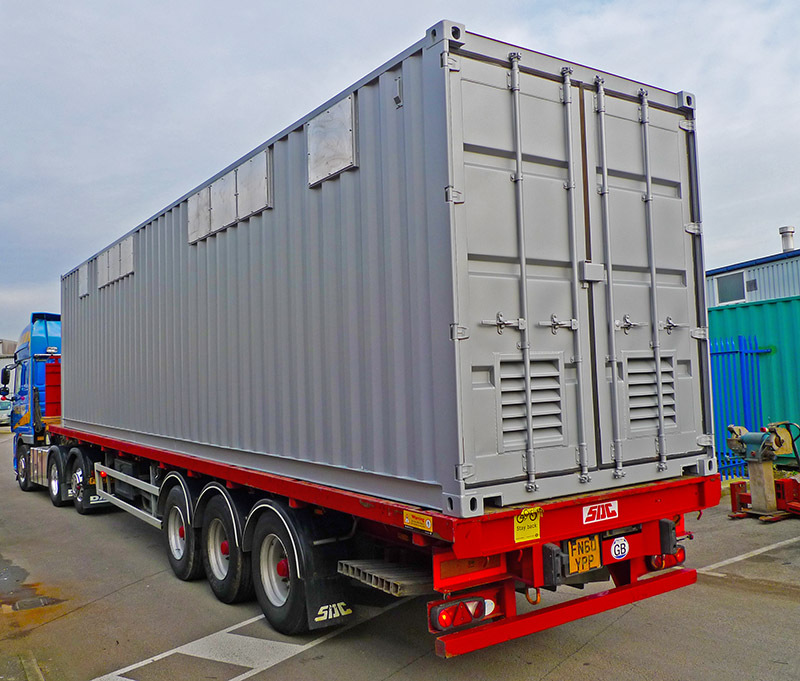 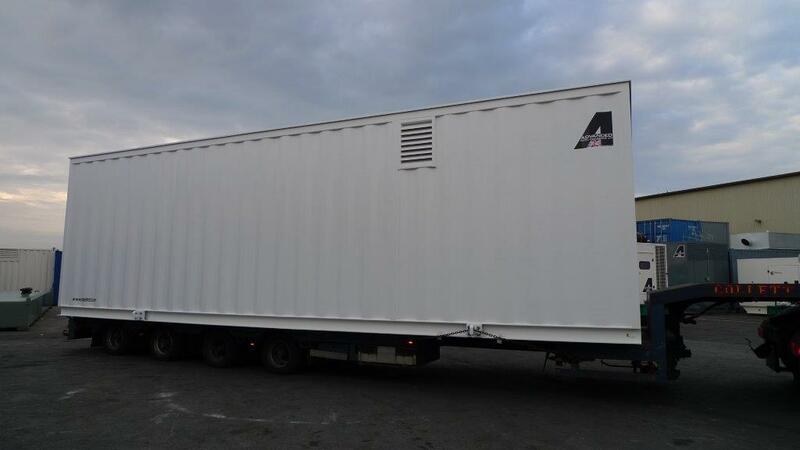 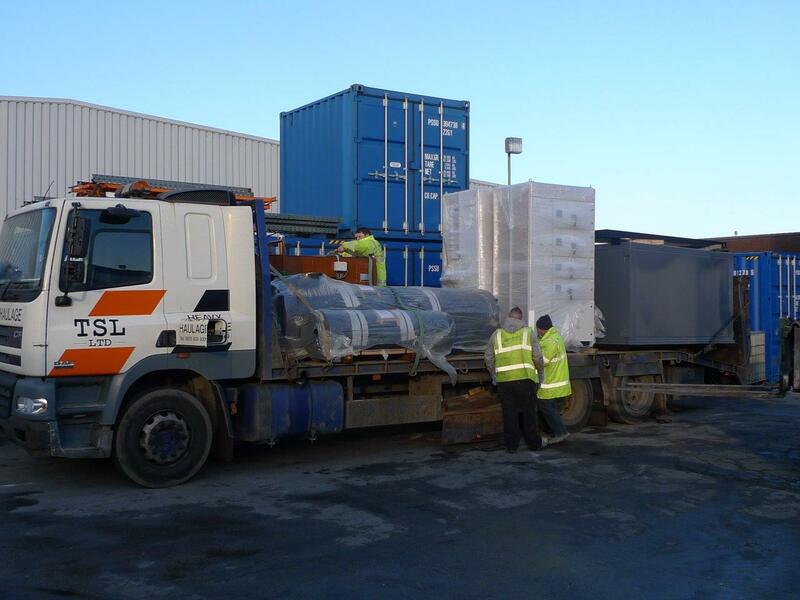 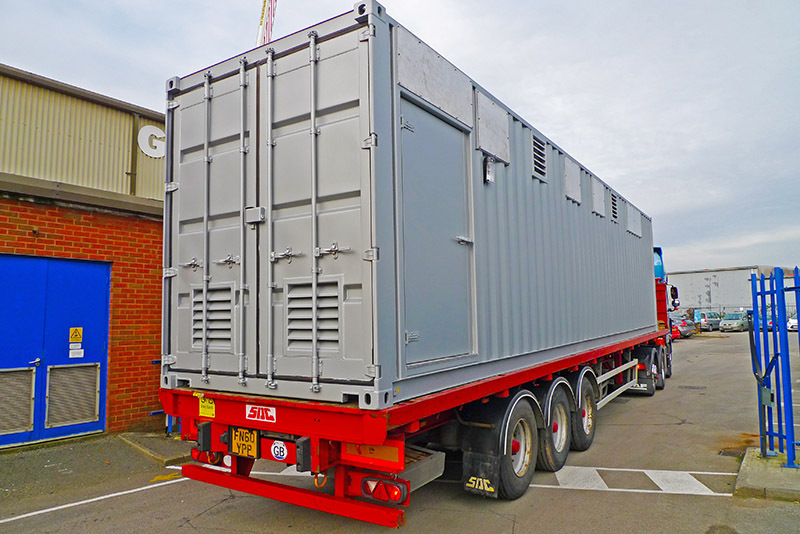 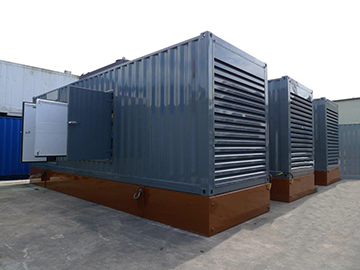 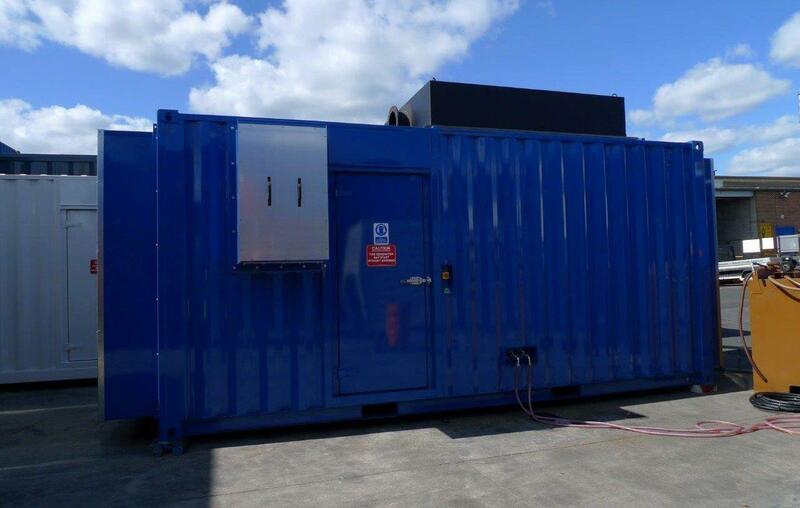 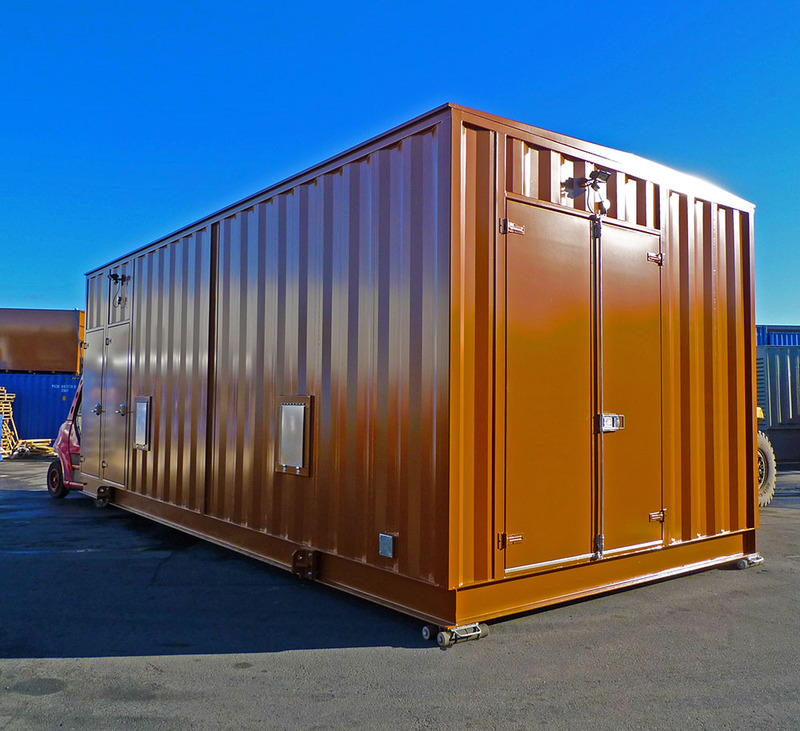 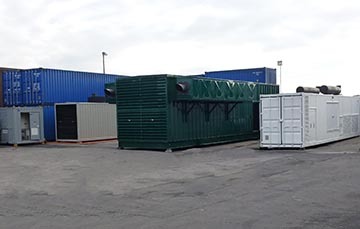 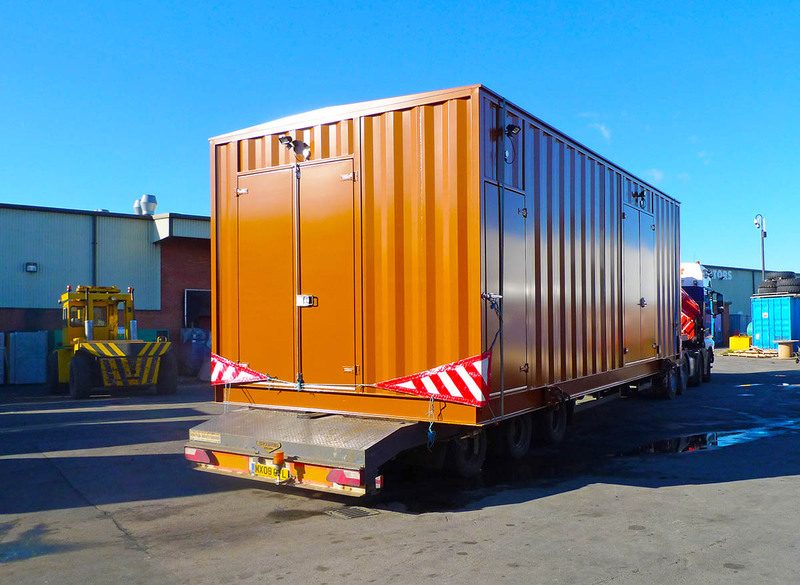 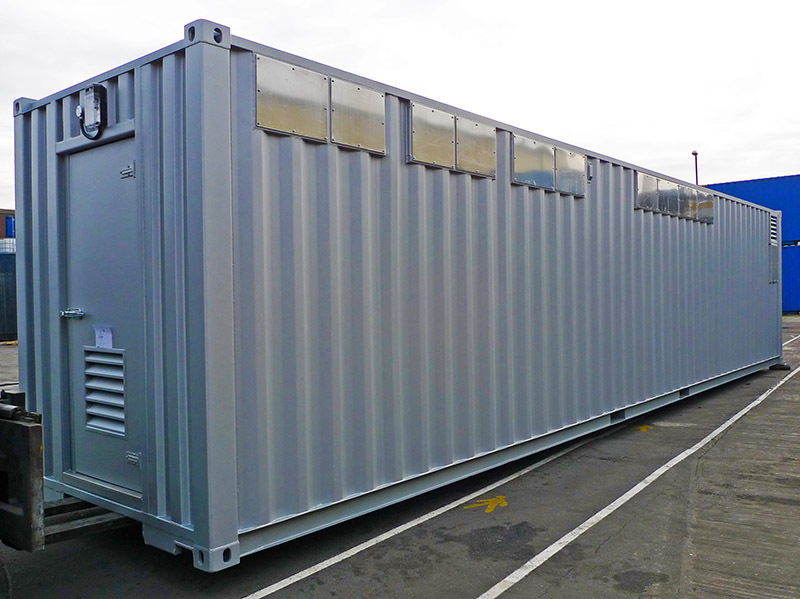 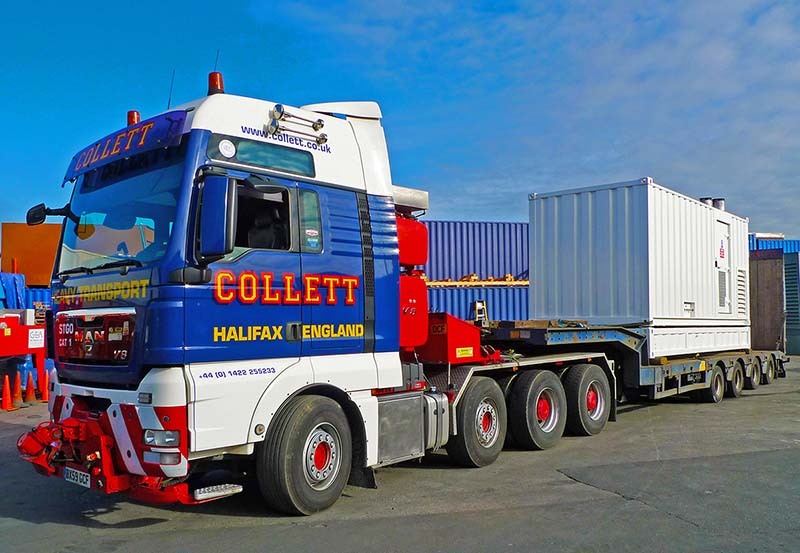 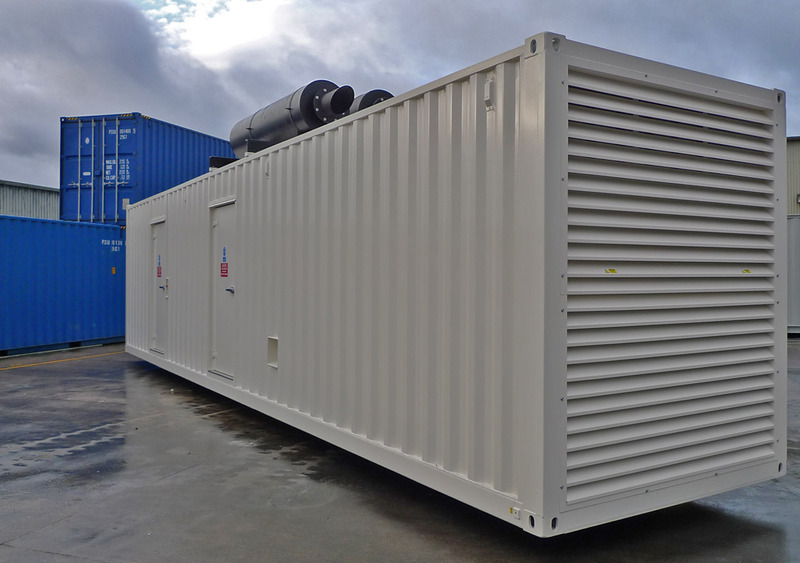 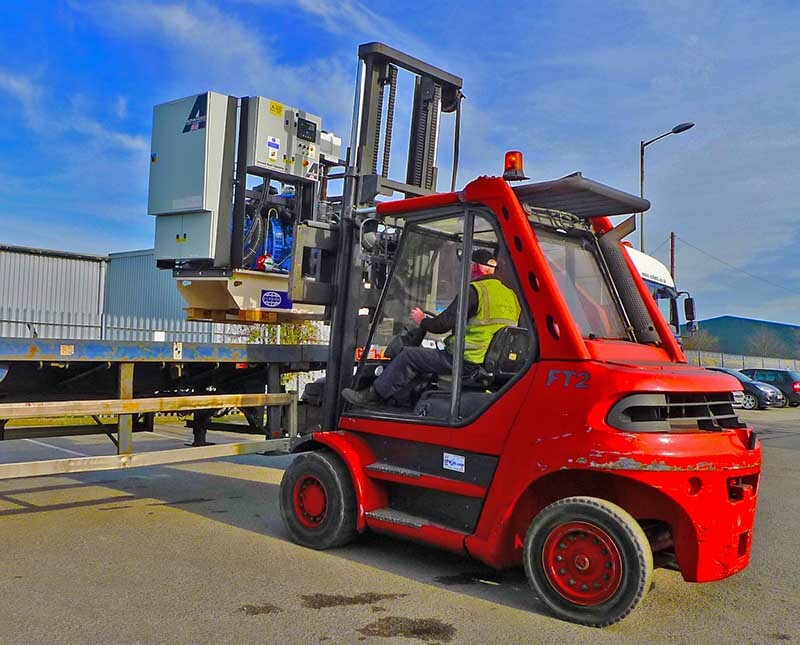 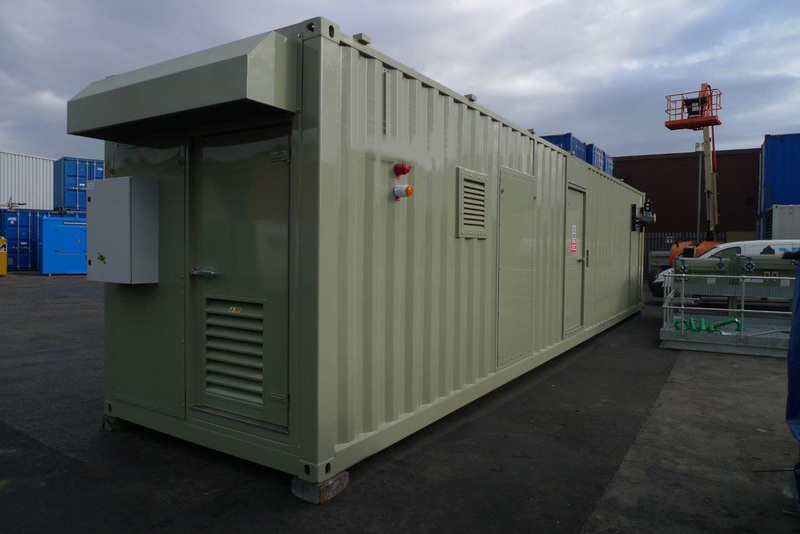 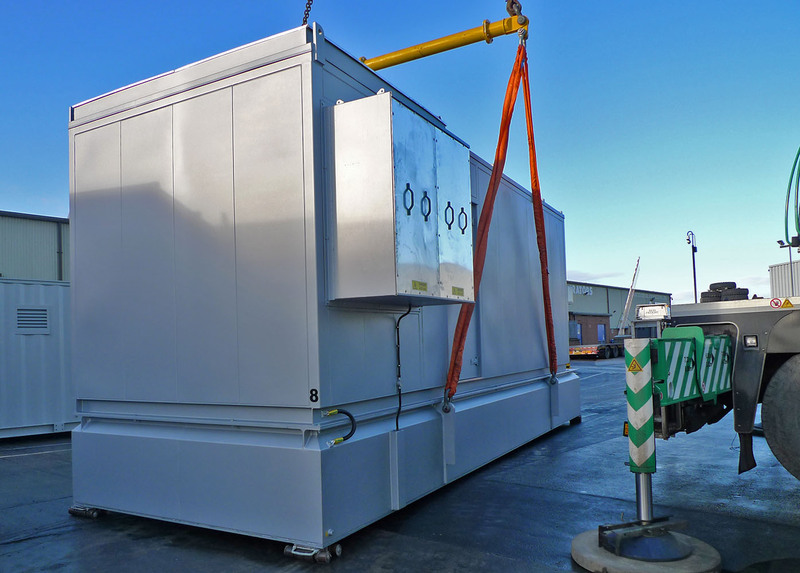 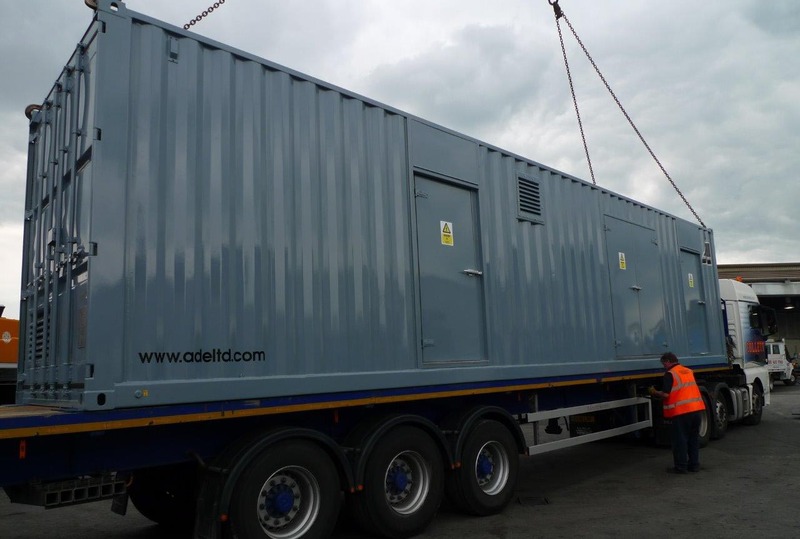 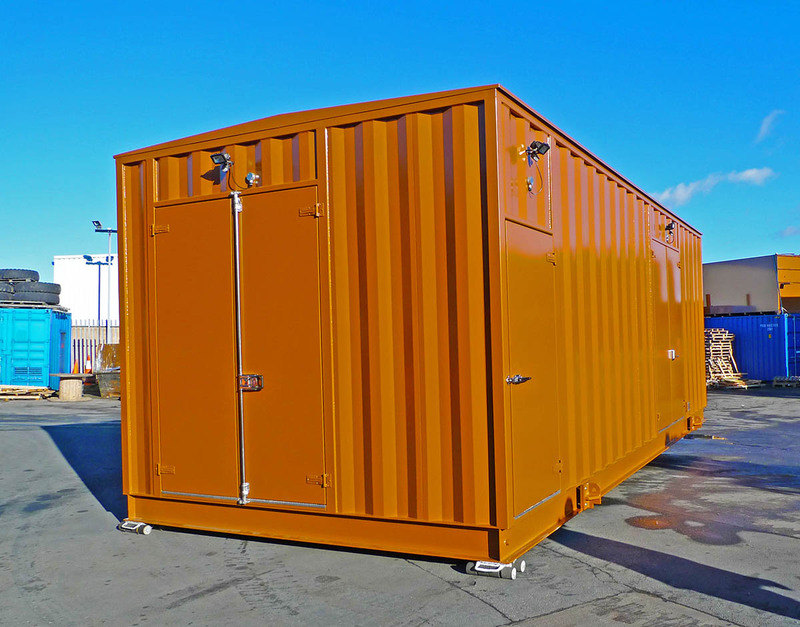 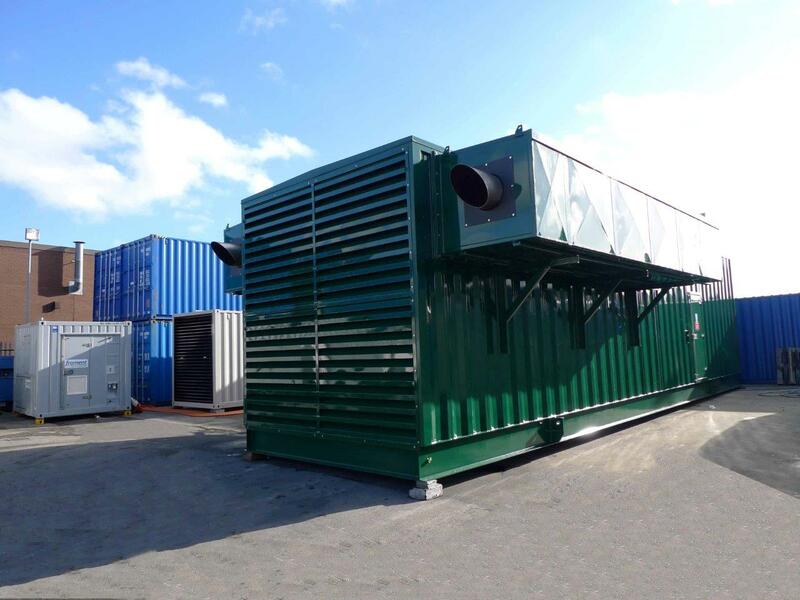 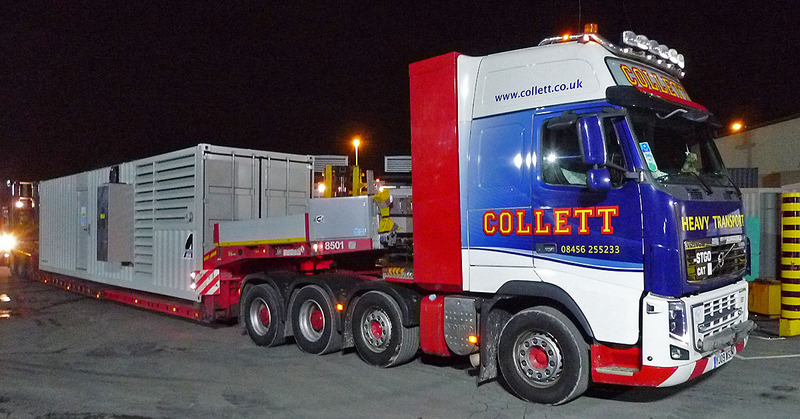 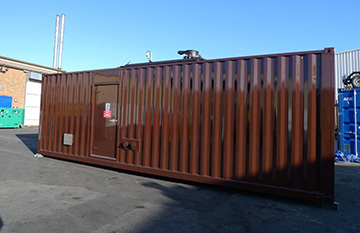 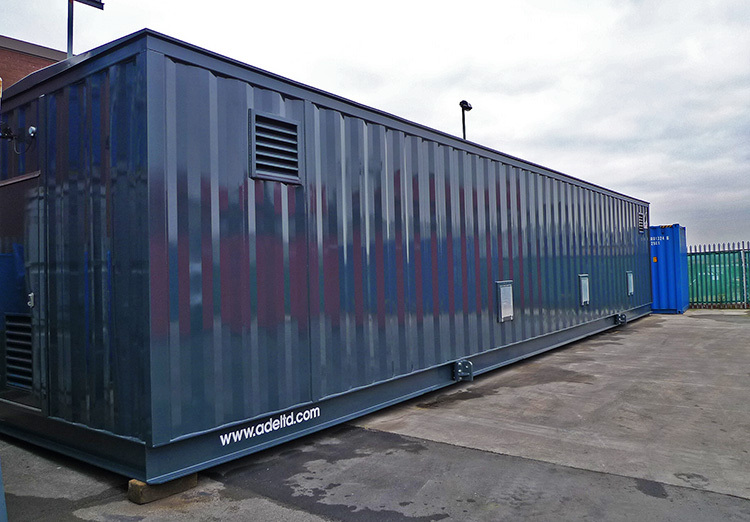 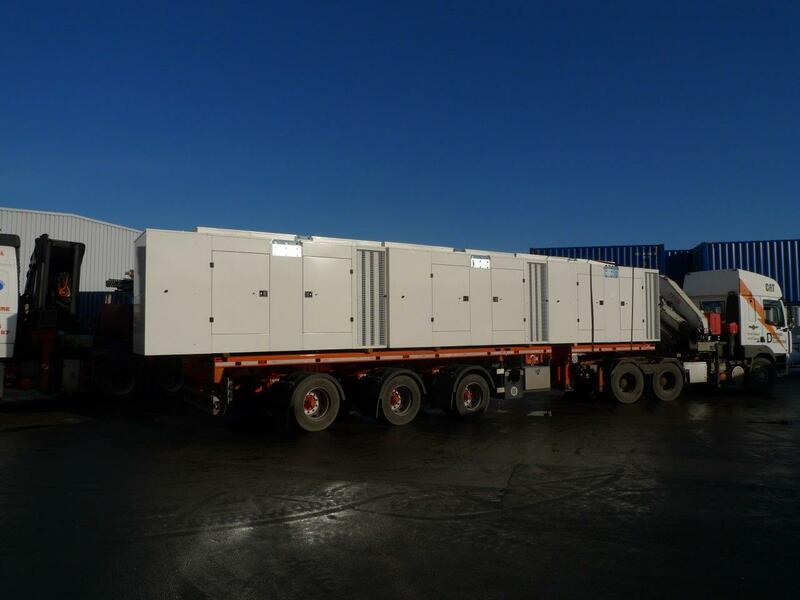 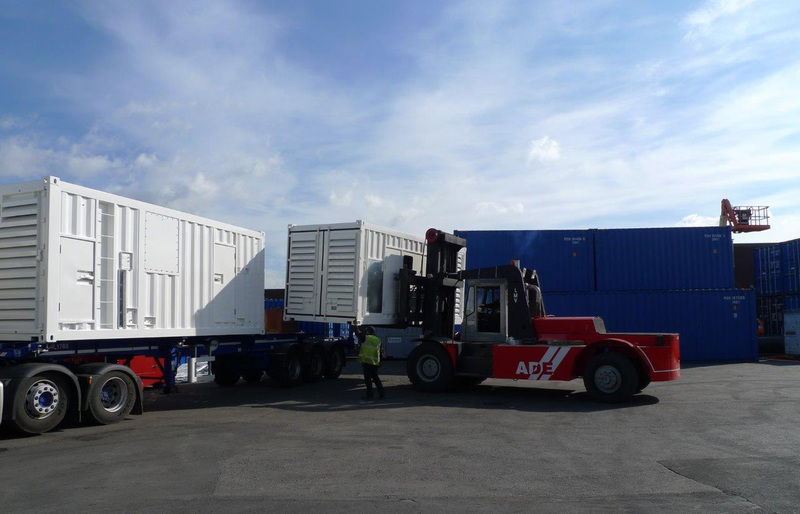 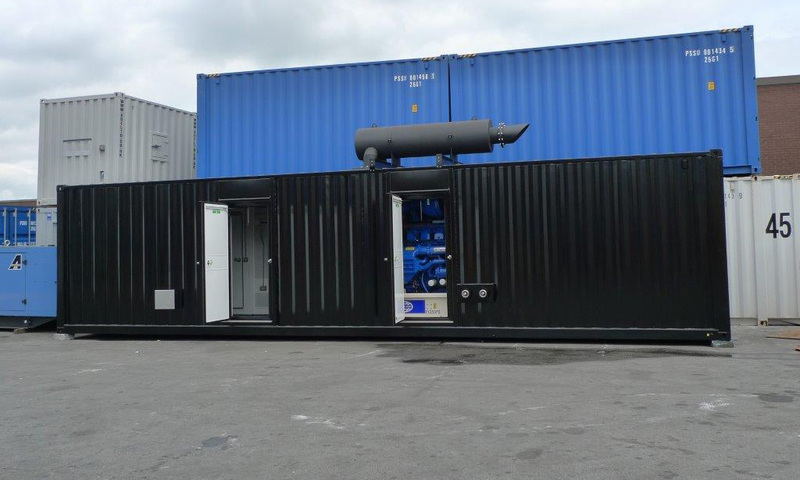 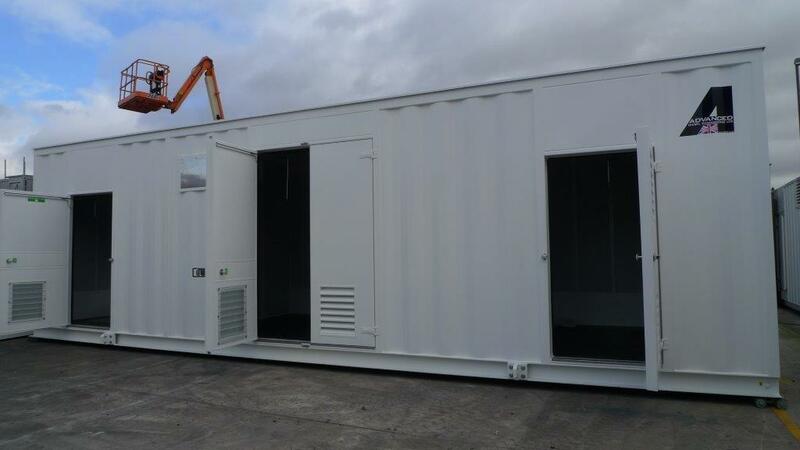 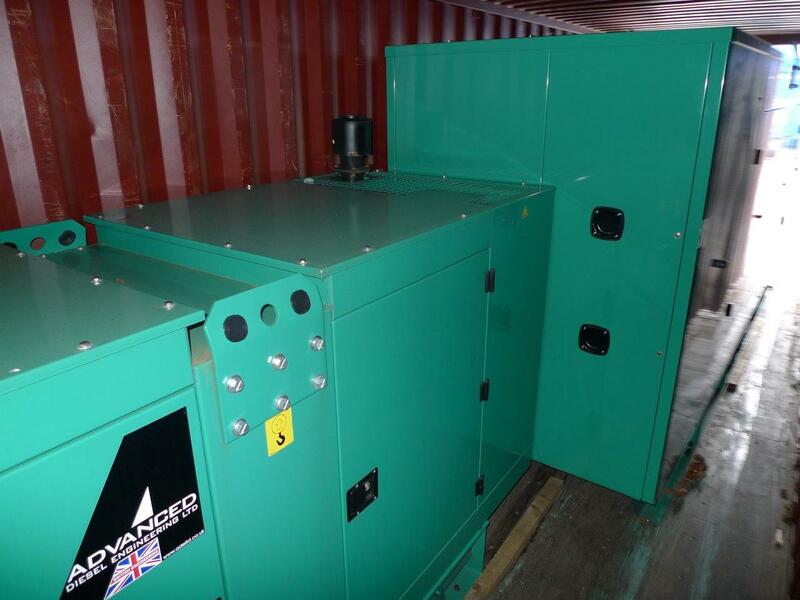 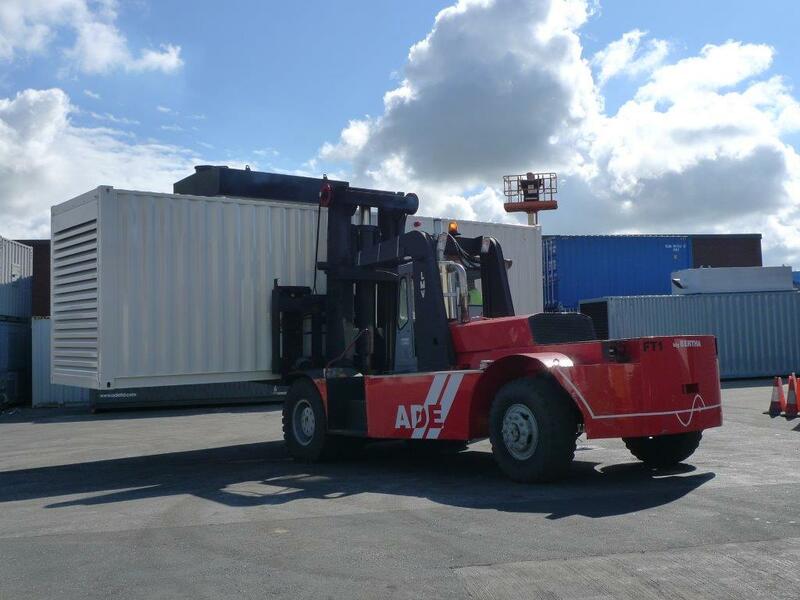 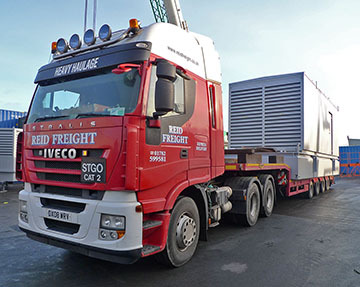 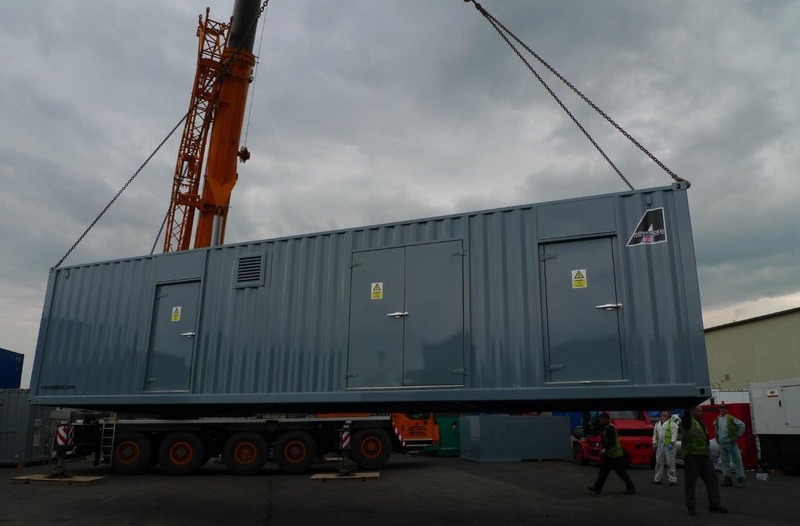 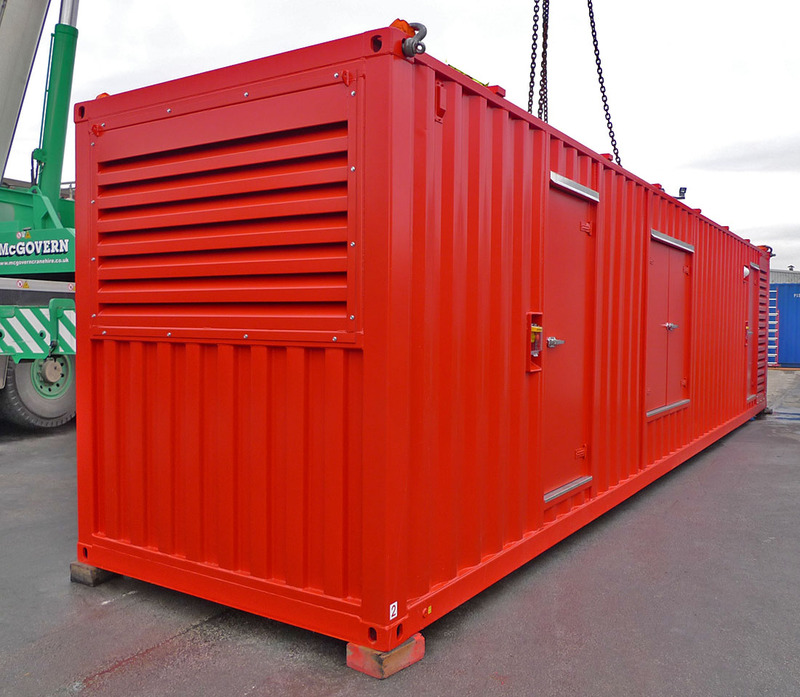 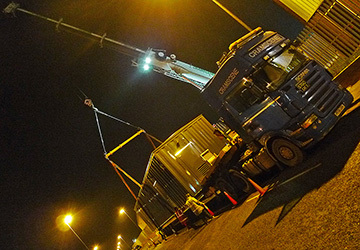 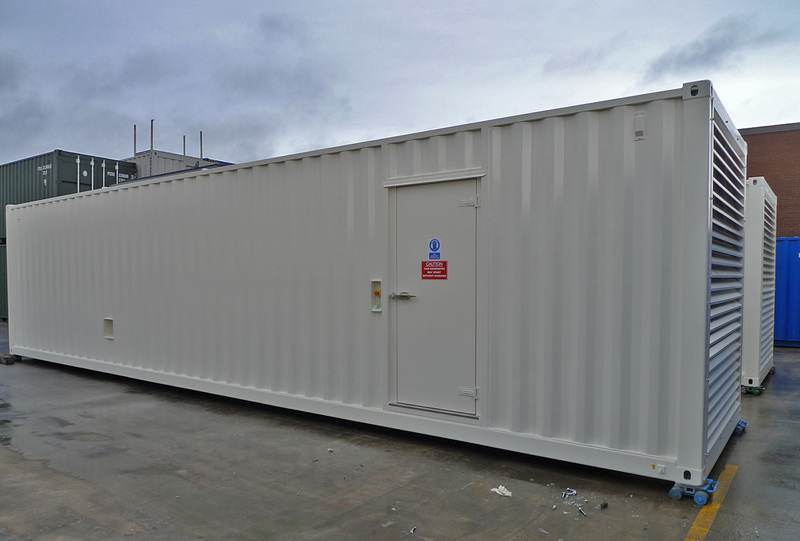 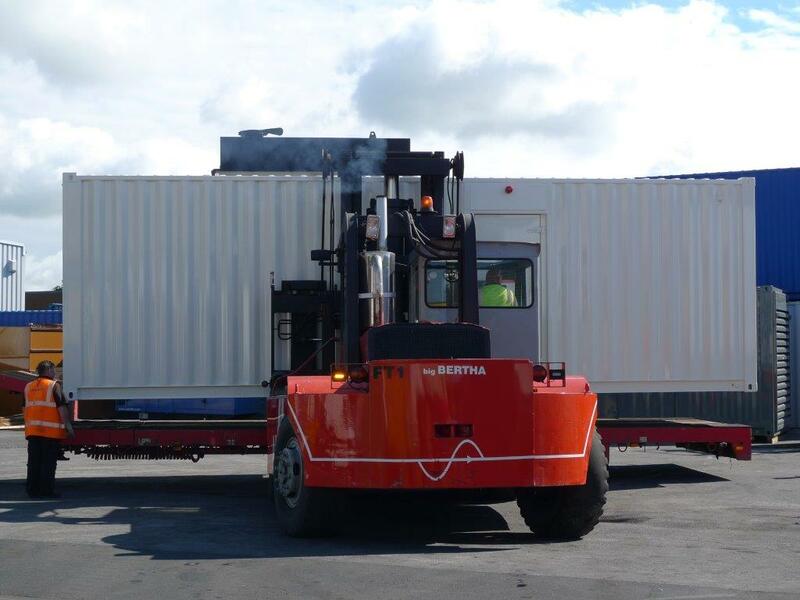 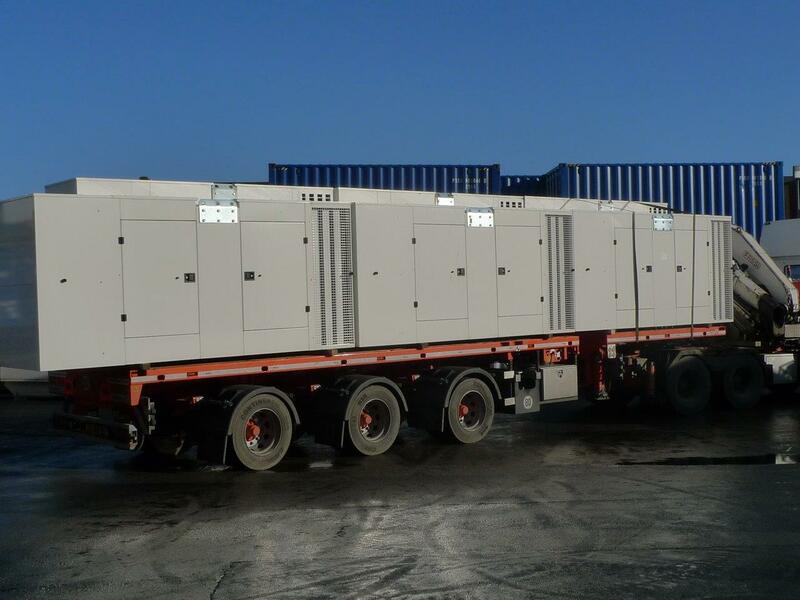 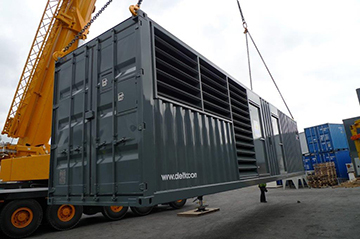 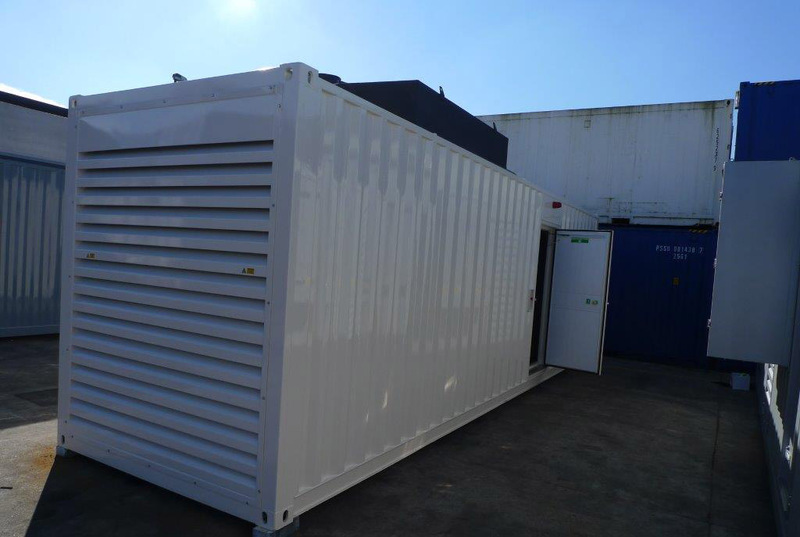 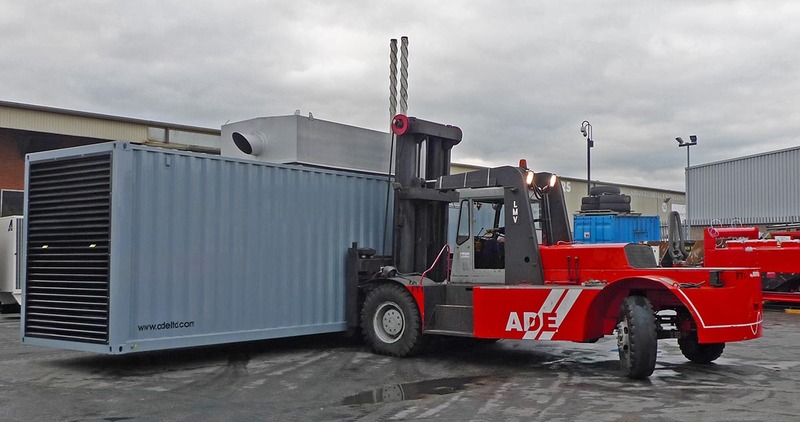 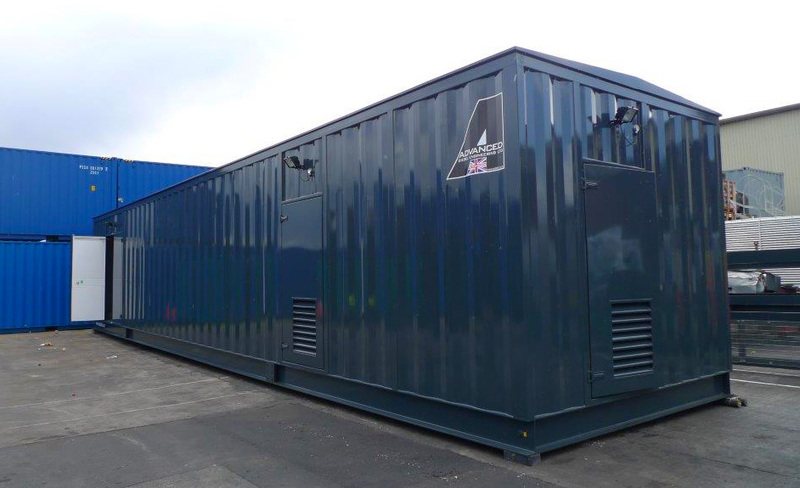 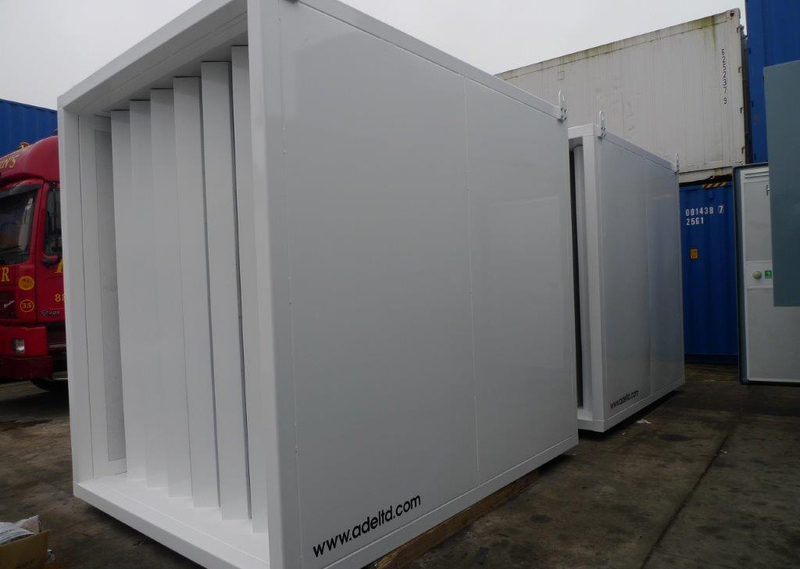 Two off 30 ft acoustic containers were designed & built at ADVANCED for a repeat client.The containers were fitted out with two Perkins 550 kVA diesel generators, a double skinned 2400 litre fuel day tank and cable link box to the exteriors. 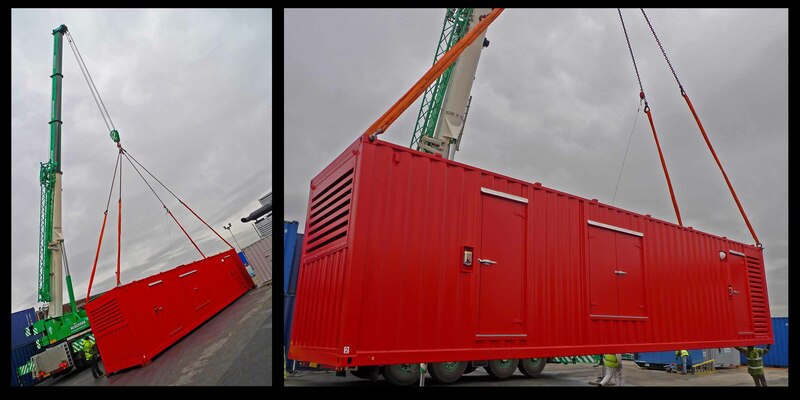 A free issue Perkins 1000kVA was house in this colourful 30¹ ADVANCED designed & built 85 dBa @ 1 metre enclosure. 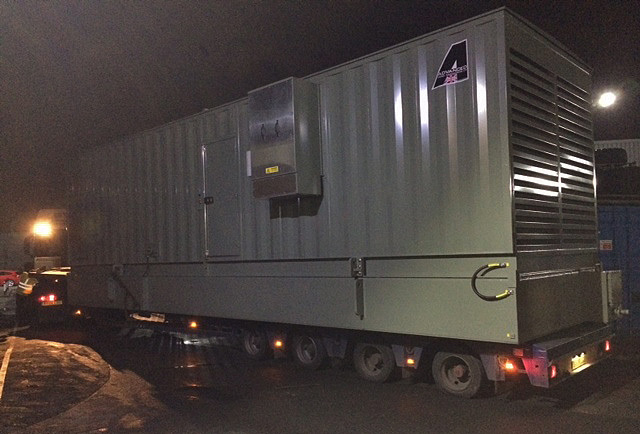 A single 65kVA Perkins diesel generator was converted to the telecoms specification and dispatched to a UK telephone exchange. 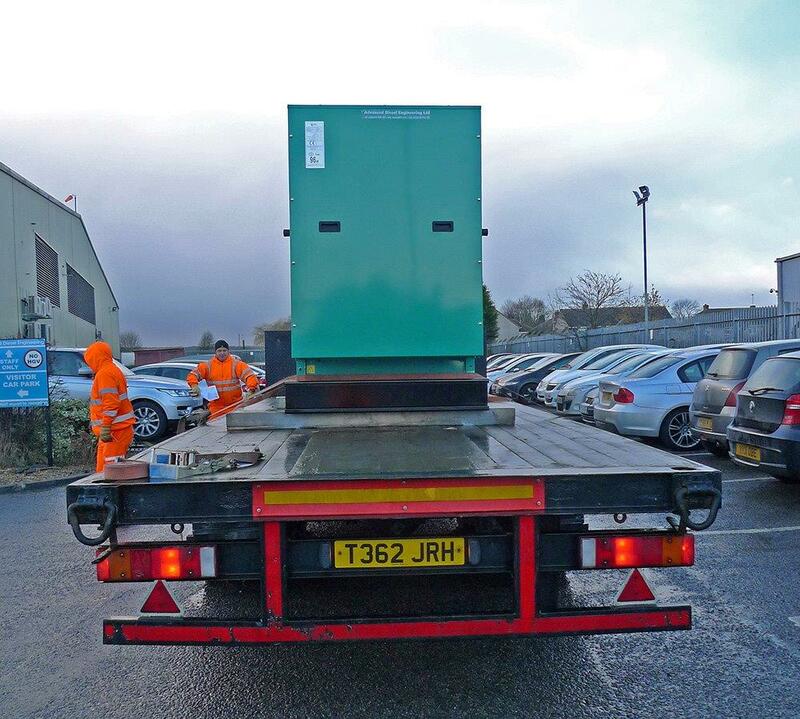 A further ADVANCED built cummins power box was despatched to Kent for up fitting. 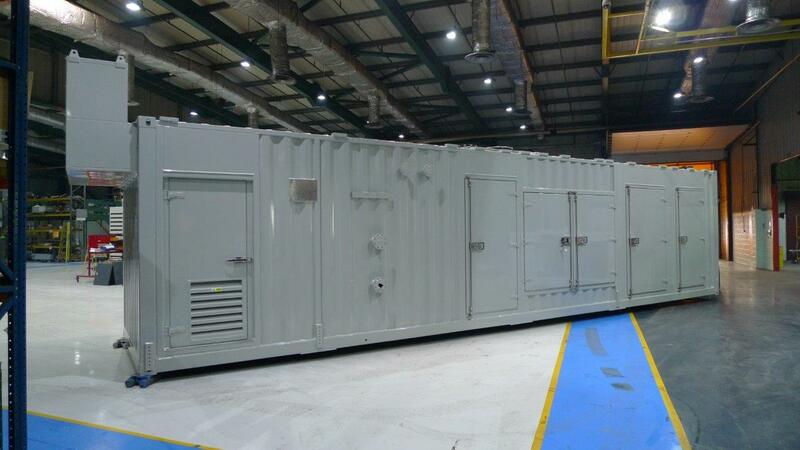 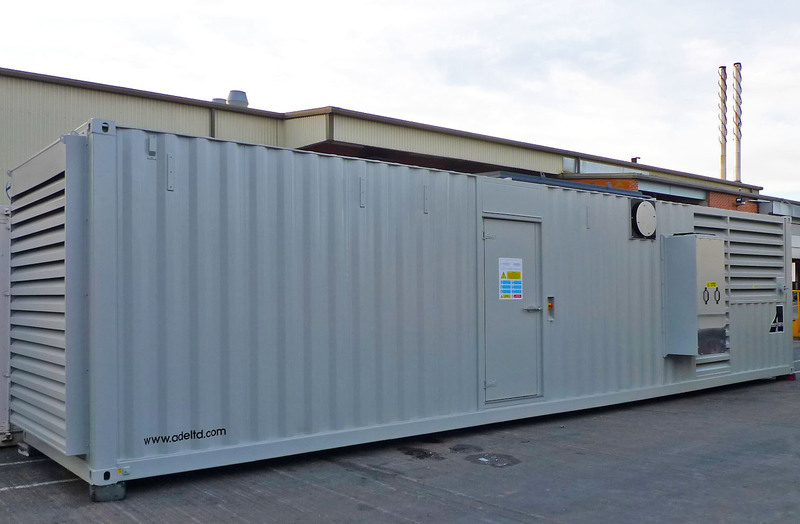 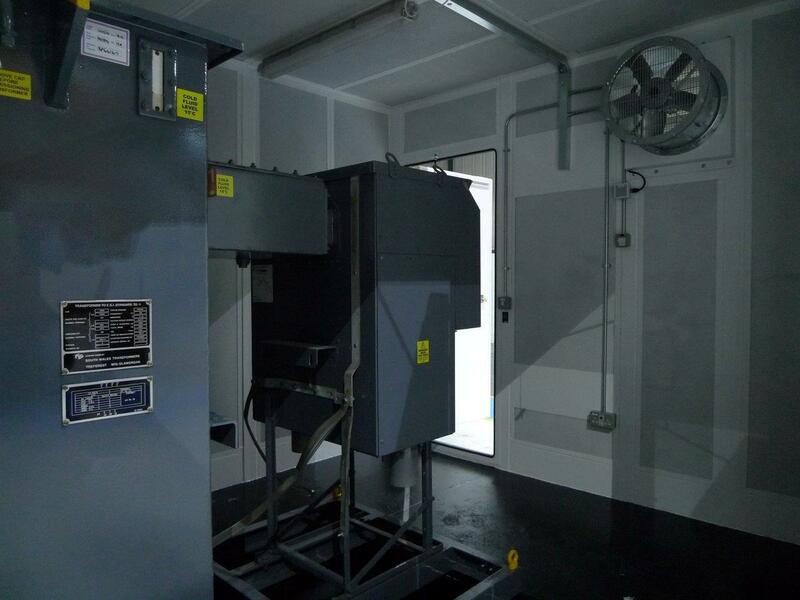 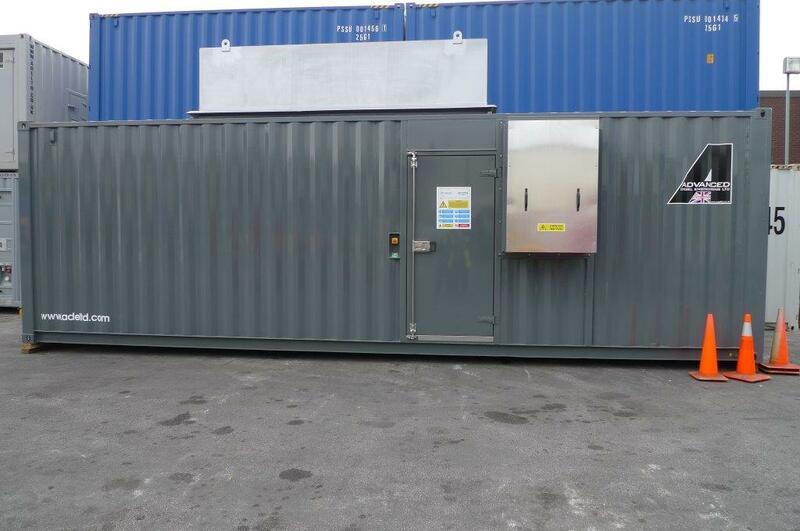 This ADVANCED designed & built switchgear container was fitted out with the main prison switchgear & transformer for a new prison wing in Hemel Hemstead. 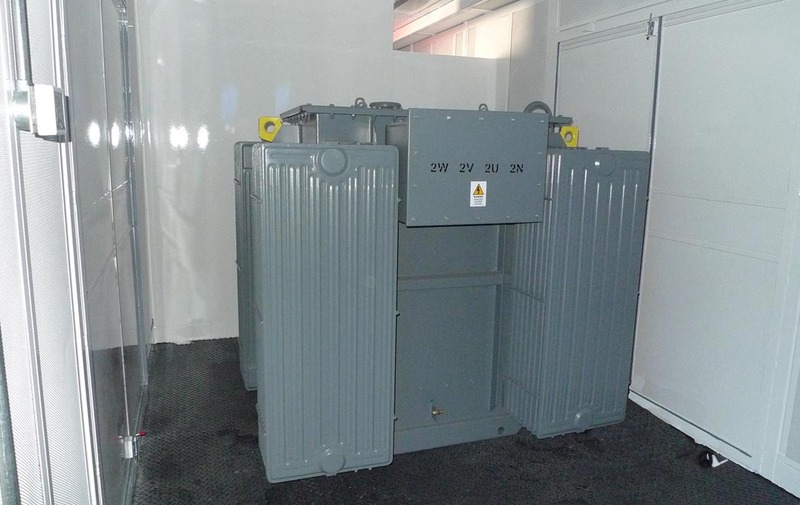 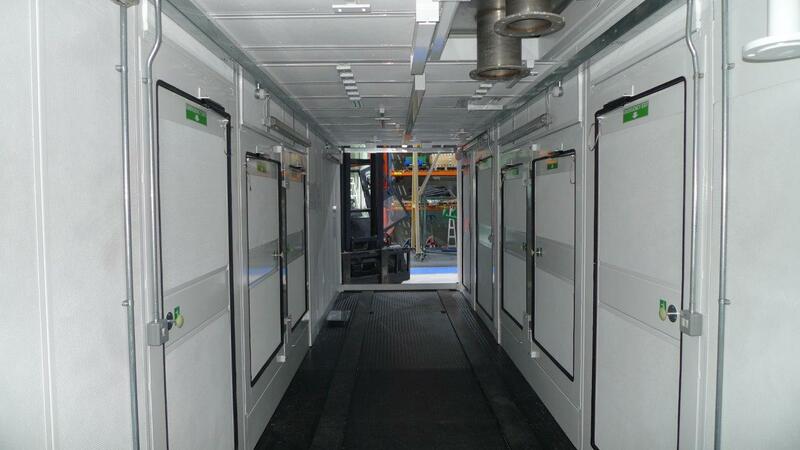 These two ADVANCED built enclosures are to house two off MTU diesel generators with a noise level of 85dBA@ 1 metre. 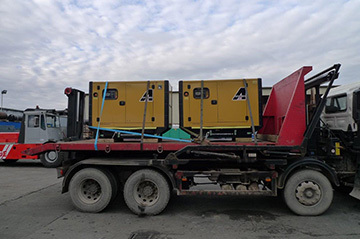 These five Cummins 200kVA open sets are now well on their way to Turkey, sold to a UK business these sets will be used for backup within their Turkish manufacturing plants. 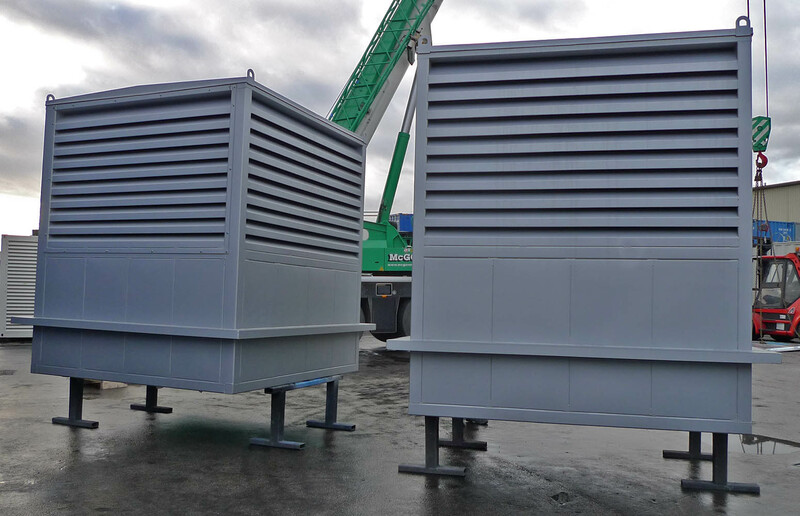 These two open sets were modified to the telecoms project specification, and are now being installed in different UK locations. 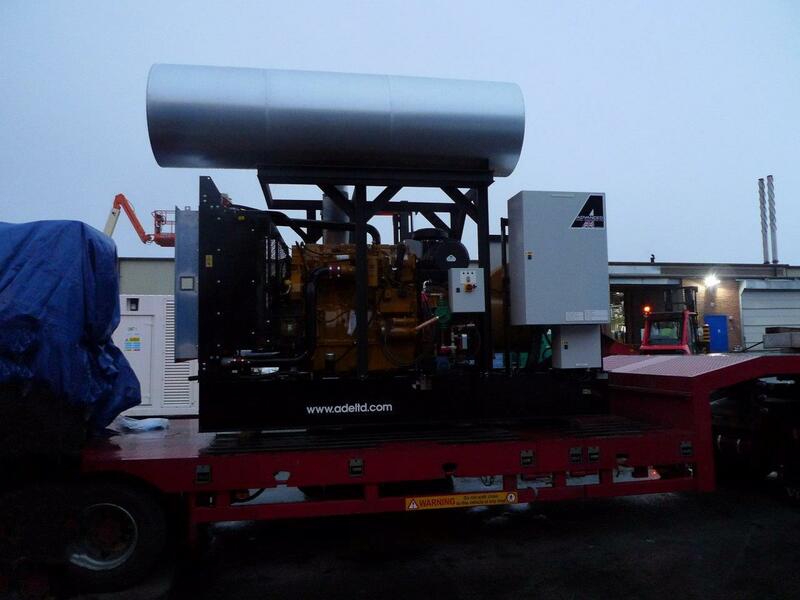 Shown being loaded are more from the multiple set order received from Cummins for their 20ft Power Box, manufactured in house at ADAVNCED. 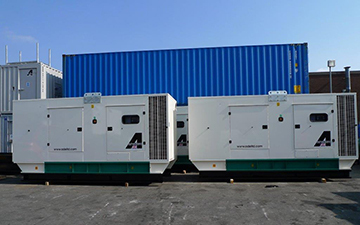 A 275kVA & 330kVA Cummins diesel generators, were packaged into a shipping container to be exported to our Bangladeshi agent. 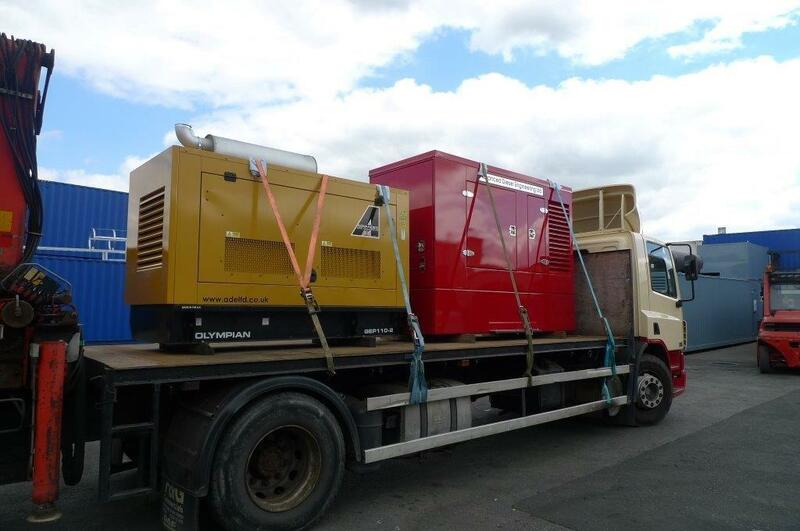 These three modified diesel generators were dispatched as part of our ongoing major telecoms project, shown is a Perkins 275kVA an 88kVA and a 66kVA. 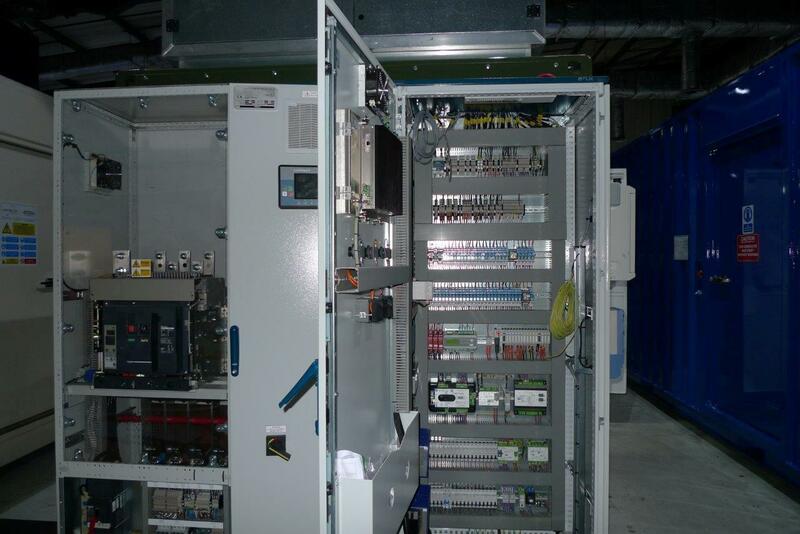 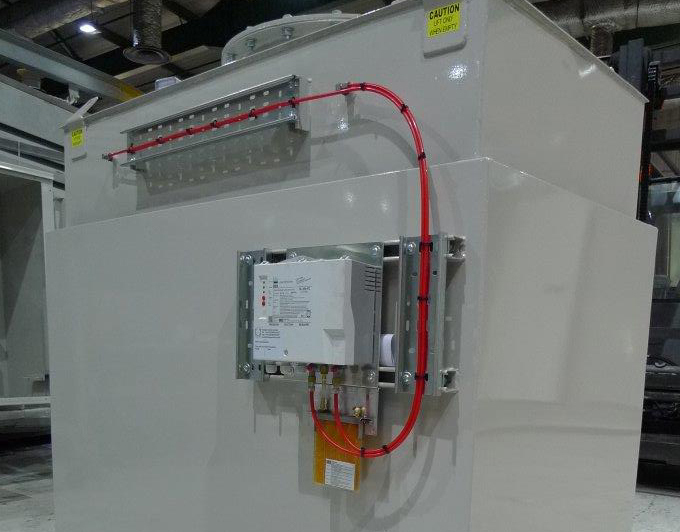 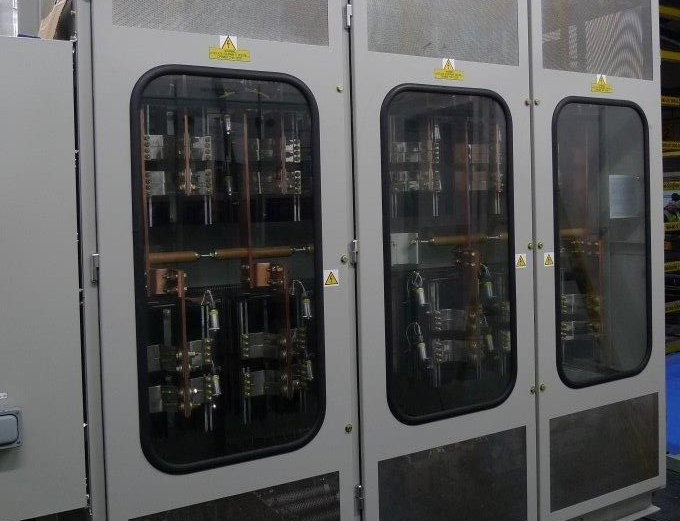 The design and manufacturing facility at ADVANCED is capable of producing a very wide variety of products, This purpose built enclosure was manufactured to house an 11kV transformer and switchgear. 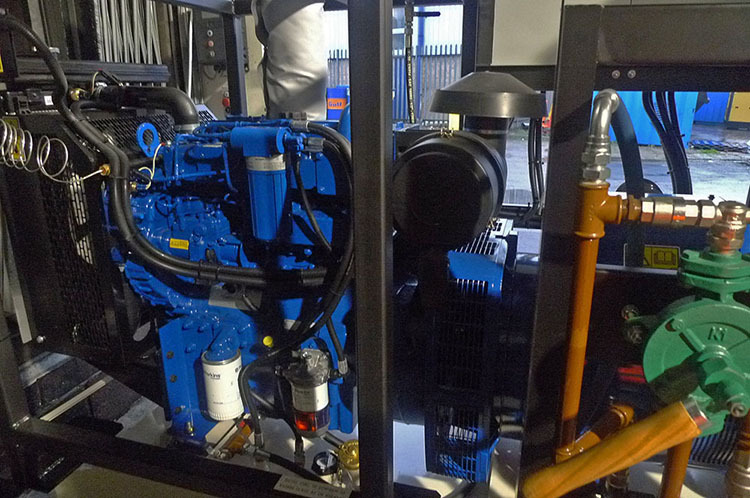 This Cummins 550kVA enclosed diesel generator and associated equipment is currently being installed at the N.E.C Birmingham. 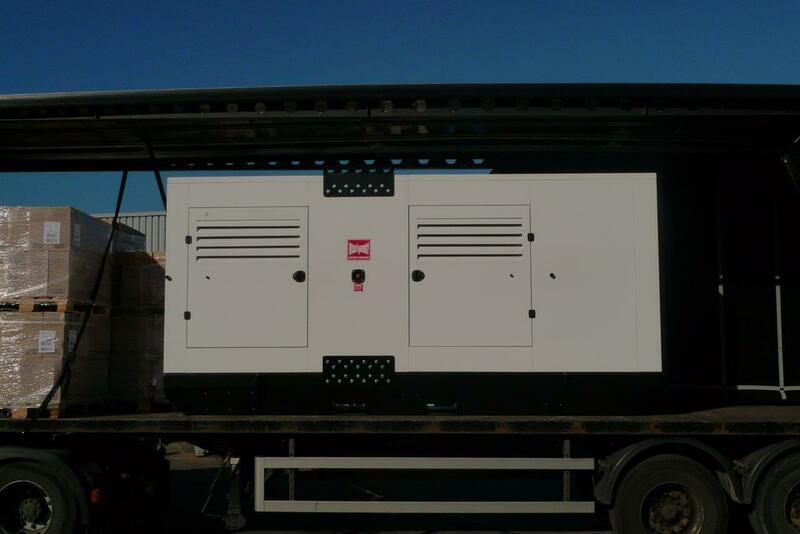 This 88kVA diesel generator c/w, the usual telecoms modifications to the control gear and exhaust system, was fitted into this ADVANCED purpose built 55dba @ 1 metre enclosure to be used very close to a residential estate. 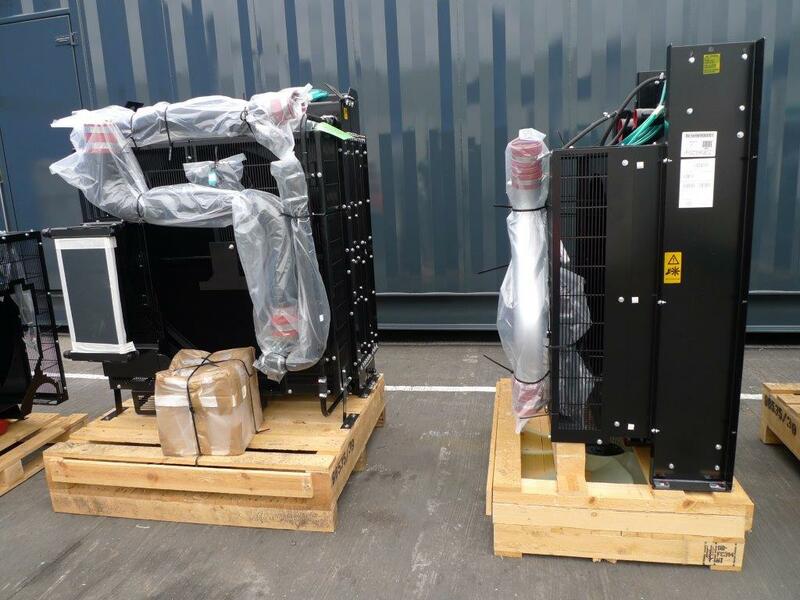 These ADVANCED designed and built attenuates & exhaust systems were supplied to another generator reseller, for plant room installations. 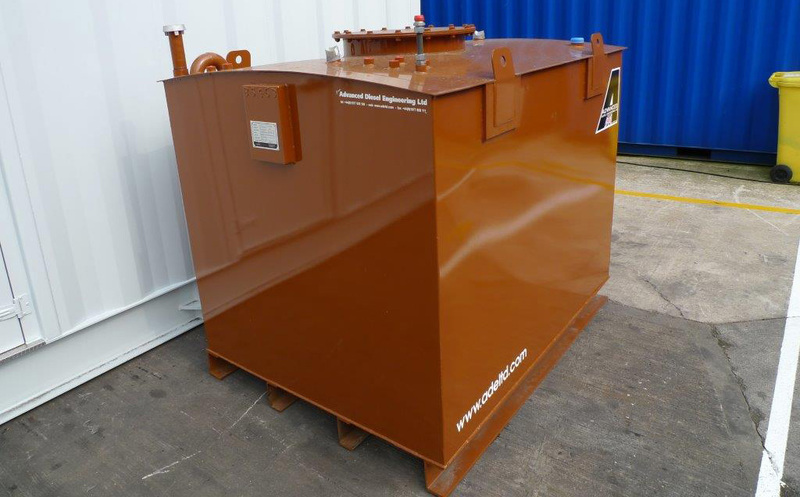 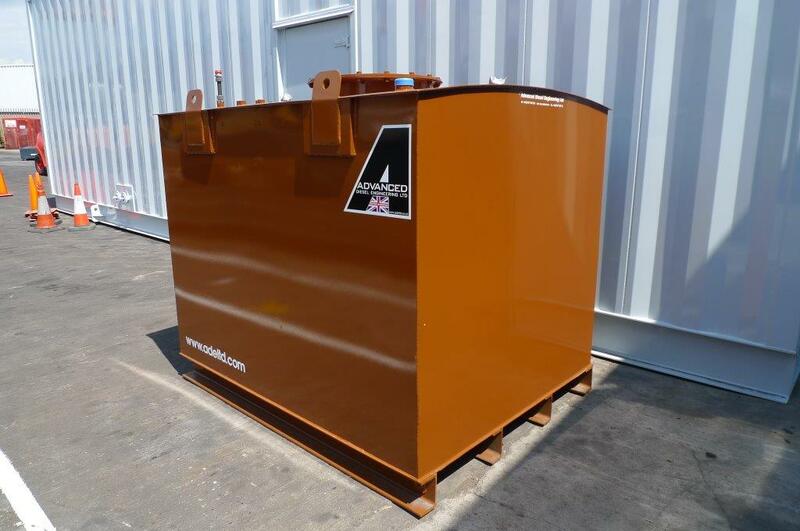 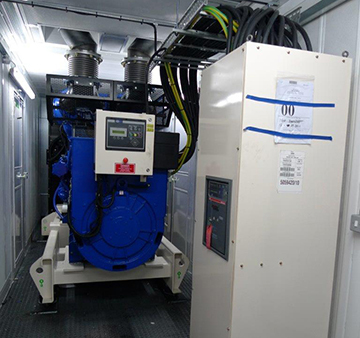 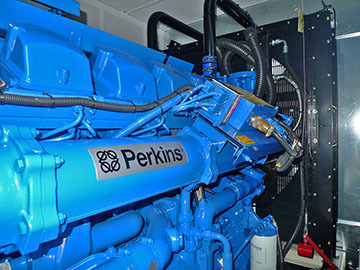 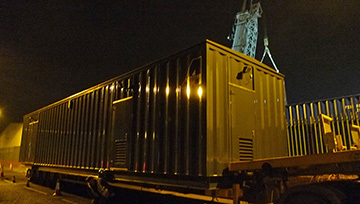 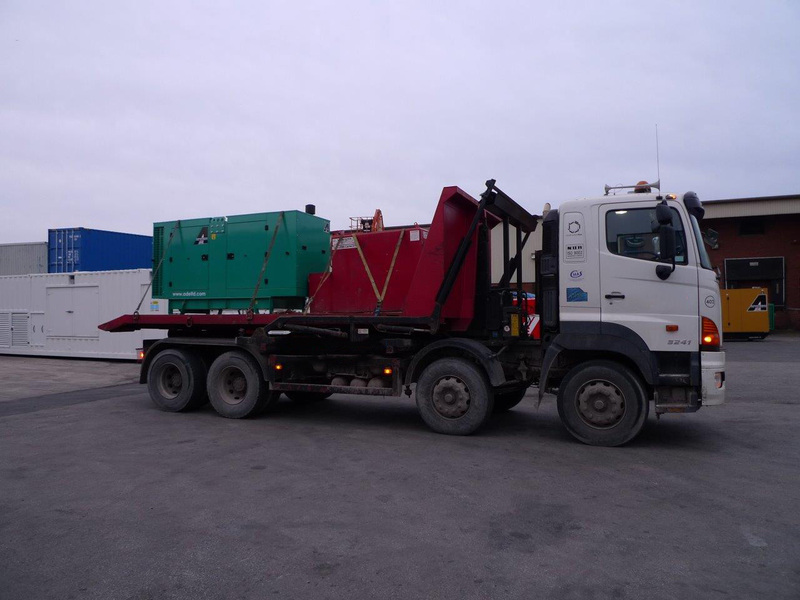 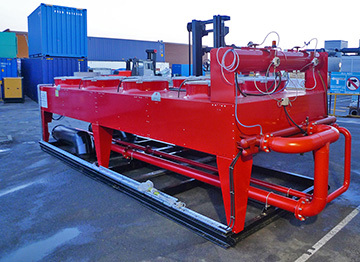 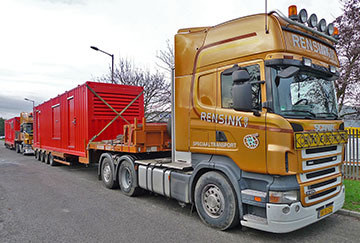 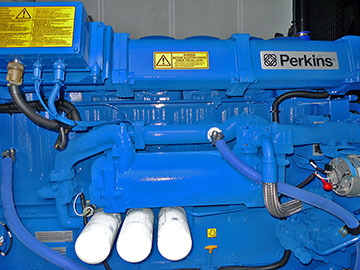 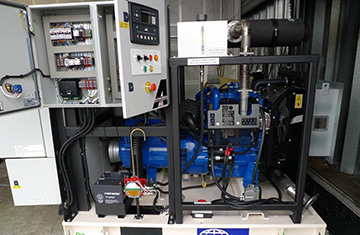 A free issue Perkins 4006 generator was packaged in a purpose built enclosure, including a 10,000 litre base fuel tank. 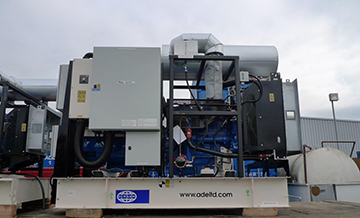 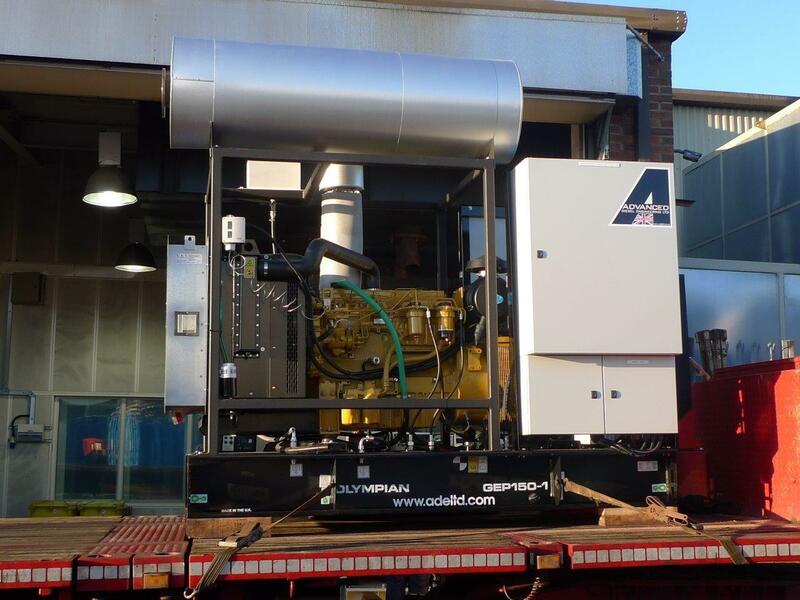 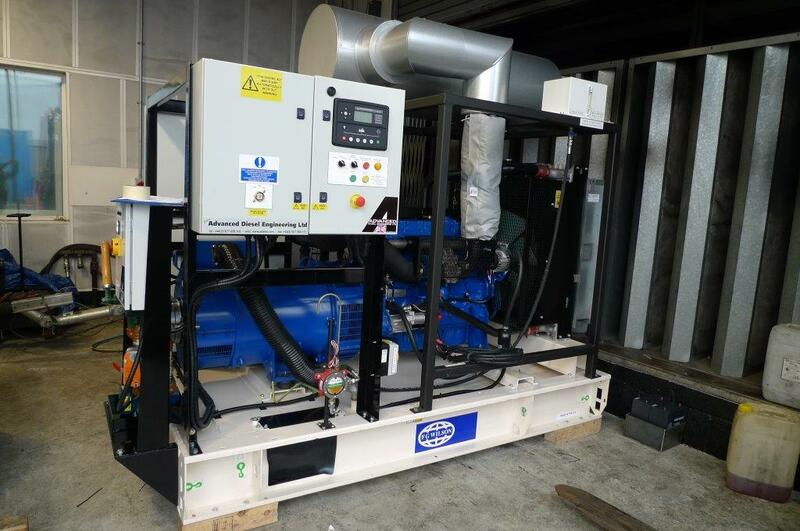 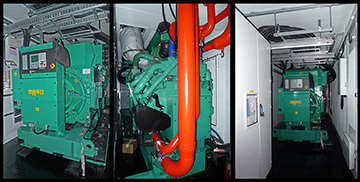 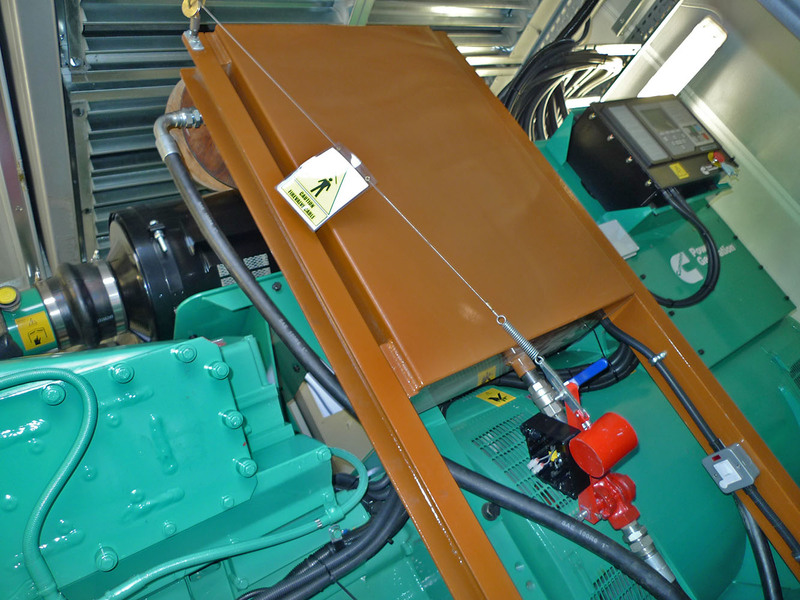 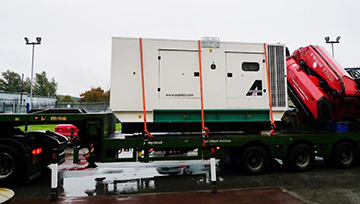 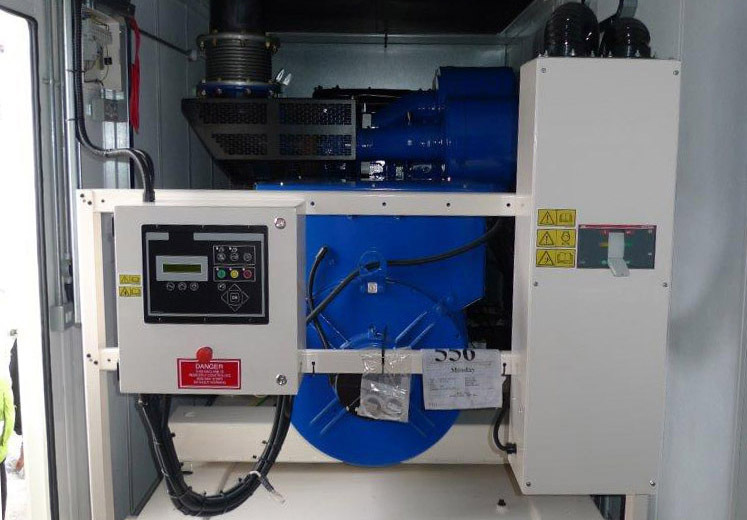 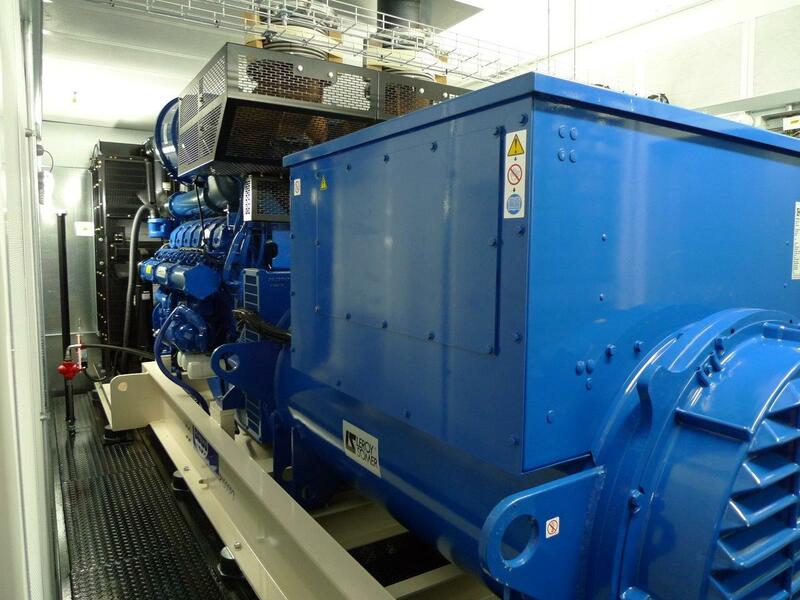 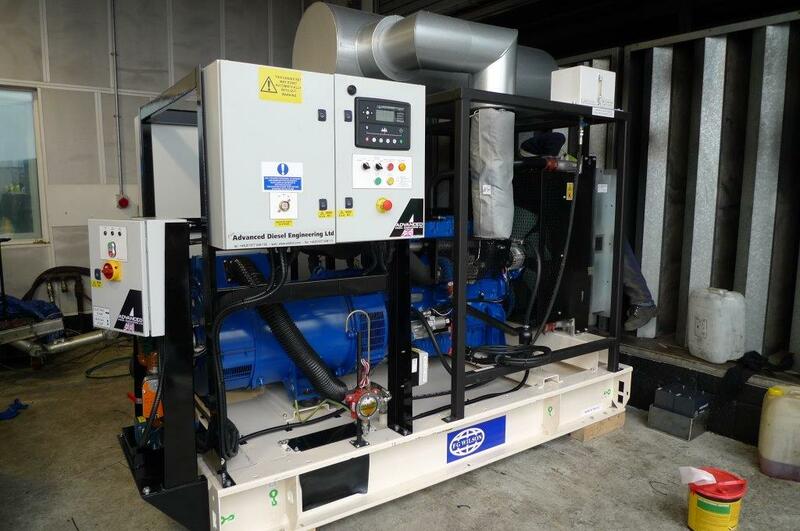 This standard 110kVA Cummins enclosed diesel generator with its ADVANCED designed and built 48 hr extended fuel tank is currently being installed in a northern NHS hospital. 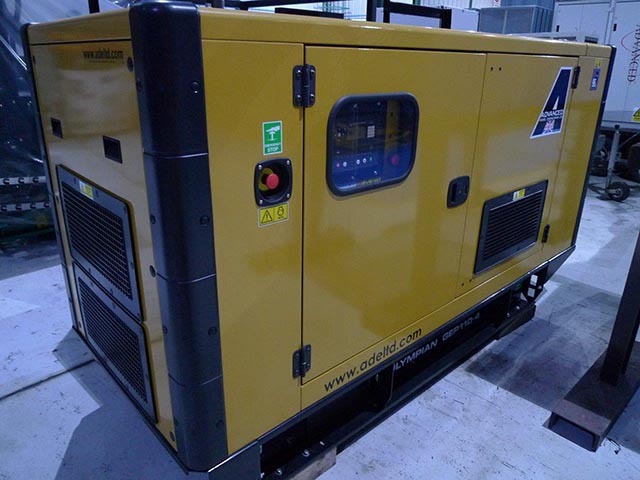 Another 2016V12 Gas engine is packaged at ADVANCED, for one of our returning clients.All pipework and electrical up fit is completed in house. 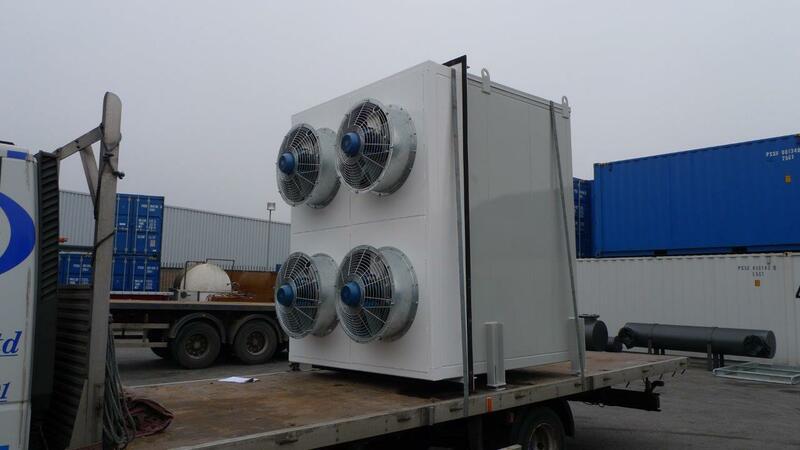 Shown being stripped for transport is an ADVANCED designed & built enclosure and roof mounted radiators, to house a 2016v12 MWM gas CHP unit. 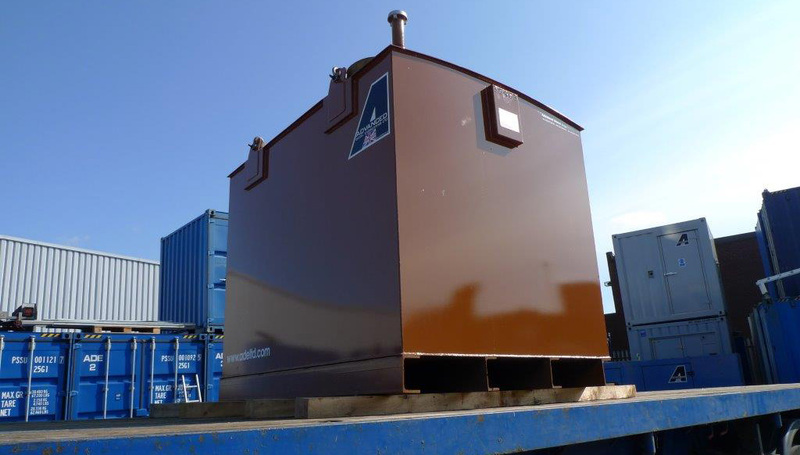 Nearly every day of the week a fuel tank is dispatched from our works, this one is on its way to a partner generator company. 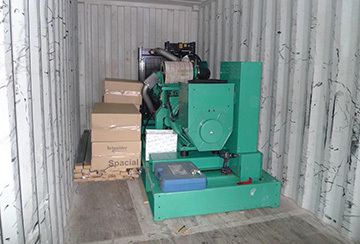 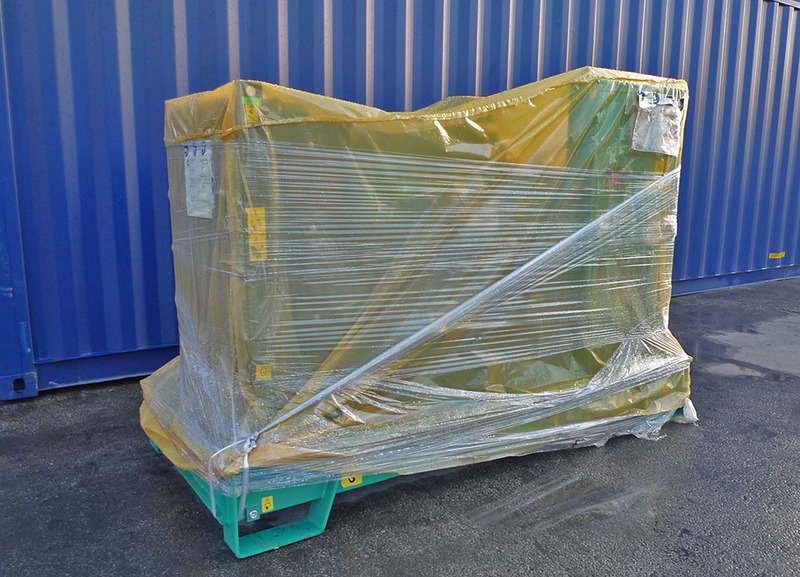 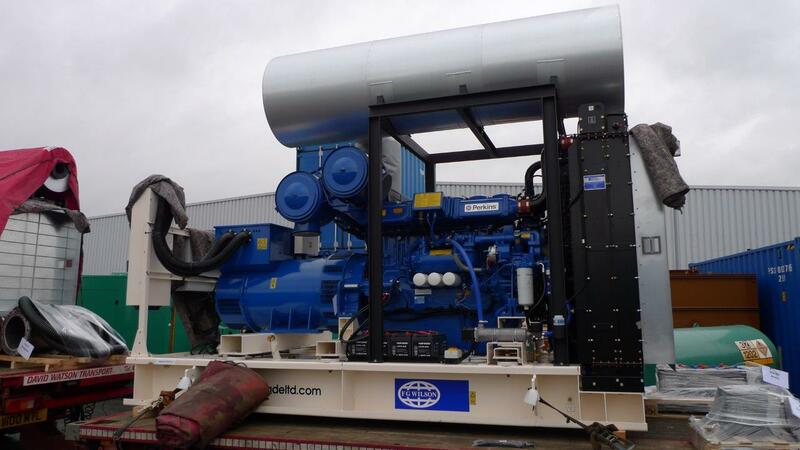 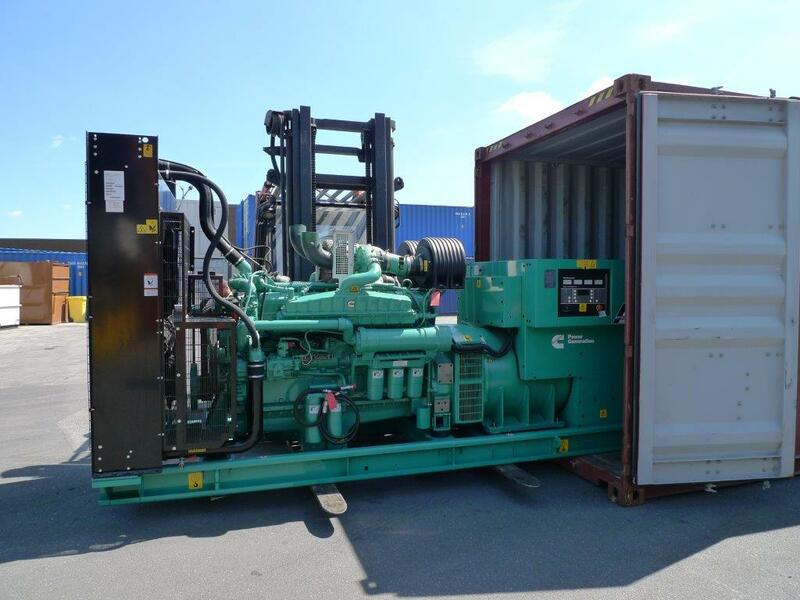 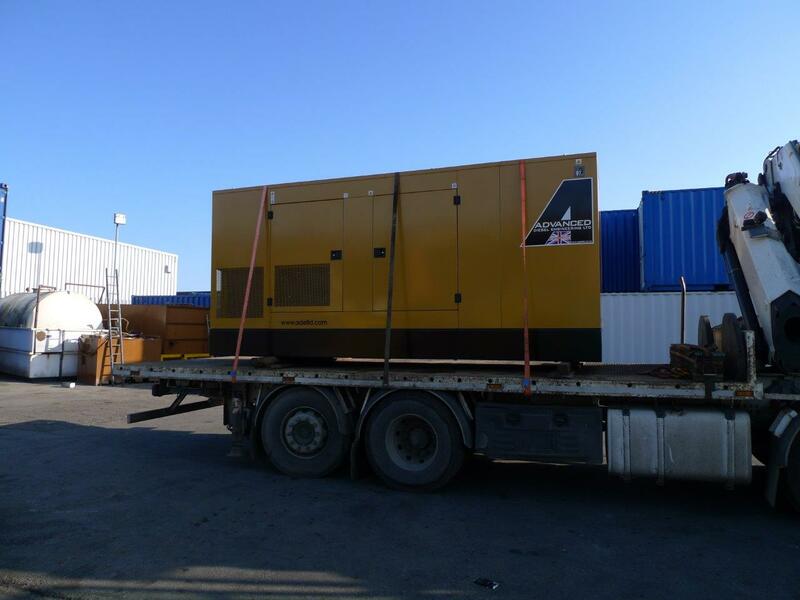 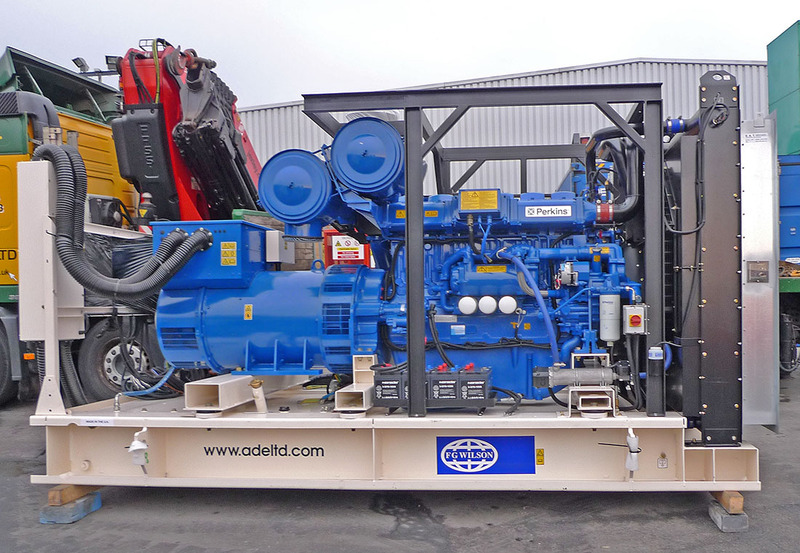 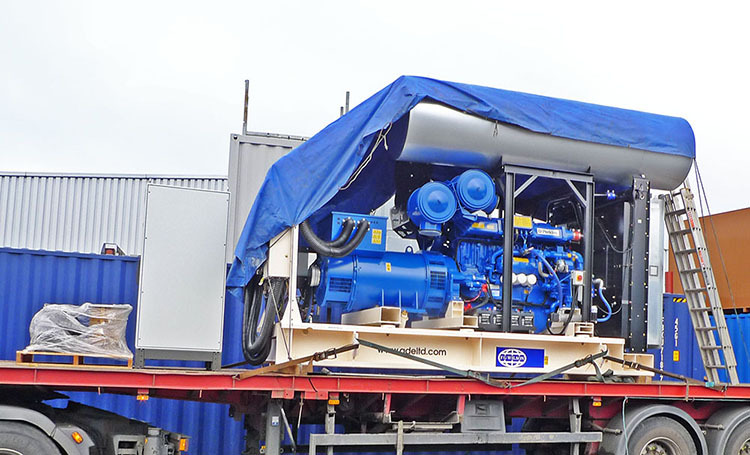 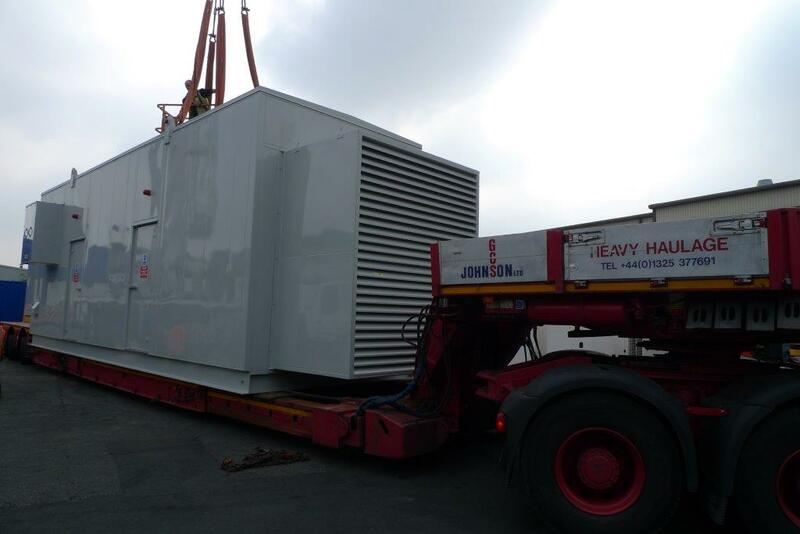 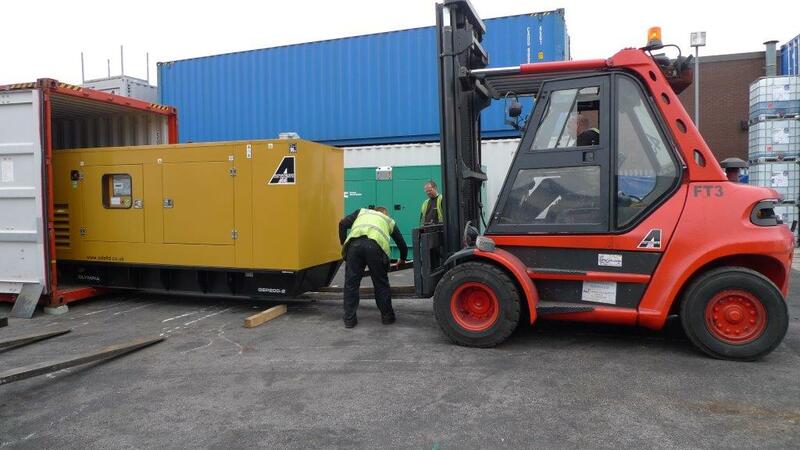 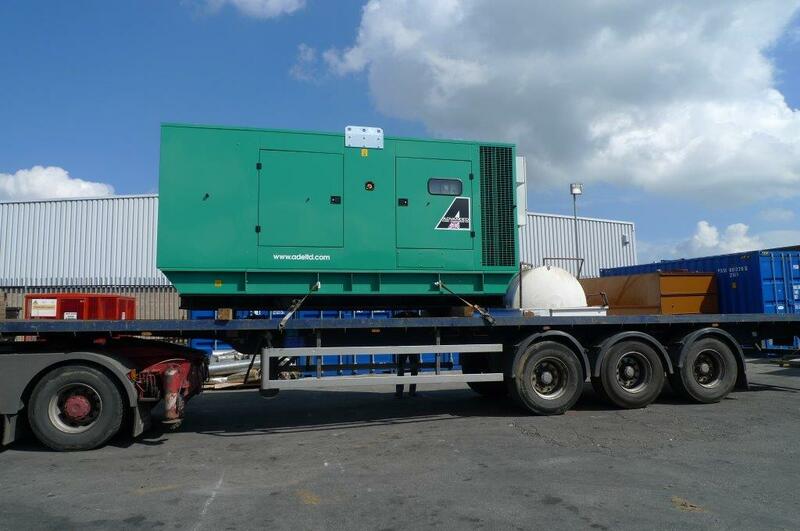 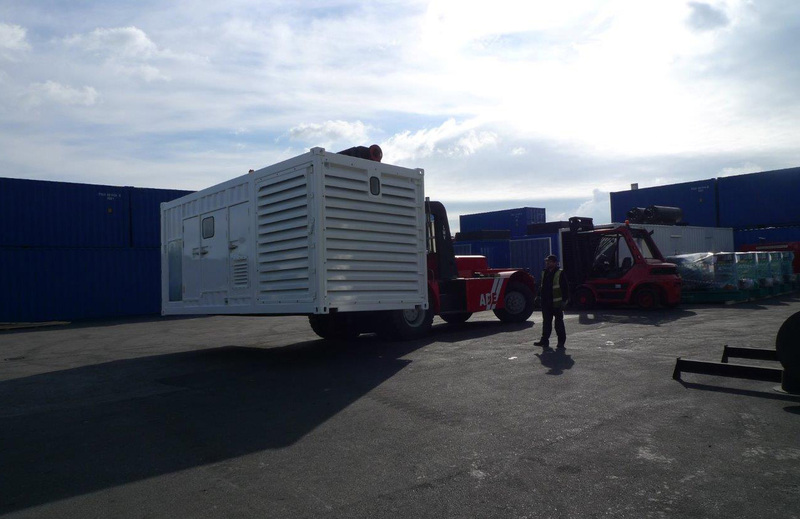 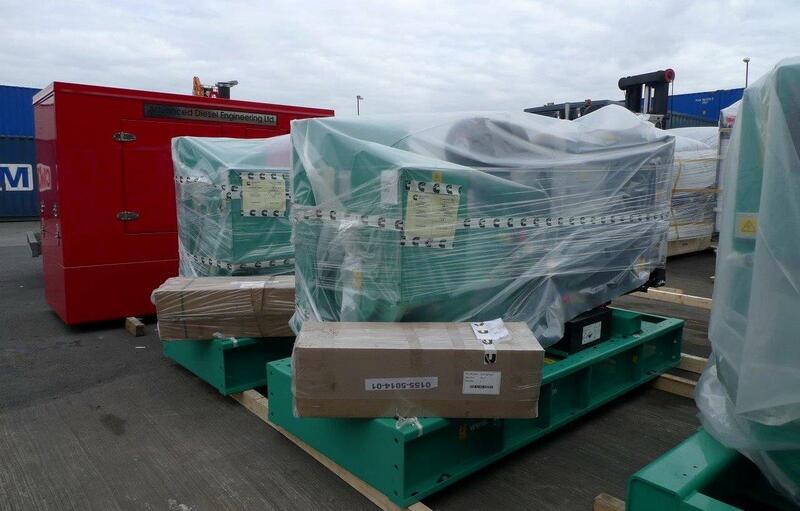 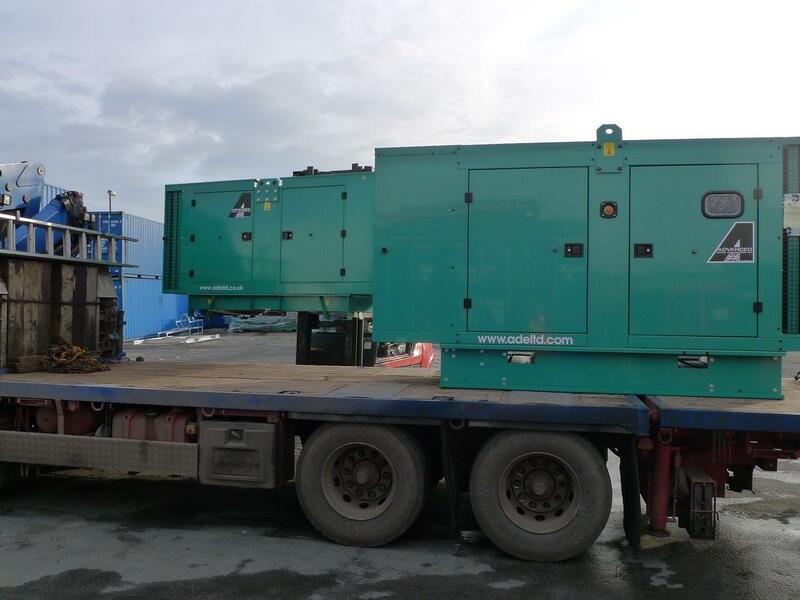 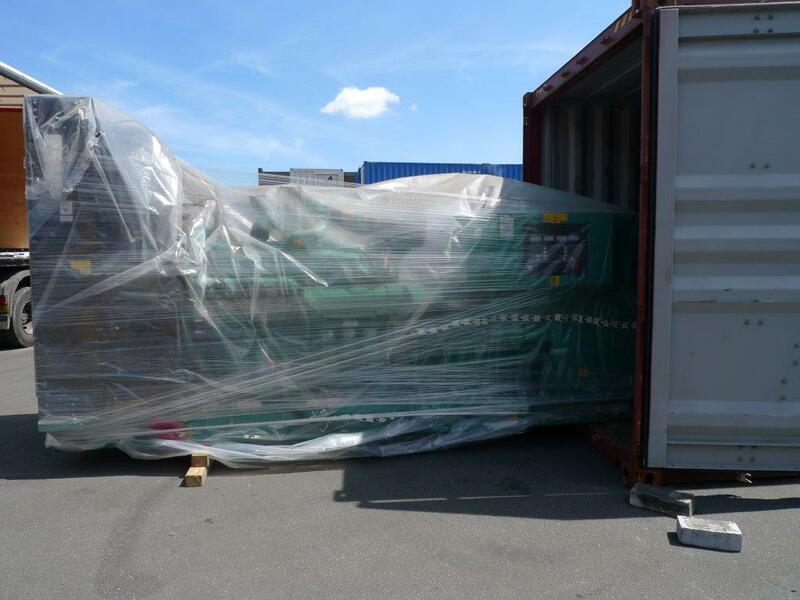 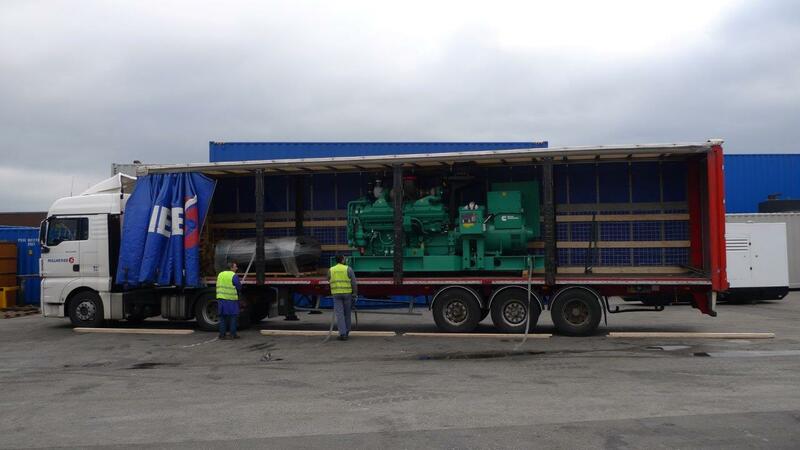 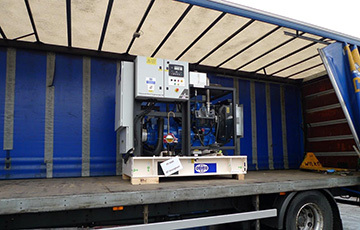 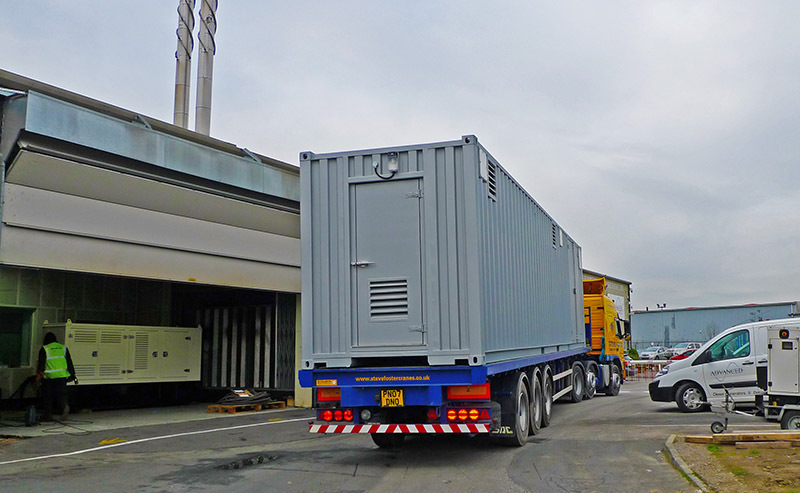 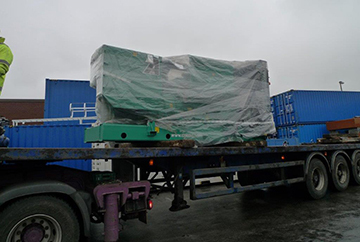 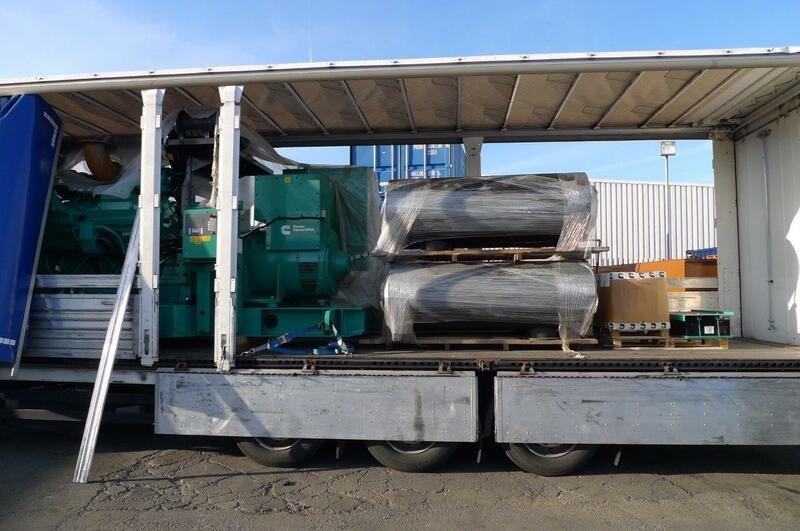 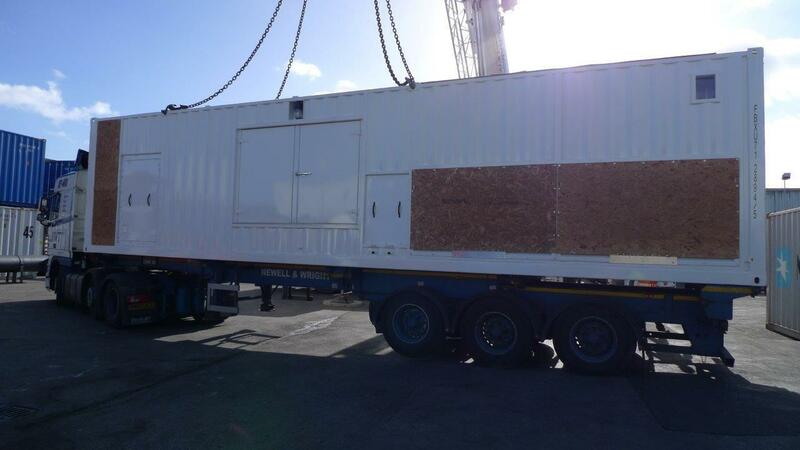 Being exported to one of our many international clients, is a 550kVA Perkins enclosed diesel generator. 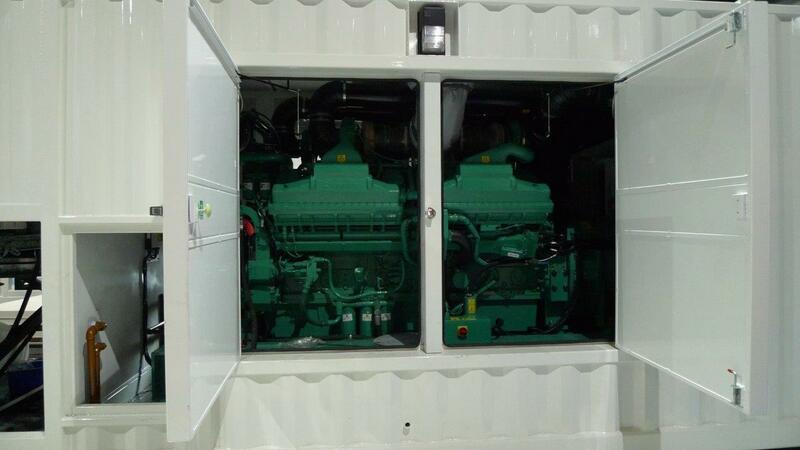 Two Cummins 500kVA enclosed diesel generators, each mounted on a ADVANDED built 48Hr double skinned base fuel tank. 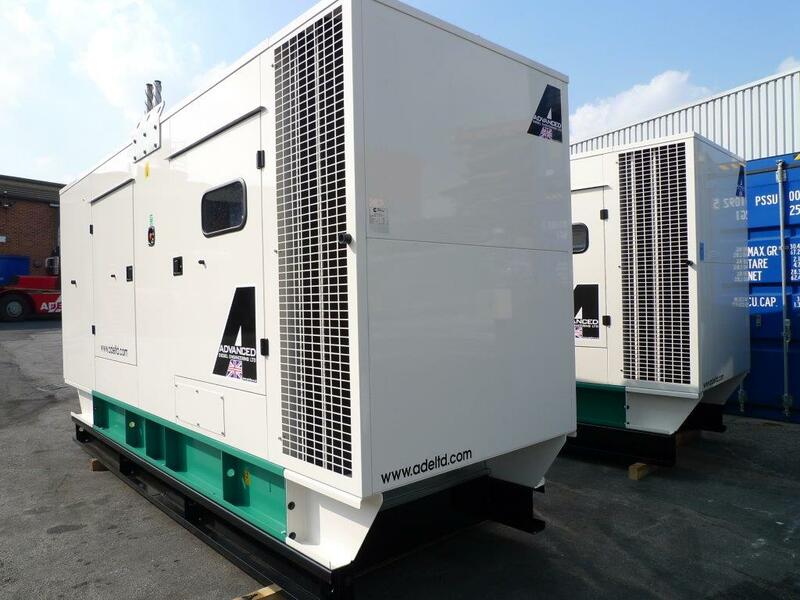 They were dispatched to Surrey to be used as backup power. 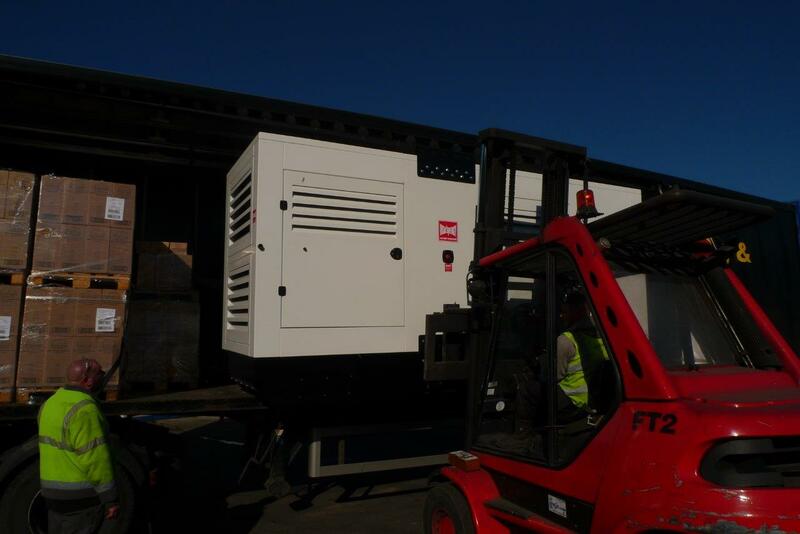 Shown being loaded is the fifth Cummins 1760kVA QSK60 diesel generator and exhaust systems. 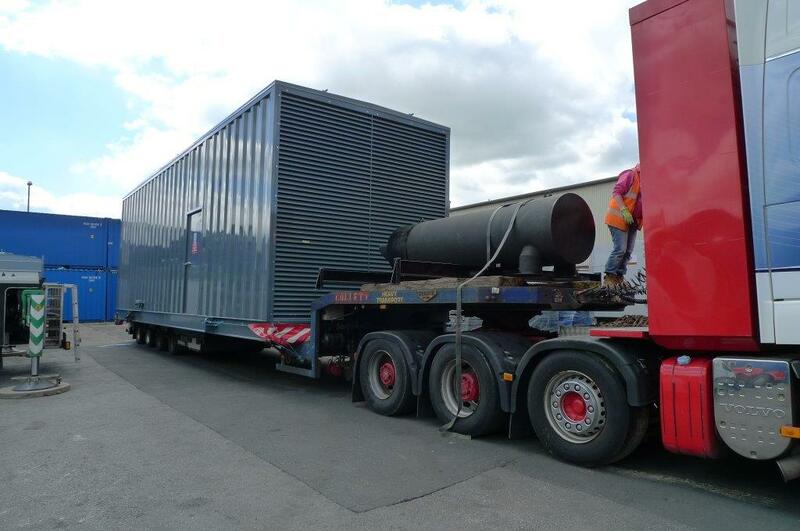 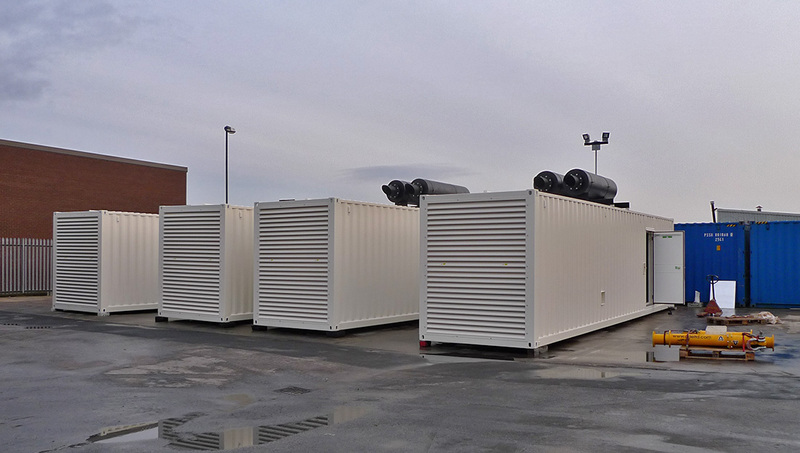 All five generators are to be installed in a French Data Centre. 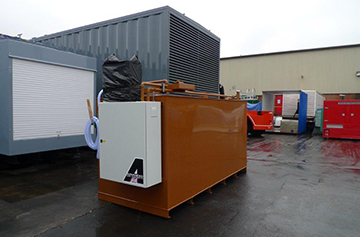 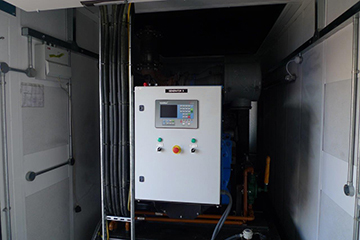 This 2016V12 gas powered CHP generator was installed in a purpose built enclosure. 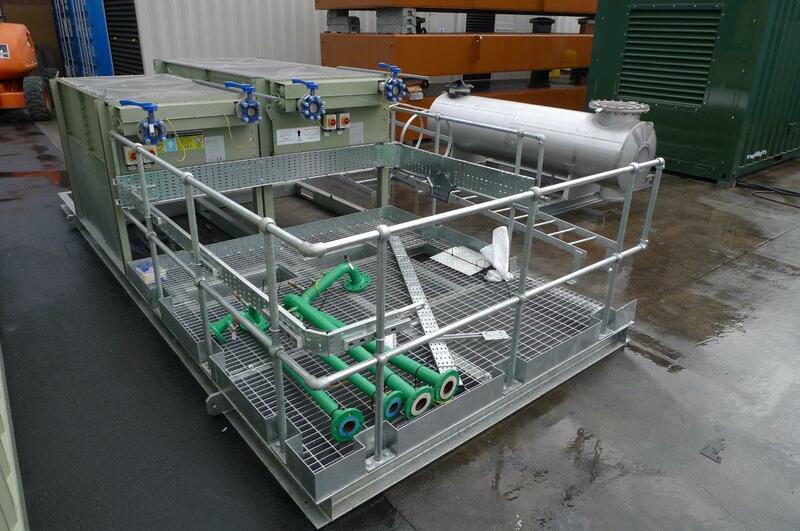 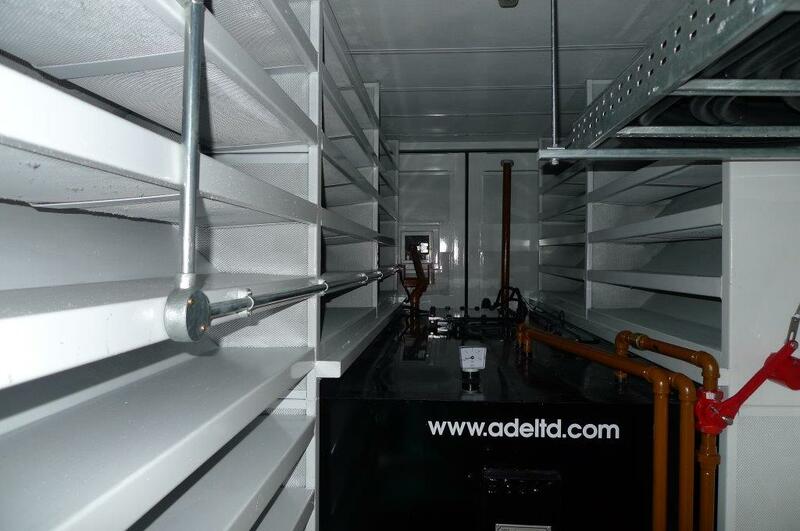 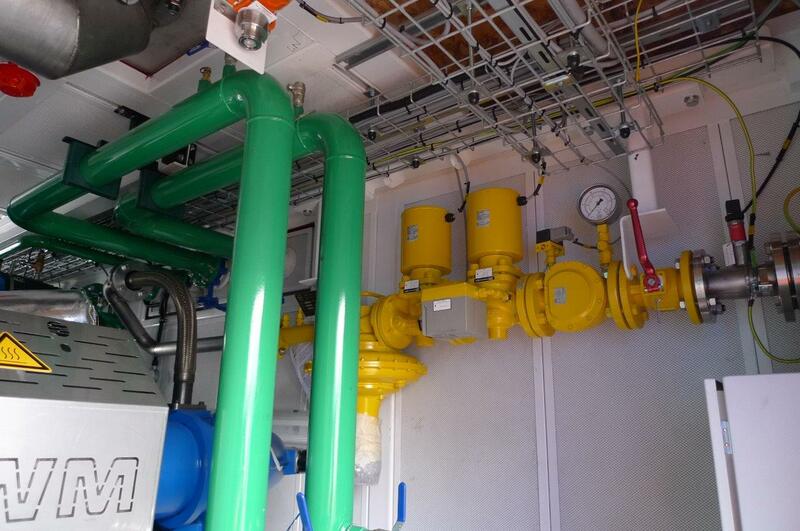 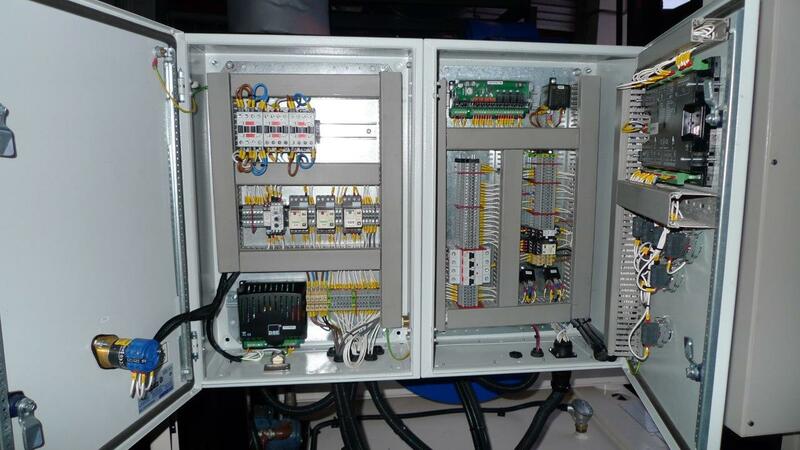 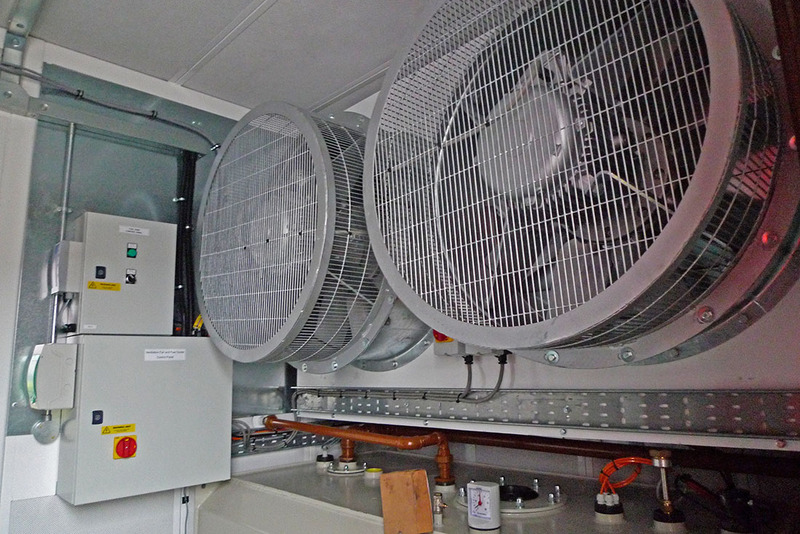 All electrical, pipework & ancillary equipment was designed and completed in house at ADVANCED. 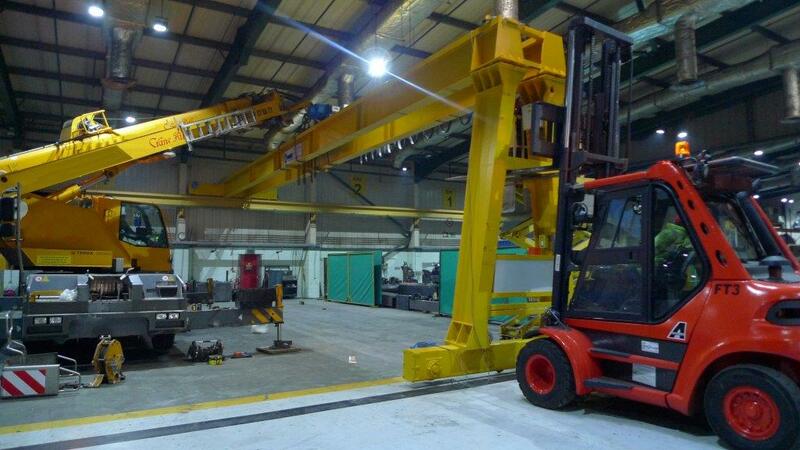 Another 10 ton semi overhead crane, is added to the workshop as the workload continues to increase. 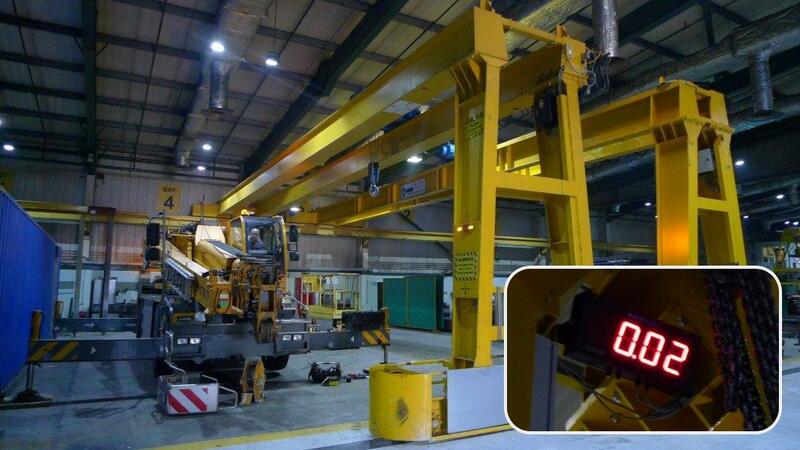 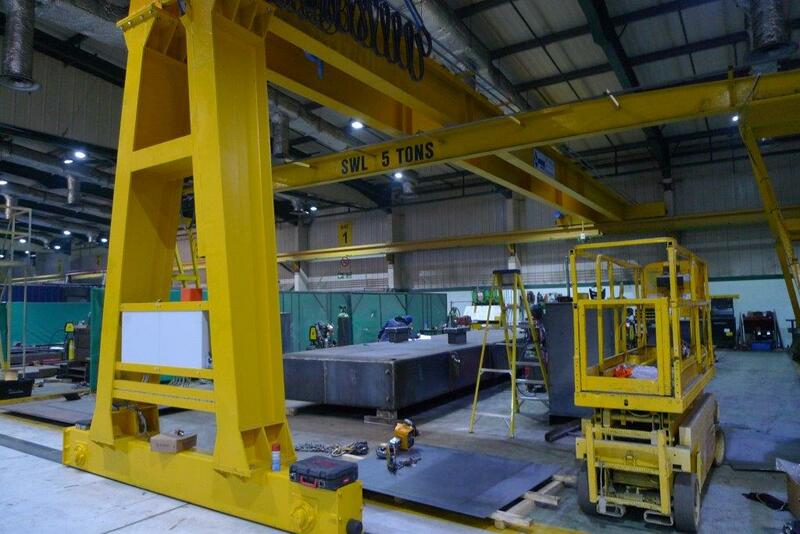 This crane comes with a on board weighing scale, which will be dedicated to the fuel tank manufacturing bay. 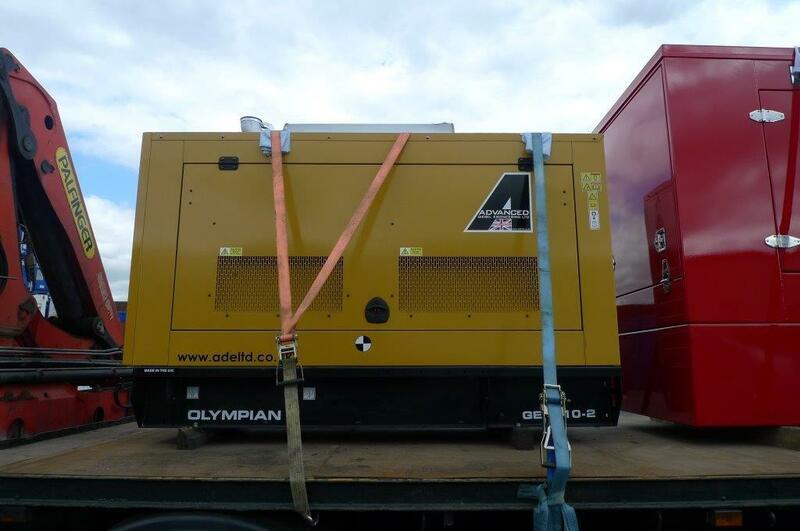 Two more 33kVA CAT Olypian diesel generators are being collected by the client, who operates demolition sites throughout the UK. 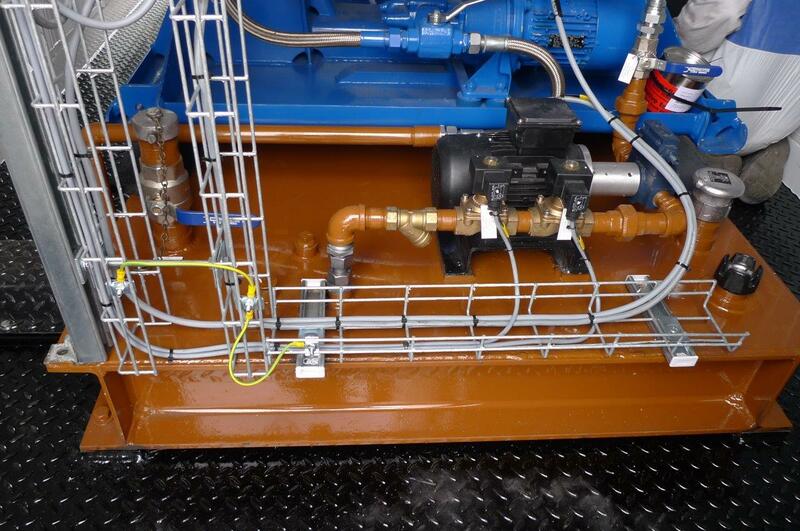 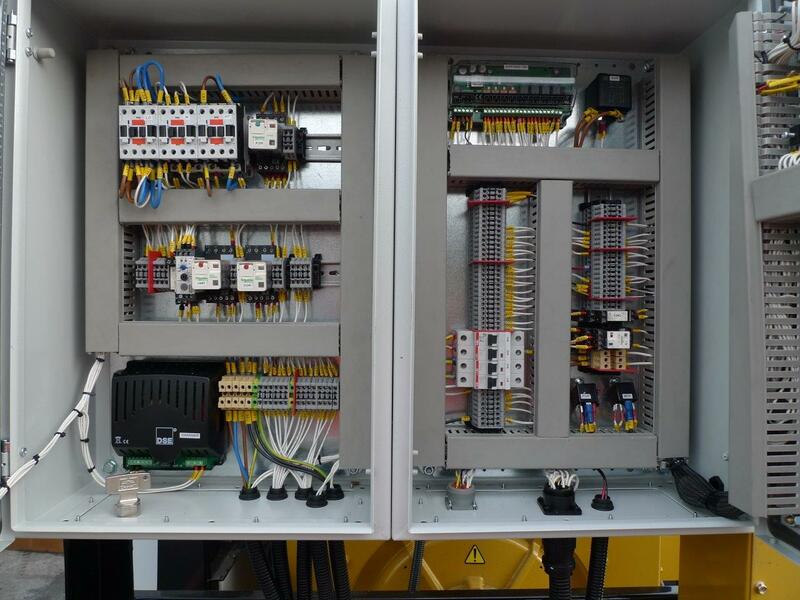 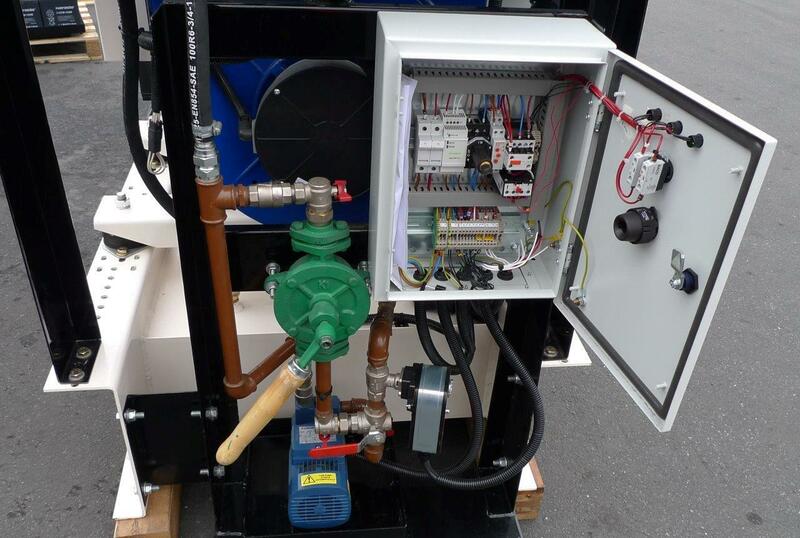 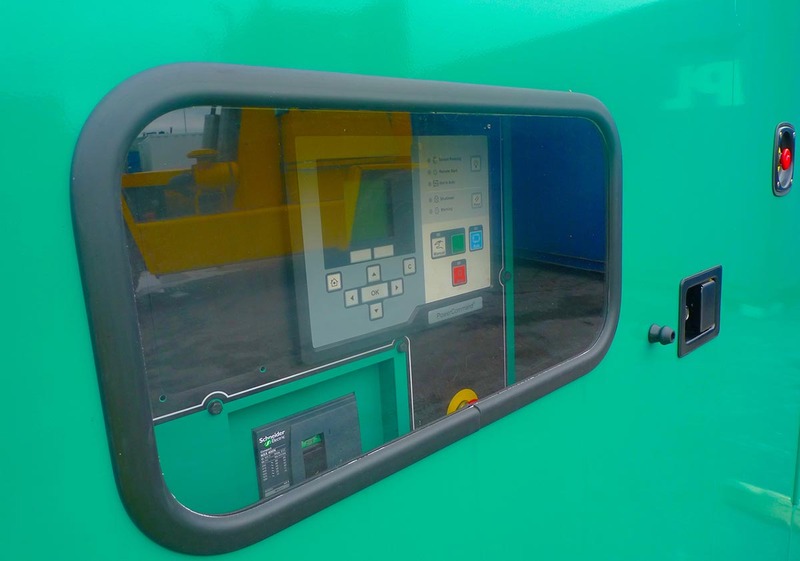 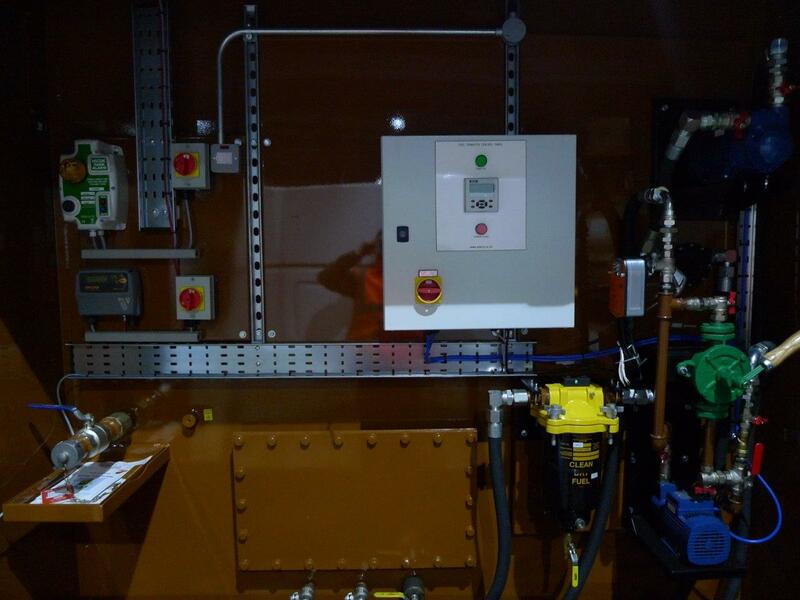 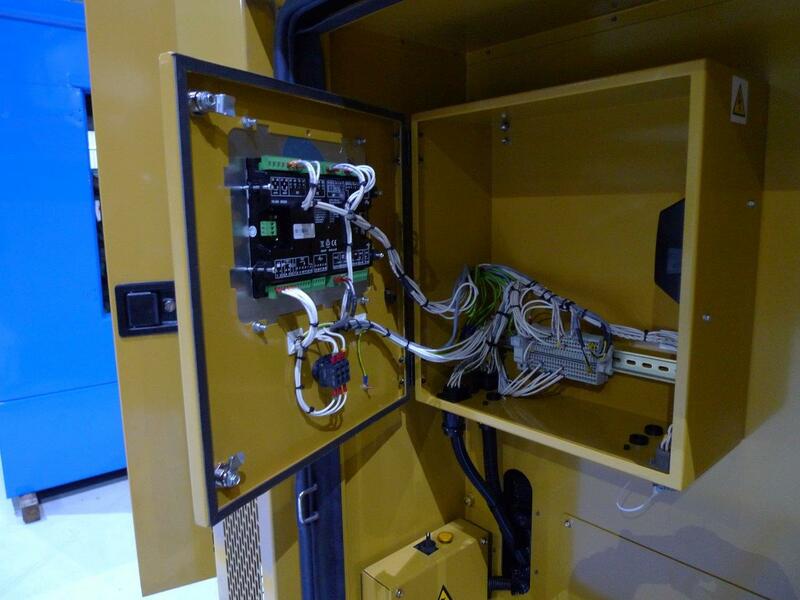 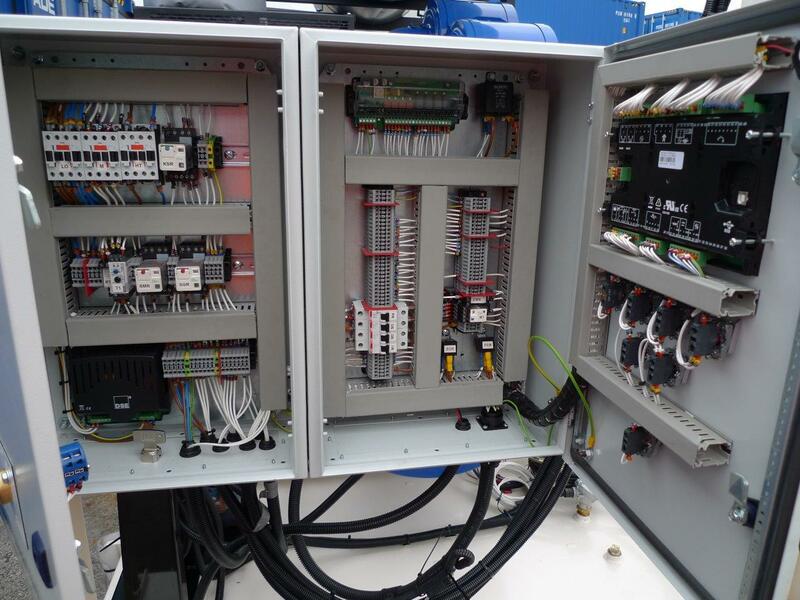 A standard CAT diesel generator had some control panel modifications, made to suit the existing site control gear, the original equipment was removed and a deep sea controller fitted. 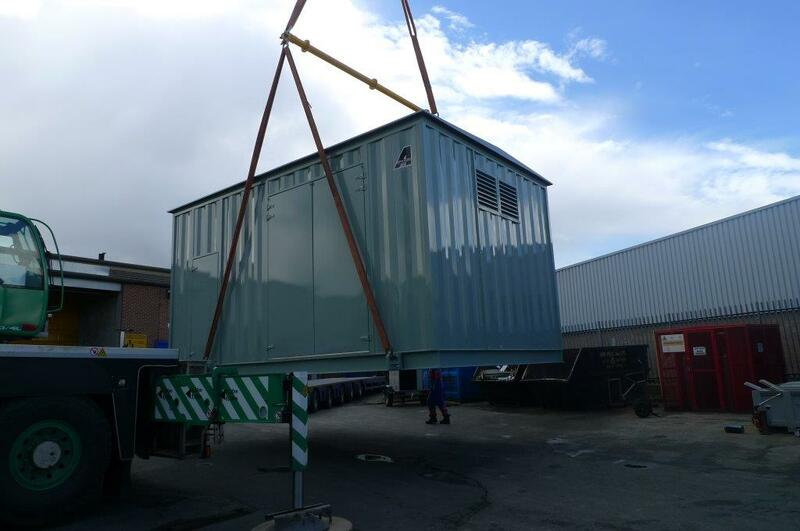 Installation is currently being carried out in Leeds. 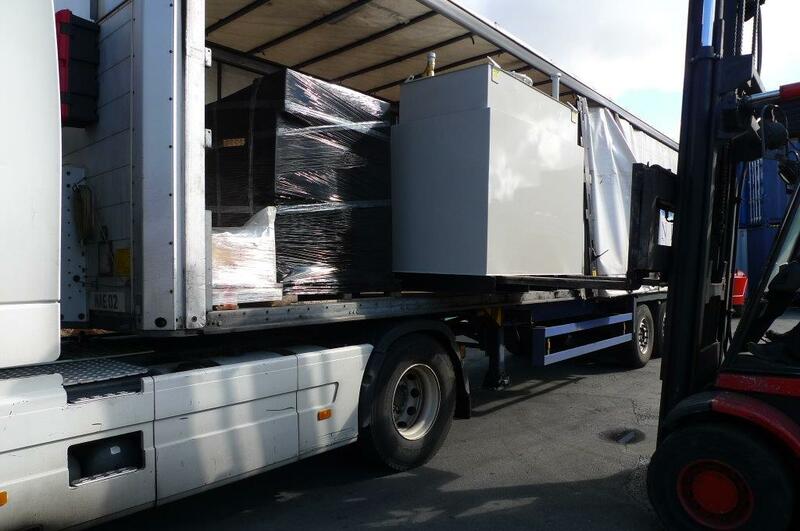 Yet another standard set being dispatched to another UK reseller, this C38 is complete with an ADVANCED designed & built ATS panel. 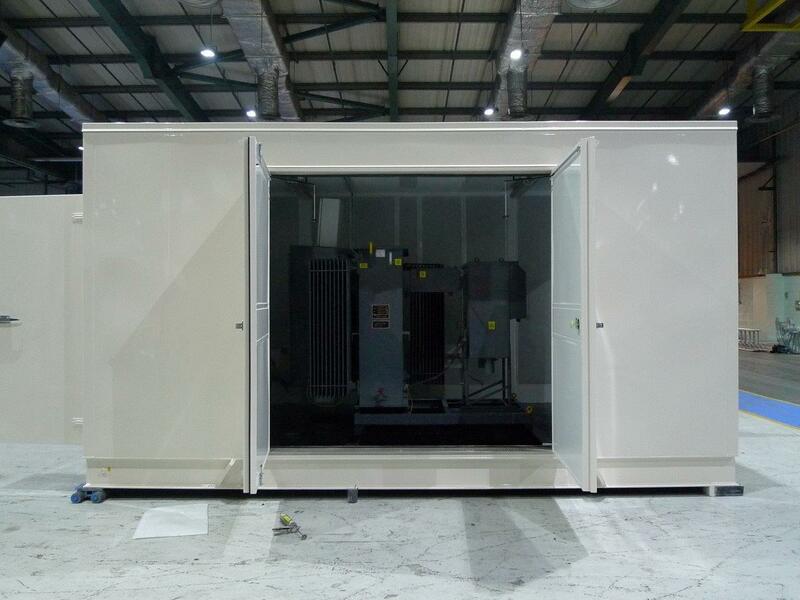 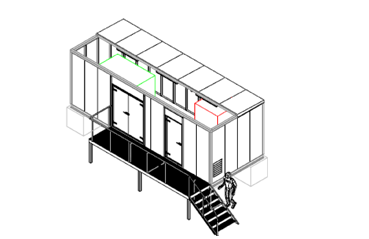 Enclosure only this time, the client will up fit their own gas powered generator and ancillary equipment. 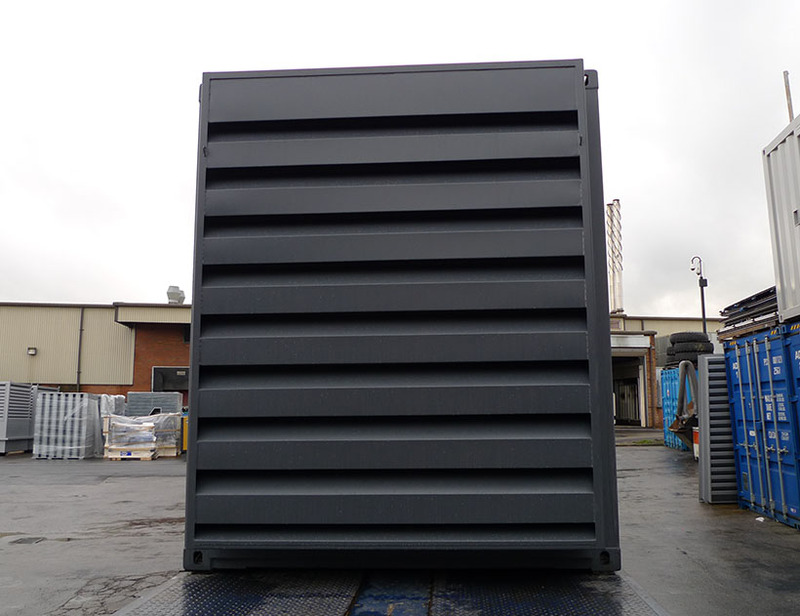 This whole unit was designed and manufactured in house at ADVANCED. 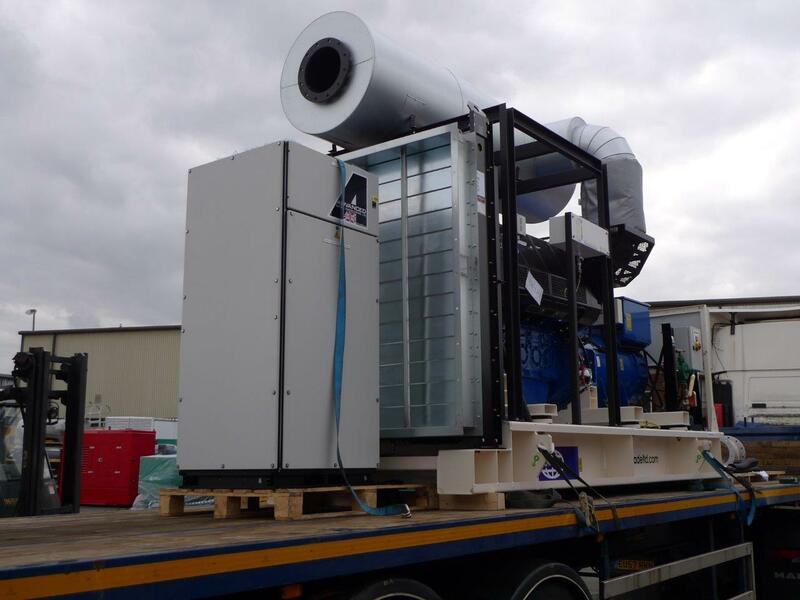 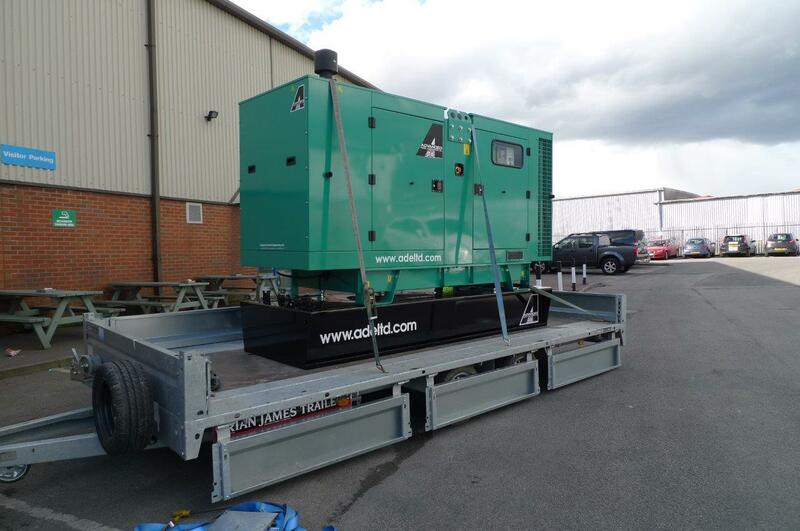 This standard Cummins 38kVA enclosed diesel generator is being transported to one of our many UK resellers. 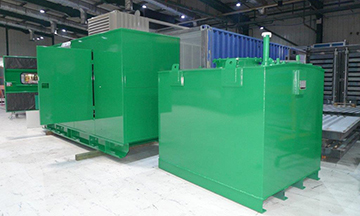 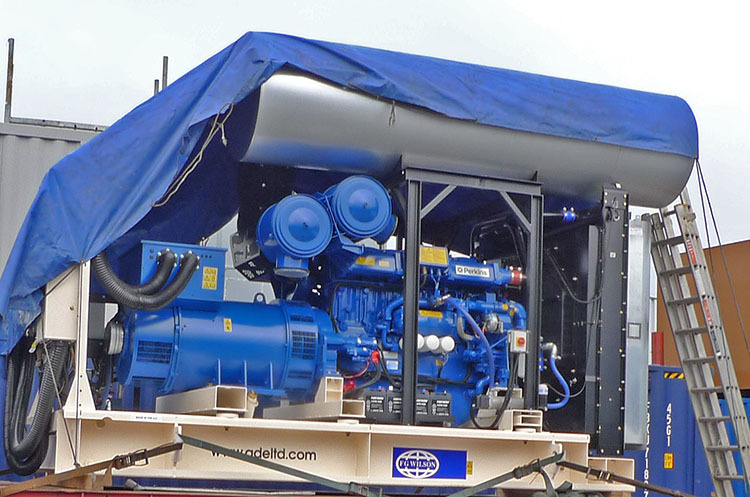 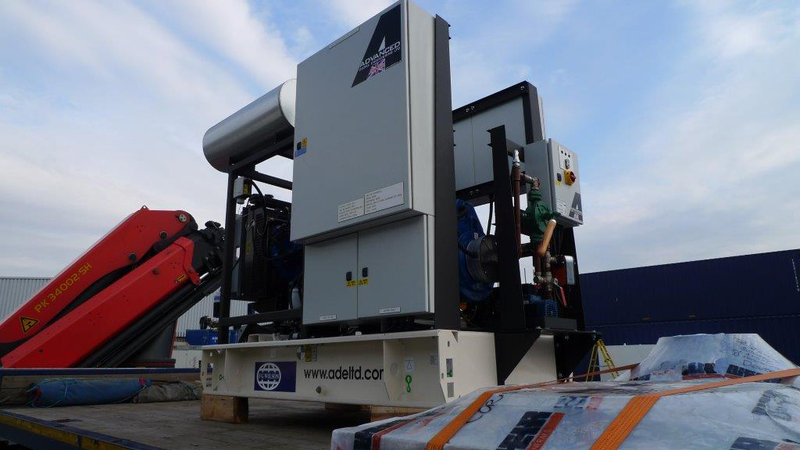 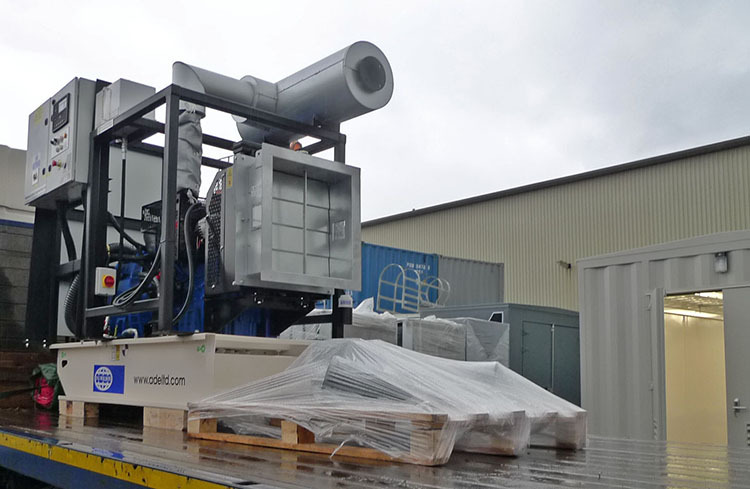 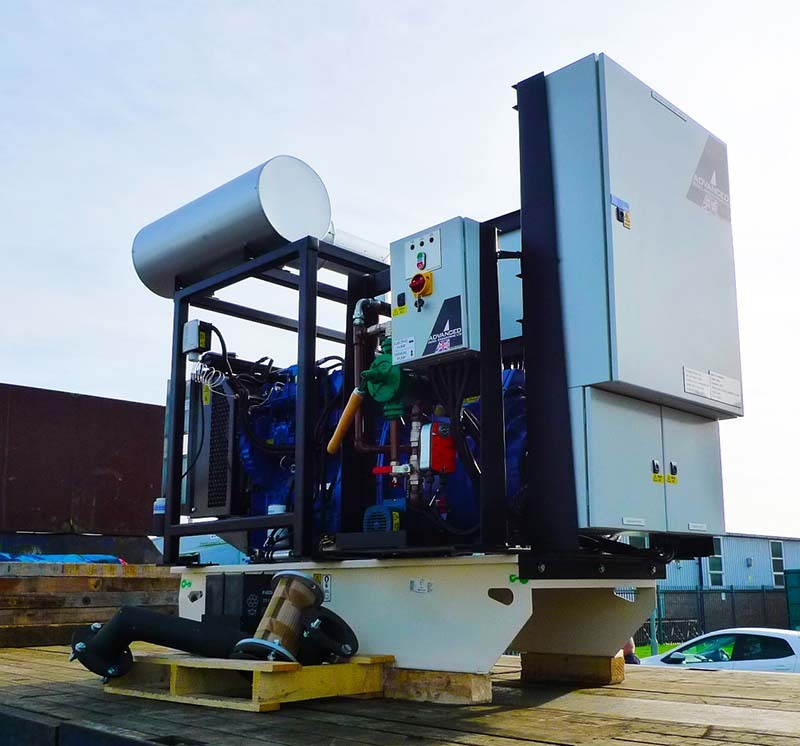 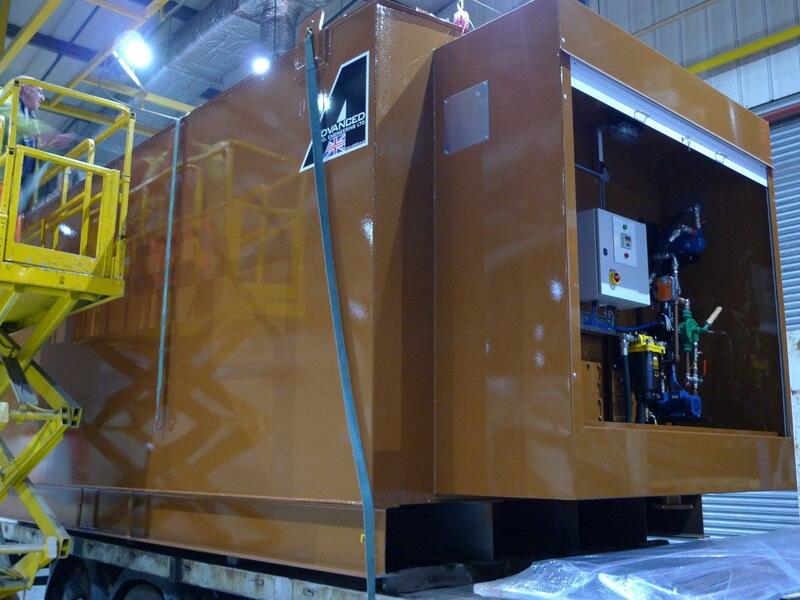 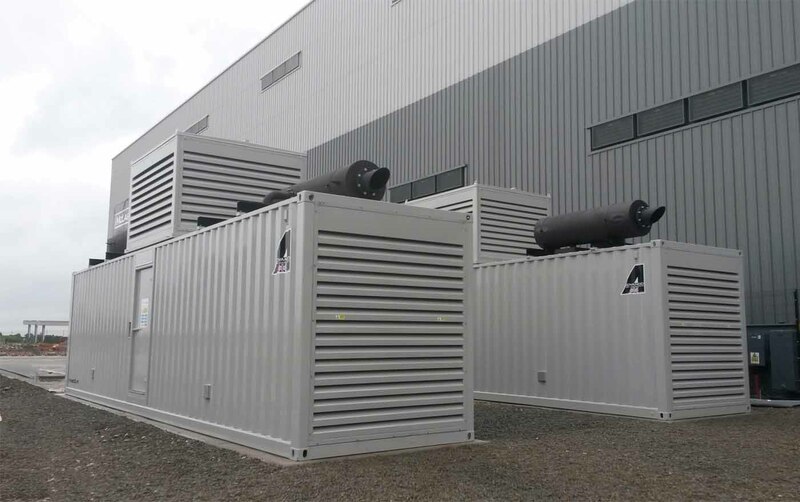 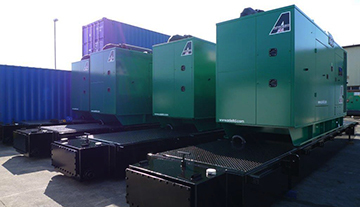 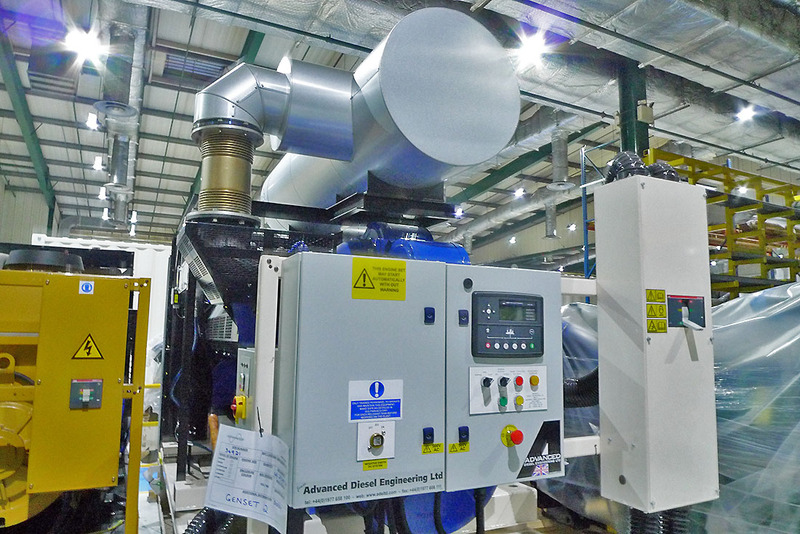 These matching pair of 2250 kVA acoustically packaged diesel generators were designed and built at ADVANCED, based on the same theme as our mining application unit, with some minor tweaks. 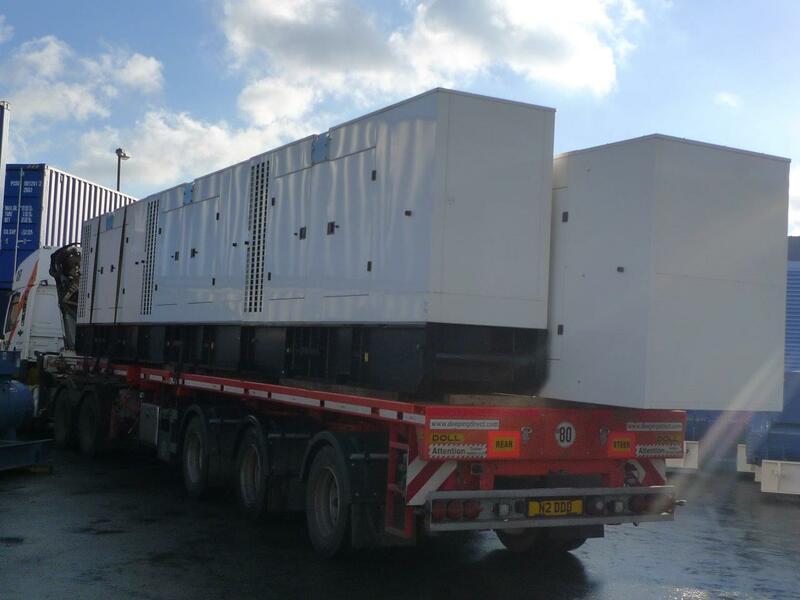 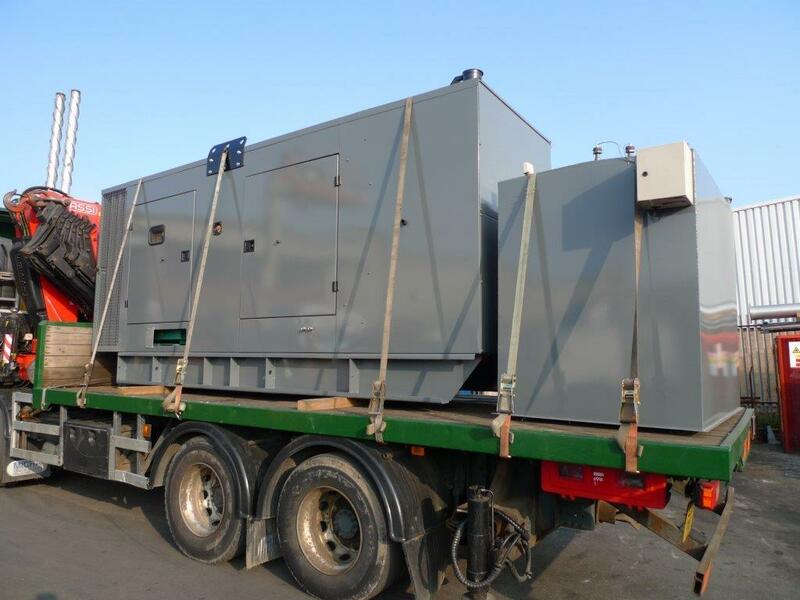 The unit is kept within the ISO measurements to allow them to be shipped worldwide.This time the generators will be used as a backup power for an Egyptian Data Centre. 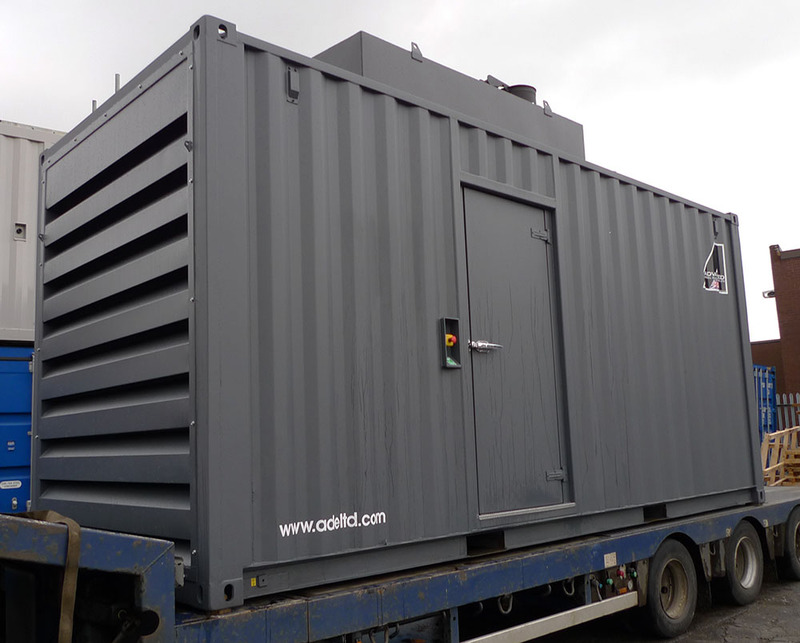 This weeks dispatch for the telecoms project was a 200kVA Cat open set and a 800kVA Perkins open set, both sets have been modified and upfitted with additional control gear, oil make up tanks etc. 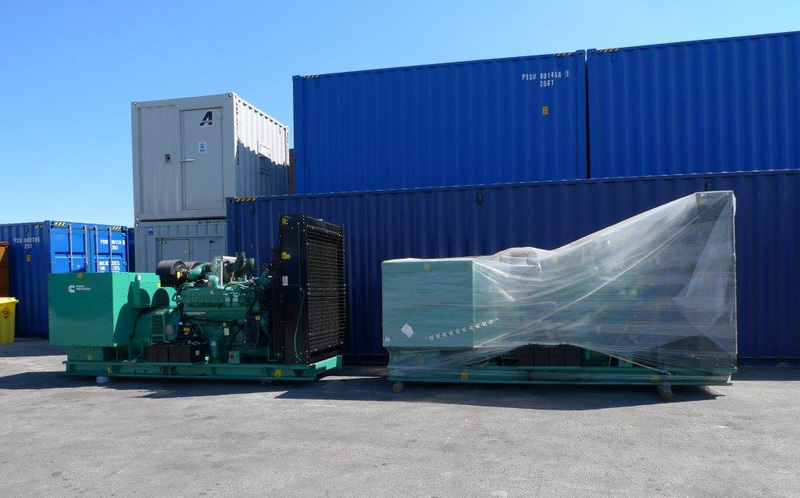 These Cummins 90kVA, 220kVA, 330kVA and 550kVA standard diesel generators are being loaded and shipped to Turkey and sold to an ADVANCED export reseller. 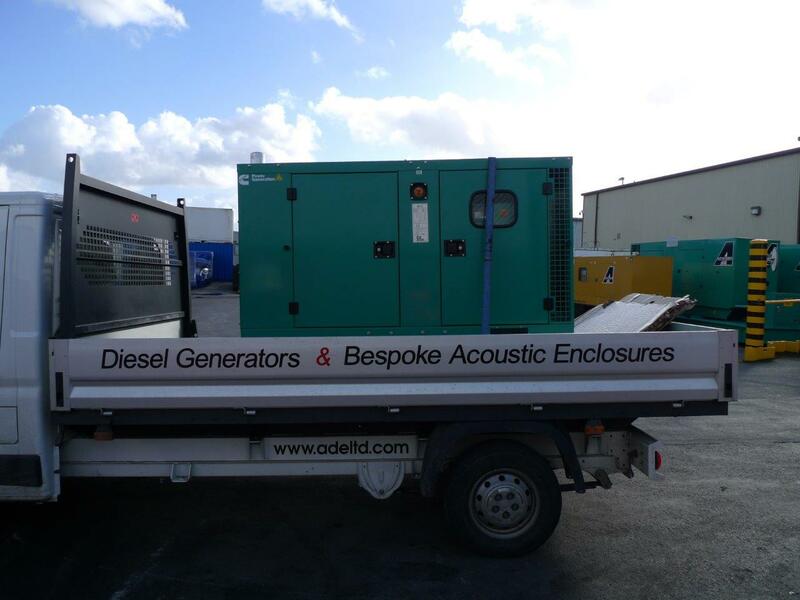 This 22kVA Cummins silent diesel generator along with an ADVANCED built four pole auto transfer panel, was dispatched to an electrical installation company in Devon. 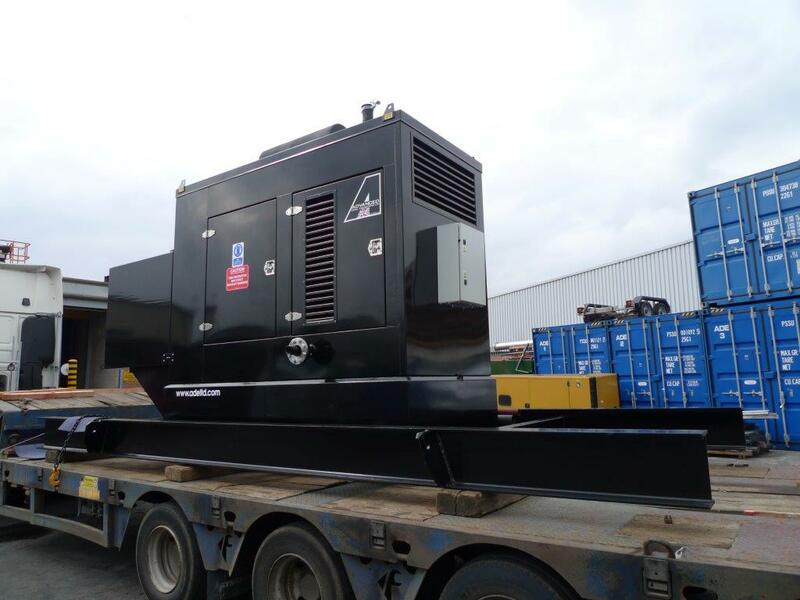 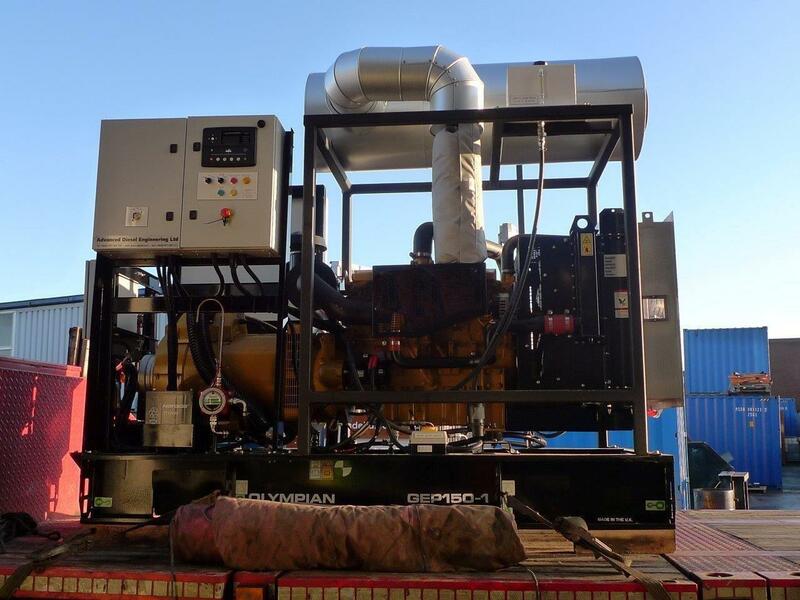 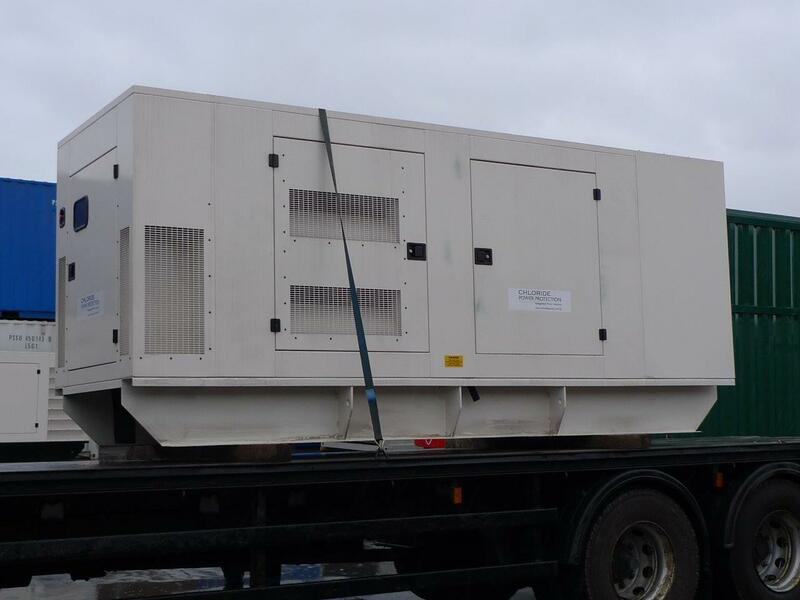 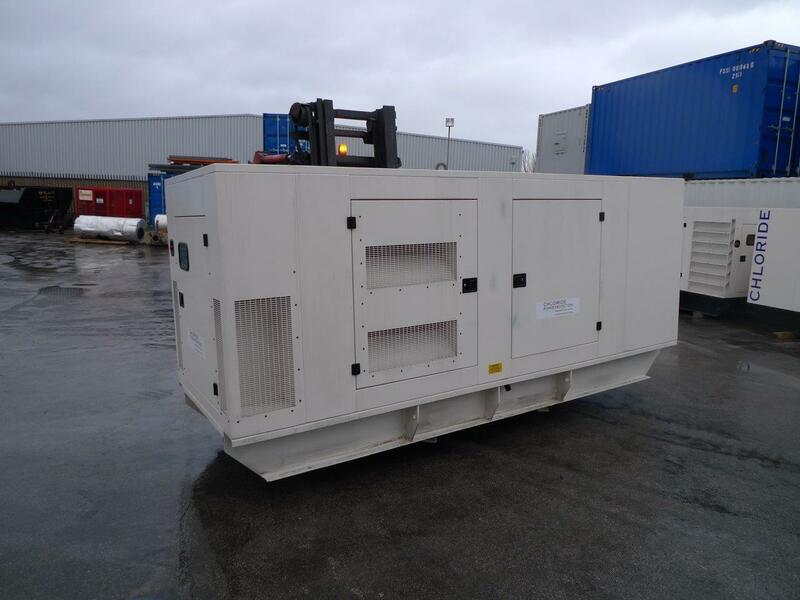 This 110kVA Cummins silent diesel generator will be used by a northern demolition company to supply on-site power, where demolition works are being reduced down to ground level. 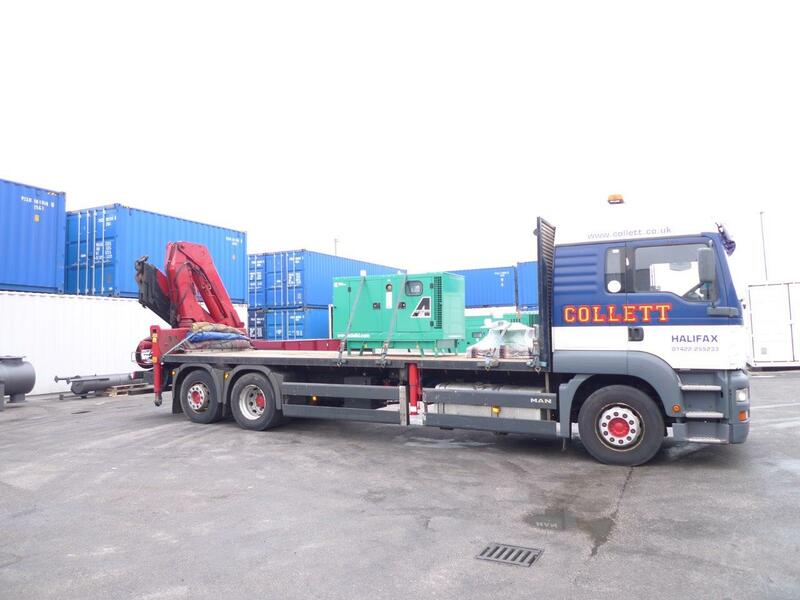 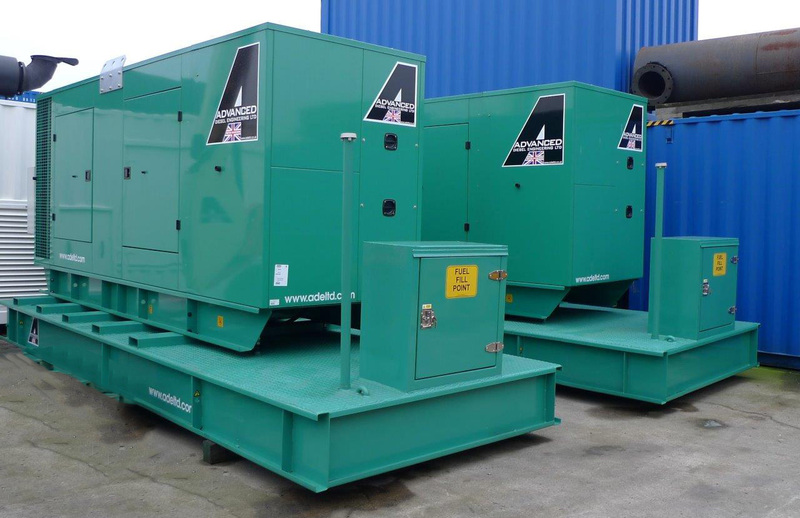 These four 500kVA used Scania diesel generators were brought in by ADVANCED, as a part exchange scheme for two larger replacement sets.They were off loaded and resold within one hour of being in our works! 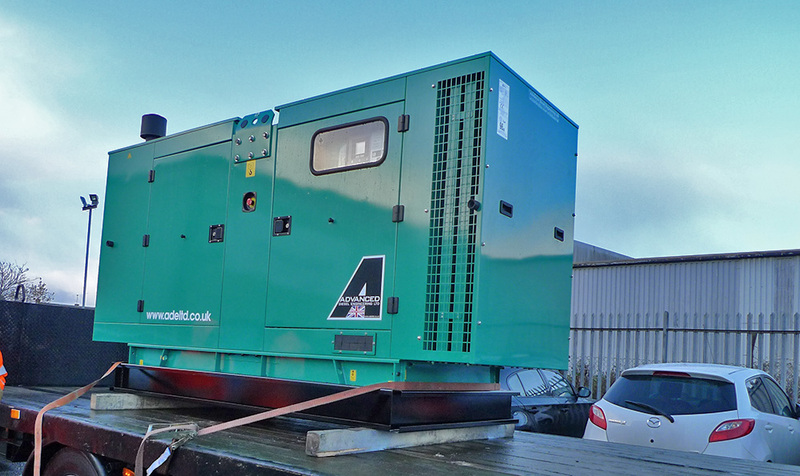 This standard enclosed Cummins 66kVA diesel generator was dispatched to an ongoing reseller in Plymouth. 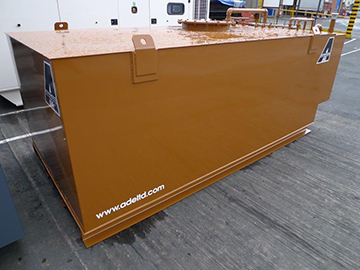 Since the decision by management to bring the design and build of double skinned bulk fuel tanks in house to compliment the already vast array of services provided by ADVANCED, the pictures show the 100th bulk fuel tank designed and built in less than 18 months.This particular 32,000 ltr one is bound for a UK Prison Project, the generator and containerised substation is to follow when complete in a few weeks time. 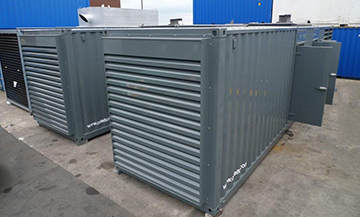 Another batch of surplus rental enclosures didn’t have time to stay on the ground very long, before they were resold and dispatched! 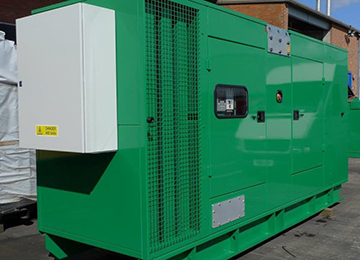 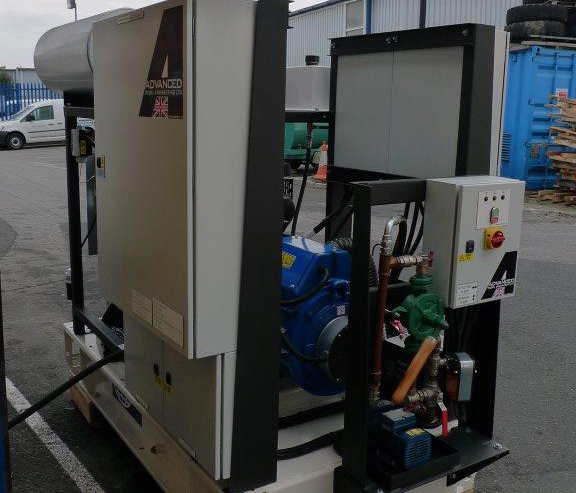 This 2500 kVA Perkins diesel generator was fitted into an ADVANCED designed & built 65dba @ 1 metre super silent enclosure containing a 2000Ltr day fuel tank & 50 Ltr automatic oil top up system, supplied to one of our many prestigious returning clients. 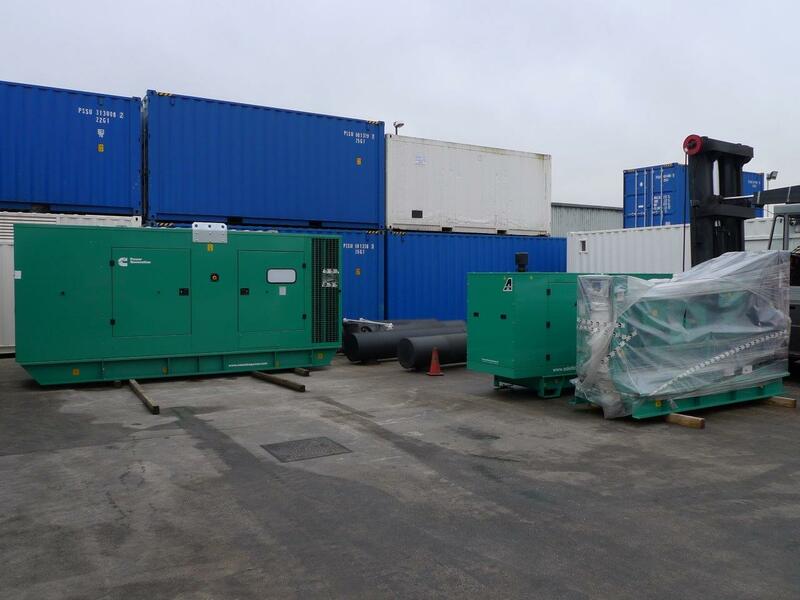 These three 1500 kVA paralleled Perkins diesel generators in their purpose ADVANCED designed & built acoustic enclosures incorporating 3000Ltr day fuel tanks and associated equipment, will be providing back up power to an NHS hospital in Scotland. 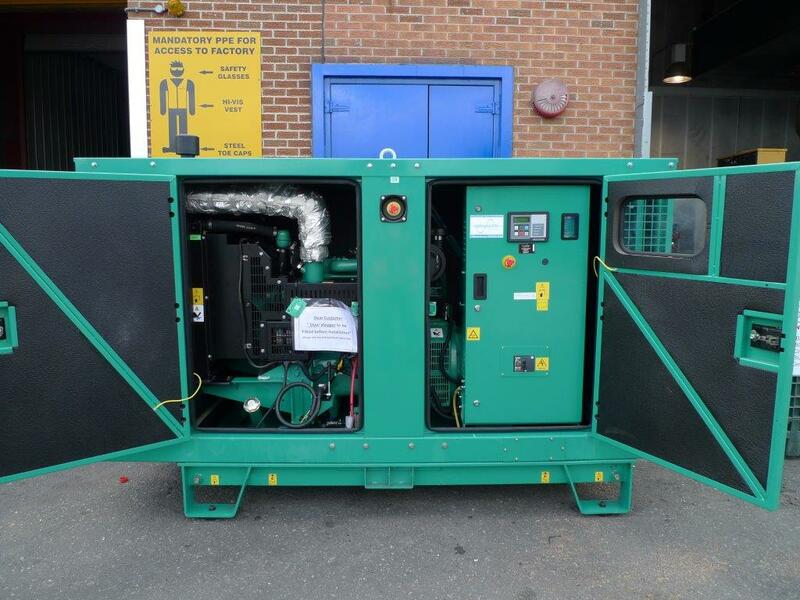 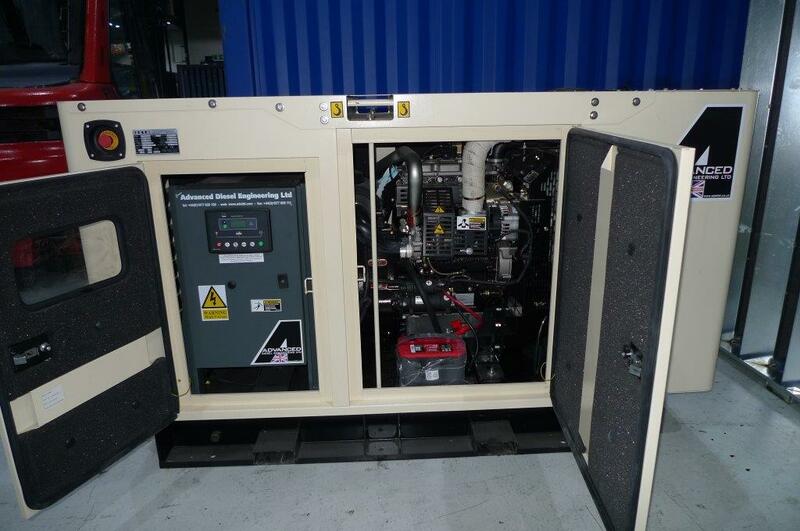 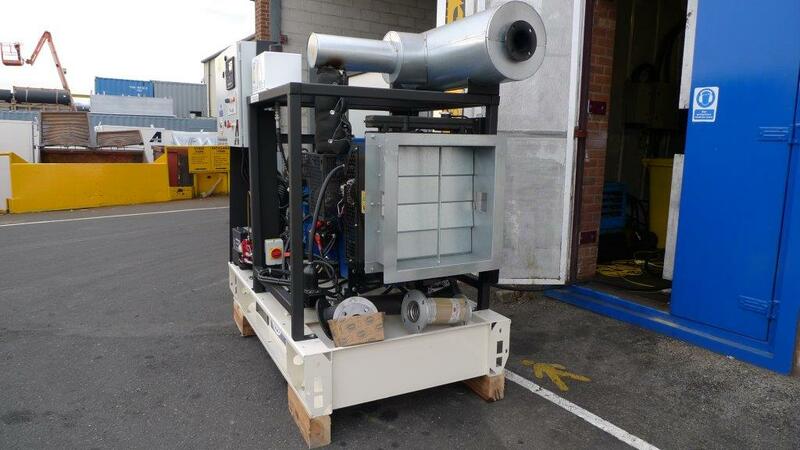 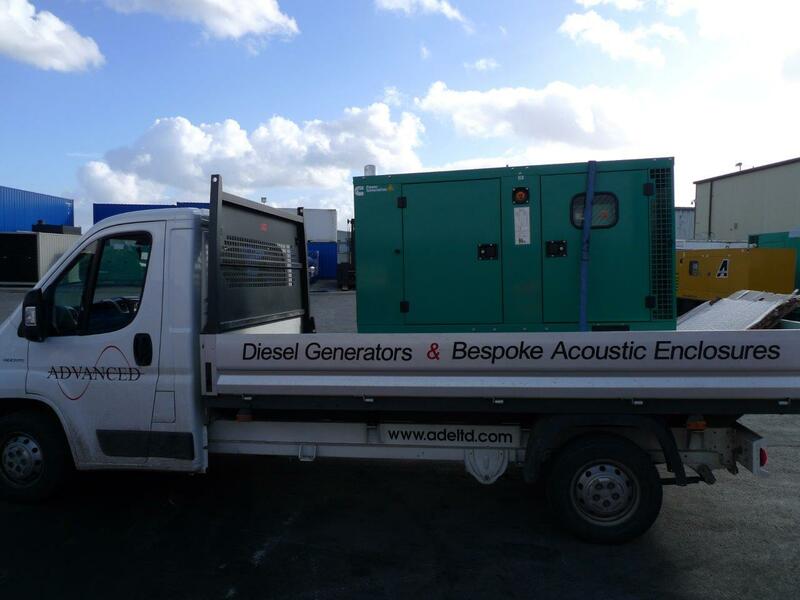 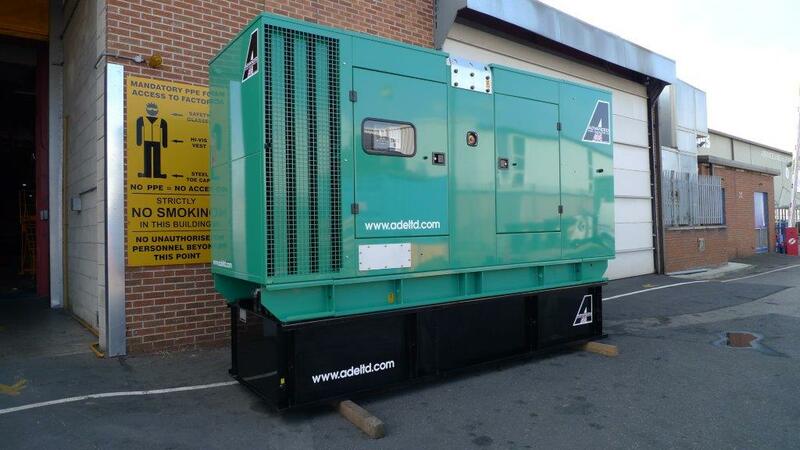 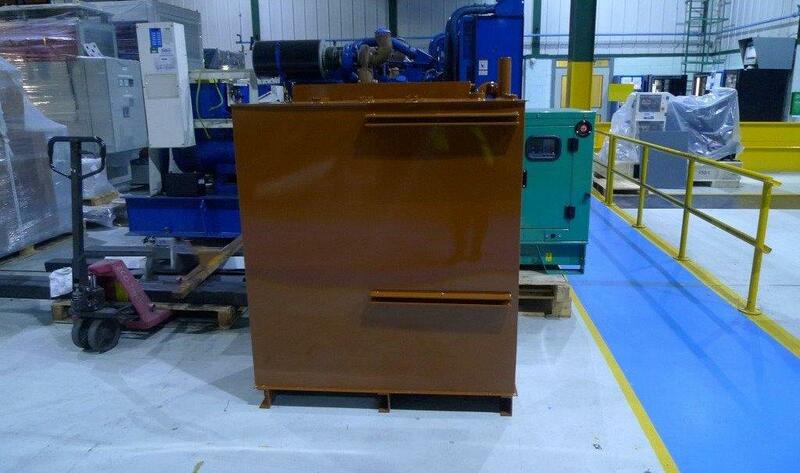 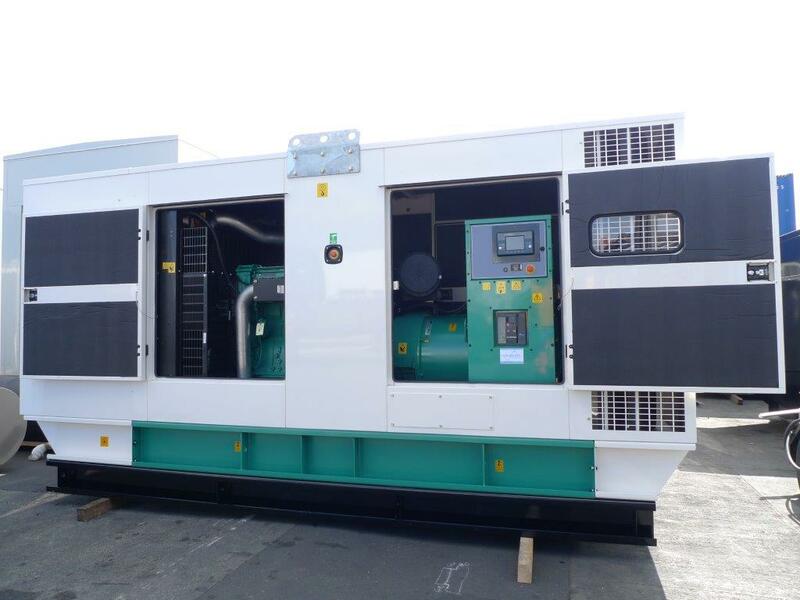 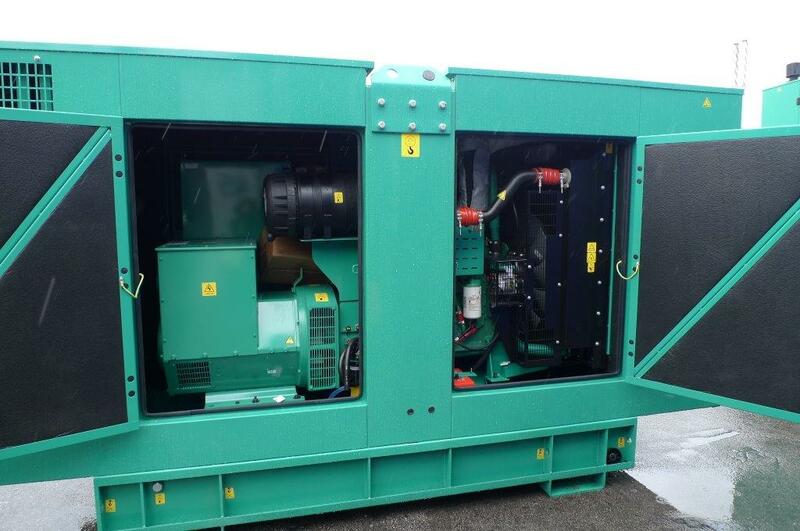 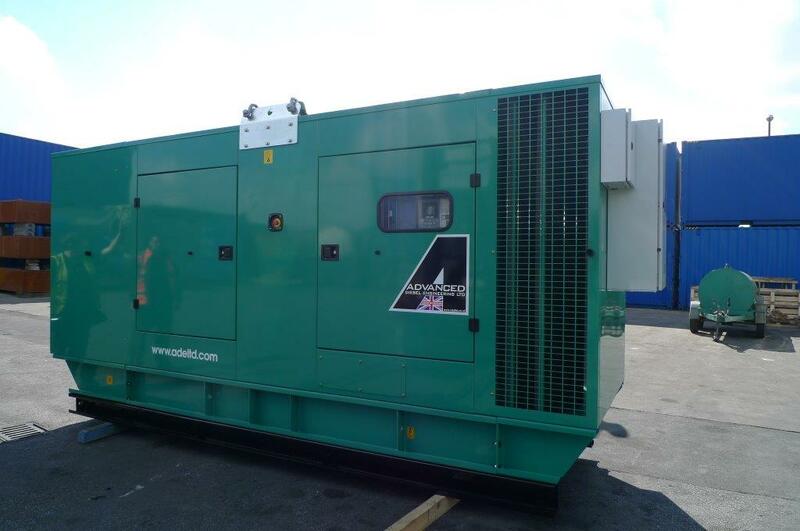 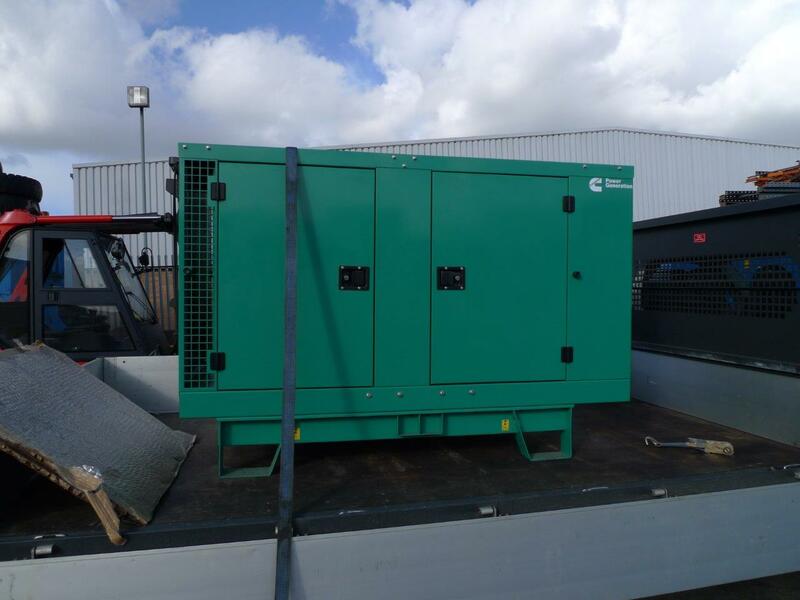 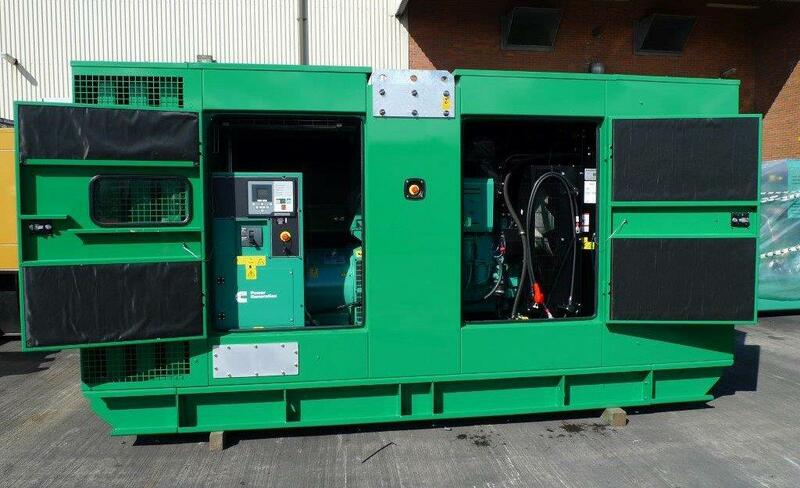 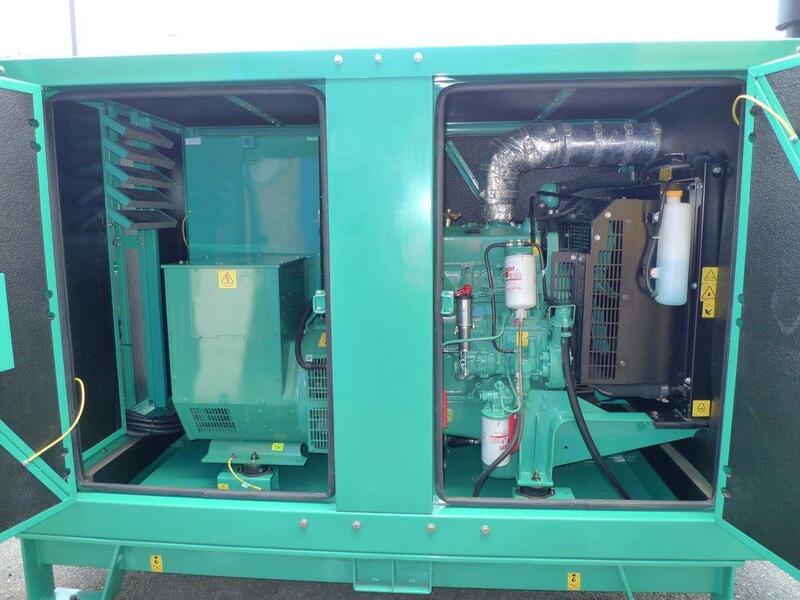 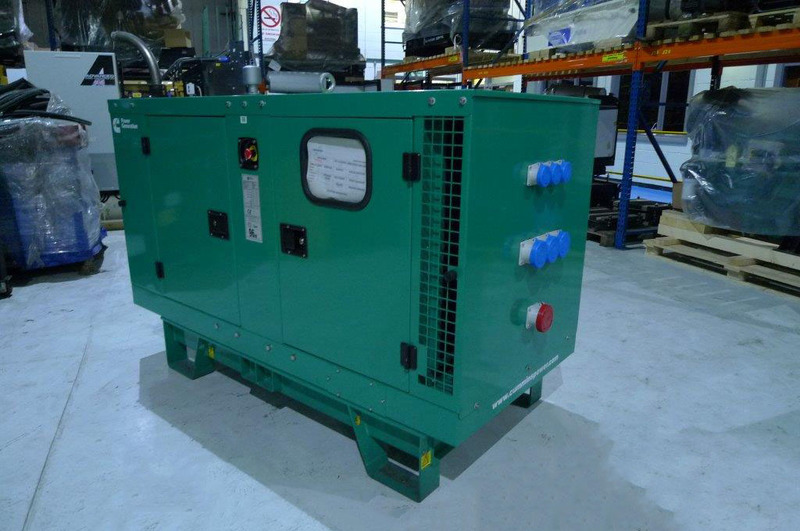 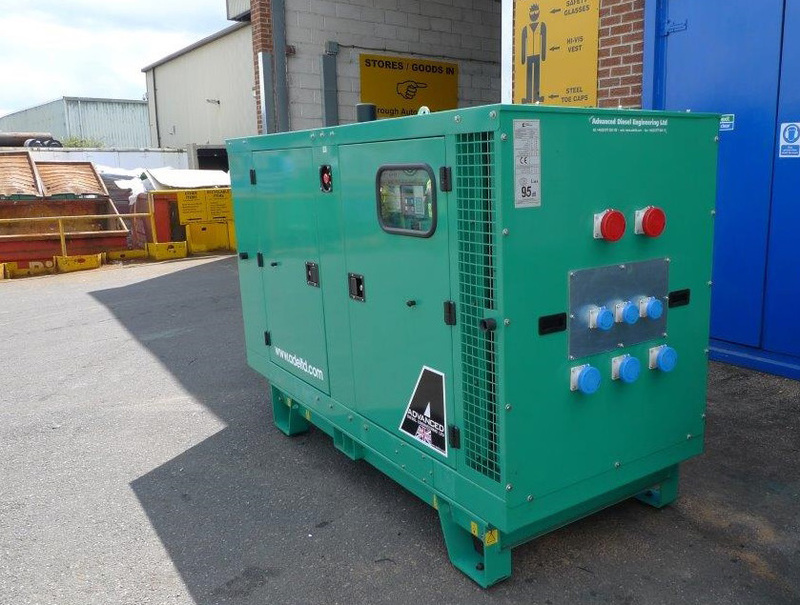 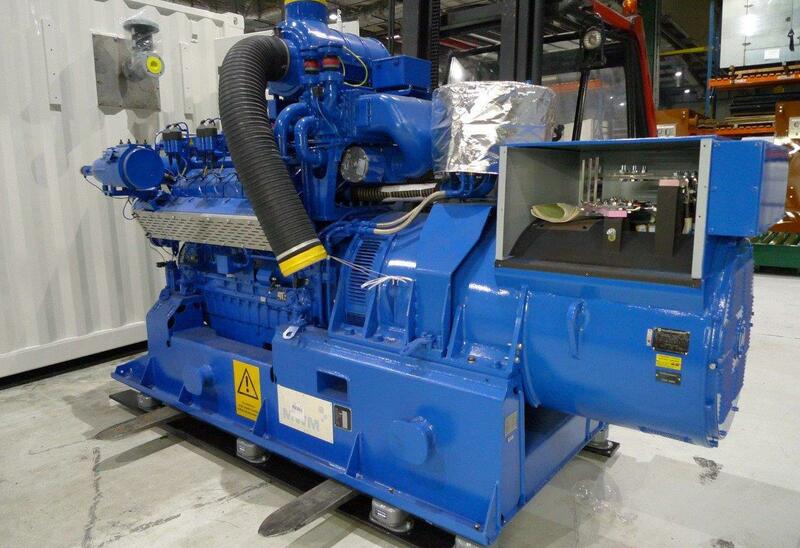 This 90 kVA Cummins enclosed diesel generator, was dispatched to one of our many UK resellers. 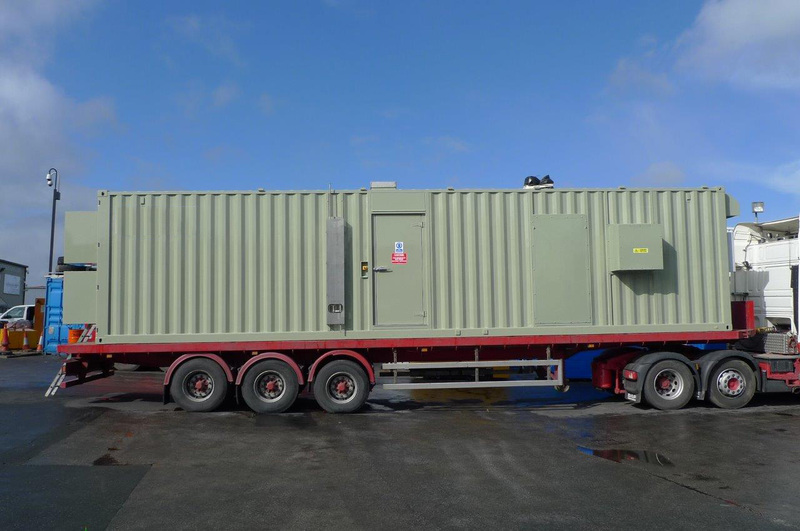 As part of our ongoing Telecoms project, this modified 800kVA Perkins diesel generator is being dispatched to a Darlington telephone exchange. 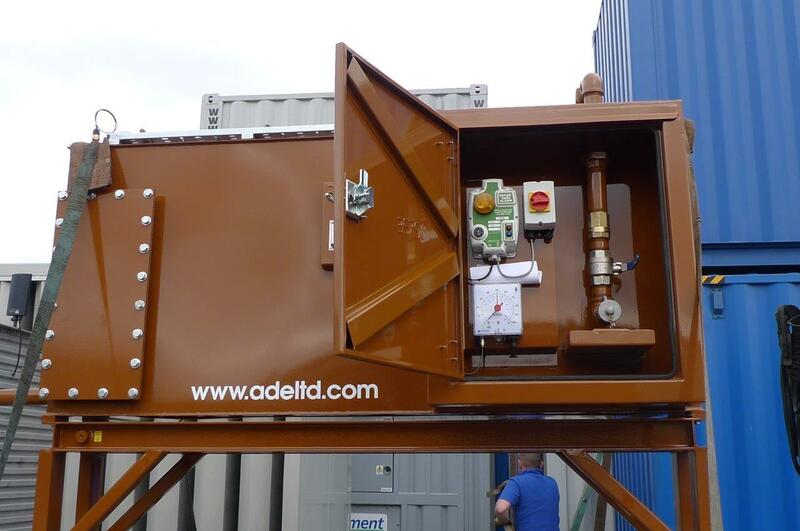 These duplex Plc controlled fuel polishing units were designed and built at ADVANCED to be fitted to existing bulk fuel tanks, on site at a UK Data Centre.Keeping the stored fuel at it's optimal quality. 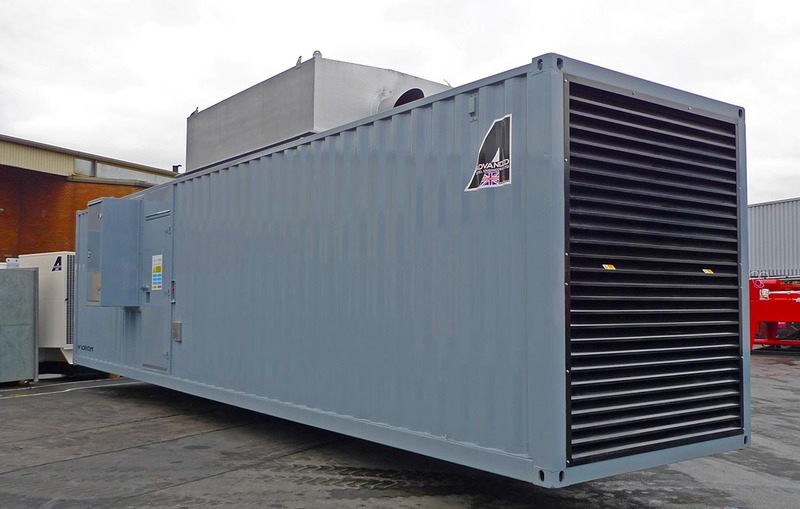 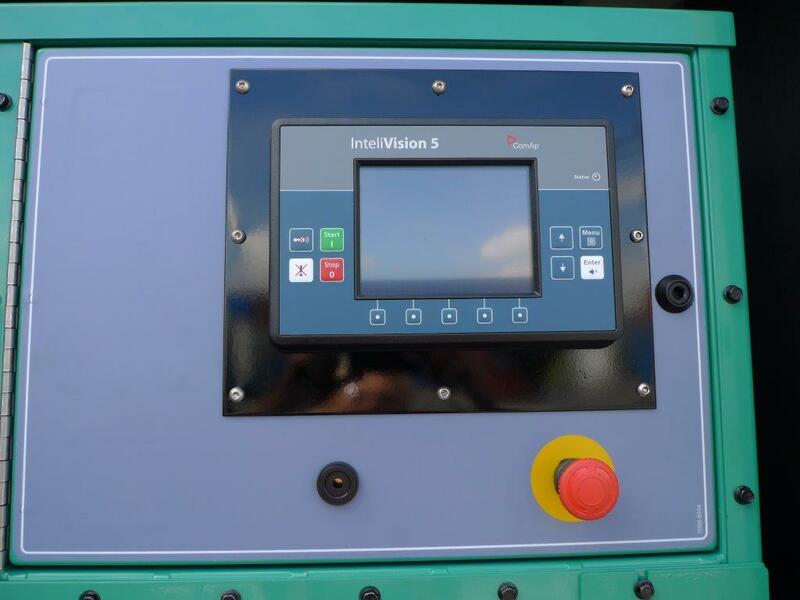 This 200kVA diesel generator c/w extended base fuel tank and ATS panel will provide standby power for one of the UK largest tropical animal attractions. 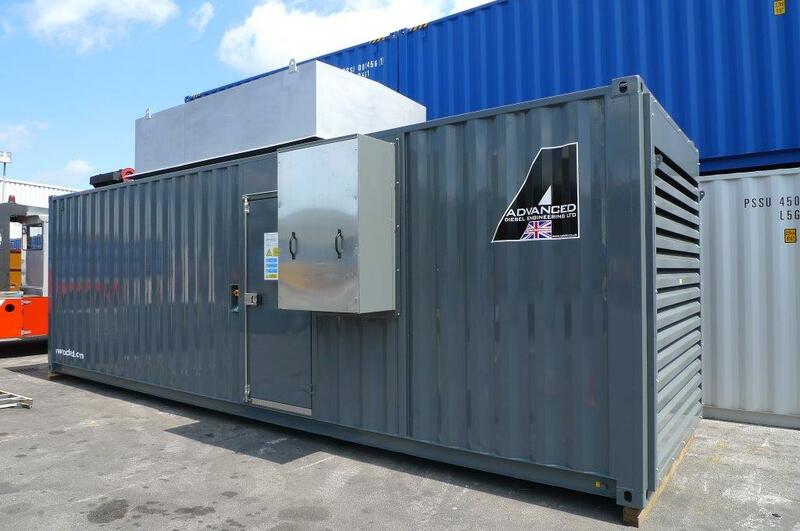 With the UK weather being so unpredictable, the animals have to be kept at a constant temperature 24/7 - even if the power fails! 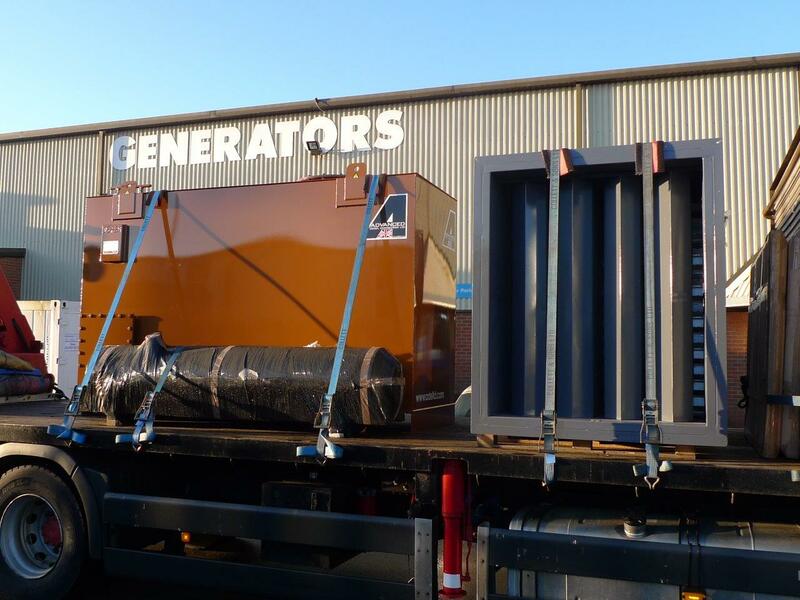 As part of a five year contract, an average of six generators per month are modified by ADVANCED, to meet our clients specific specification and are dispatched to telephone exchanges throughout the UK.After undergoing extensive testing at our works, this 50kVA Perkins and 550kVA CAT, are now on their way to site. 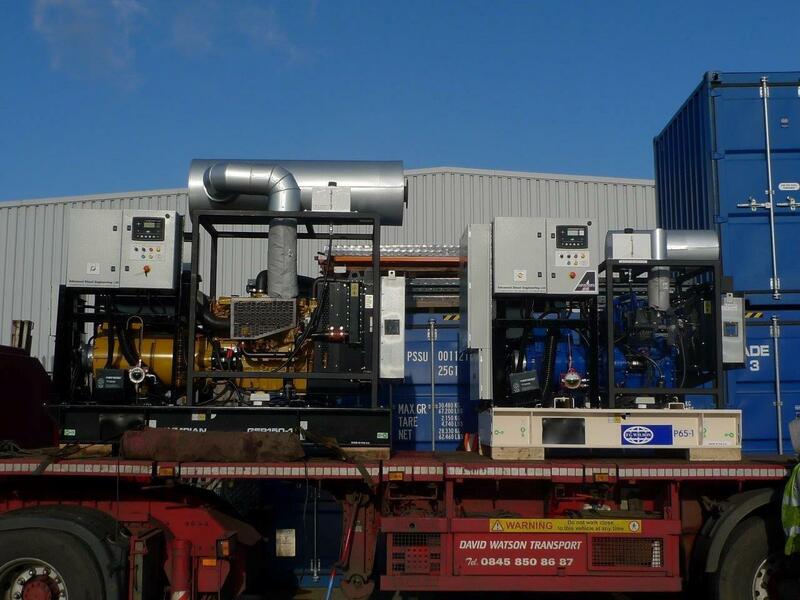 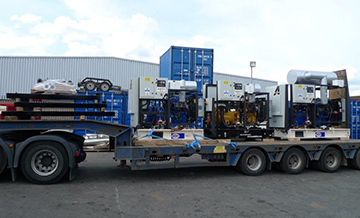 Shown here are two standard Cummins enclosed diesel generators, being loaded and supplied to one of our many reseller clients. 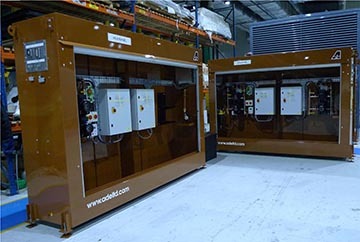 (90kVA and 250kVA auto start machines). 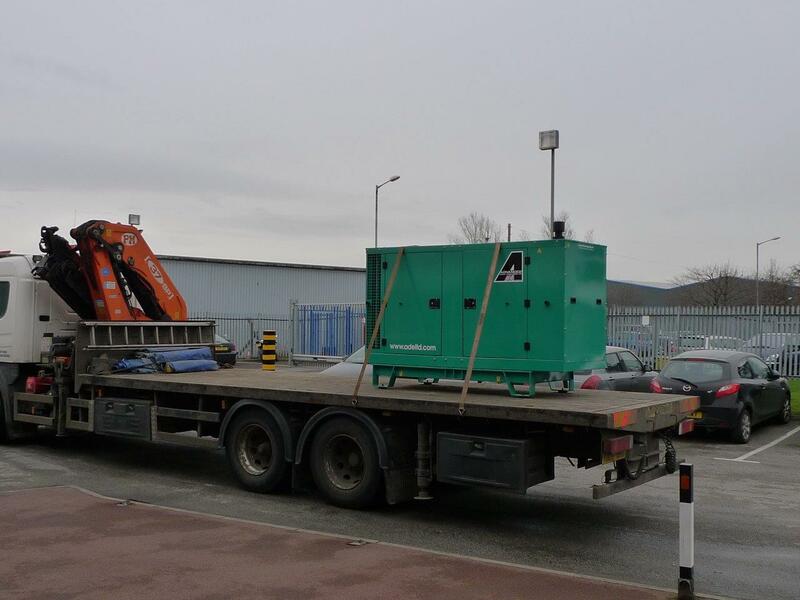 Another order from one of our prestigious clients. 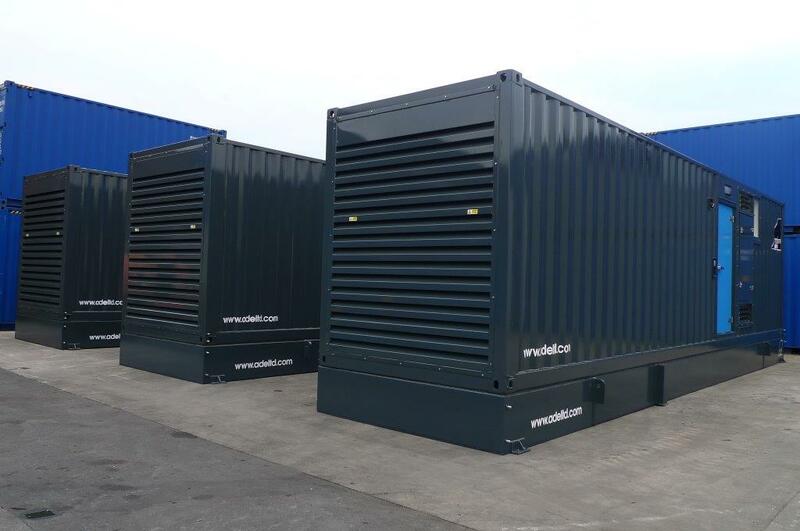 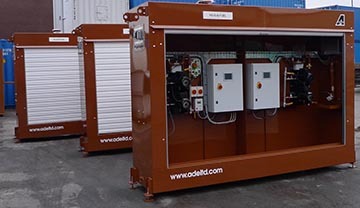 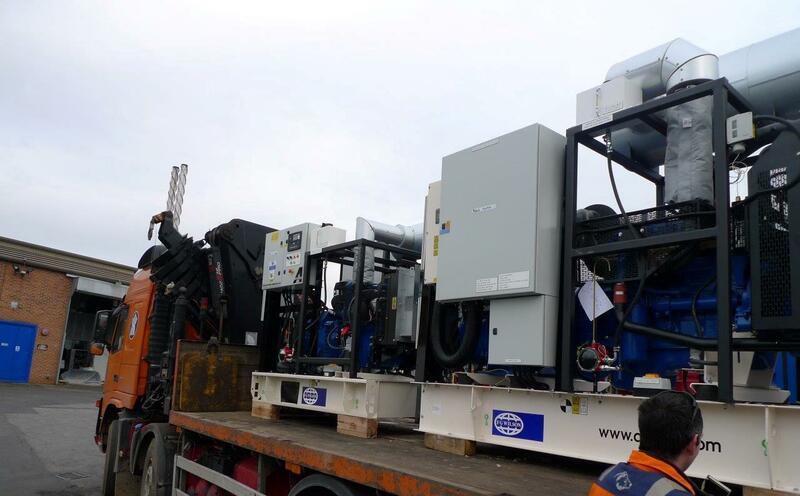 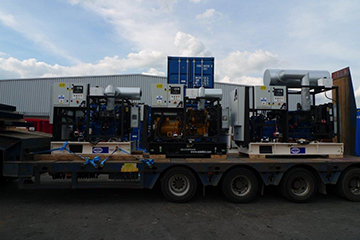 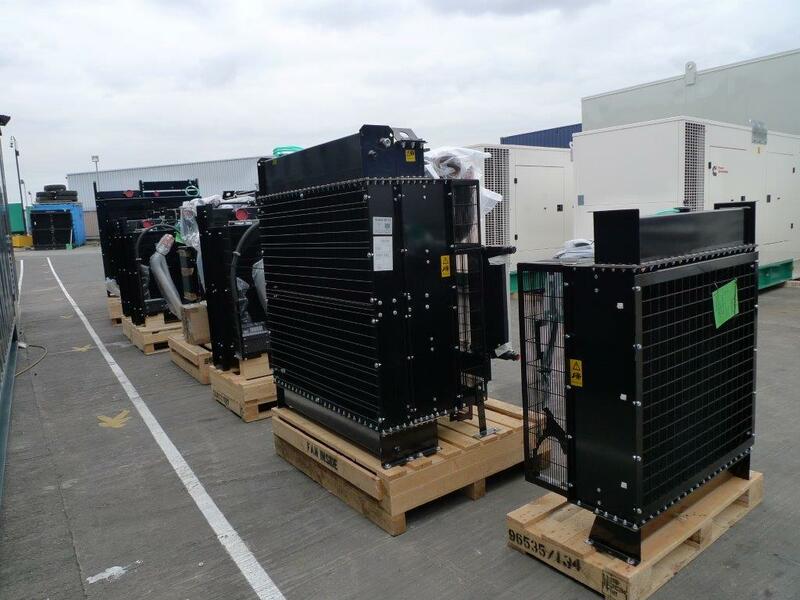 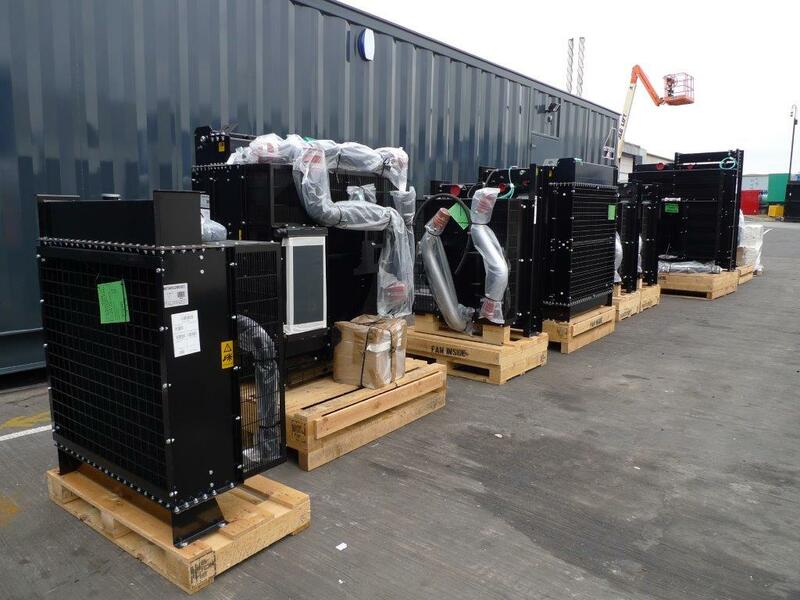 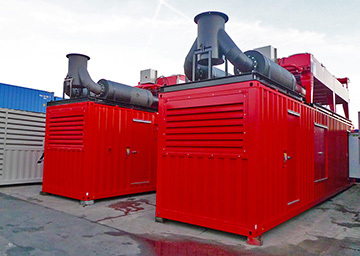 These three 900kVA synchronised Cummins diesel generators in their bespoke ADVANCED designed & built 'super silent' enclosures, will be installed and online within a few weeks at a UK Data Centre.The sets are mounted on 'double skinned' 11,000 Ltr base fuel tanks and incorporate the latest in fuel cleaning technology, to keep the dormant fuel crystal clear at all times. 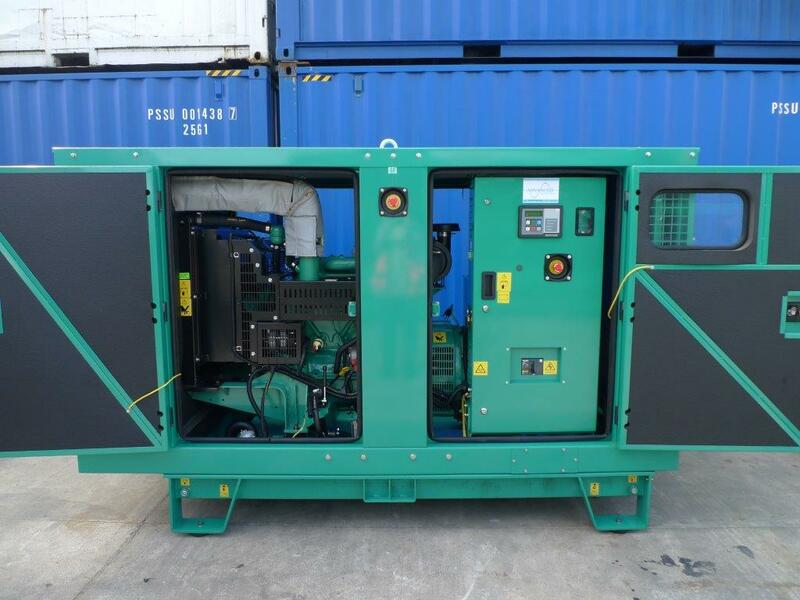 This 110kVA Perkins enclosed diesel generator, was up fitted with a Deep sea 7110 electronic control panel at the clients request.The generator is now on its way to our agent in Egypt. 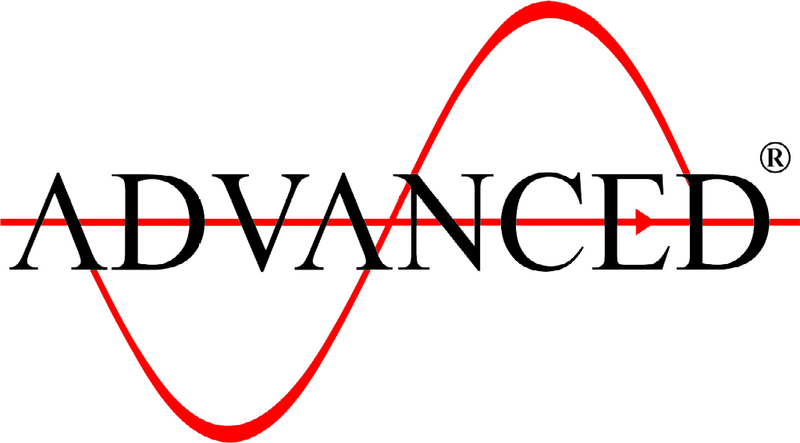 It's becoming a weekly trend! 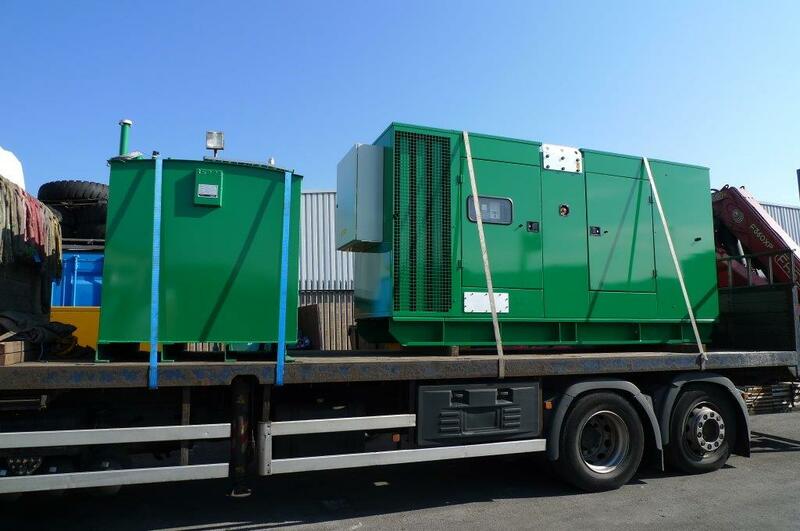 This time two ADVANCED modified open diesel generators (1x 150kVA and 1x 65kVA), for two separate telephone exchanges are now ready for dispatch. 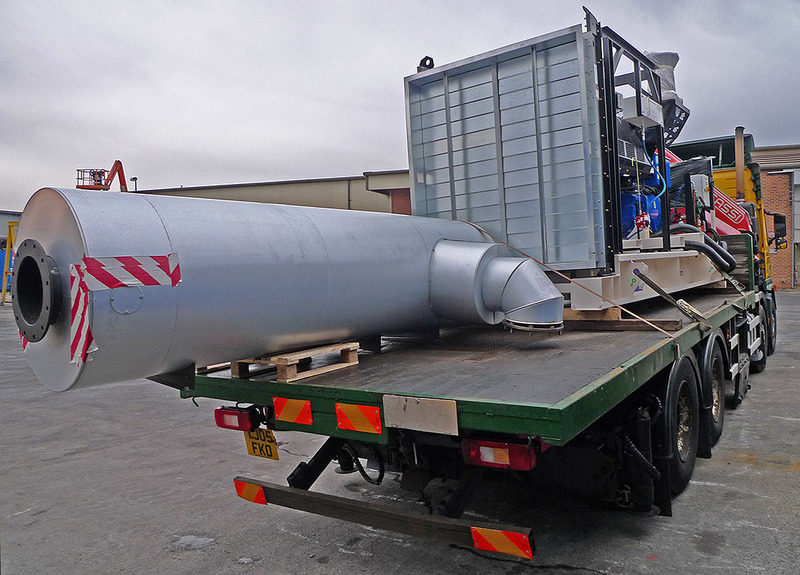 These are loaded onto the same vehicle, as one of the delivery sites is very close to the other. 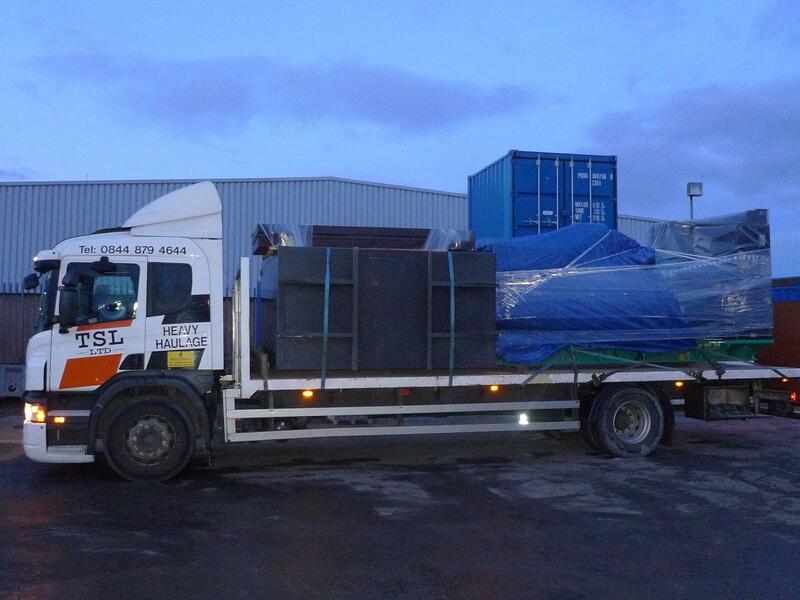 The remaining few surplus acoustic canopies are loaded and sent on their way to a generator hire company in the Midlands. 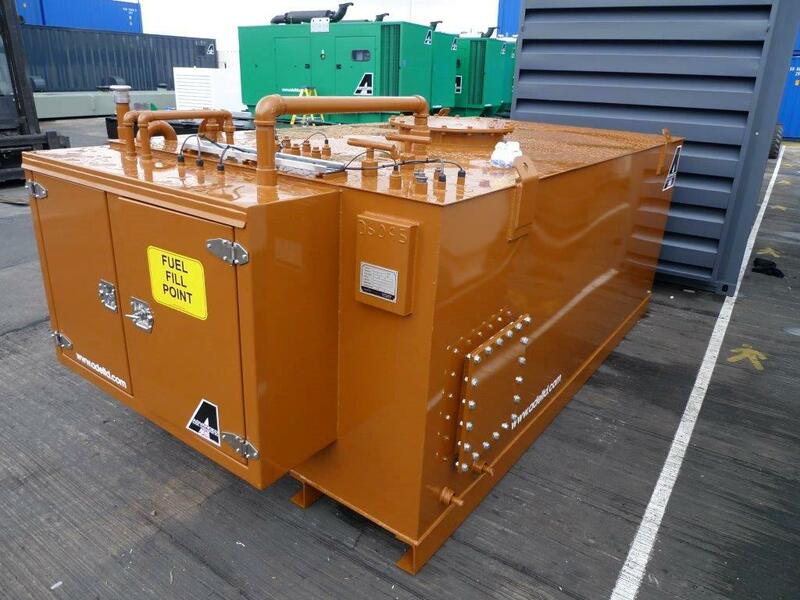 ADVANCED have an ongoing reputation with the prison service for designing, manufacturing and installing diesel generator systems, be it plant room or containerised sub stations.Being dispatched today is 1,800 Ltr double skinned day fuel tank, exhaust framework, exhaust silencers, acoustic attenuators, LV switchgear and a Cummins 1100kVA diesel generator. 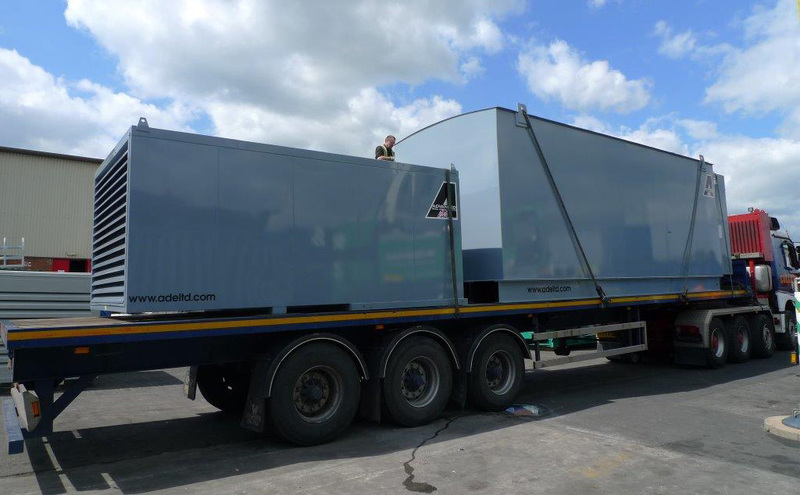 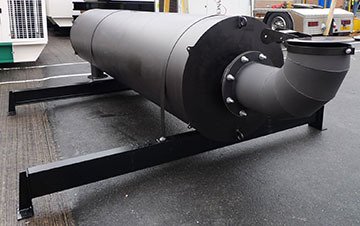 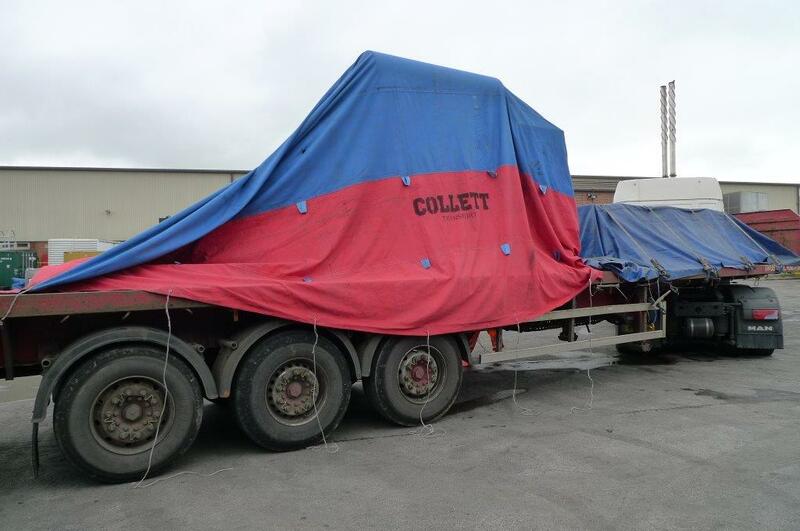 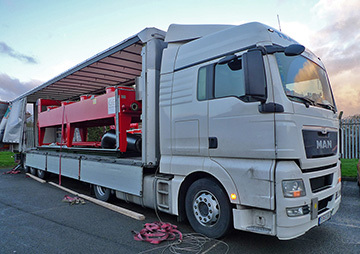 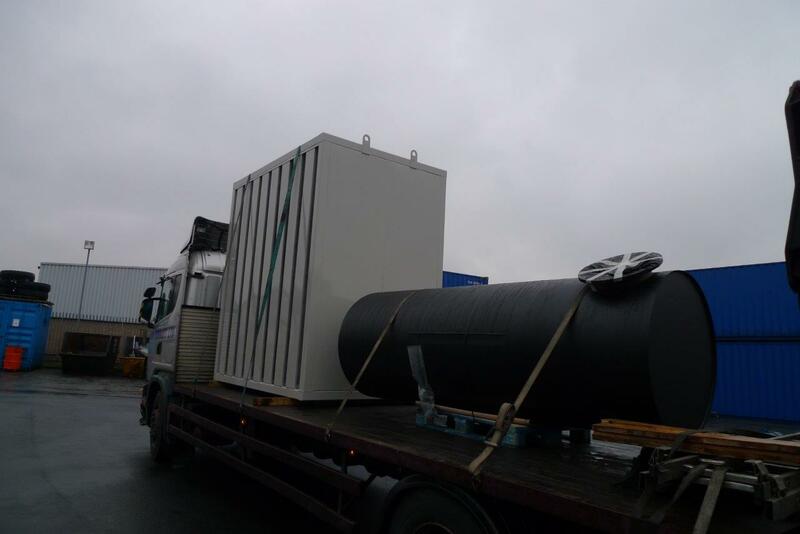 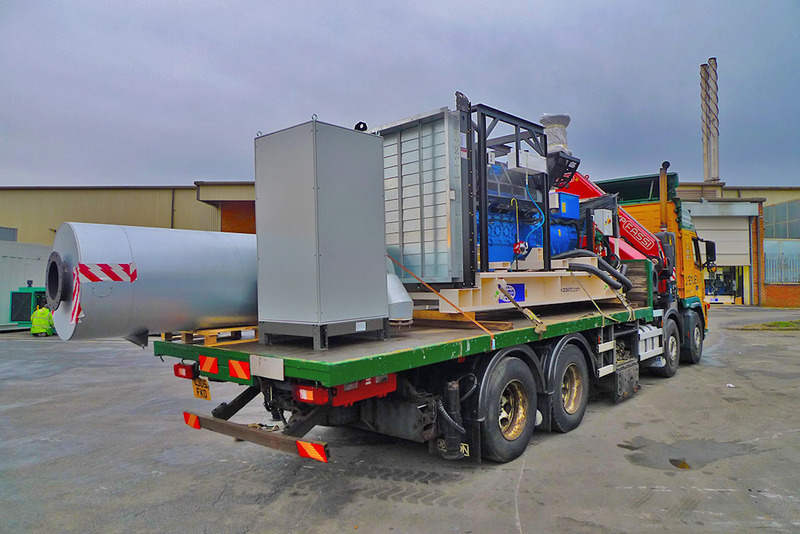 A 3,200 Ltr double skinned fuel tank, exhaust silencer and acoustic attenuator is seen here being transported to site, ahead of the generator. 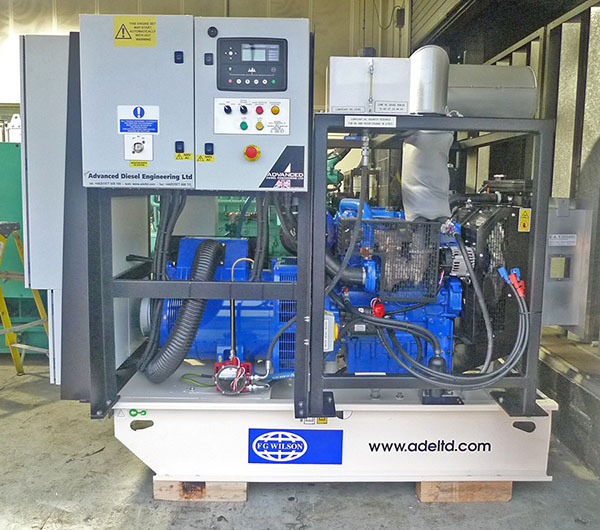 All designed and manufactured here at ADVANCED. 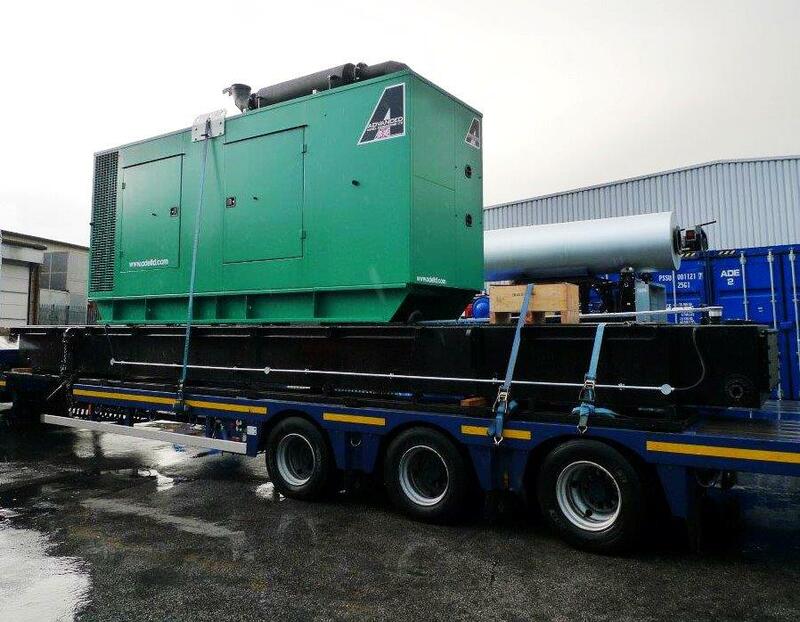 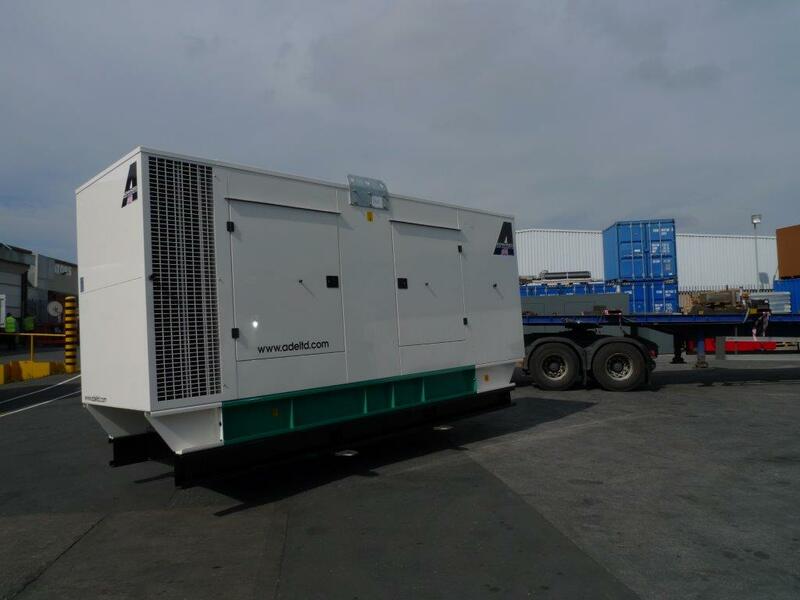 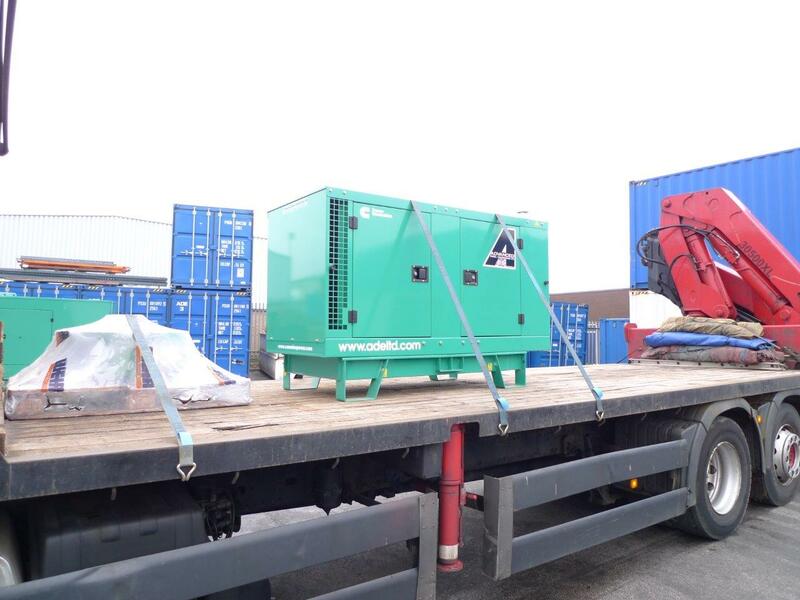 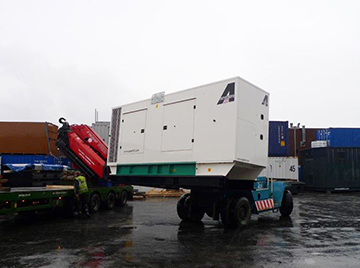 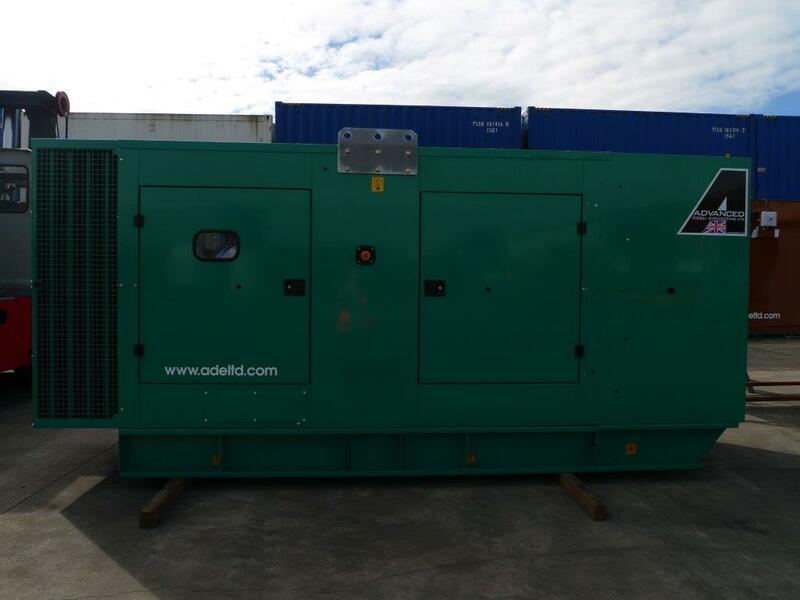 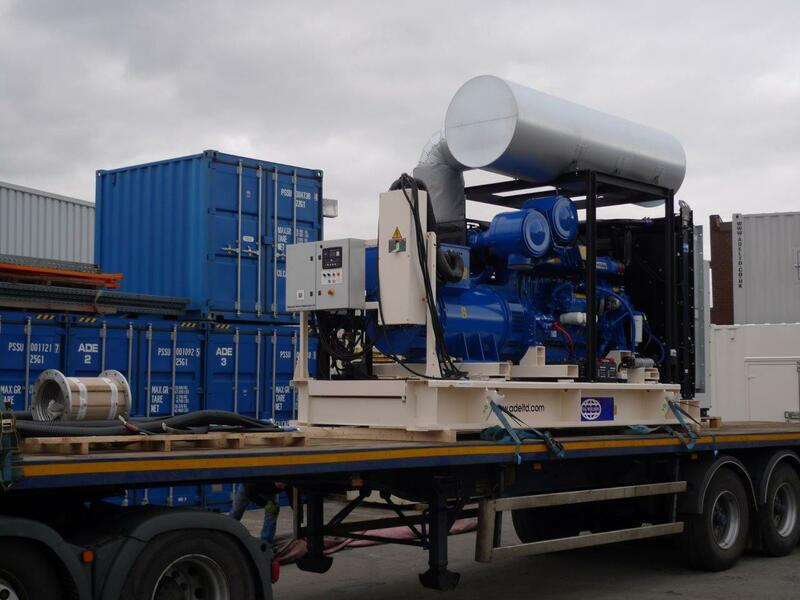 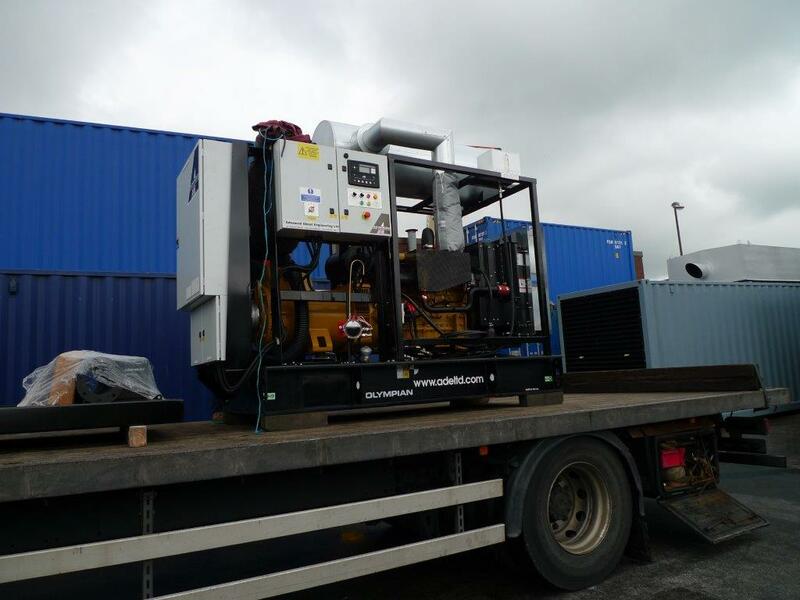 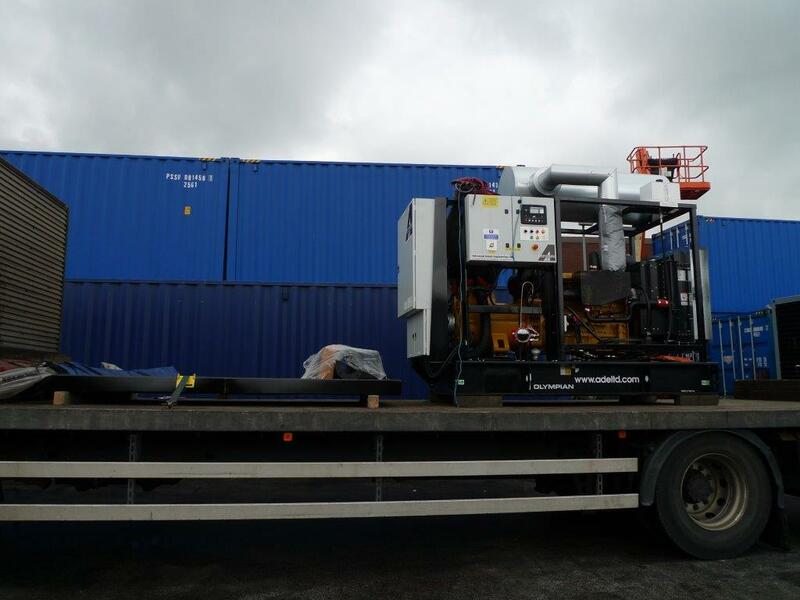 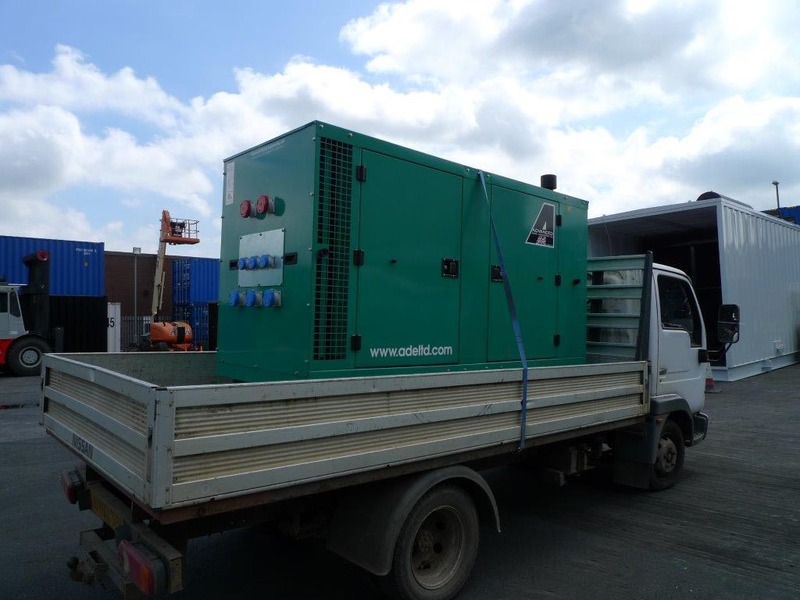 This 110kVA enclosed Perkins generator was dispatched to our African agent, who had pre-sold the unit to a coffee processing plant. 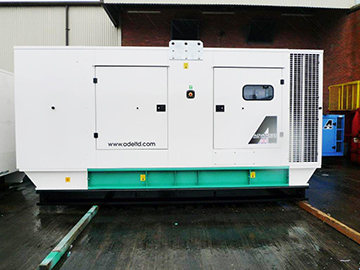 As part of an ongoing Telecoms country wide upgrade, this 400kVA open diesel generator has been modified by ADVANCED to suite the clients needs.